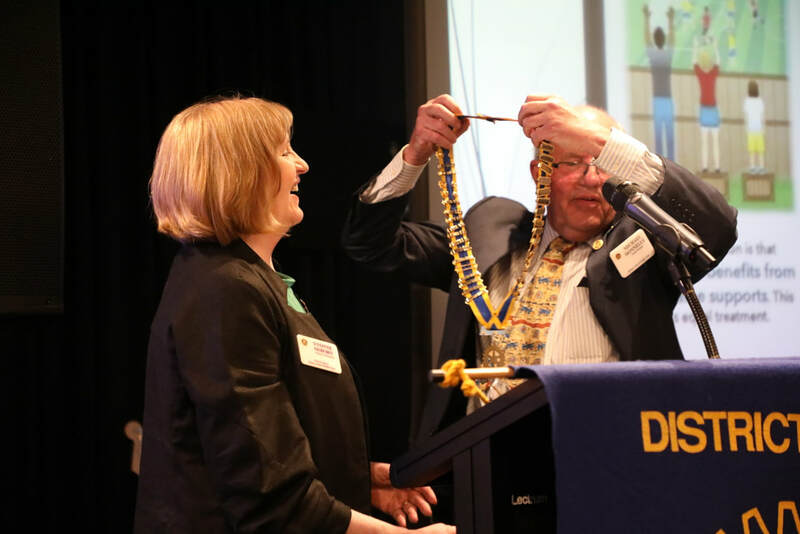 The Rotary International President for 2017-2018 is Ian HS Riseley of the Rotary Club of Sandringham, Victoria, Australia. Ian and his wife Juliet are multiple Paul Harris Fellows, Major Donors, and Bequest Society members. 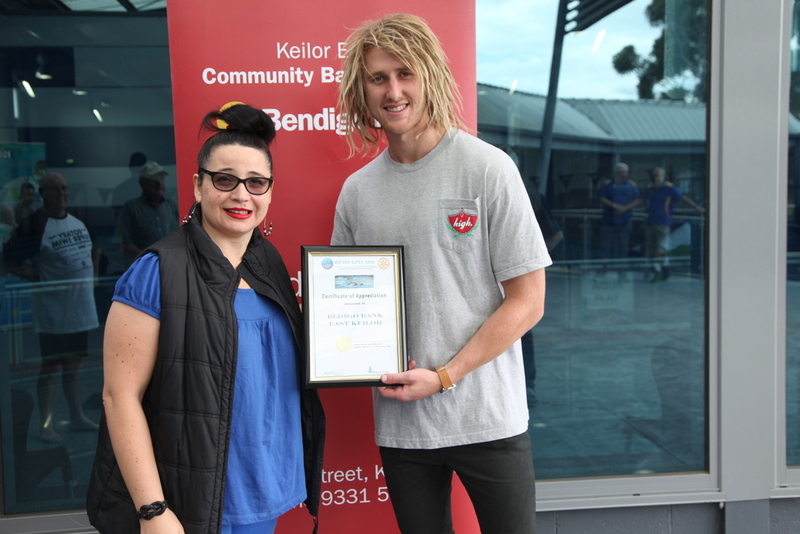 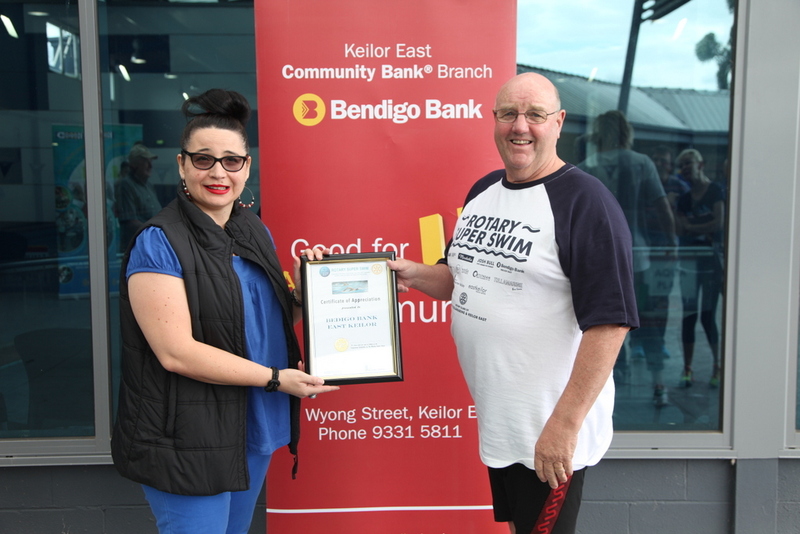 Keilor East Community Bank has been an outstanding sponsor of our Club projects over the past three years. We are very appreciative of their generosity and support and urge Members, family and friends to use the bank which supports its local community. 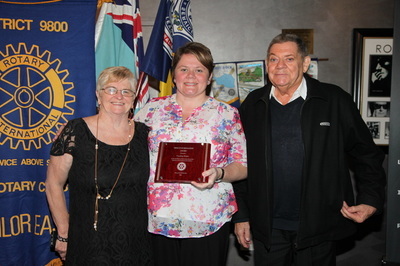 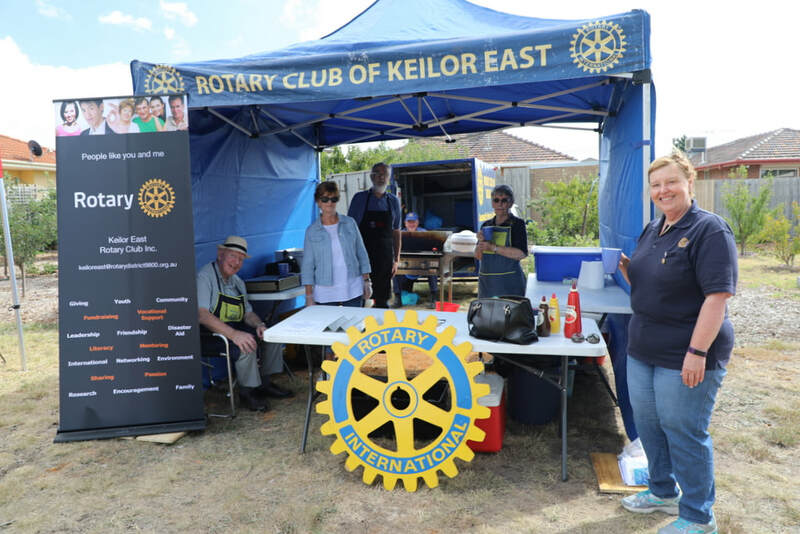 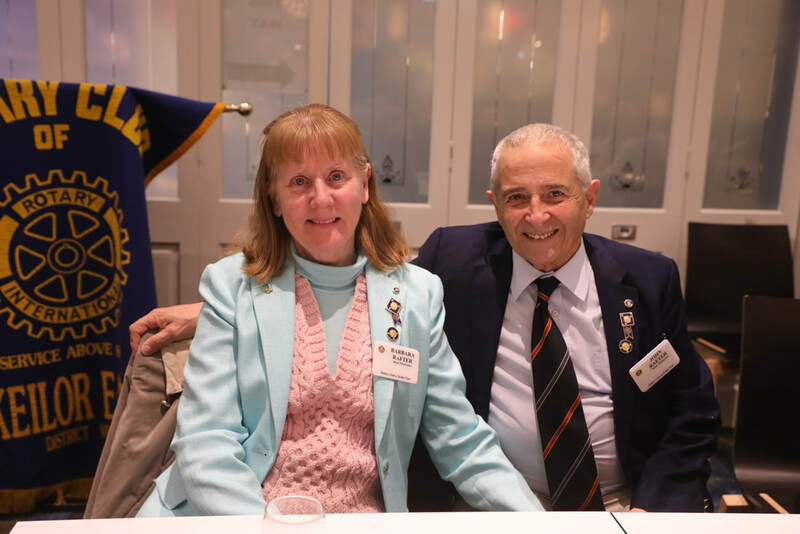 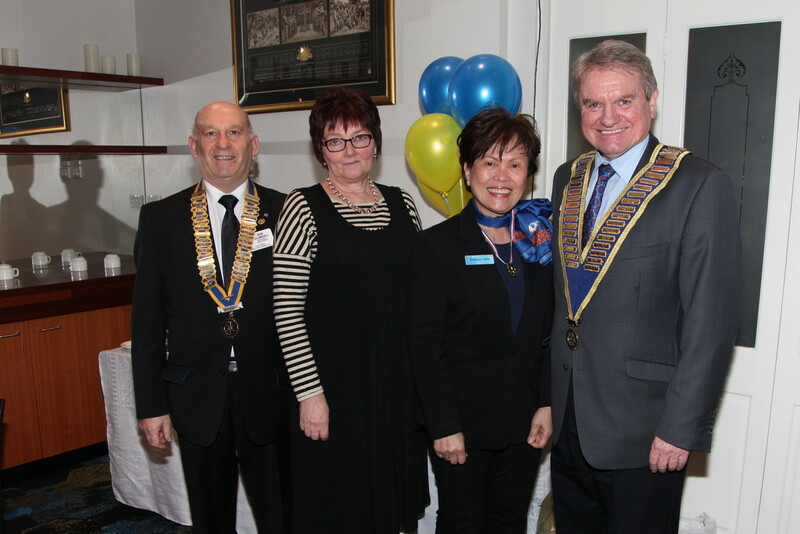 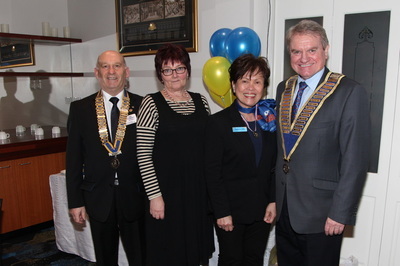 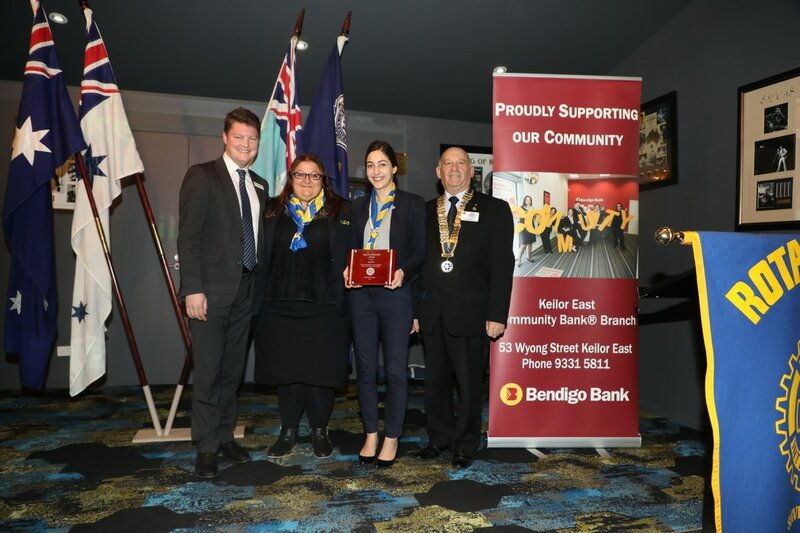 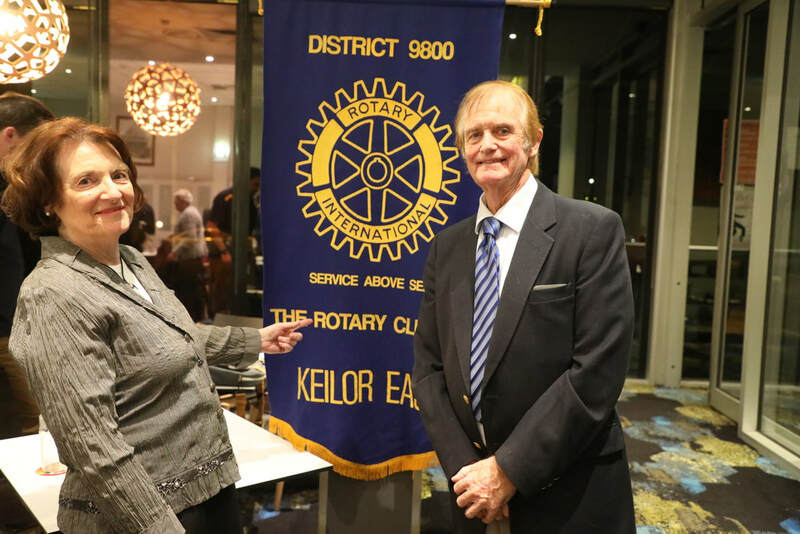 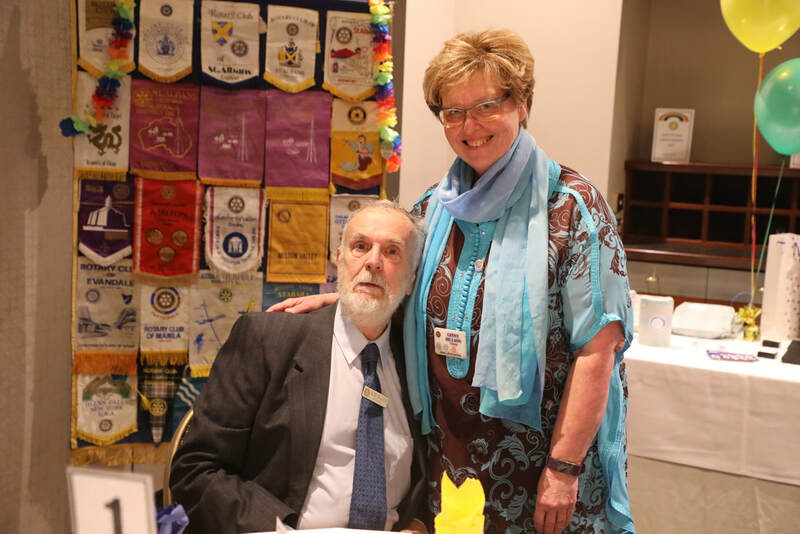 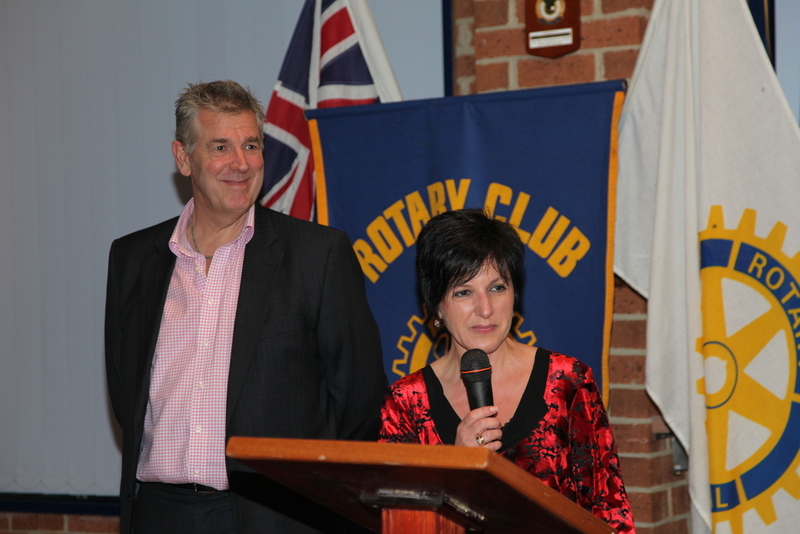 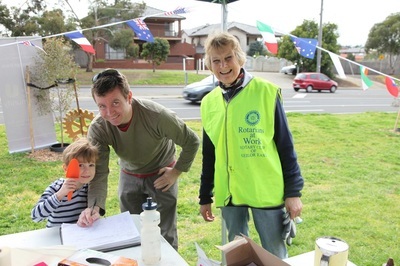 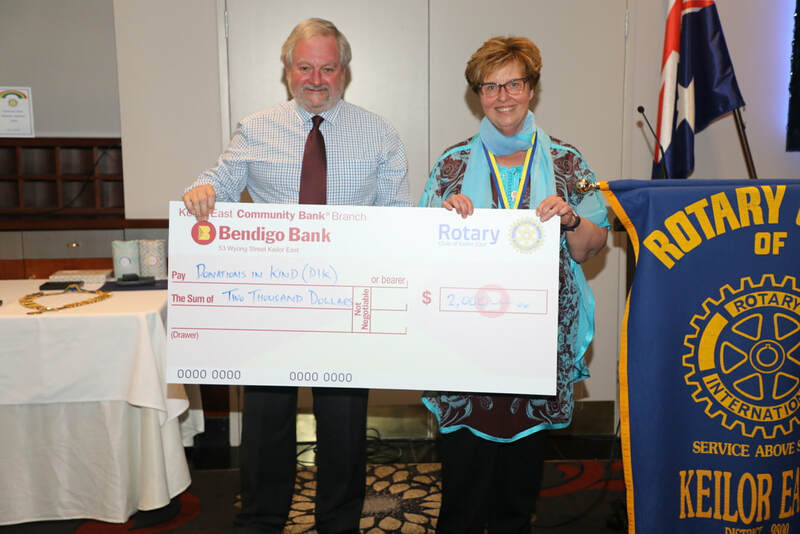 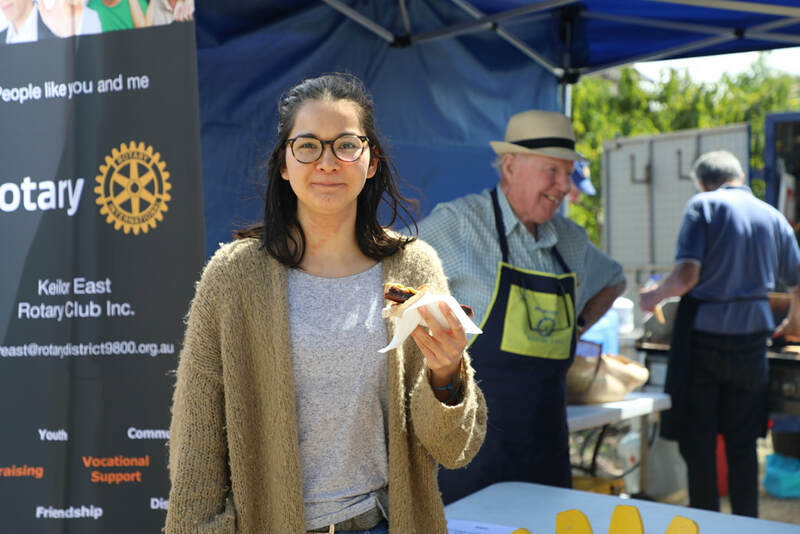 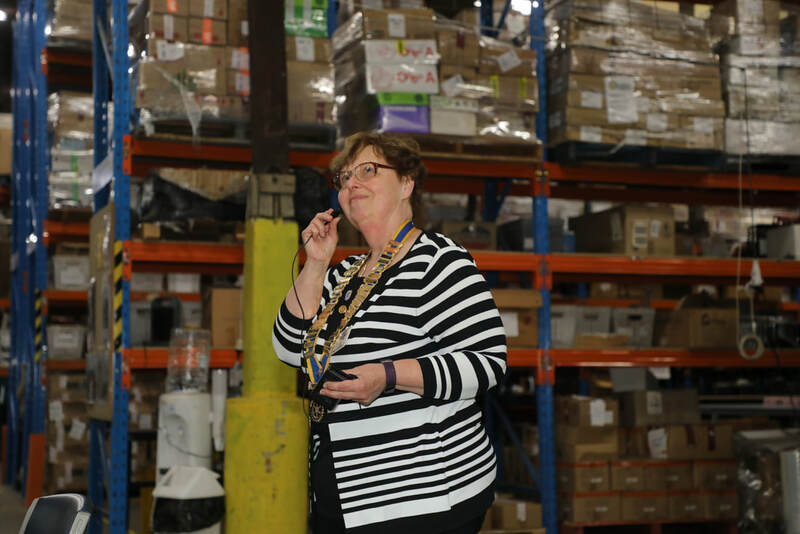 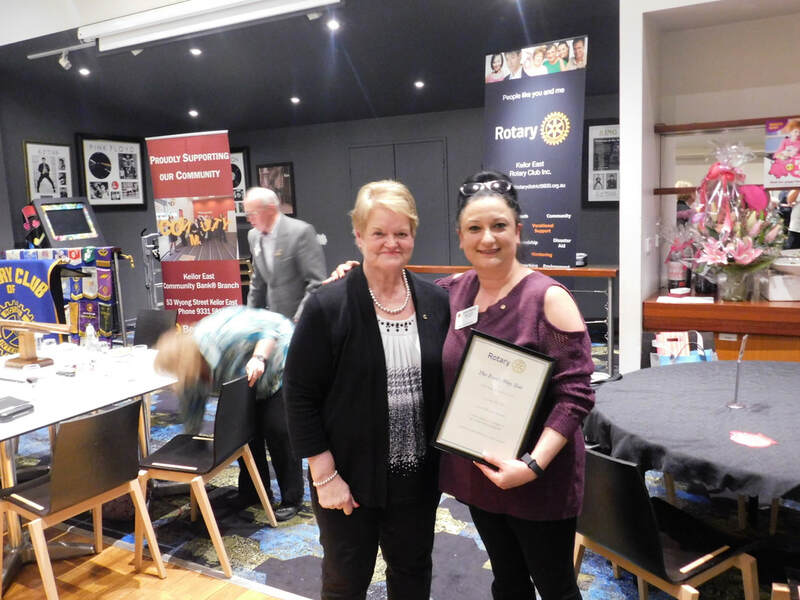 Tina Ballos who is a member of the Rotary Club of Keilor East, is the Branch Manager. 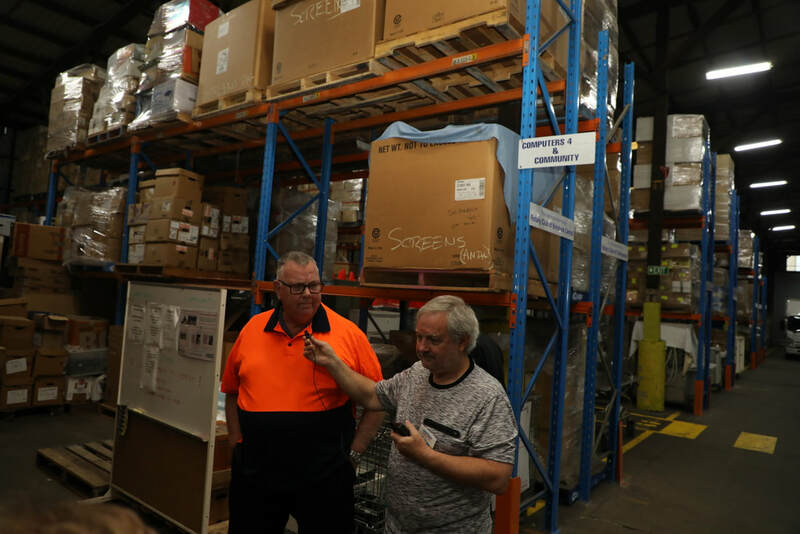 We are also very grateful to have the sponsorship of Smart Storage World in Keilor East for the storage of our Club trailer. 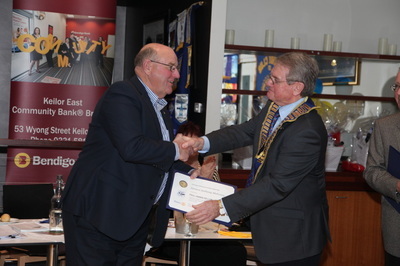 We appreciate their support for us and urge Club Members and friends to make use of their new local business. 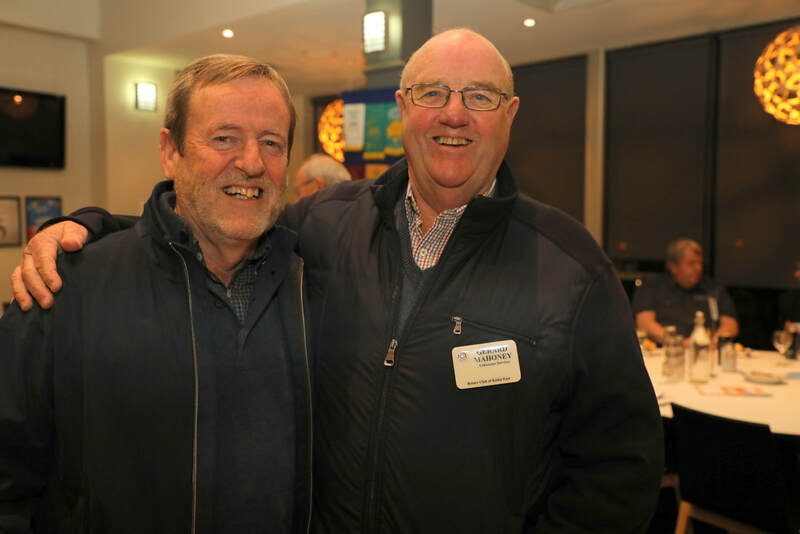 What has been happening at our Club lately? Monday 29th October, 2018 was a great Meeting for us with our Rotary District 9800 Governor, Bronwyn Stephens, and her husband Mark paying their official visit. 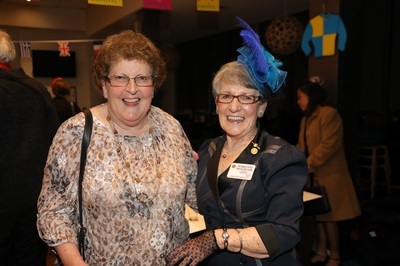 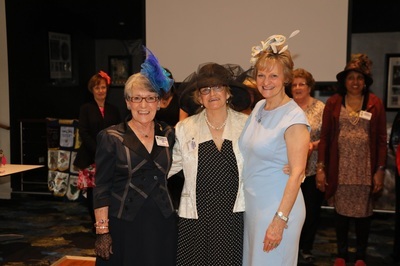 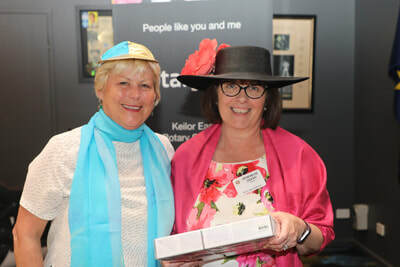 We dressed in racing attire and new Member Deb Akers was chosen as the winner of the Fashions on the Field. 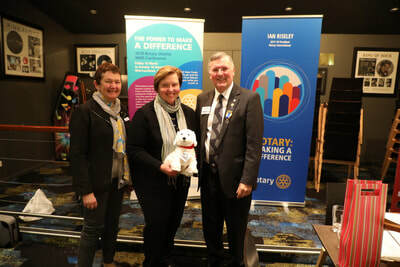 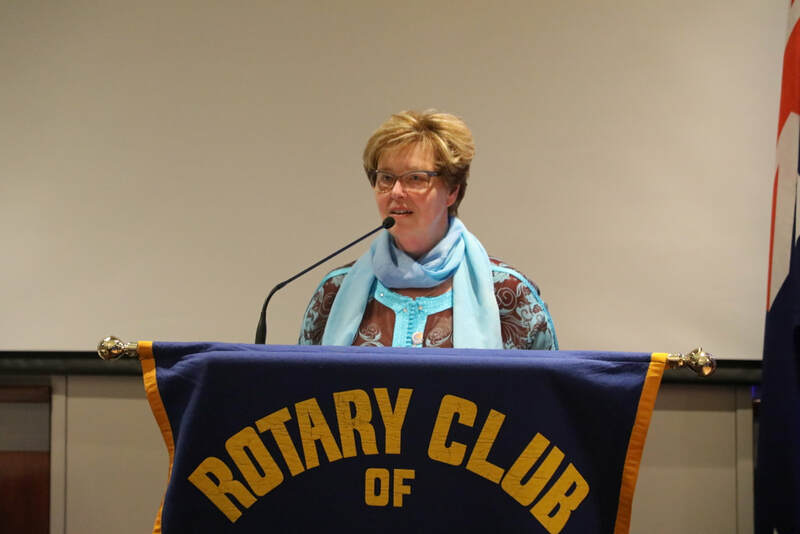 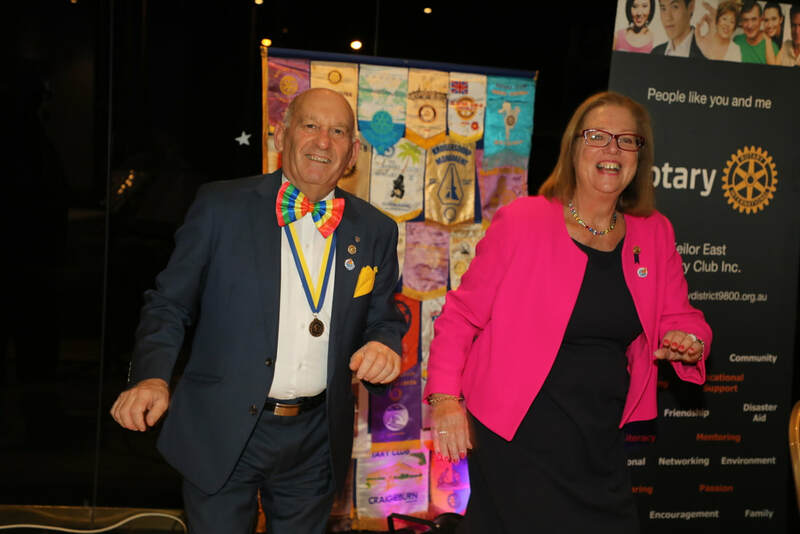 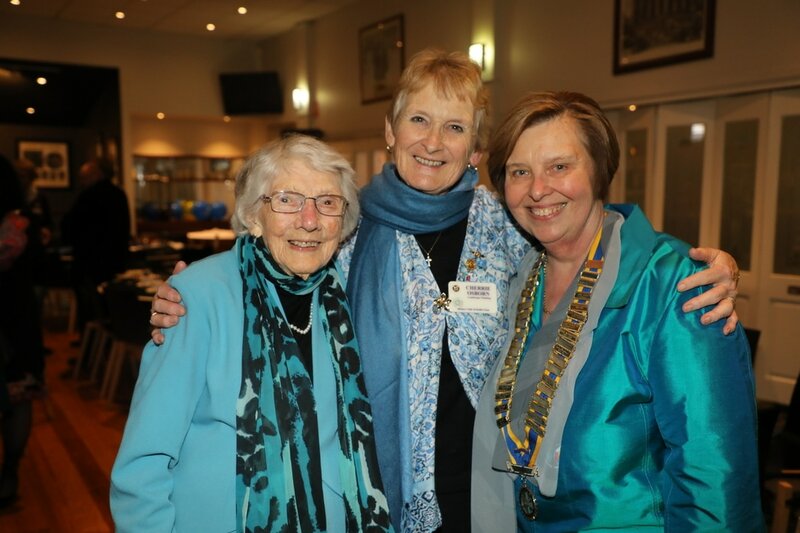 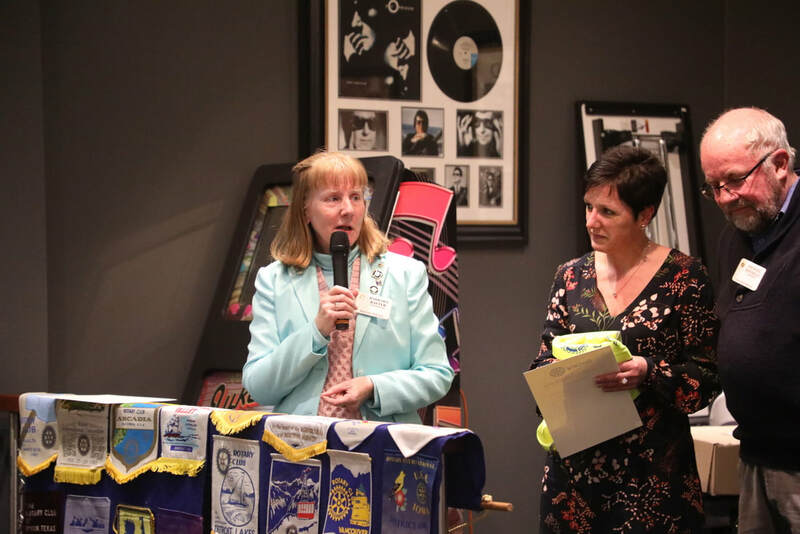 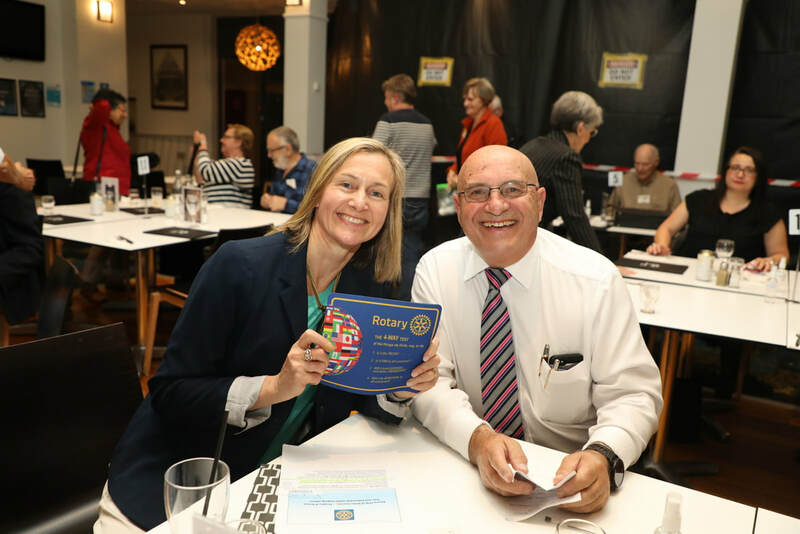 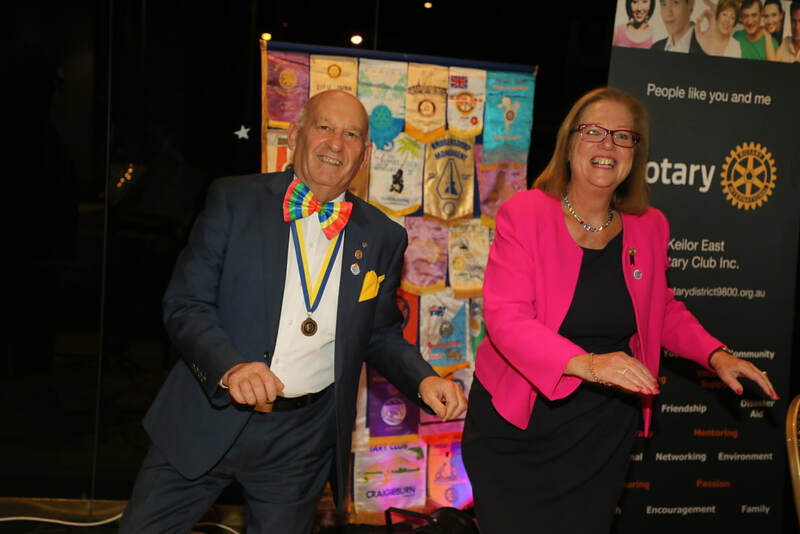 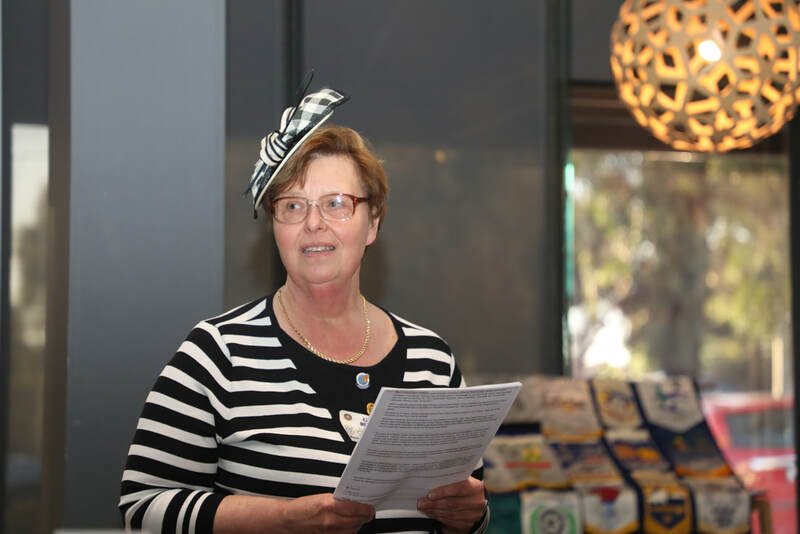 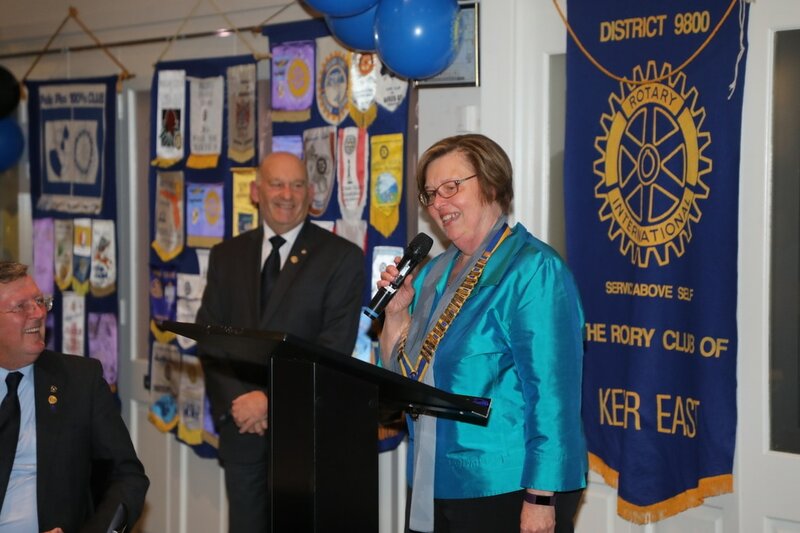 DG Bronwyn spoke about how we can "Be the Inspiration" (Rotary International's theme for this year) and make a difference in the lives of others, locally and overseas. 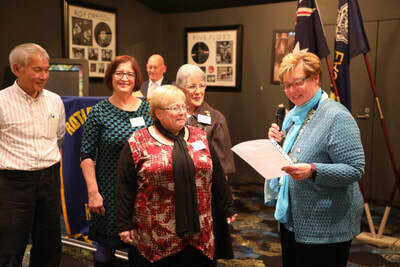 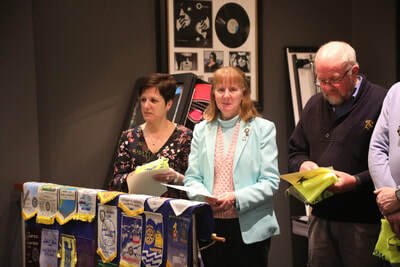 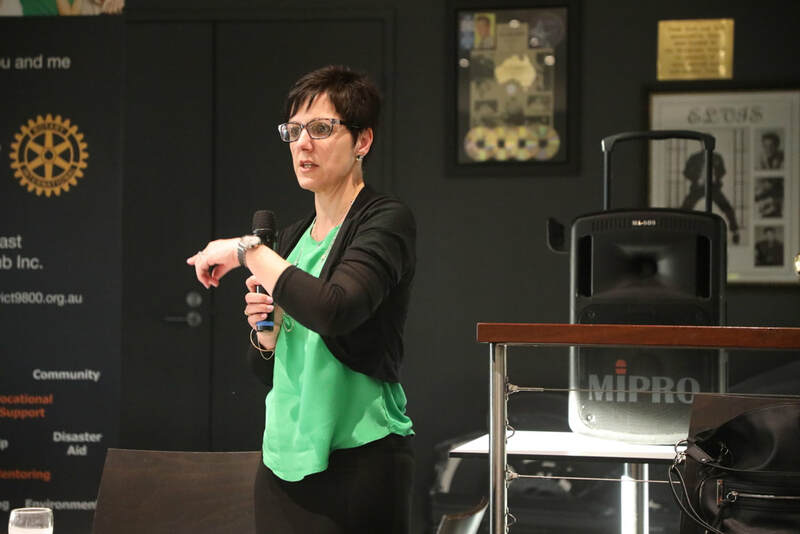 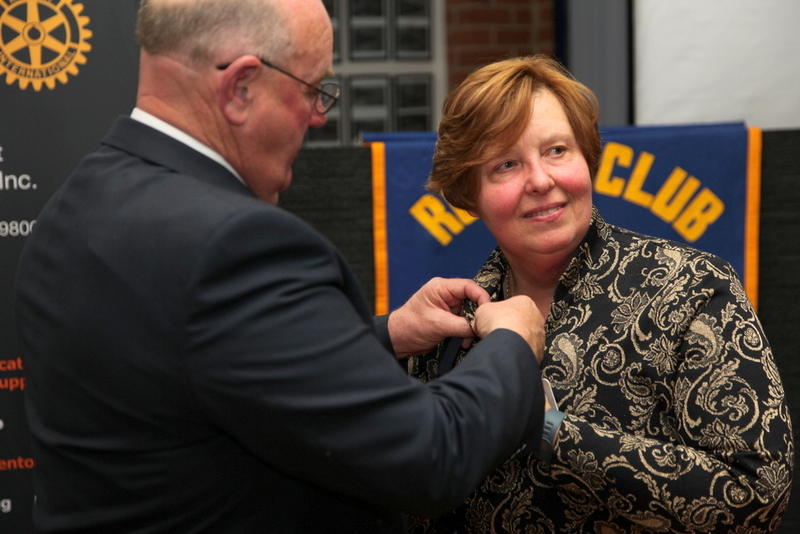 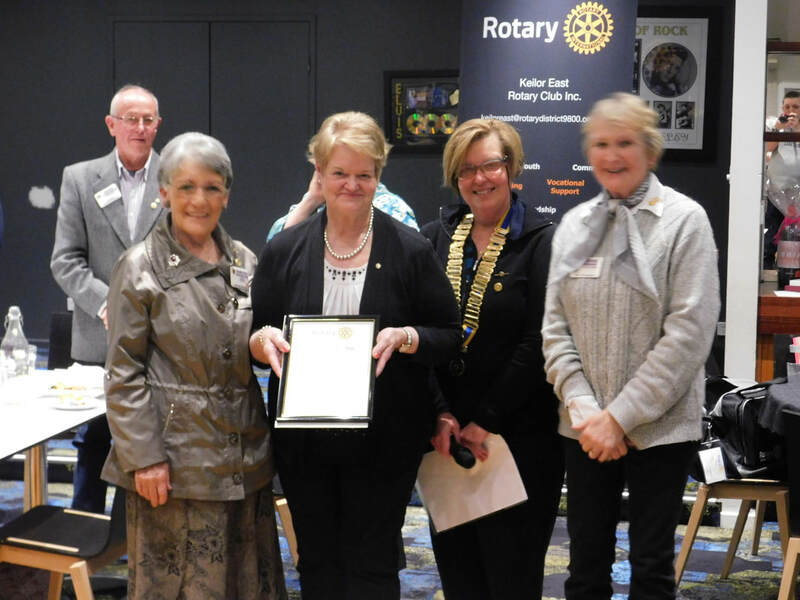 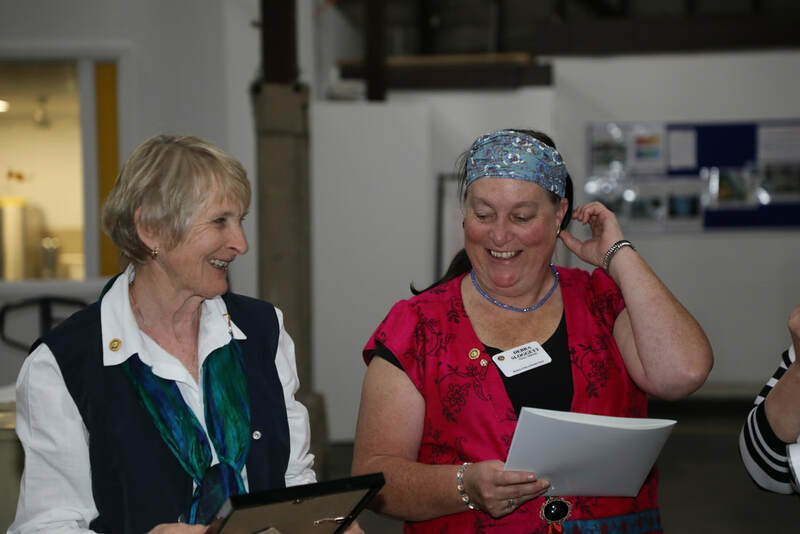 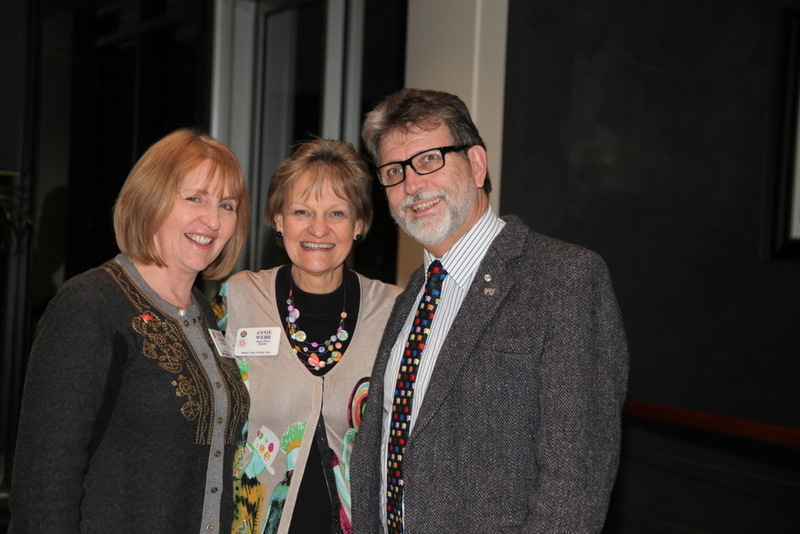 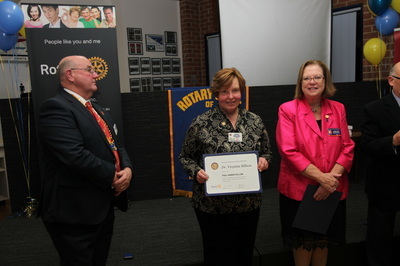 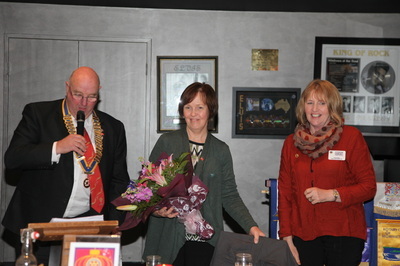 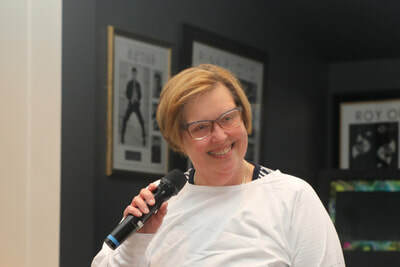 Our President, Ginny Billson, inducted two talented new Members. Helen Penna, a Primary Teacher who is a co-founder of Care4Cambodians, is already an inspiration to us. Michael Gallus is a former teacher who started the Footys 4 All charity. 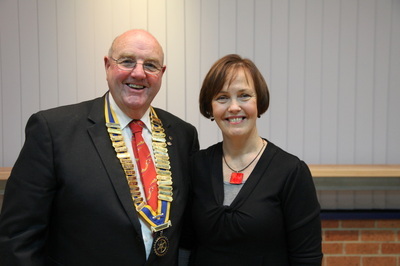 We warmly welcome Helen and Michael and wish them a wonderful Rotary journey. 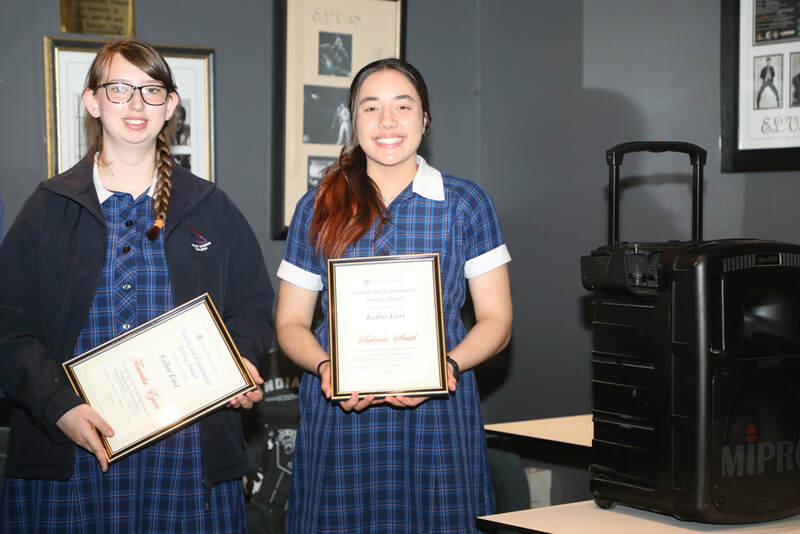 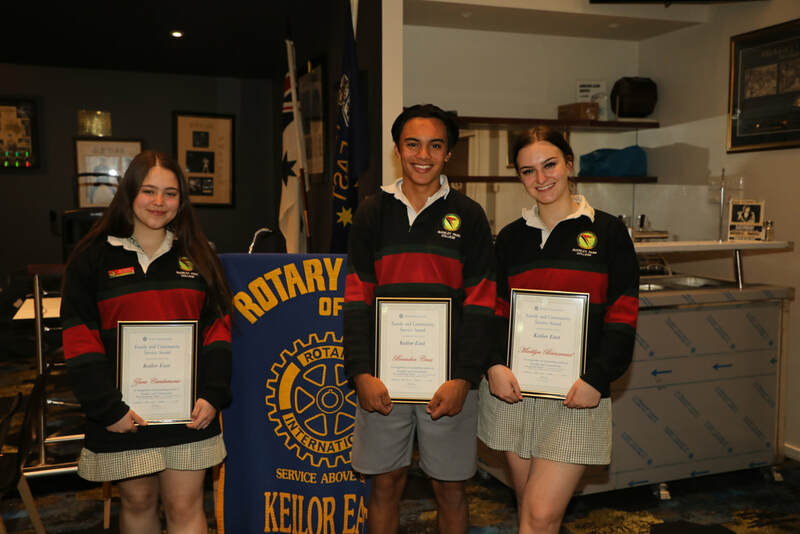 On Monday 22nd October we presented Recognition Awards to students from Keilor Downs Secondary College and Buckley Park Secondary College. 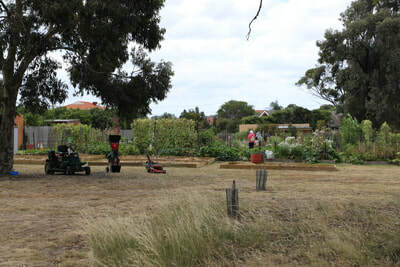 The Buckley Park VCAL students worked on a Community Project to aid Anglicare as part of their Personal Development subject. 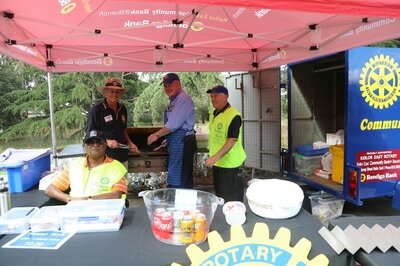 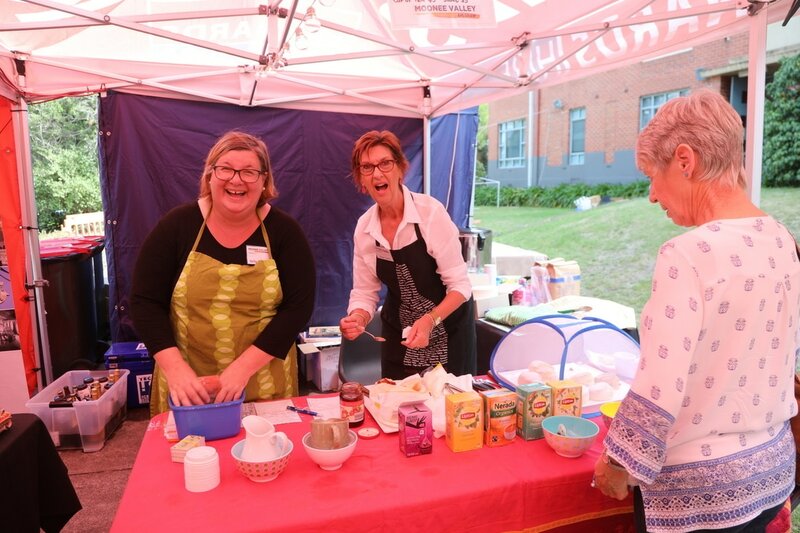 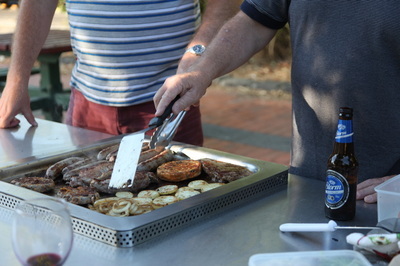 We are grateful that they helped us cook our busiest ever Bunnings BBQ. 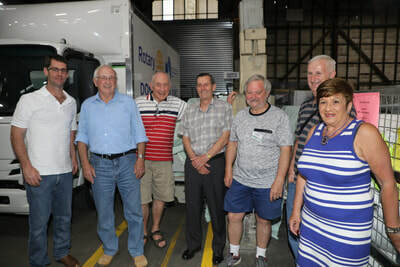 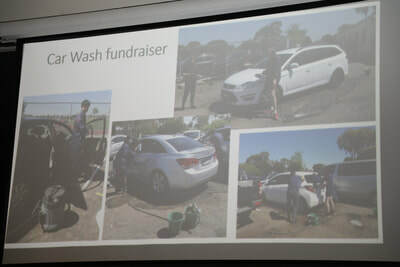 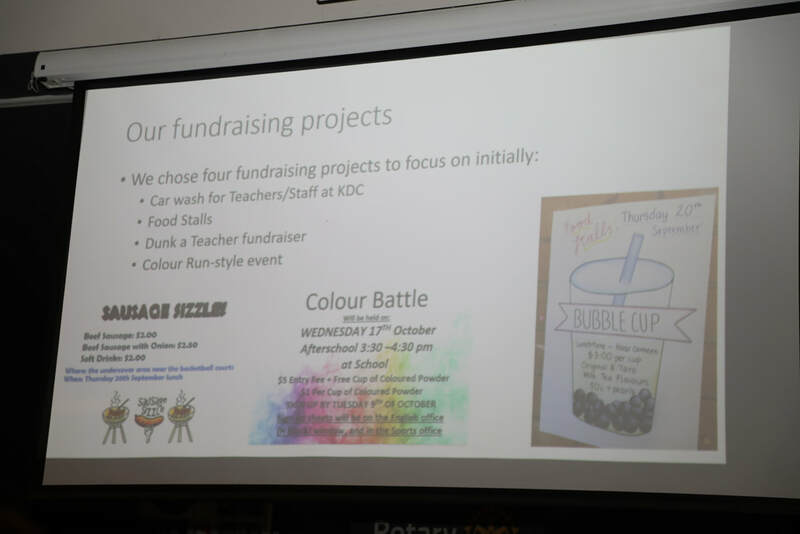 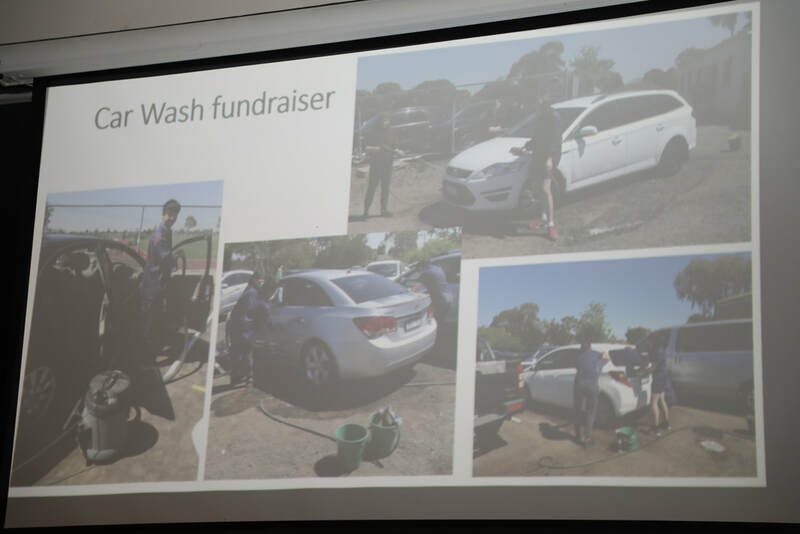 The Year 9 KDSC students are part of a Global Leadership program and have turned former Brimbank Rotary Club's $500 float into a much larger amount for Anglicare. 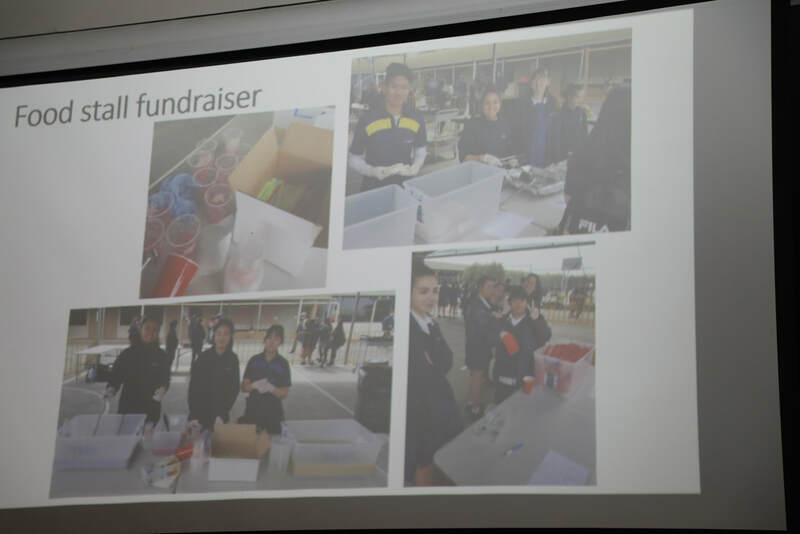 Through planning and running fundraising at their school, students developed new skills and friendships.Our congratulations go to all the wonderful community minded students and their proud families. 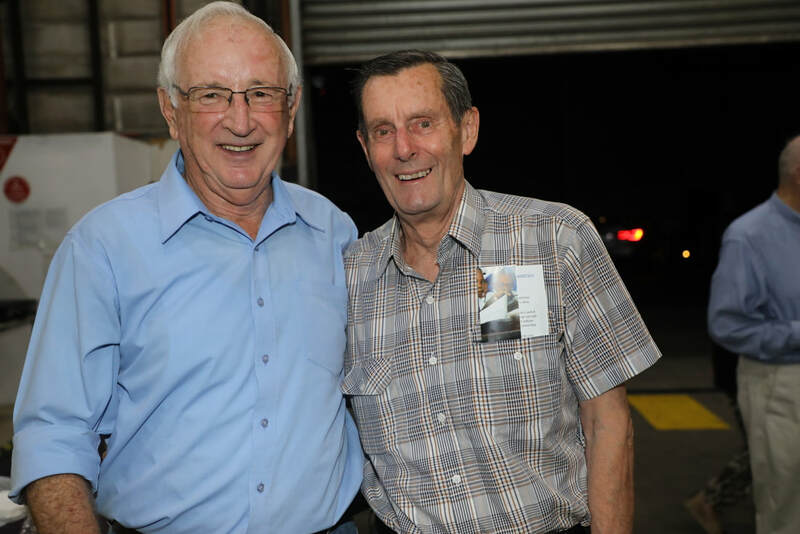 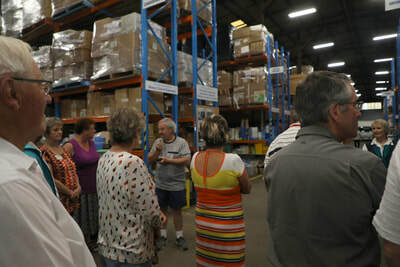 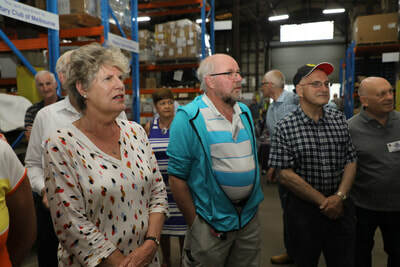 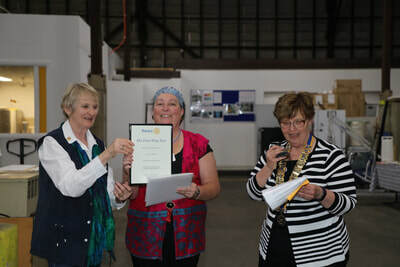 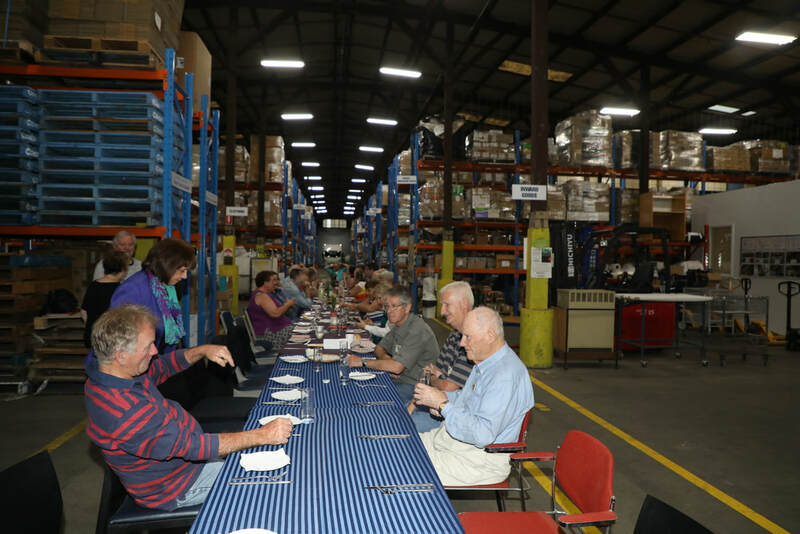 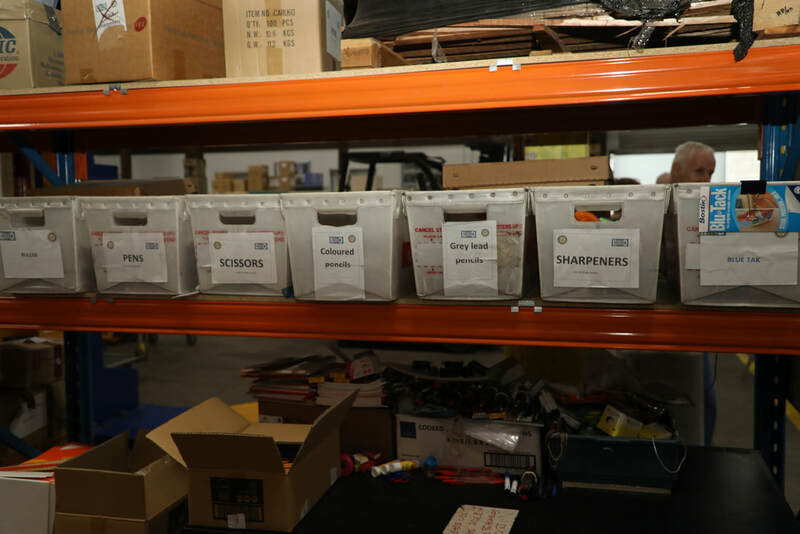 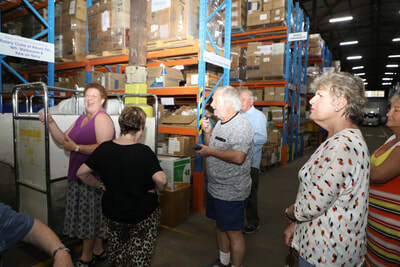 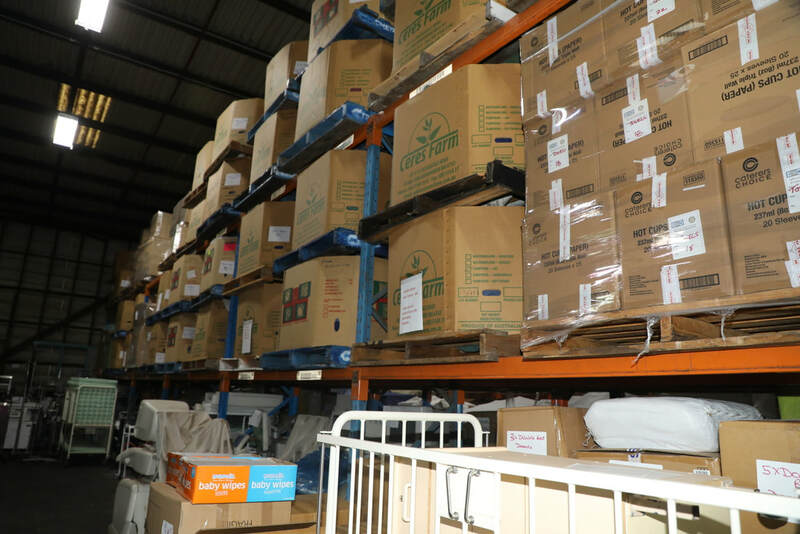 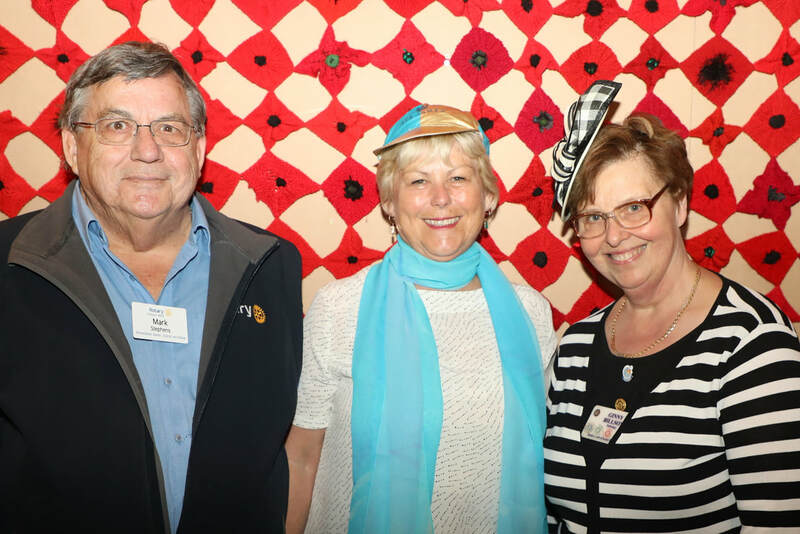 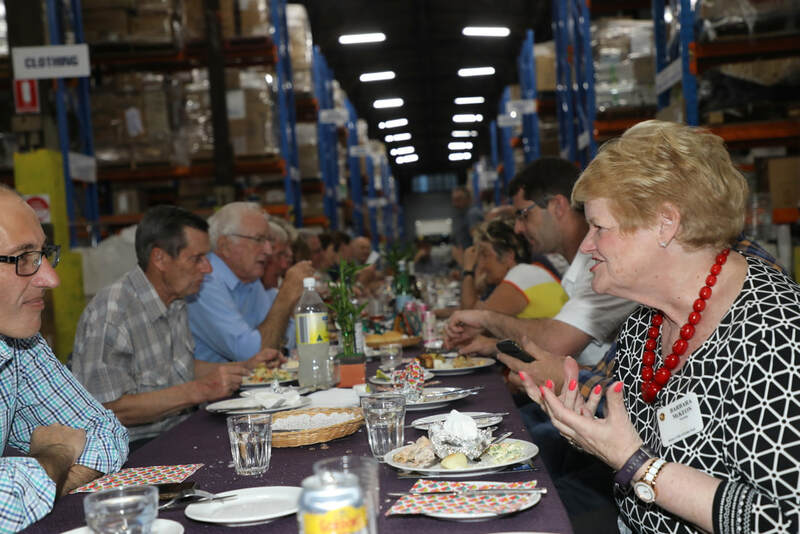 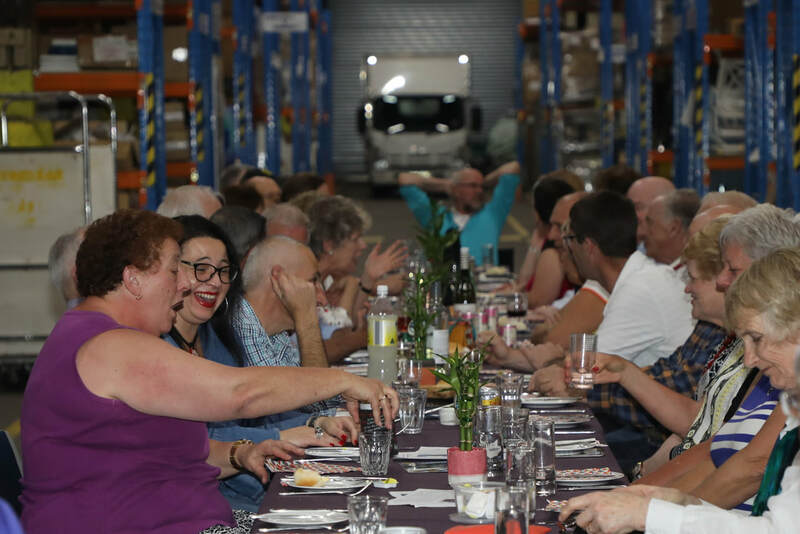 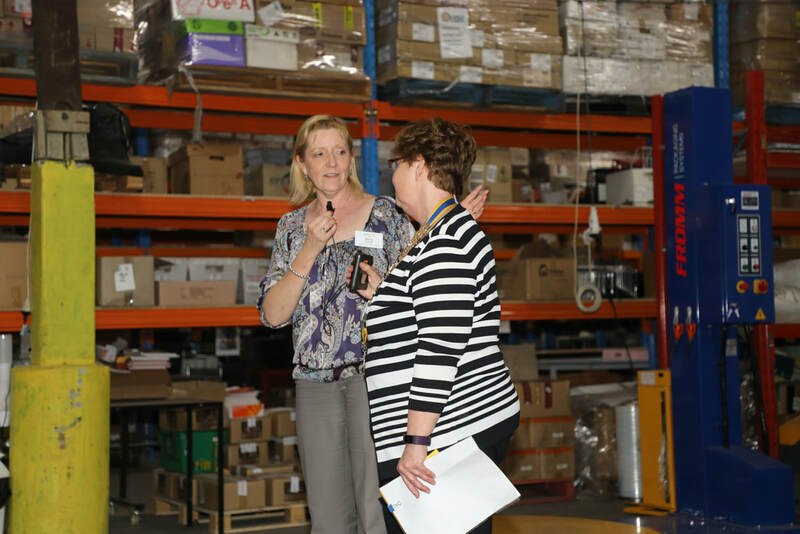 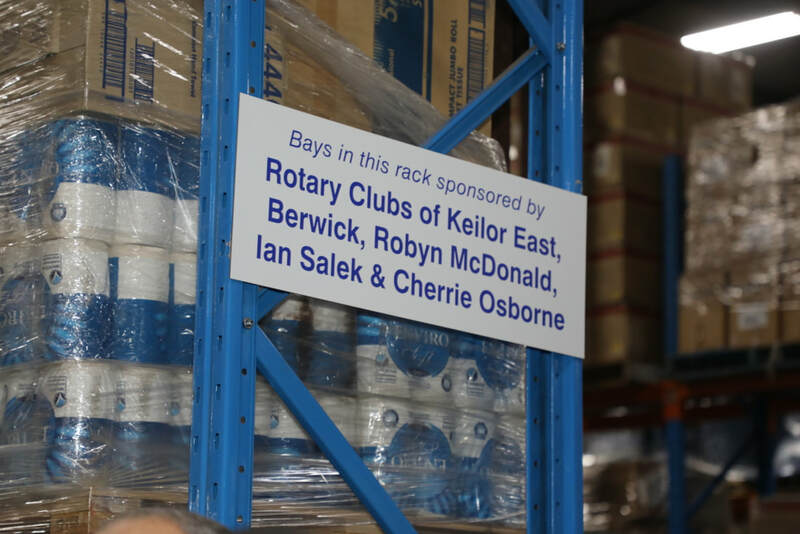 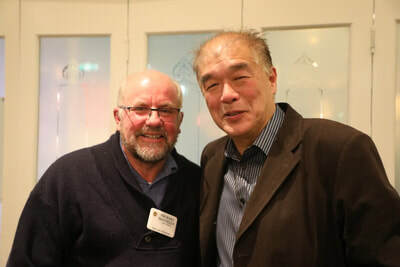 ​Keilor East Rotary and Keilor Rotary held a Joint Dinner Meeting at the wonderful DIK Donations in Kind Warehouse on Monday 15th October. 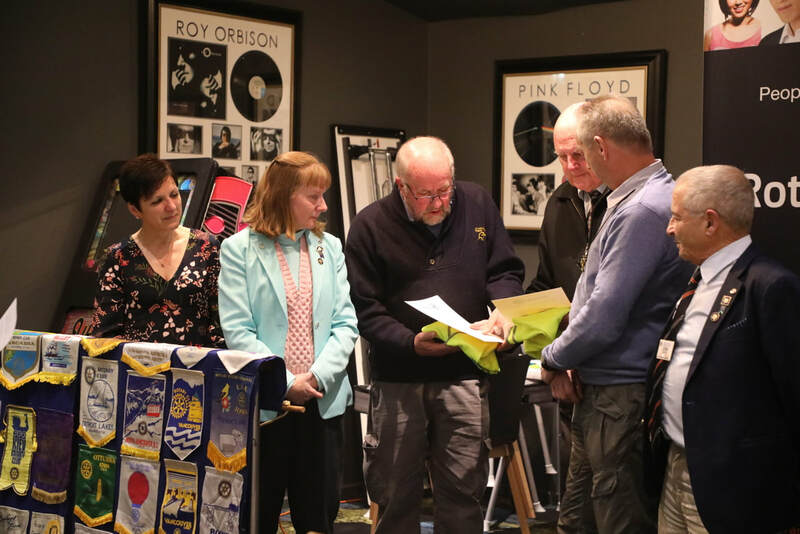 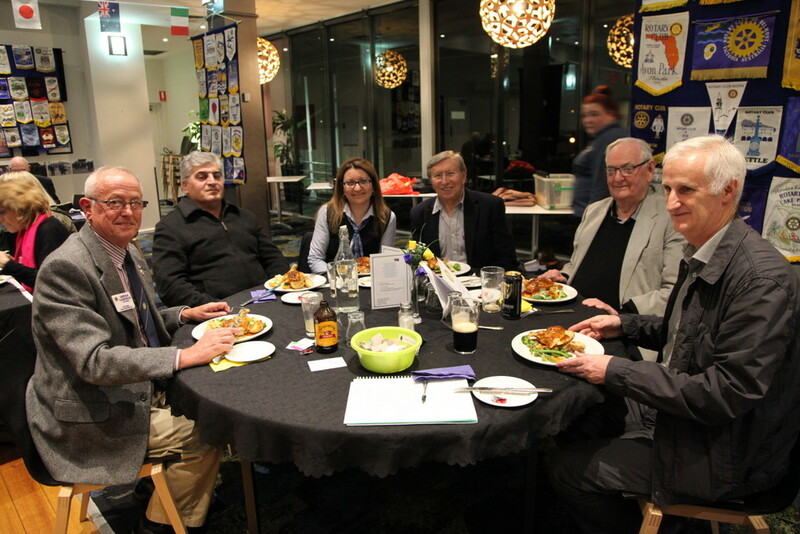 It was a great opportunity for neighbouring Clubs to socialize and appreciate the myriad of resources available for Rotary and Community projects. DIK supports overseas and local communities in need and its resources are plentiful. 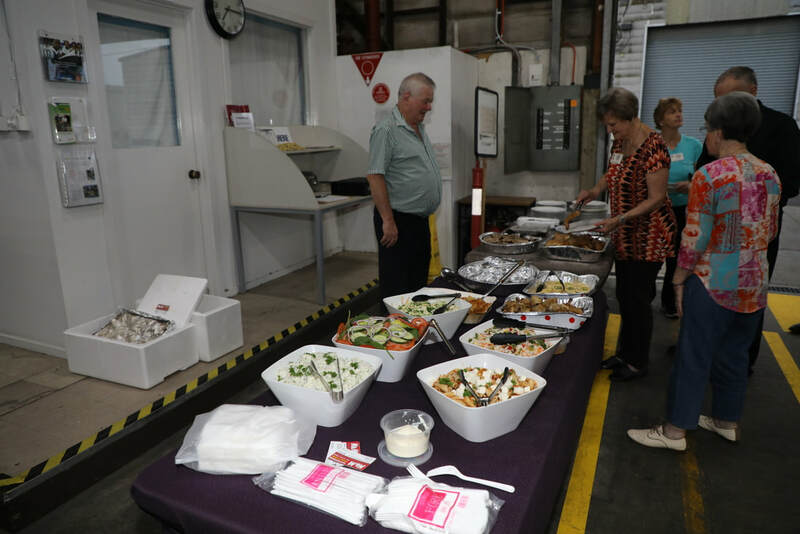 Our delicious dinner was provided by N&M Catering of Sunbury. 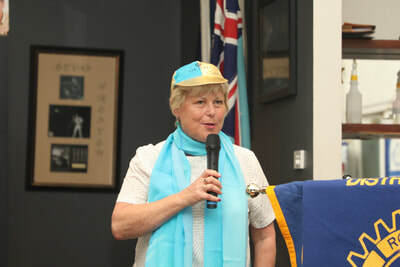 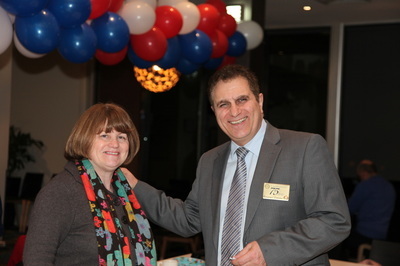 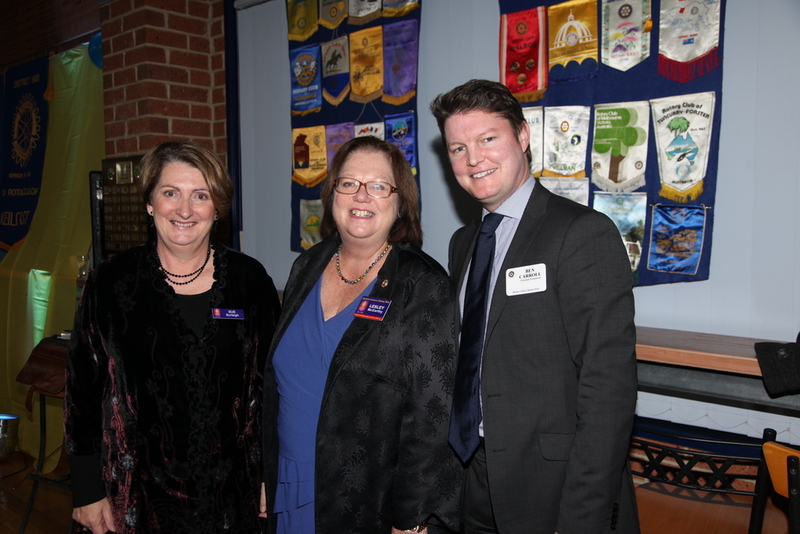 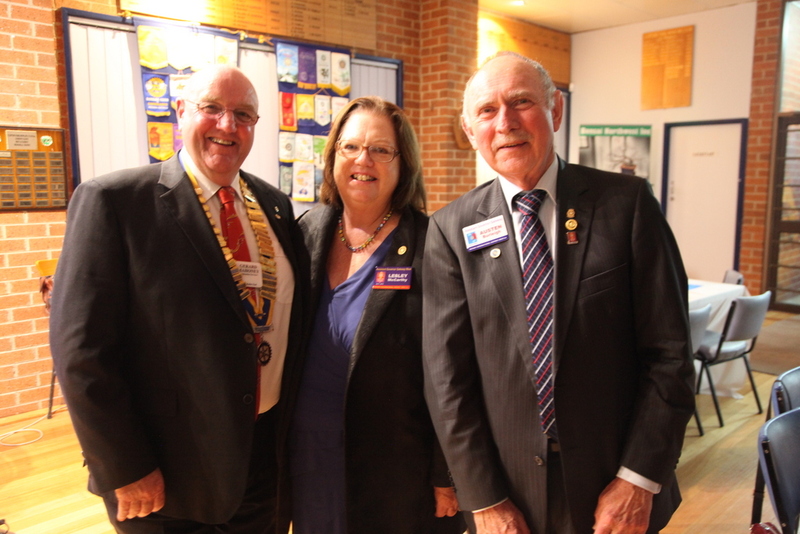 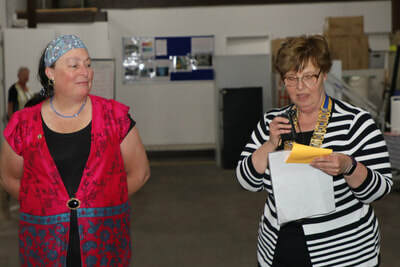 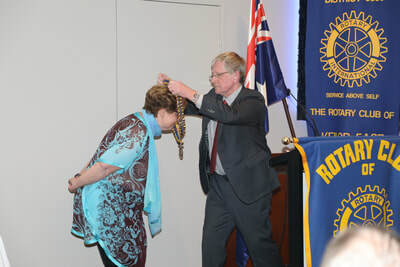 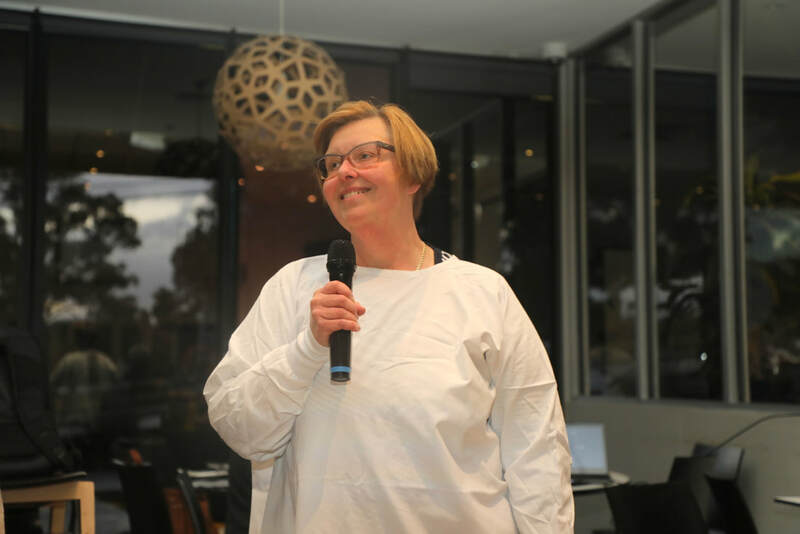 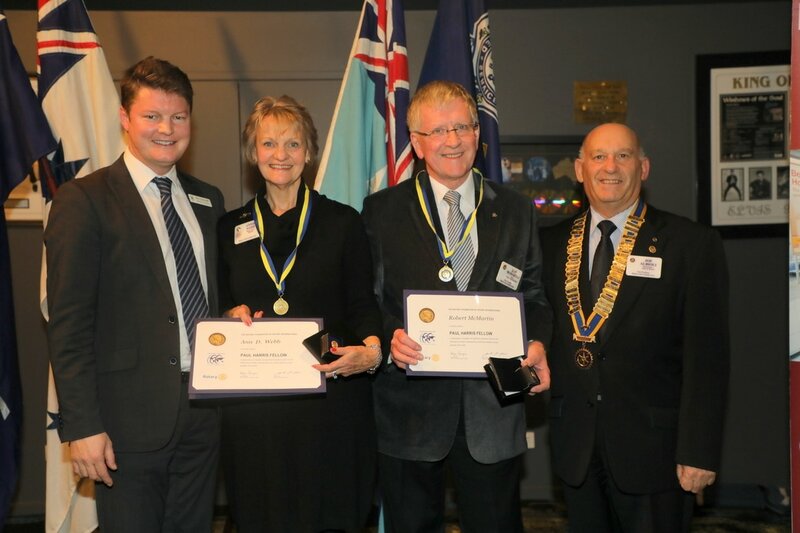 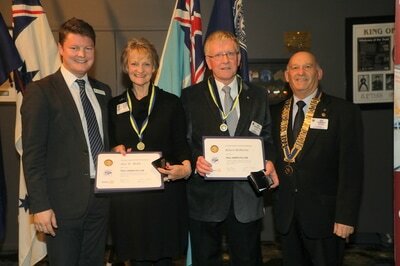 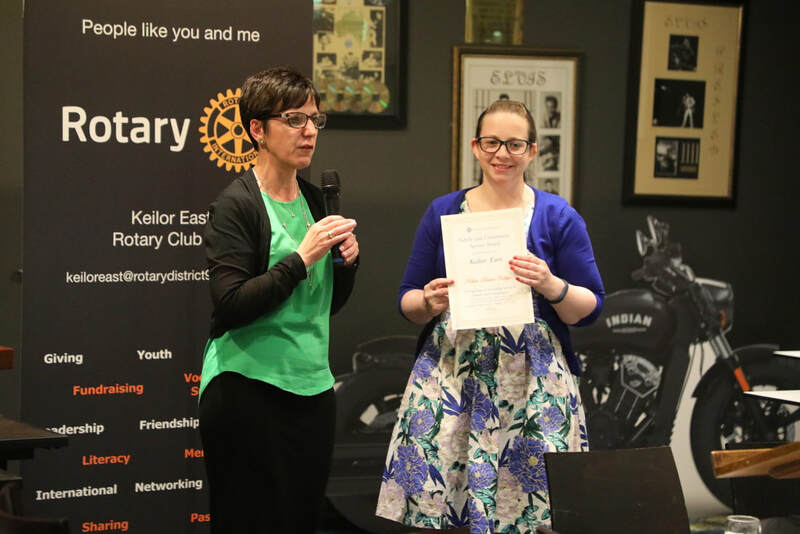 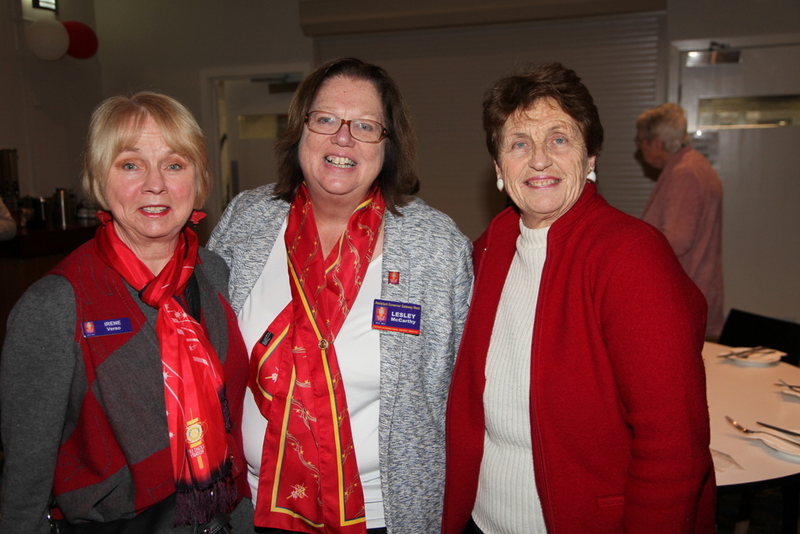 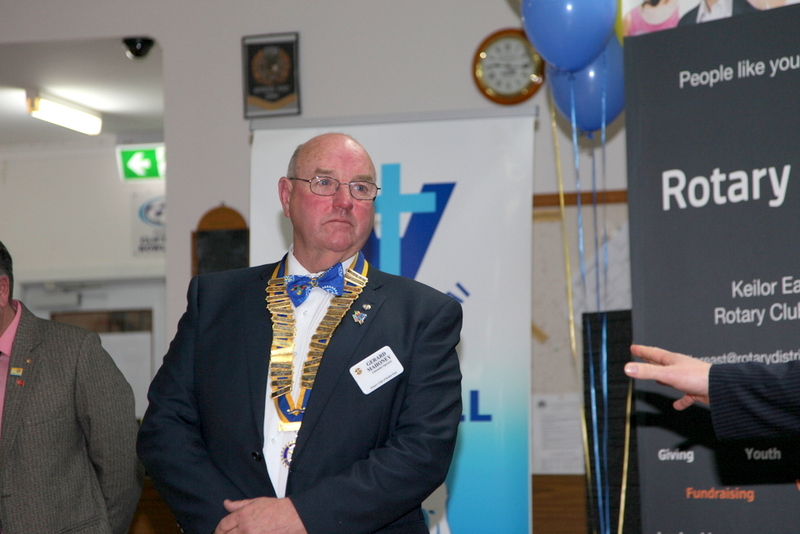 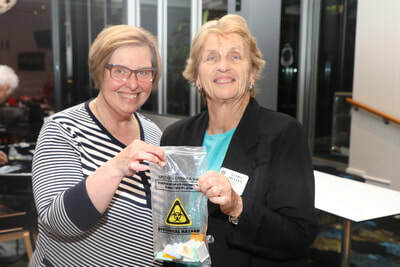 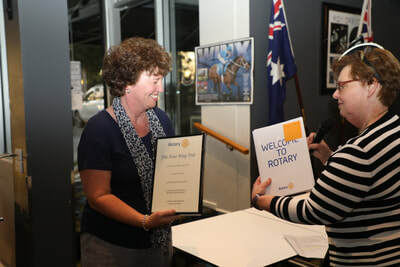 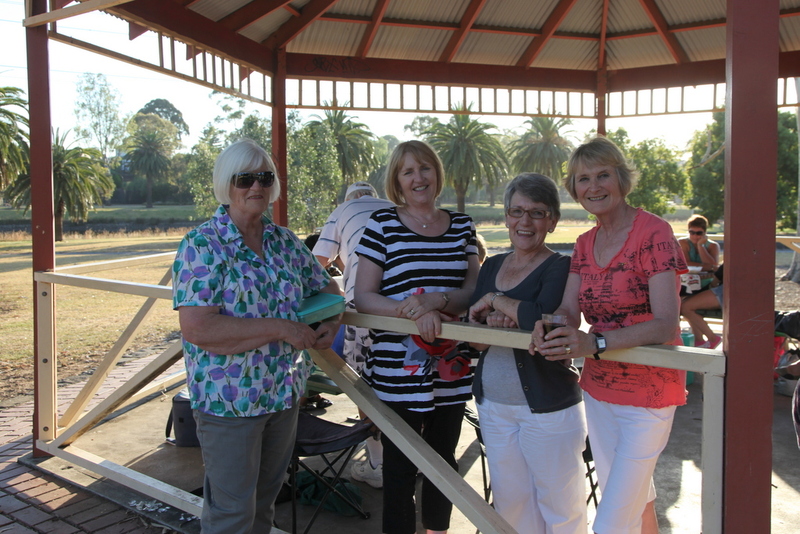 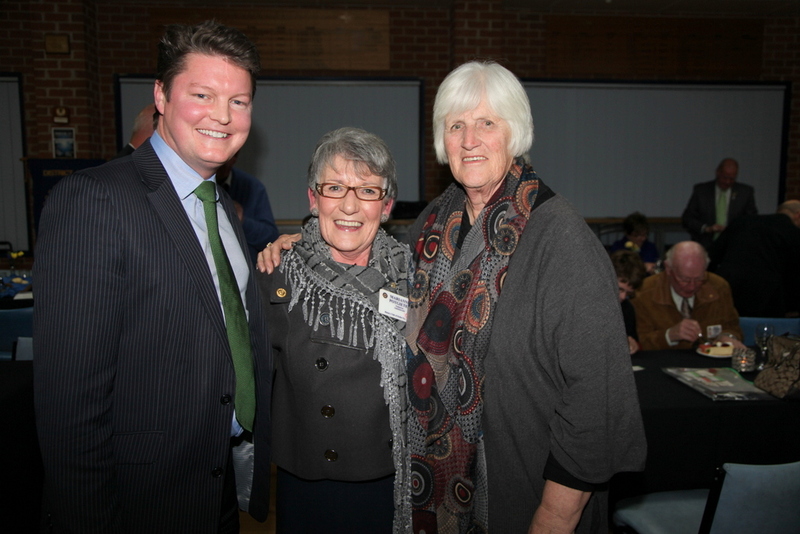 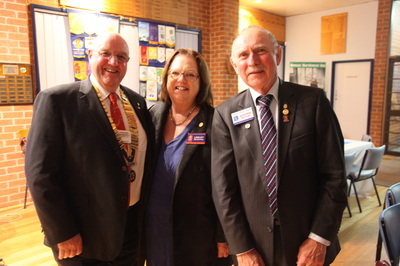 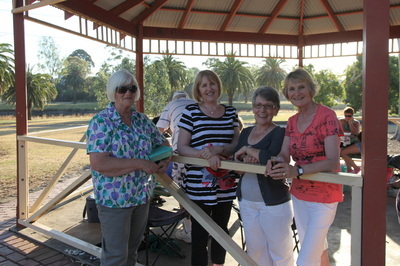 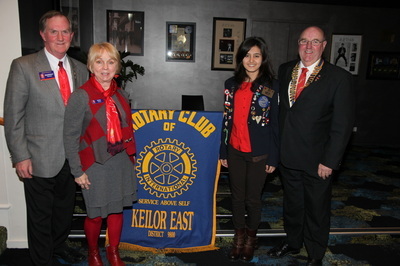 During the evening Keilor East President, Ginny Billson, inducted two new Members. 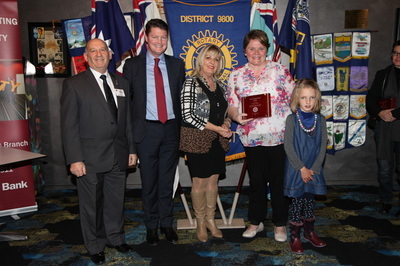 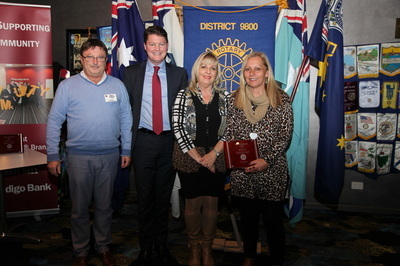 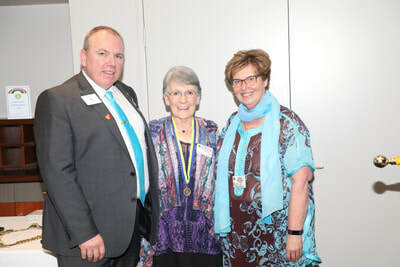 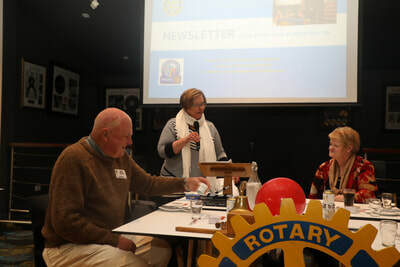 Welcome toour great Rotary family at Keilor East and to District 9800 Debra Sloggett (Midwifery) and Deborah Akers ( Solicitor). 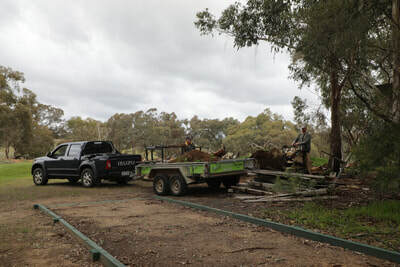 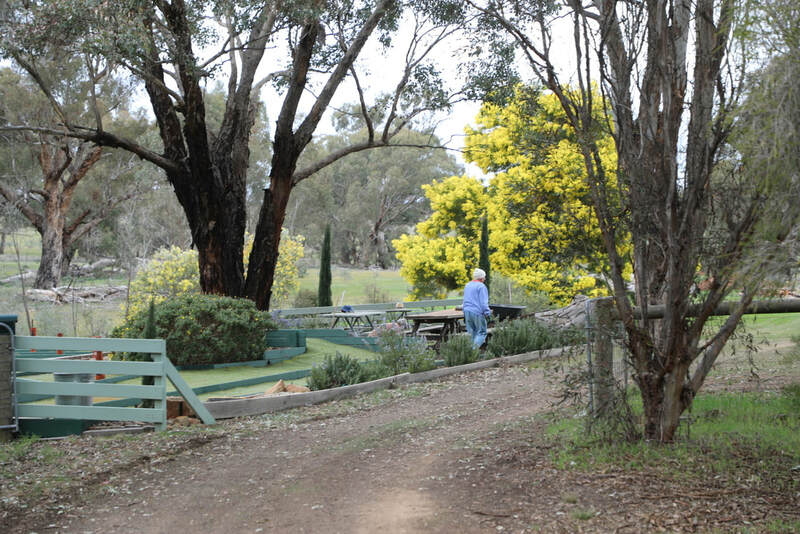 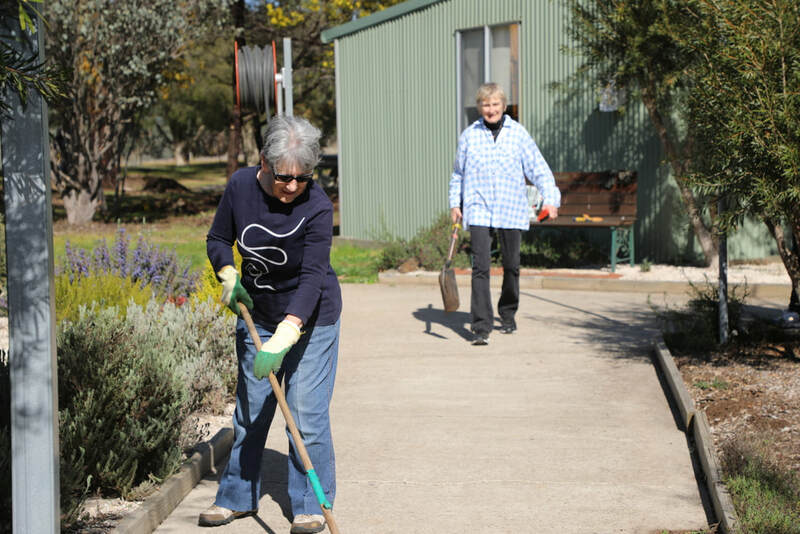 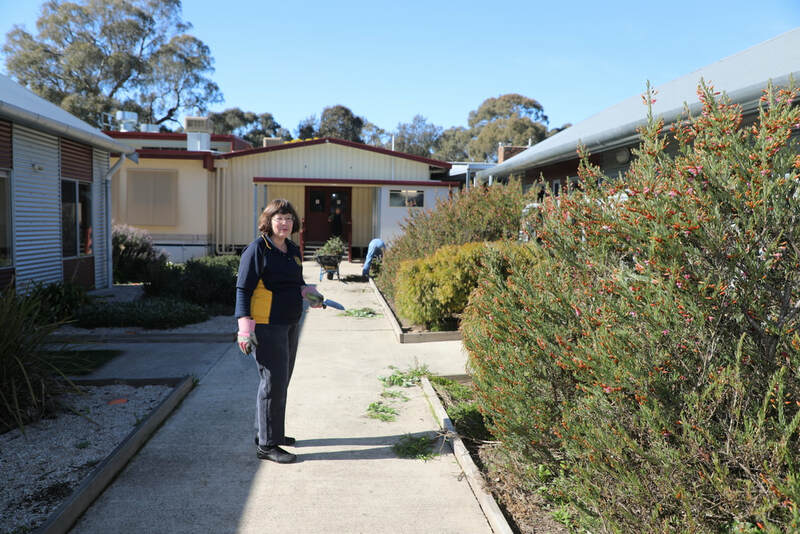 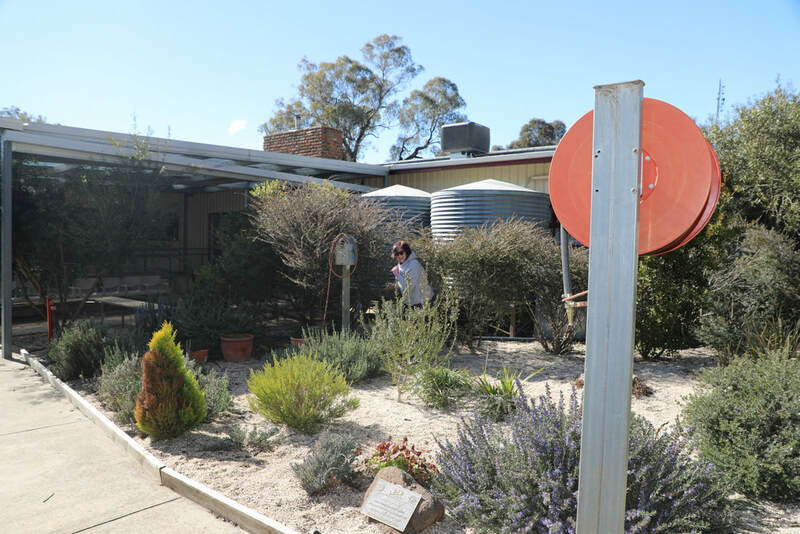 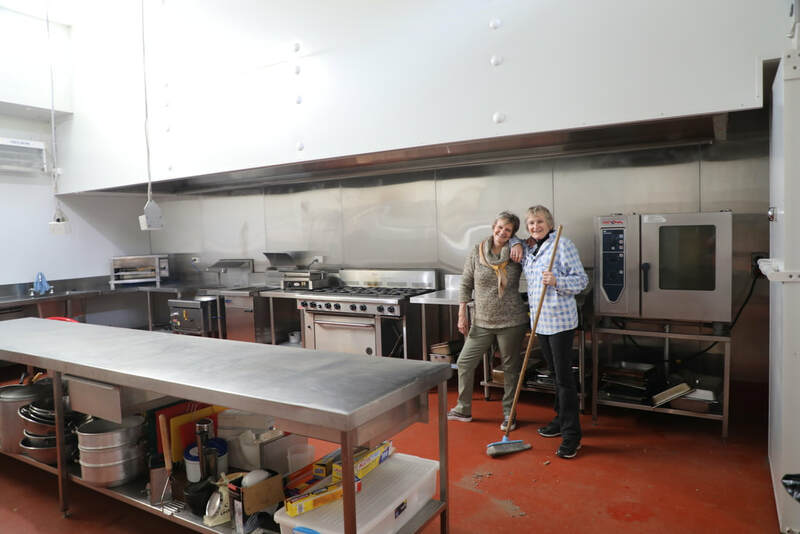 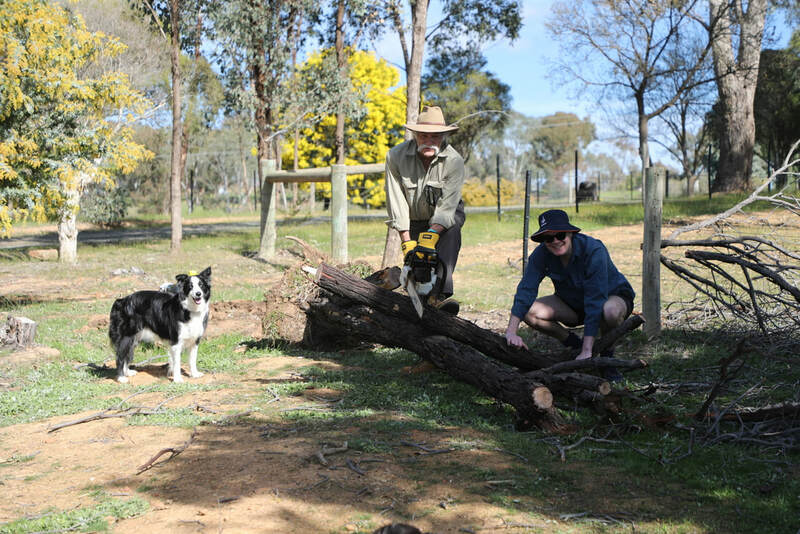 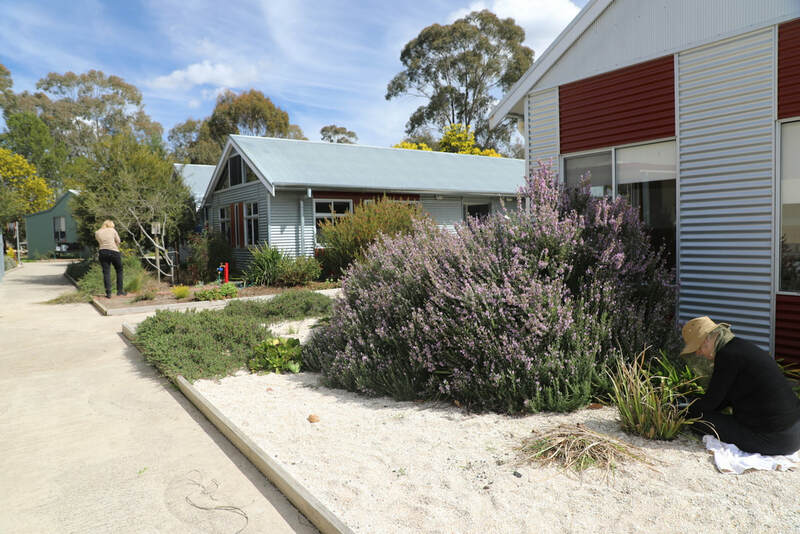 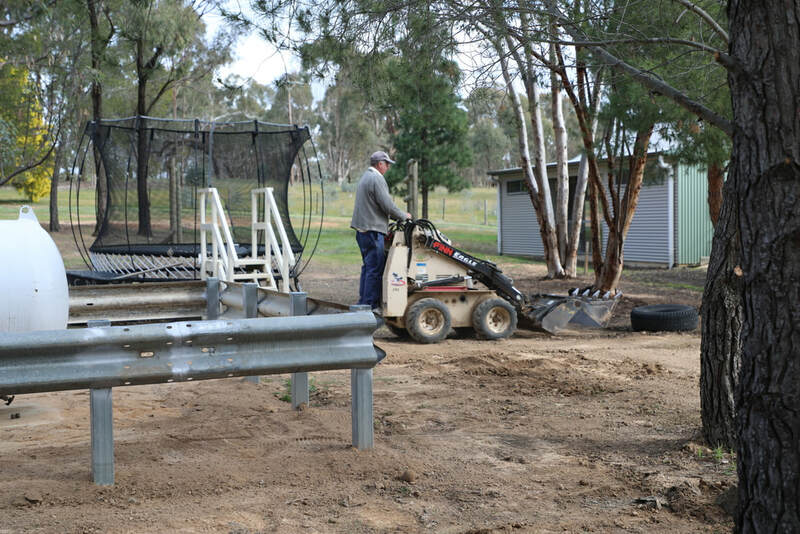 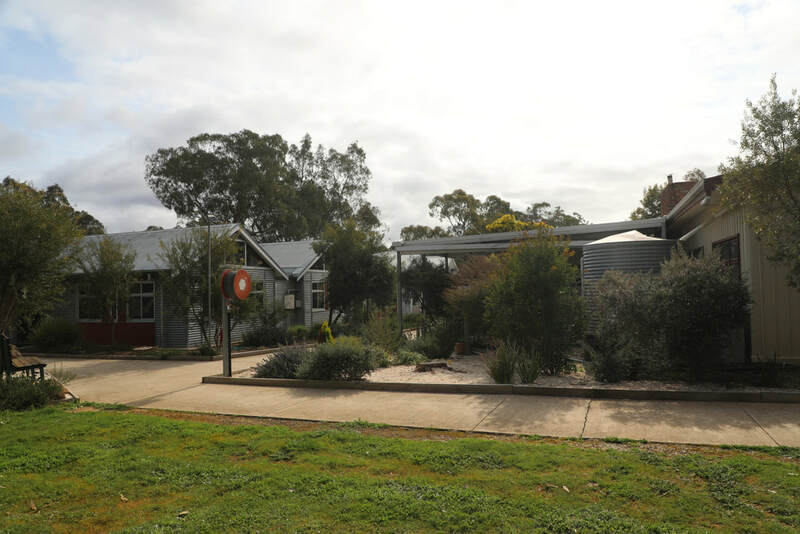 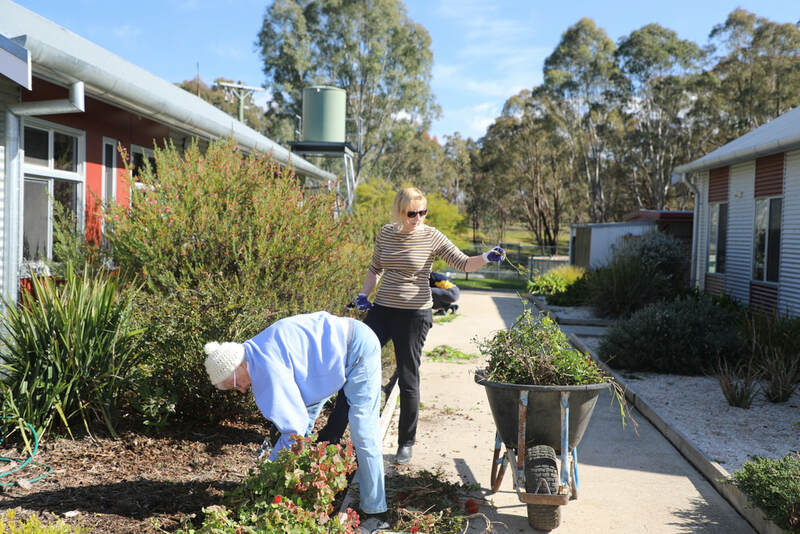 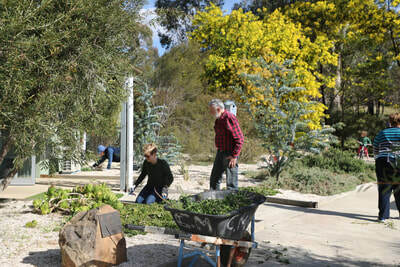 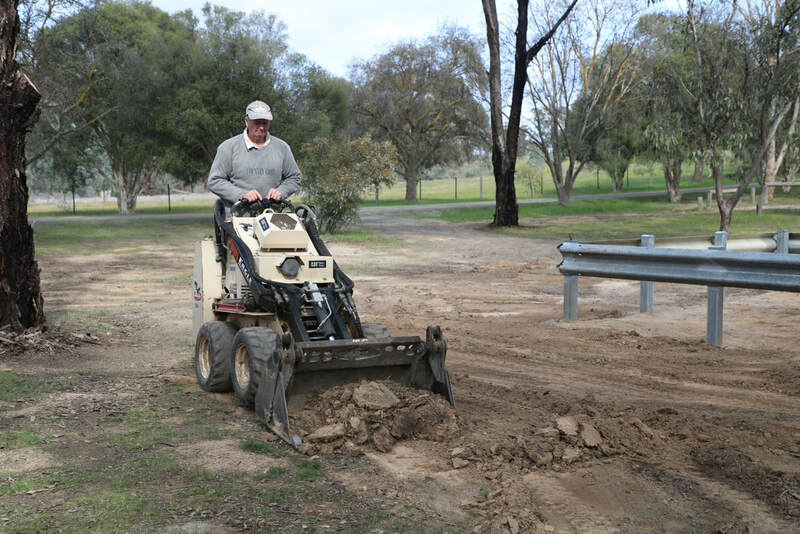 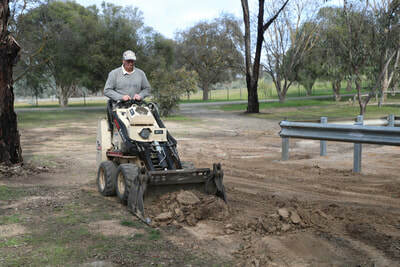 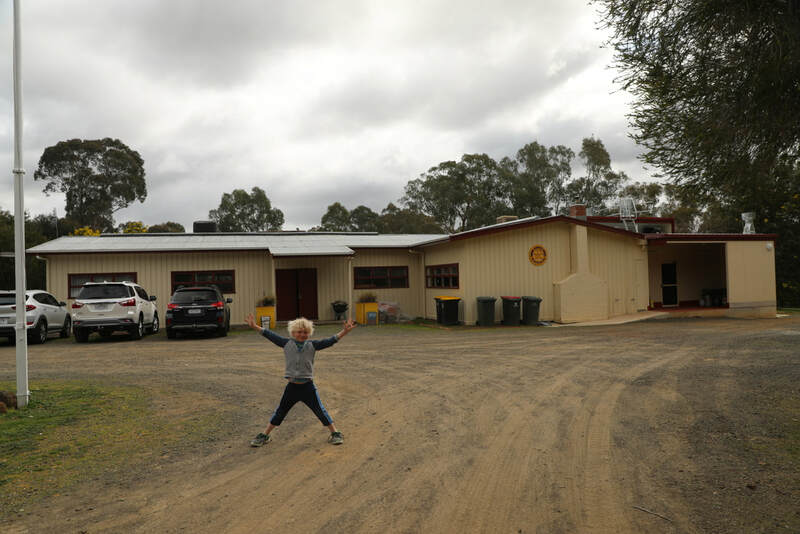 We spent the weekend of September 7th - 9th September undertaking a working bee at Rotary District 9800's Camp Getaway at Axedale in Central Victoria. 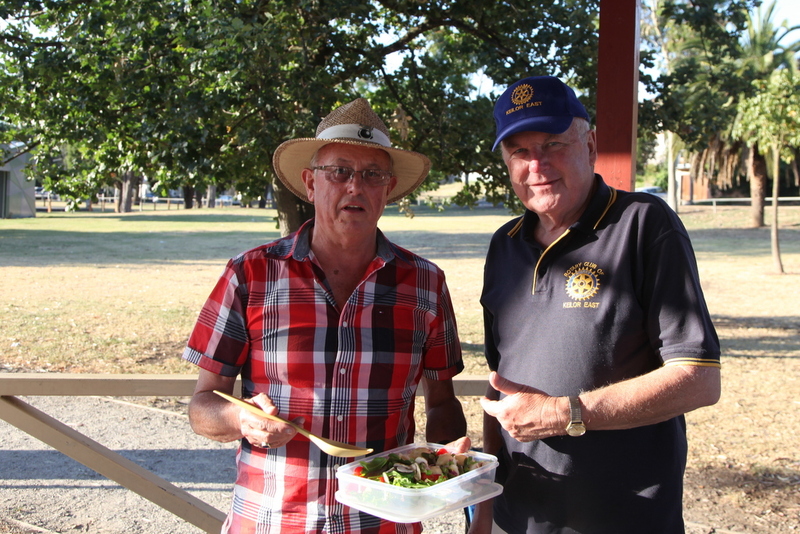 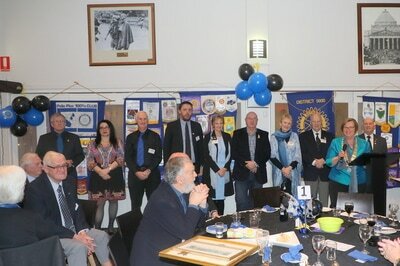 We were joined by members from Essendon Rotary and Bendigo South Rotary. 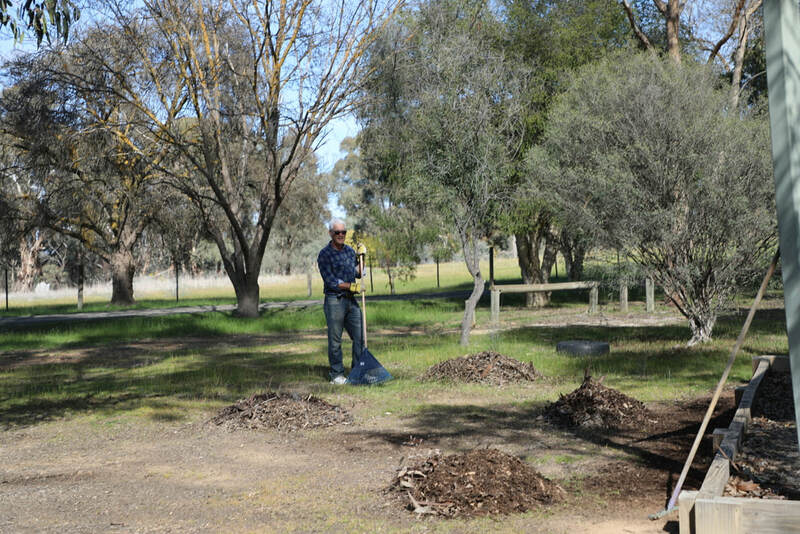 There was a lot of weeding and tidying to be done in order to keep the Camp looking great and safe for its many visitors. 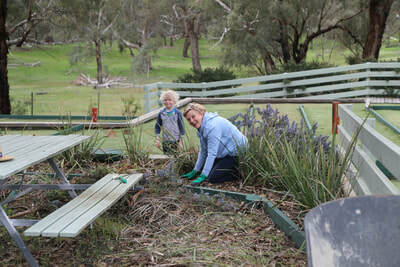 The new Caretakers, Benji and Tara, who have two young boys, Luke and Caleb, pitched in to help our super team of workers. 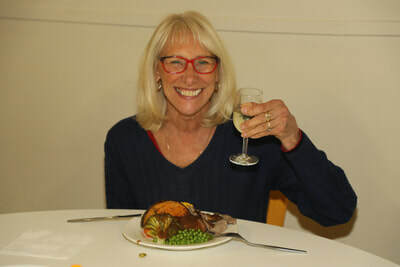 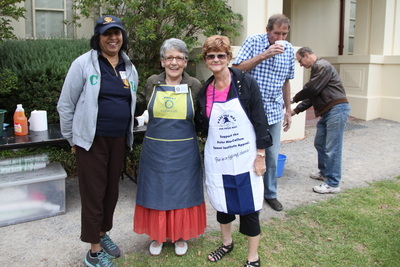 We were fed delicious meals by the skillful food preparation team led by Cherrie Osborn. 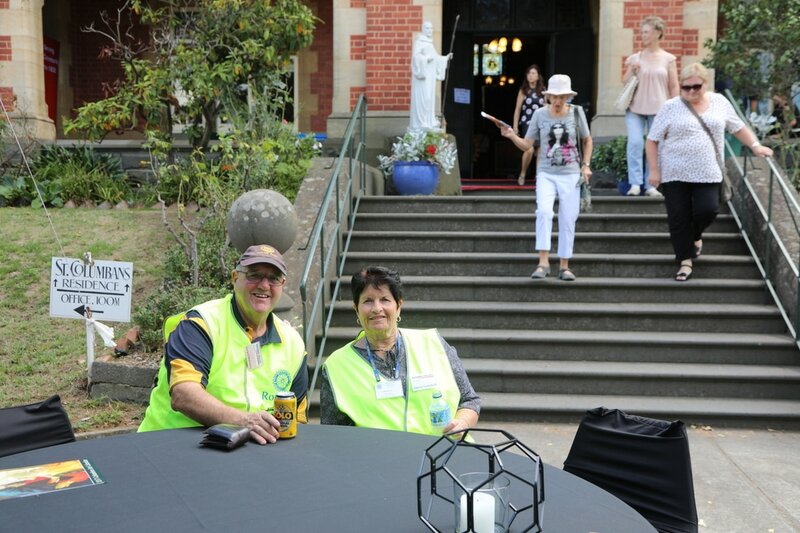 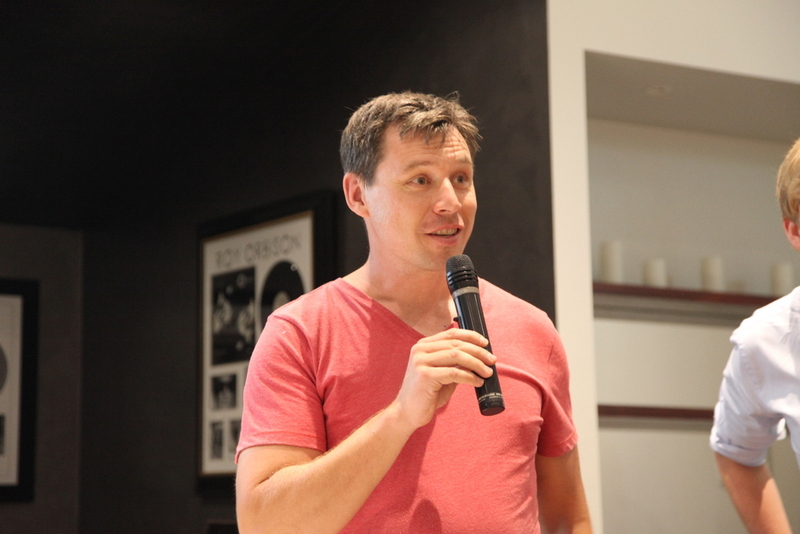 We would like to thank our wonderful Working Bee Organizer, Arnold Vandenham, and thank all who attended and worked so hard. 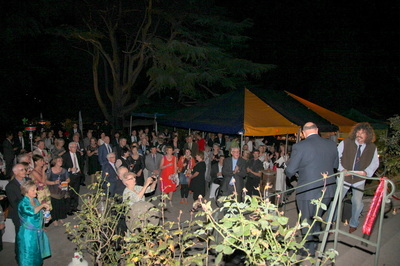 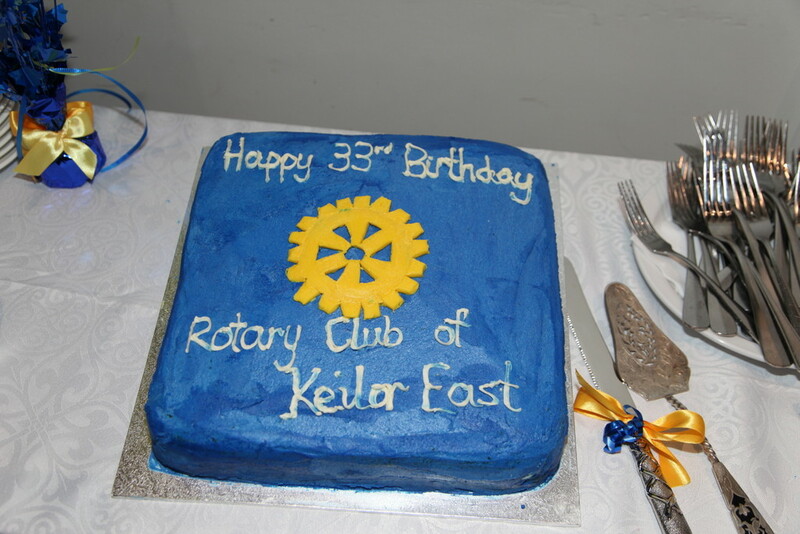 We had a wonderful night on August 13th celebrating our Club's 35th Birthday. 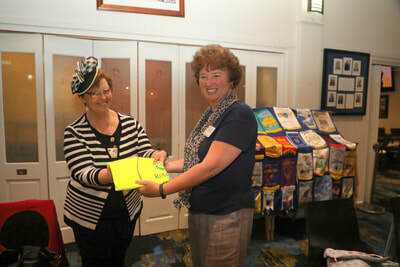 We also had the pleasure of welcoming eight new Club Members. 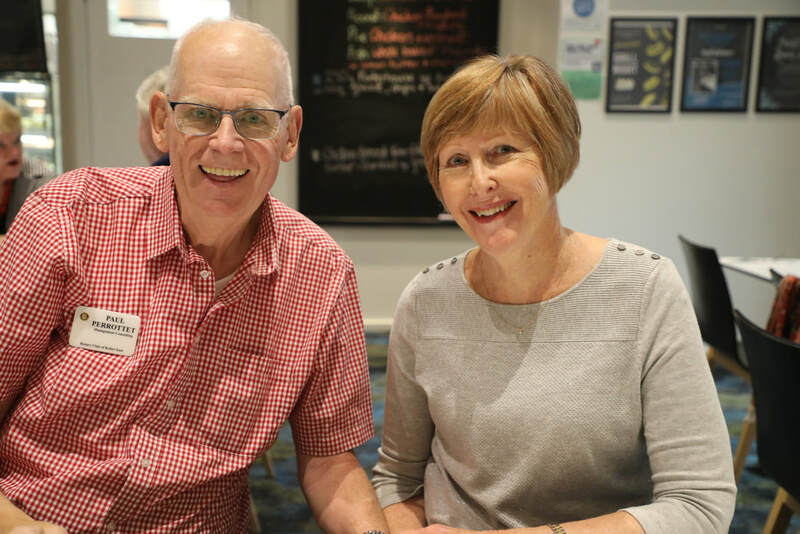 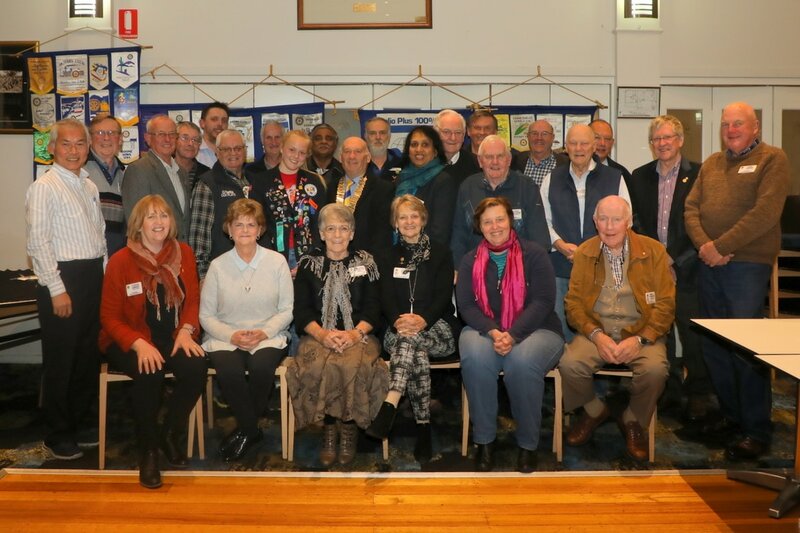 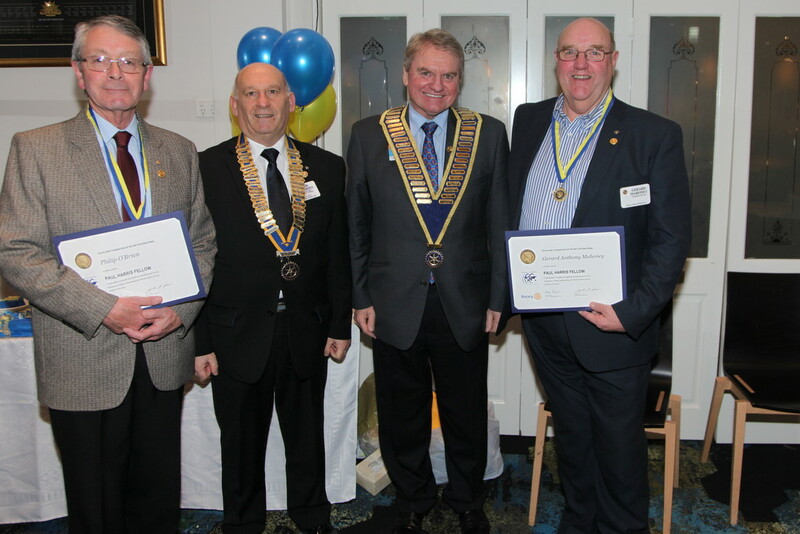 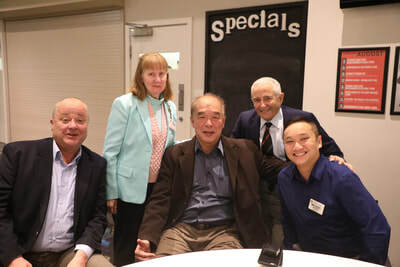 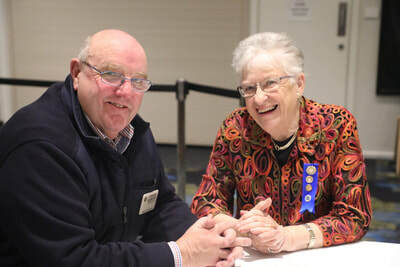 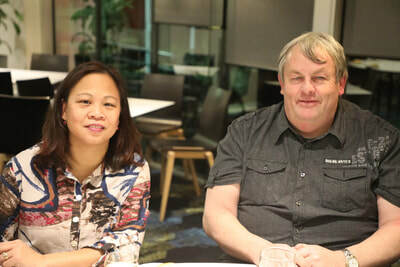 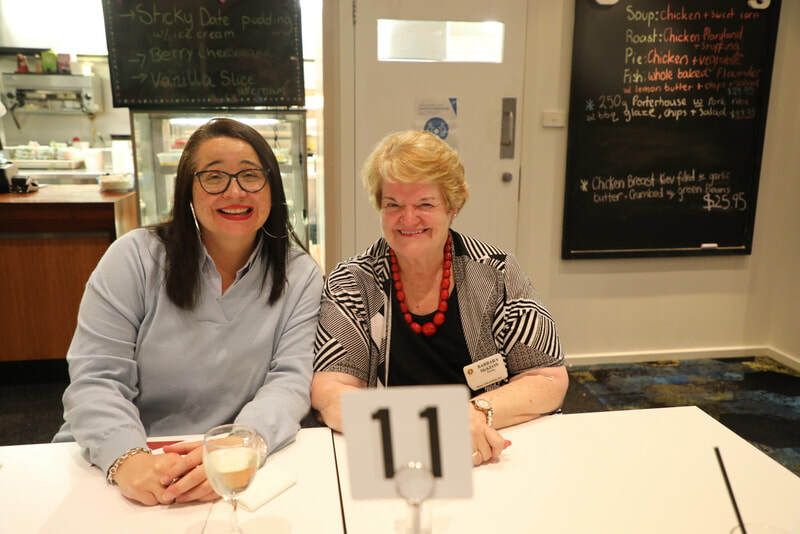 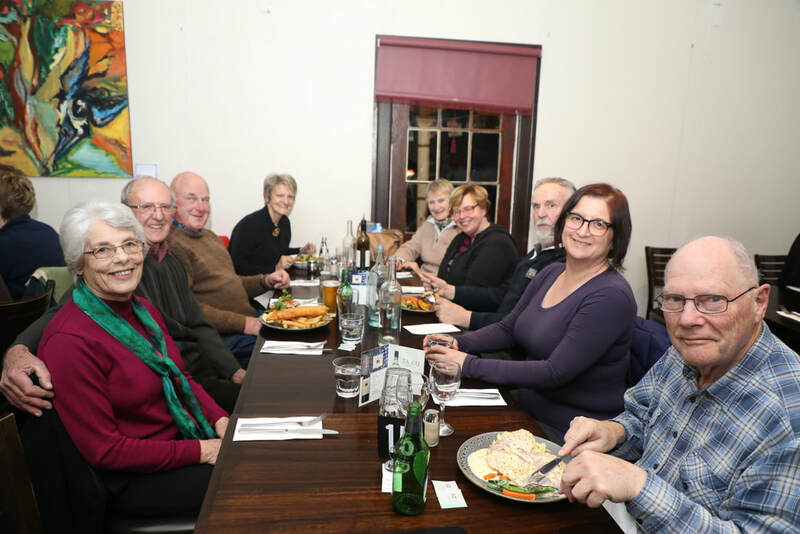 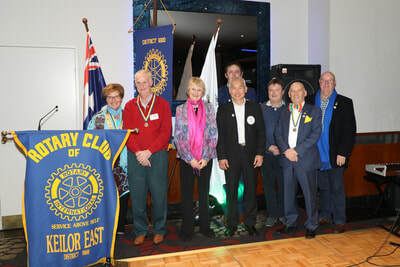 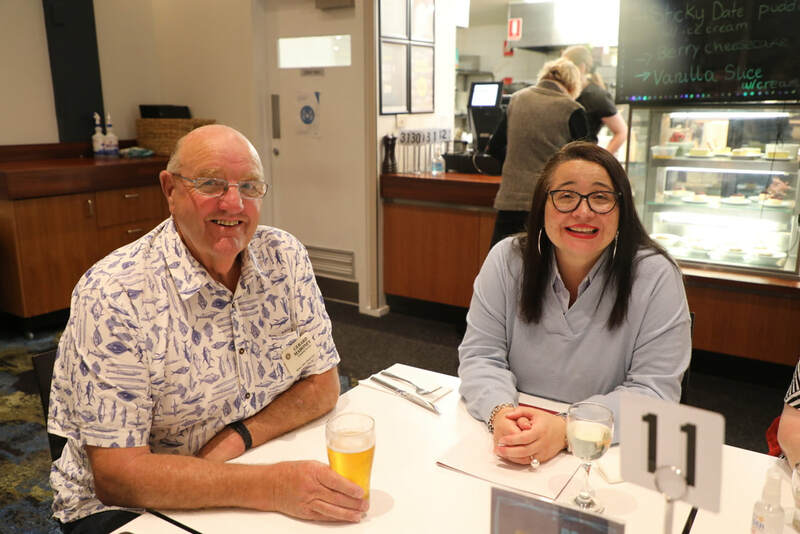 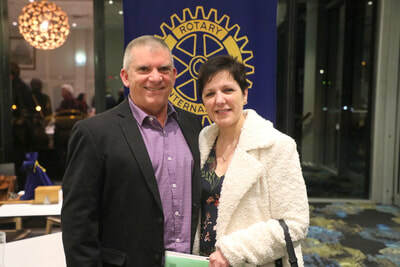 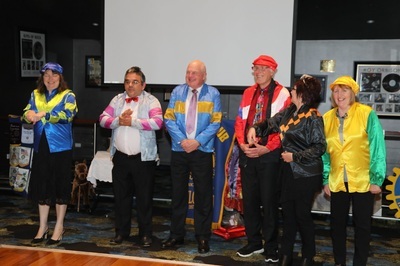 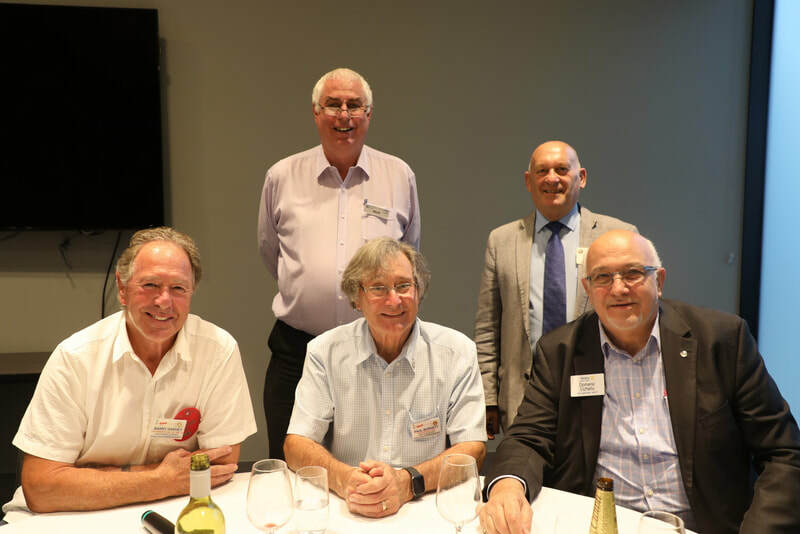 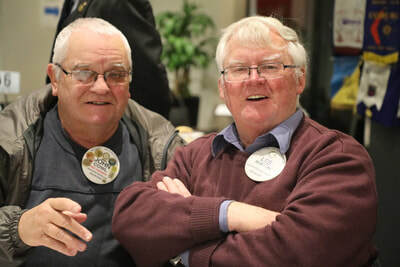 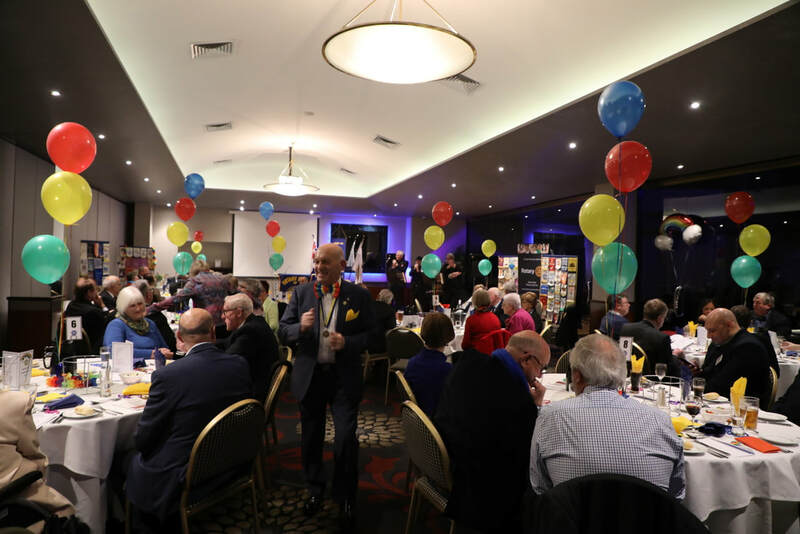 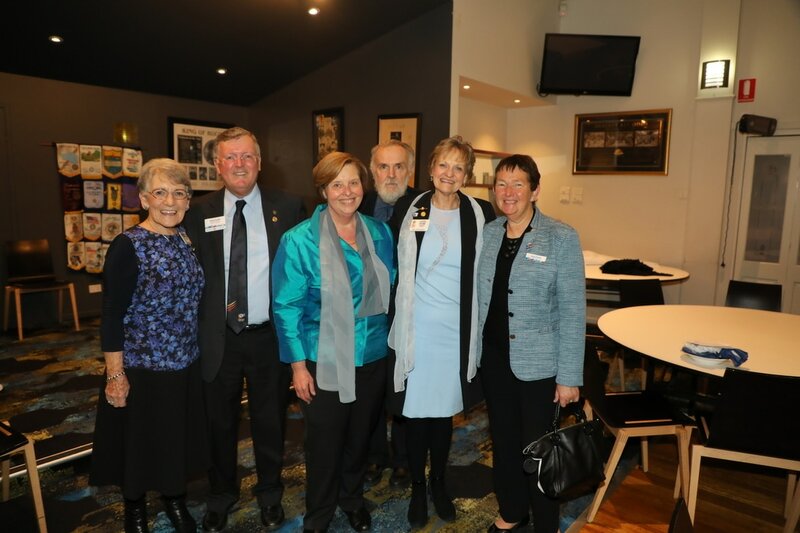 Previously members of Brimbank Central Rotary, which closed on June 30th, they bring a wealth of experience and community support which will further strengthen our great Club. 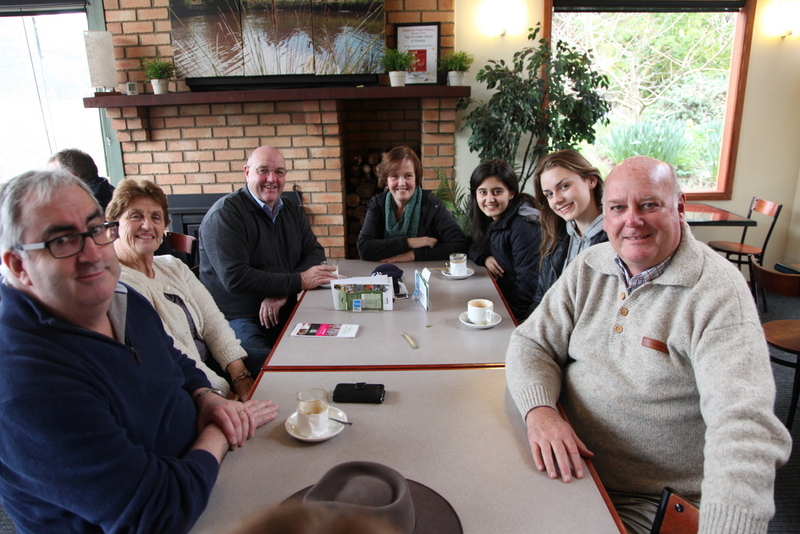 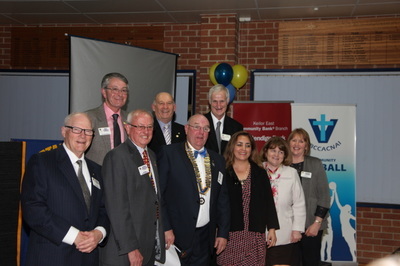 L to R: President Ginny Billson, Athena Vass, Barbara Rafter, Michael Donnelly, Terry Badenhope, John Rafter, Dawn Watson, Jack Watson and John Youings. 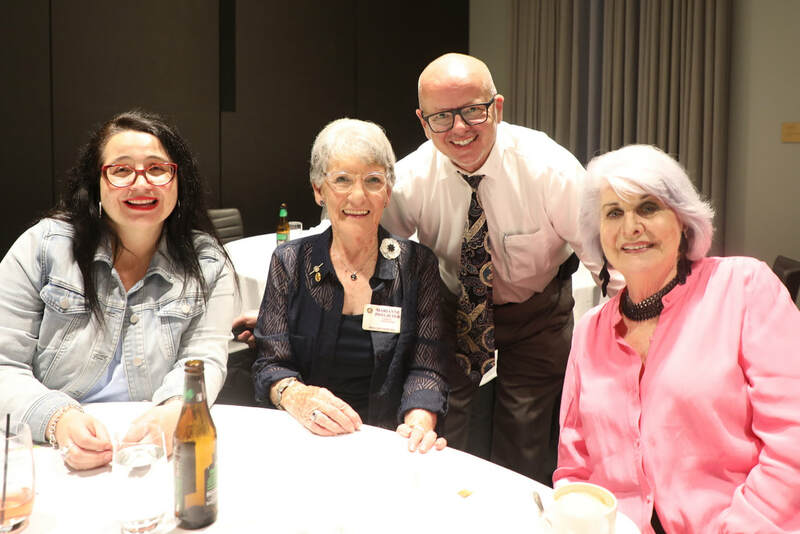 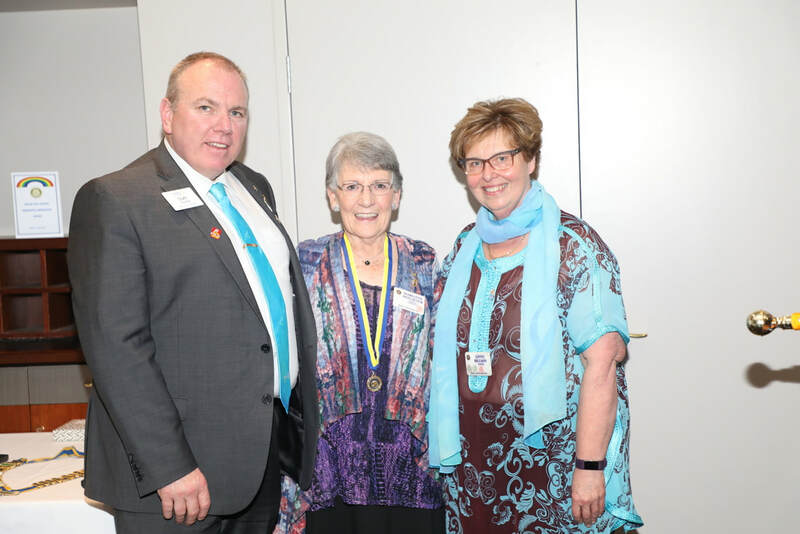 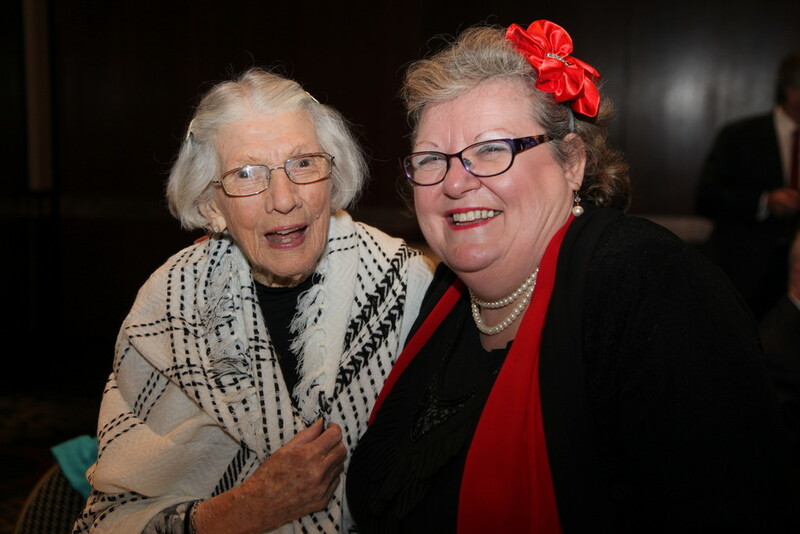 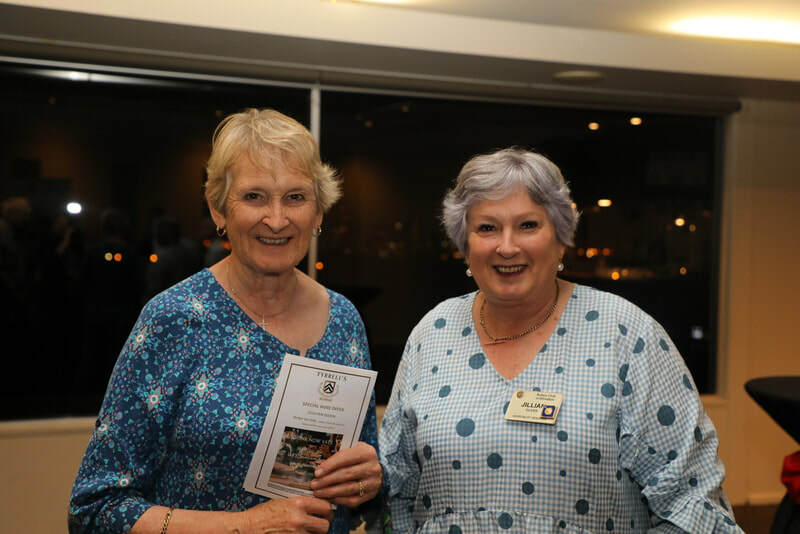 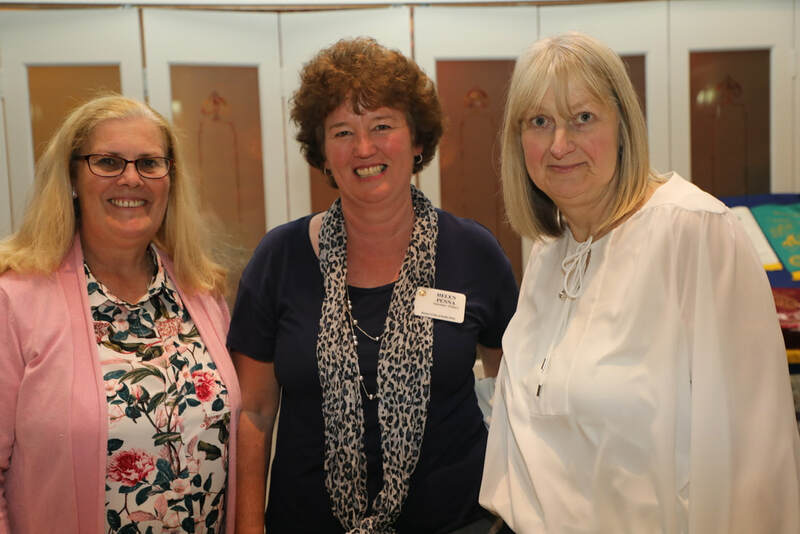 On Monday July 2nd 2018 we celebrated the induction of Virginia (Ginny) Billson as our Club President for a second year. 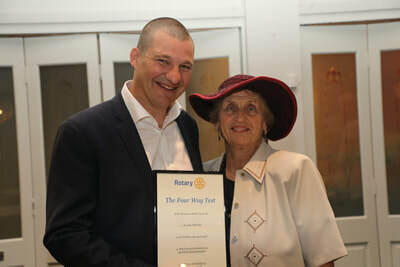 We thank Ginny and her husband Alex for their generosity and commitment and wish them well for another great year with Keilor East Rotary. 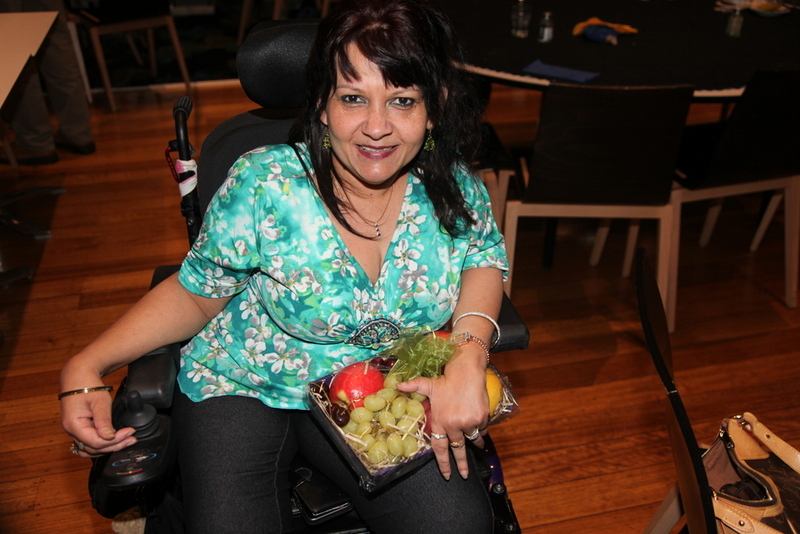 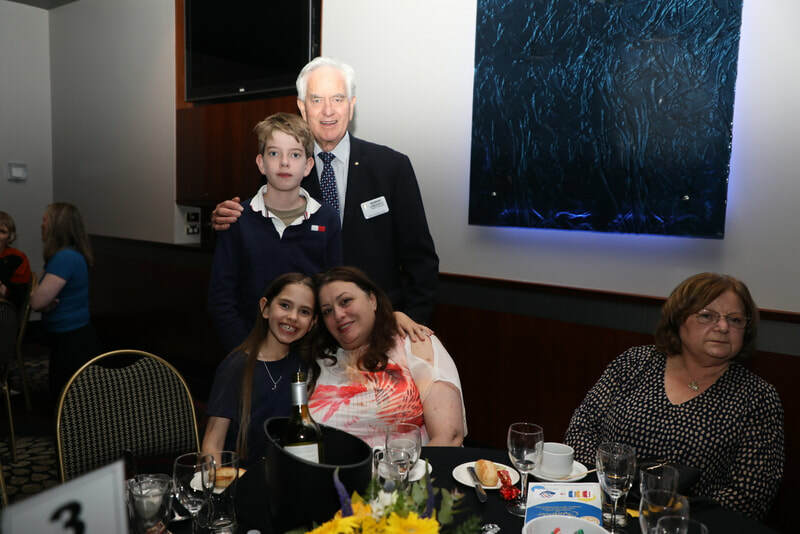 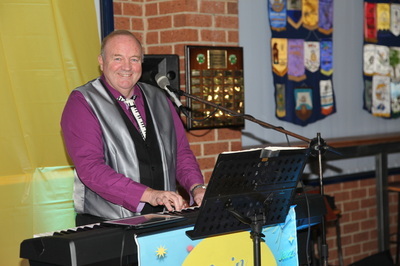 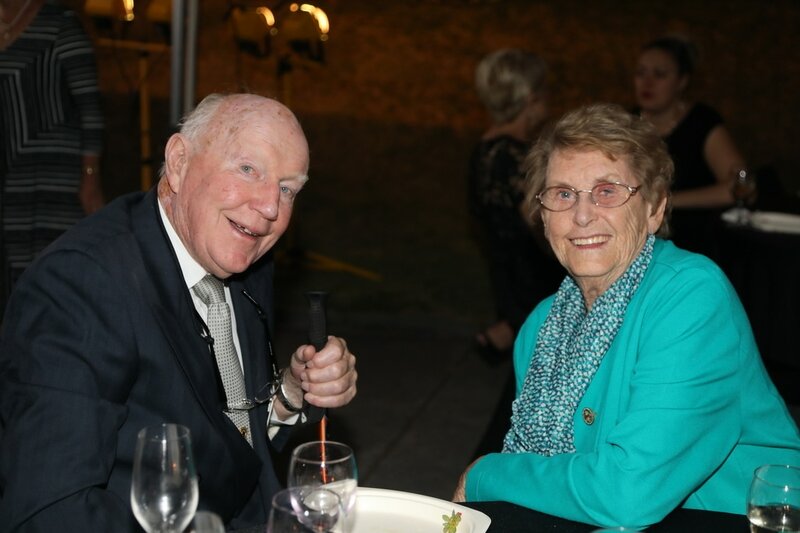 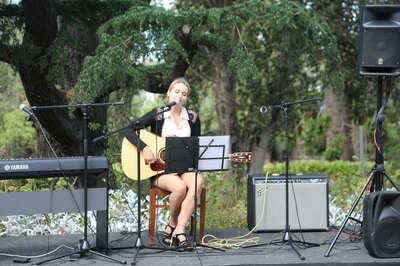 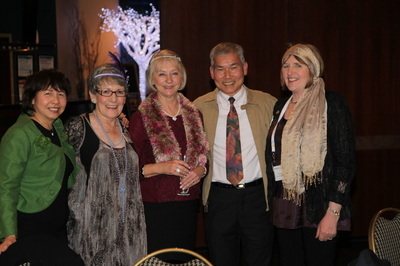 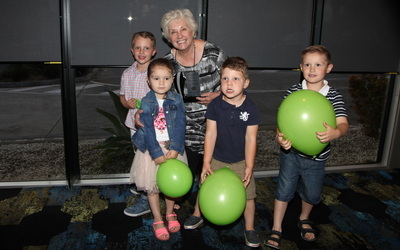 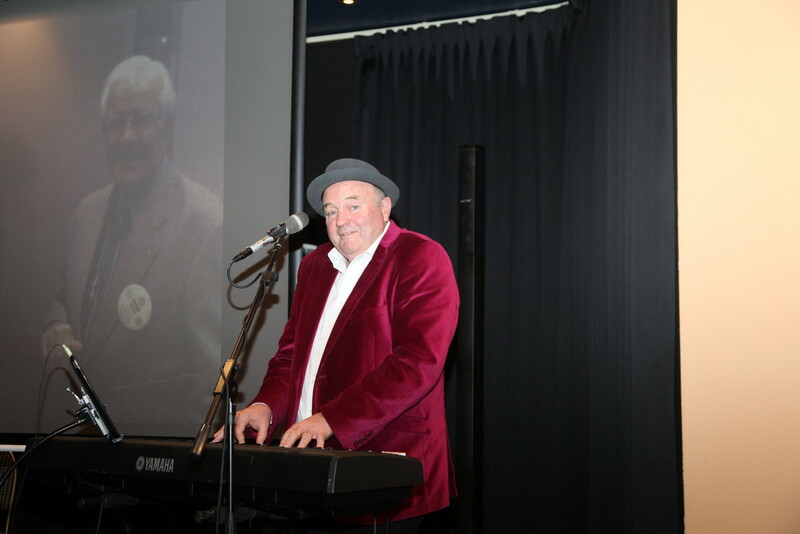 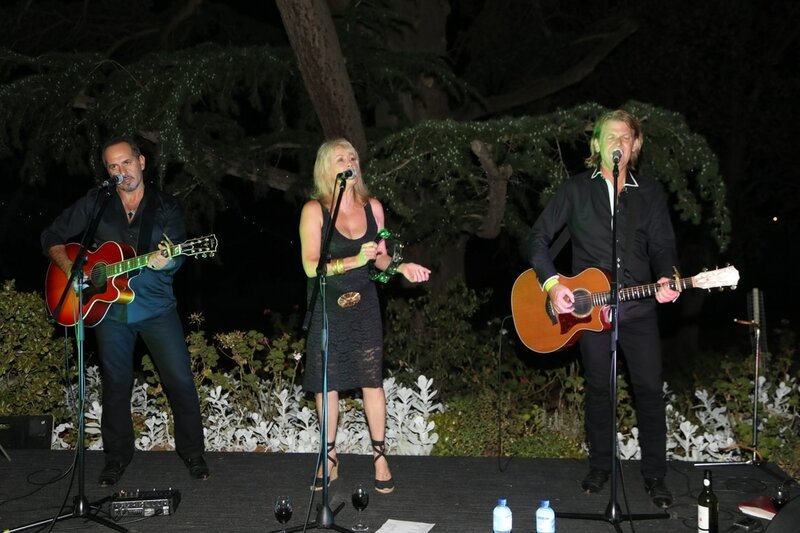 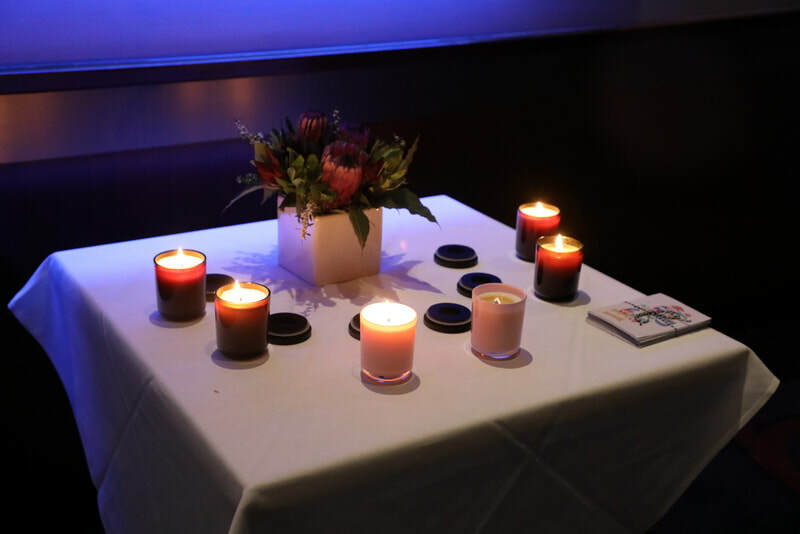 The evening which was held at Taylors Lakes Hotel's Garden Room had a "Colours of the Rainbow" theme. We were pleased to welcome District Governor Elect Grant Hocking and his wife Melissa and Assistant Governor Des Hocking and his wife Irene. 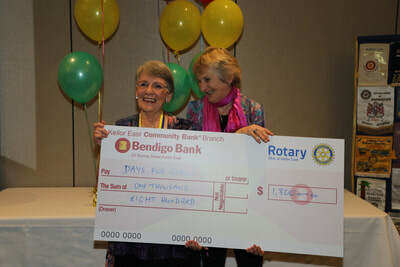 Several Paul Harris fellows were awarded and cheques were presented. 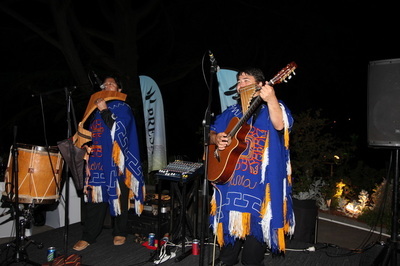 Entertainment was provided by the great group, Barking Dogs. 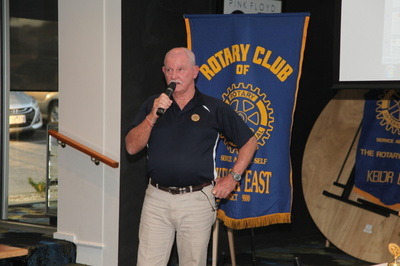 Last Monday evening Shaun Aisen who is a volunteer pilot with Angel Flight, was our Guest Speaker. 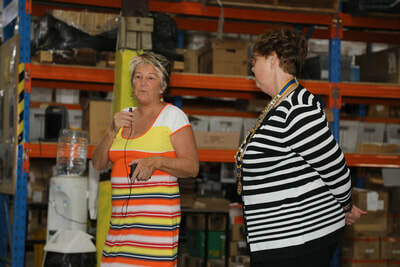 Angel Flight has operated over 22,000 individual flights assisting non emergency patients in rural areas who do not qualify for the Government's Air Ambulance services. 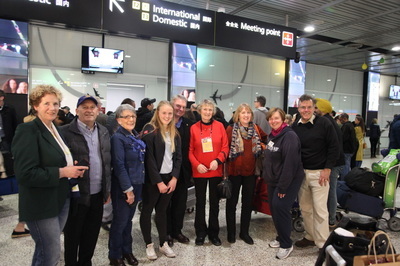 There are 3000 pilots and the same number of Ground Angels. 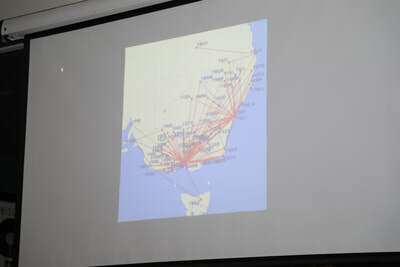 Shaun has flown over 430 services, travelling thousands of kilometres. He doesn’t currently own a plane so he hires one and pays for the fuel. 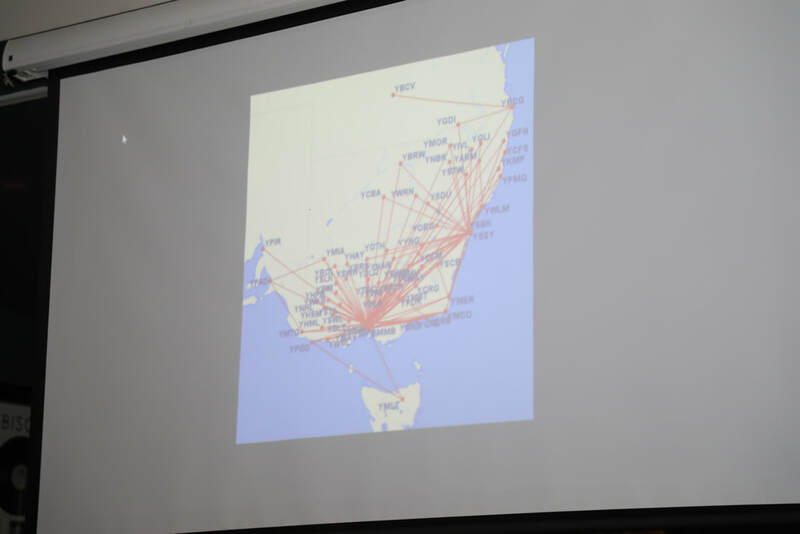 Pilots donate their time, plane hire and any fees incurred. 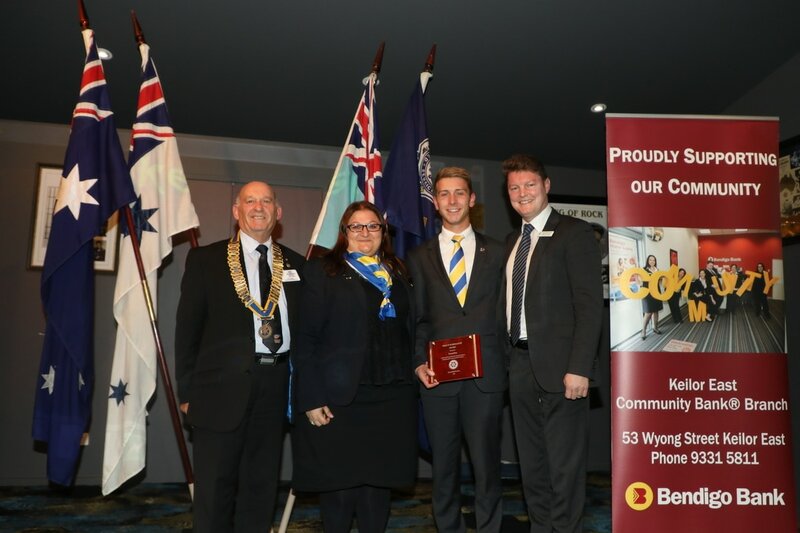 He enjoys the friendships he makes and thoroughly recommends this voluntary work as a way of "giving back" to the community. 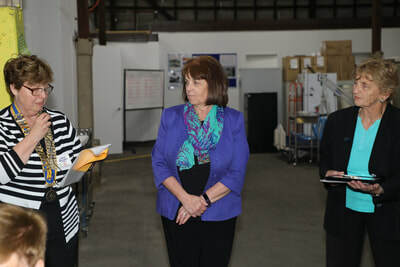 Angel Flight's website has more information. 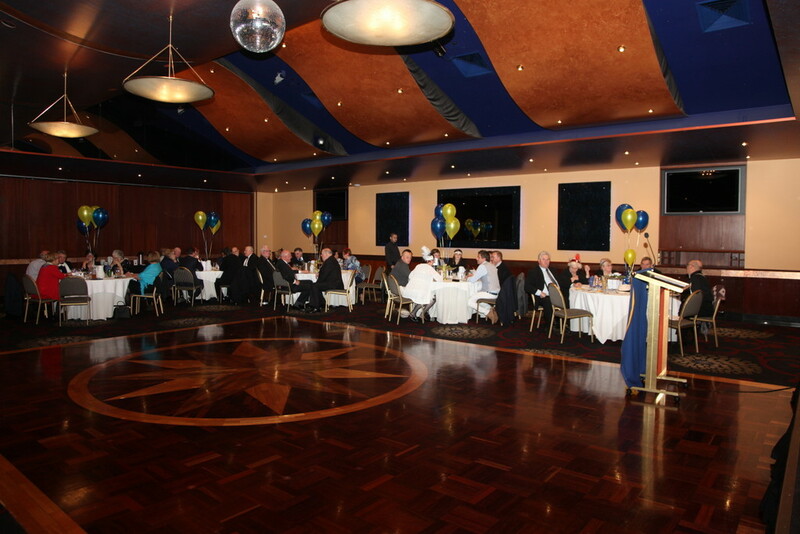 On Monday 21st May we held our annual Pride of Workmanship Awards Night. 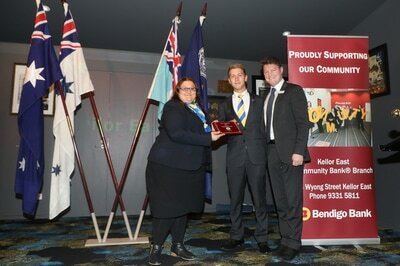 Ben Carroll, MP for Niddrie, who is Minister for Industry and Employment, presented our Pride of Workmanship Awards. 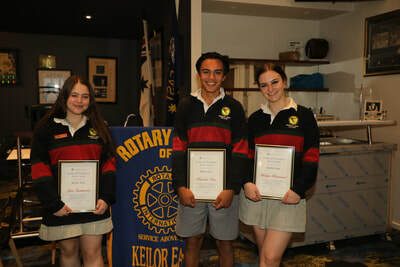 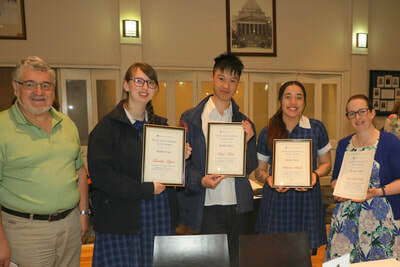 Awards went to Emily Klimes, Property Manager for Pennisi Real Estate, Tania Mullen, Veterinarian at Essendon Veterinary Clinic and Brian Stanley, Pharmacist at Lincolnville Pharmacy.We congratulate the awardees who have shown exemplary service in their vocations and we thank Ben Carroll MP, who is an honorary Member of our Club for his enormous support. 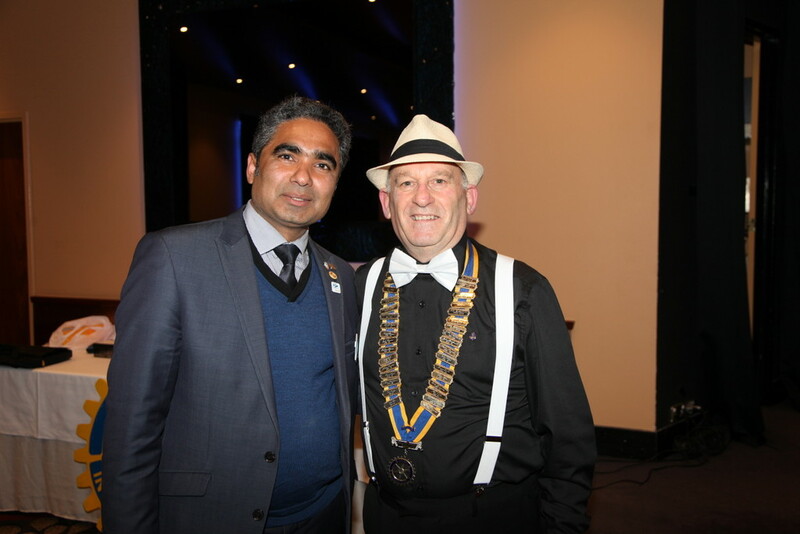 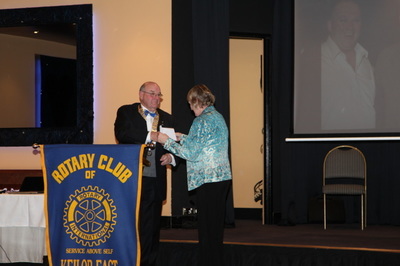 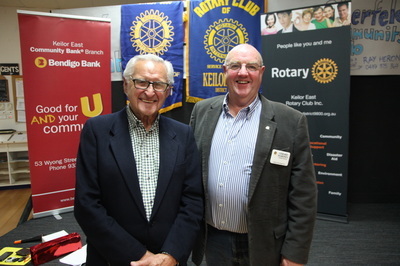 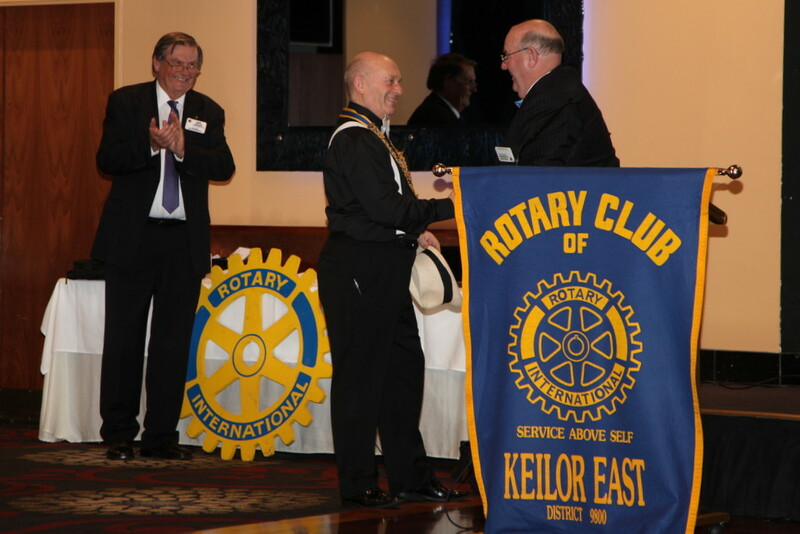 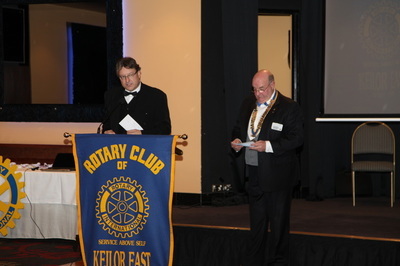 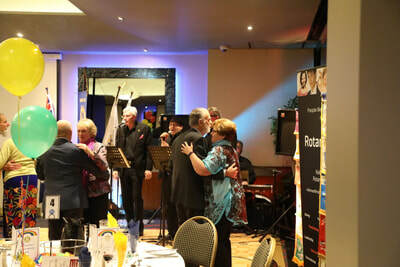 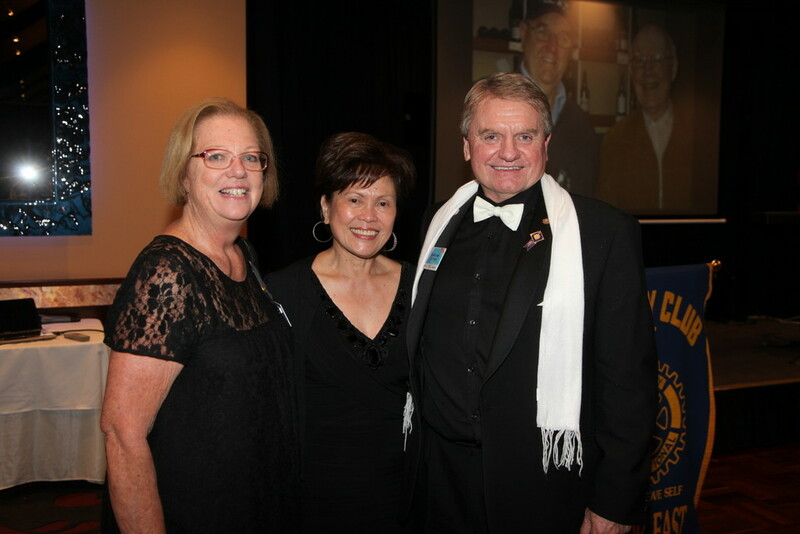 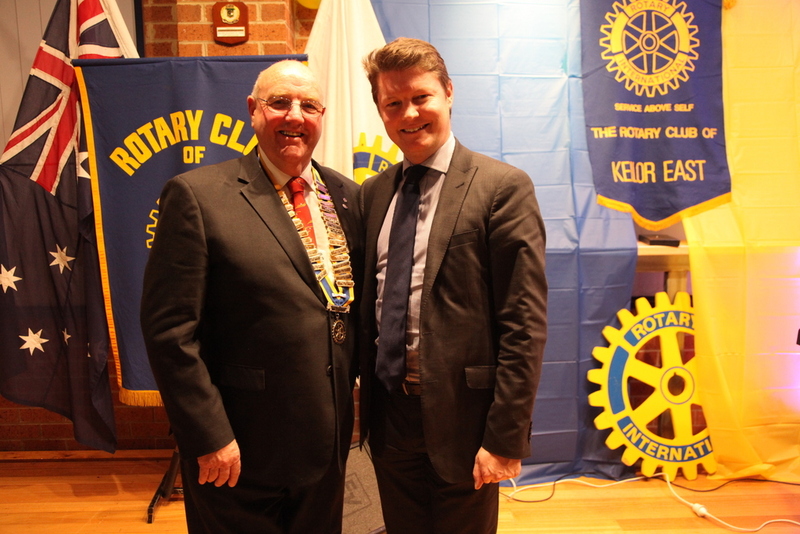 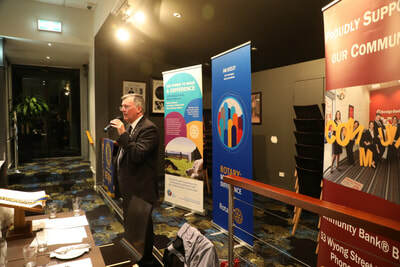 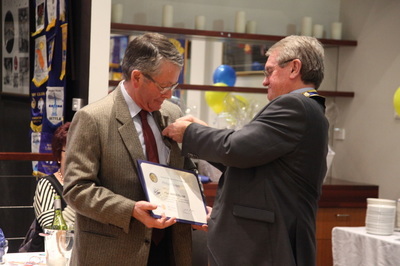 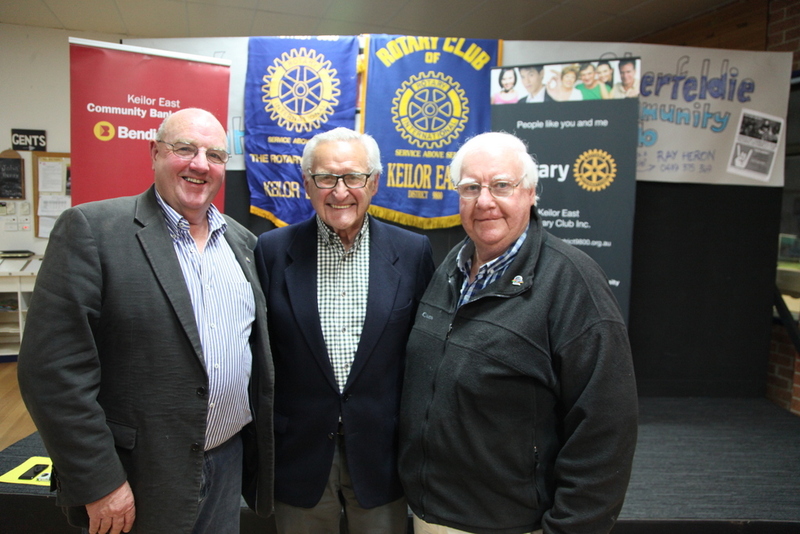 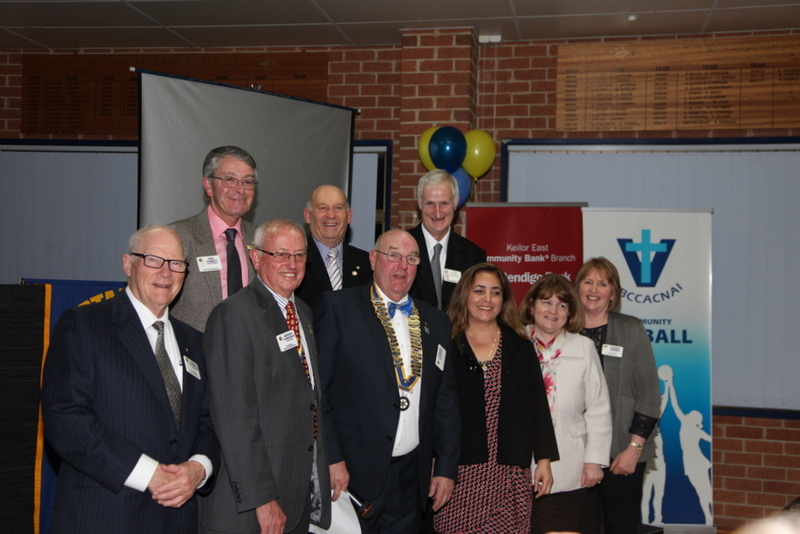 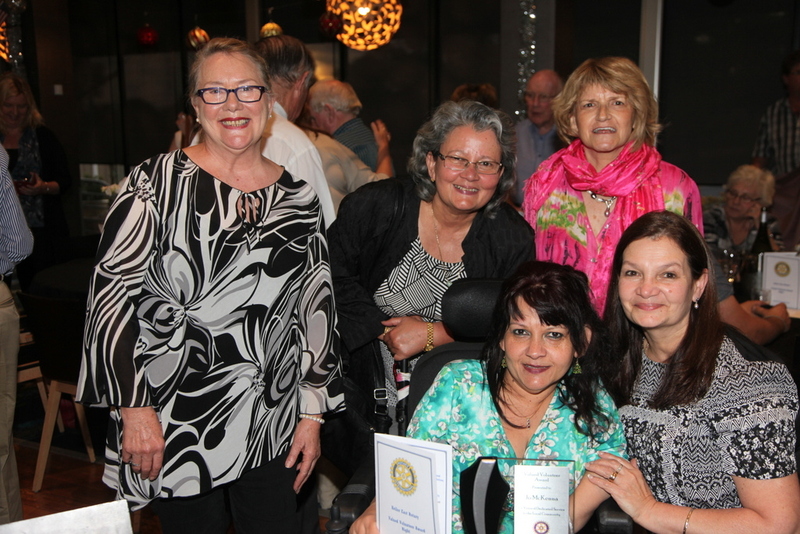 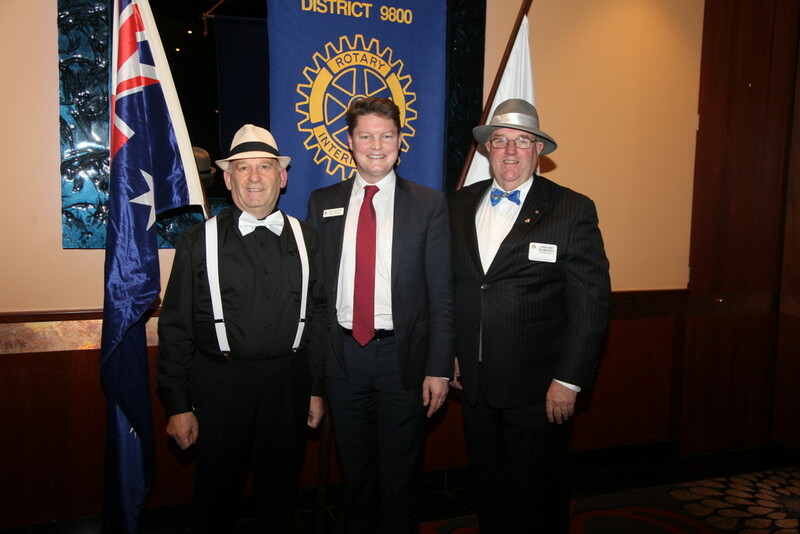 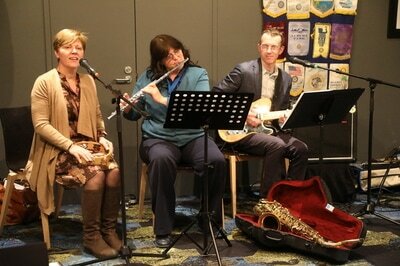 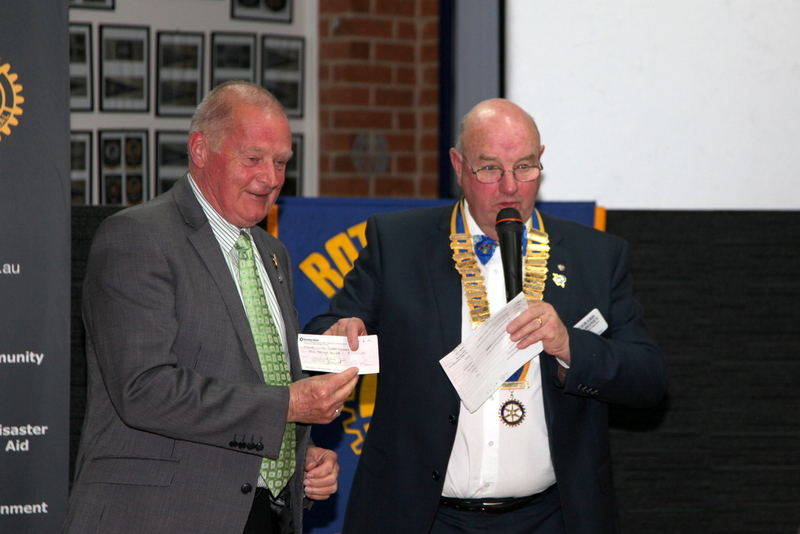 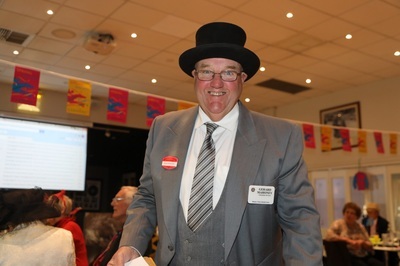 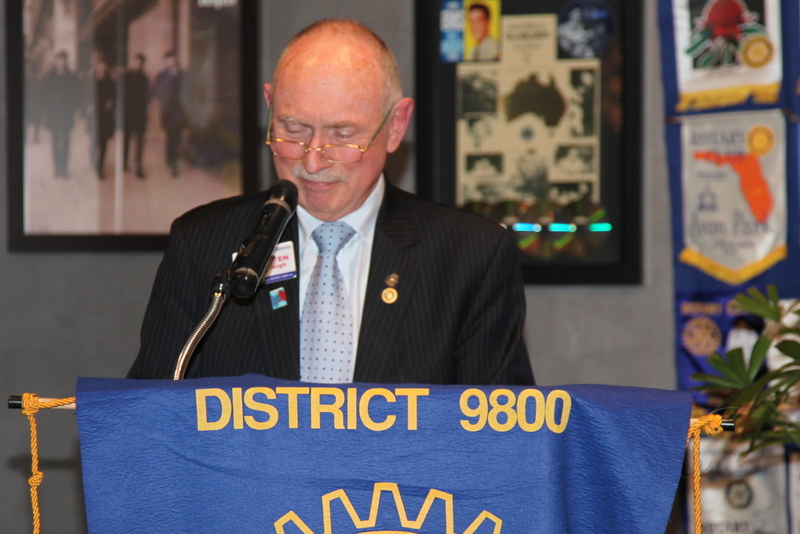 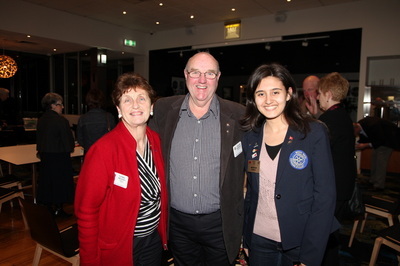 It was another wonderful night at Keilor East Rotary. 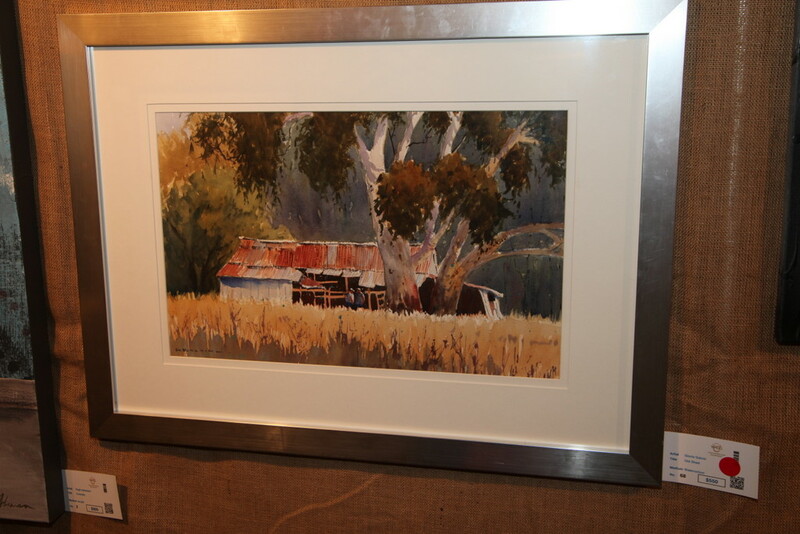 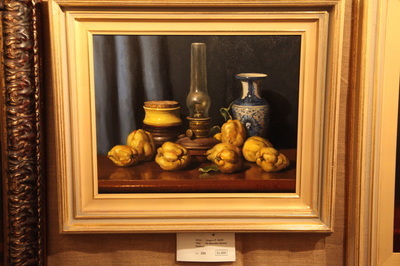 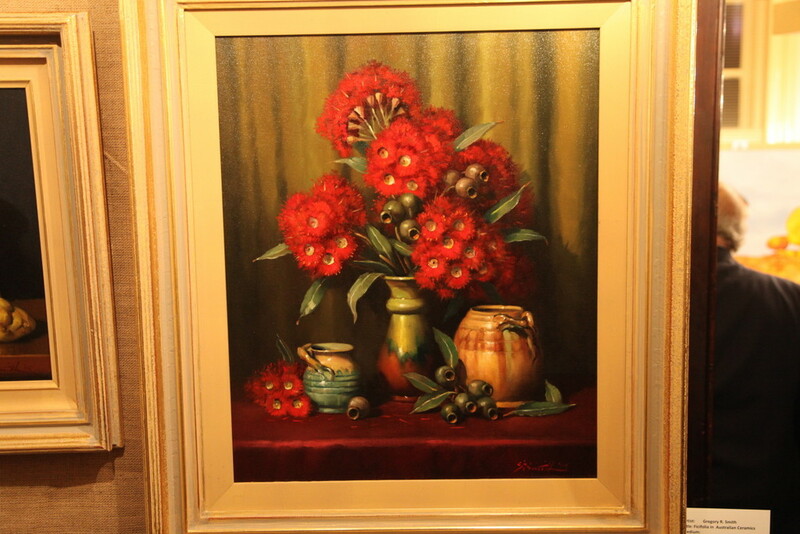 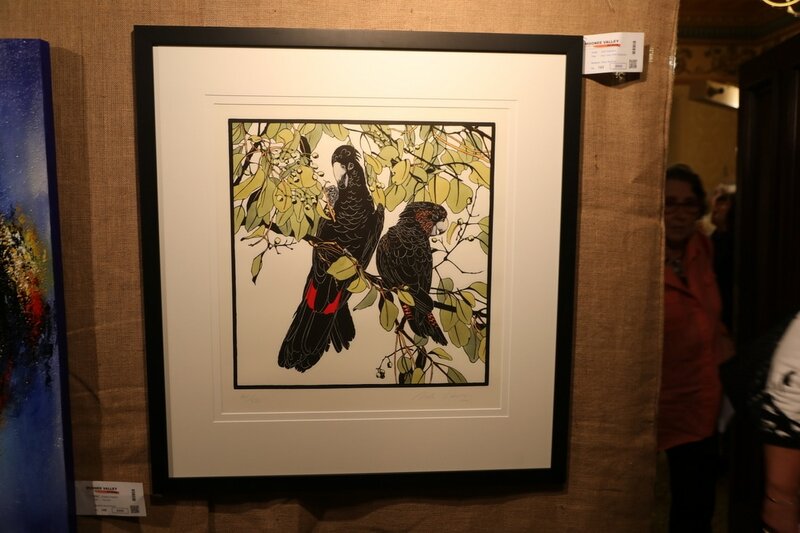 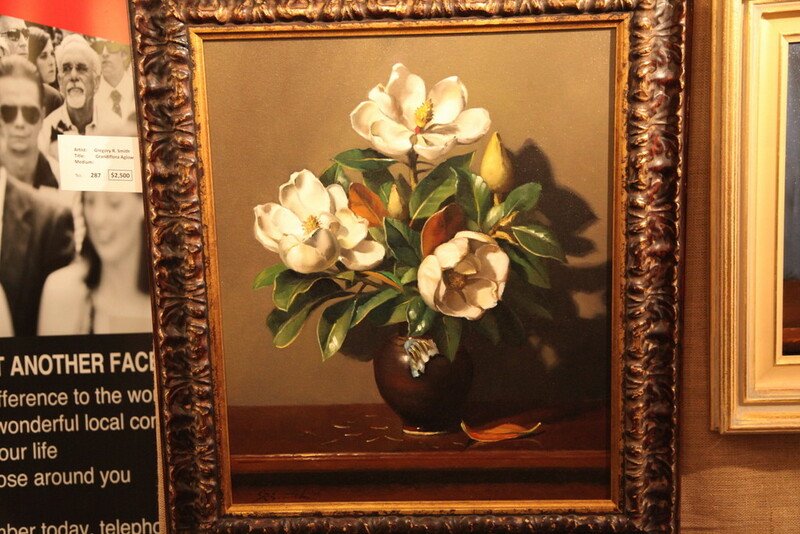 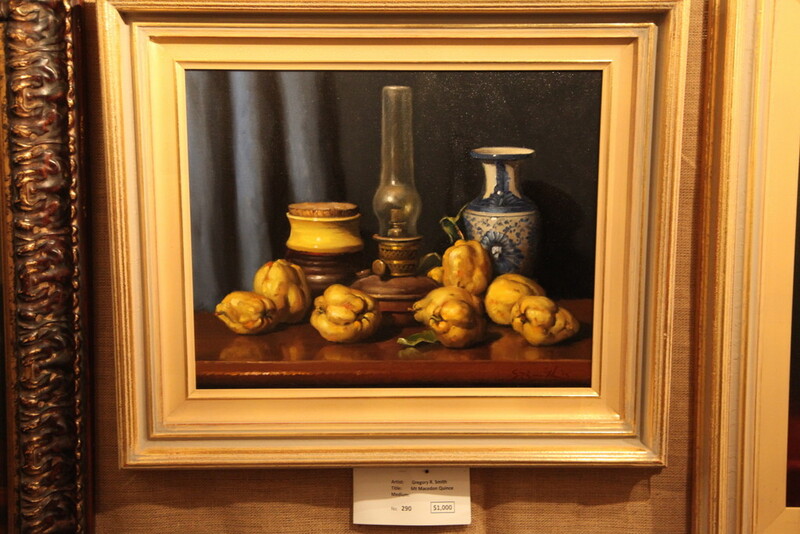 The Slideshow below is a photographic record of Sunday 25th March, 2018 at the Moonee Valley Art Show. 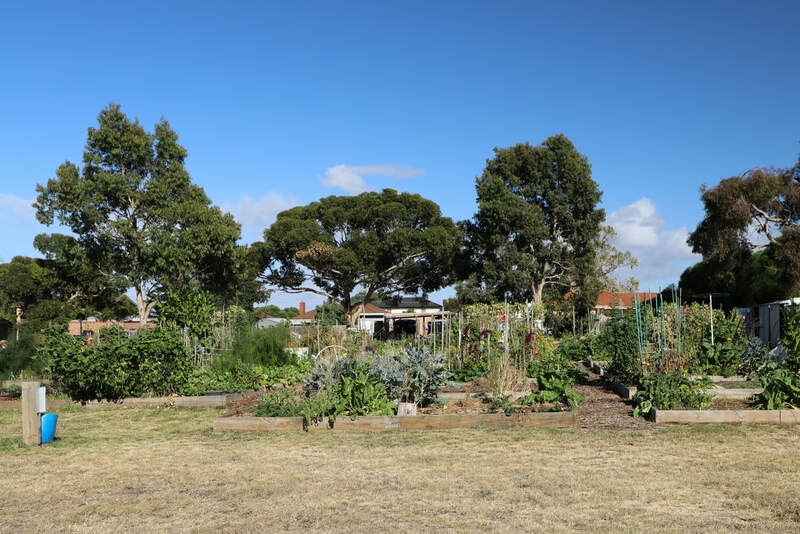 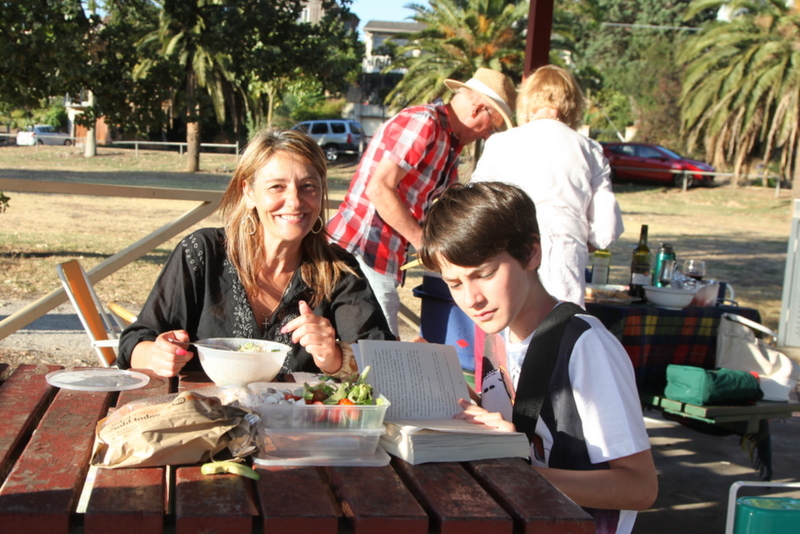 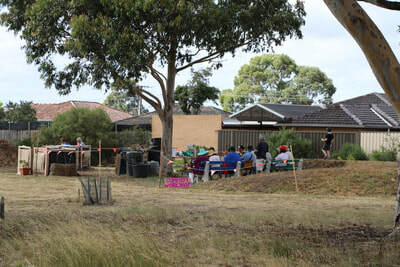 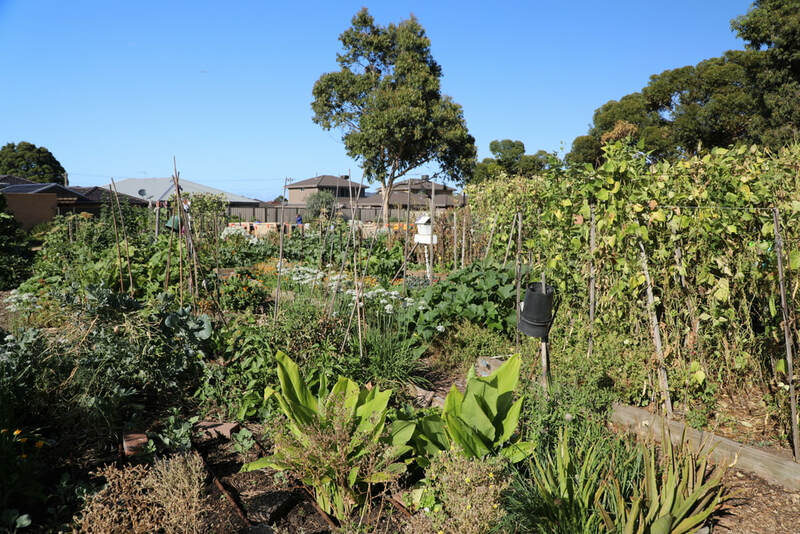 On Sunday 4th March 2018 we cooked a BBQ at the Open Day at Avondale Heights Community Garden. 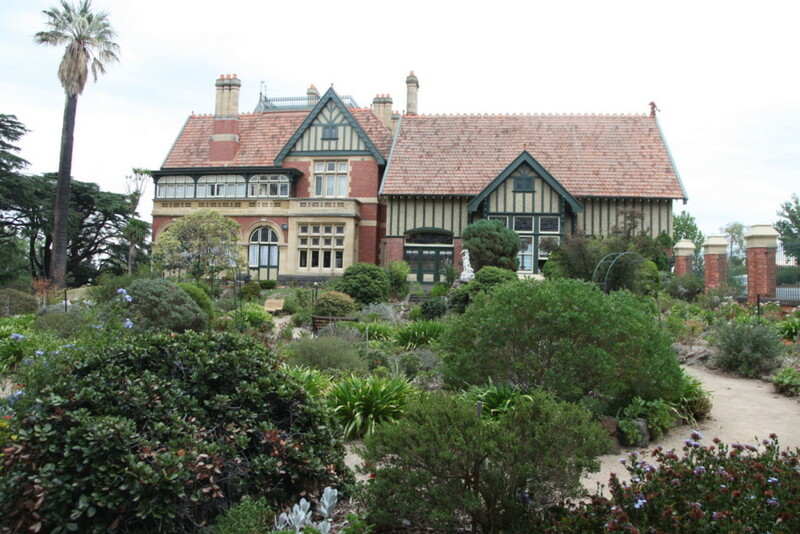 The garden is situated in a parcel of land set aside for a parkland by the original designer of the area, Sir Walter Burley Griffin. 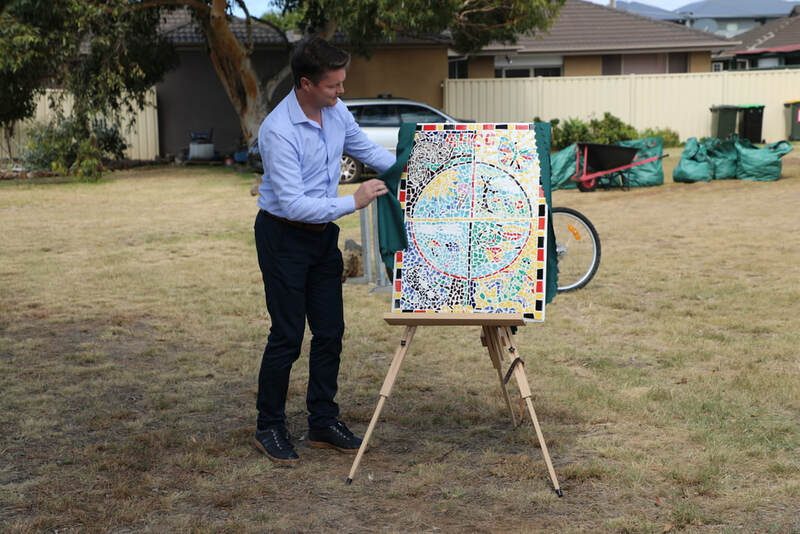 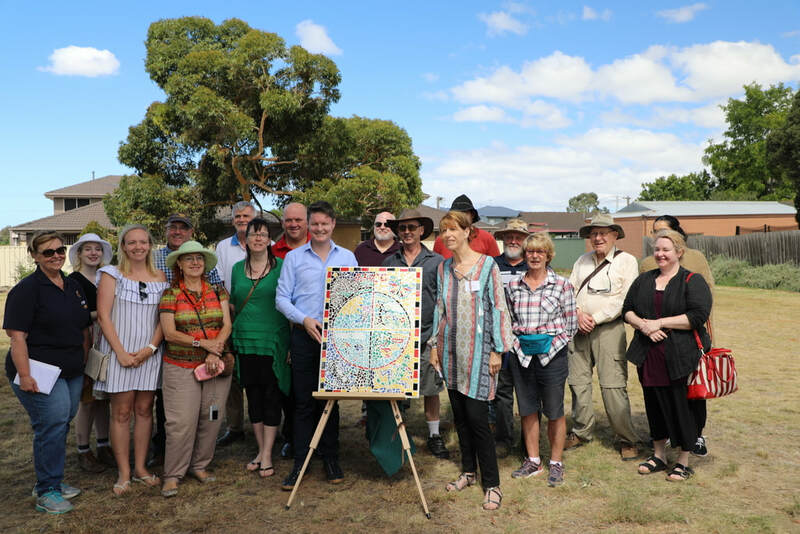 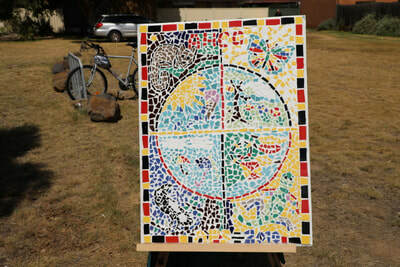 Our honorary Keilor East Rotary Club Member, MP for Niddrie,Mr Ben Carroll, unveiled a mosaic created by the Grade 5 and 6 students of Avondale Heights Primary School. 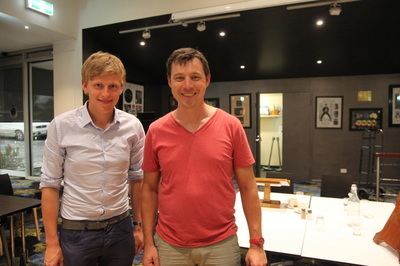 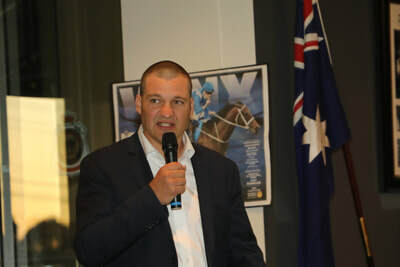 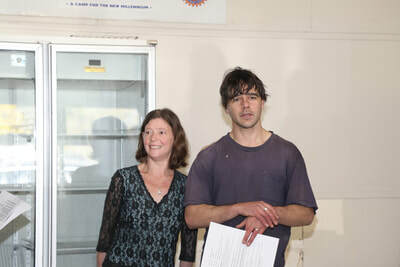 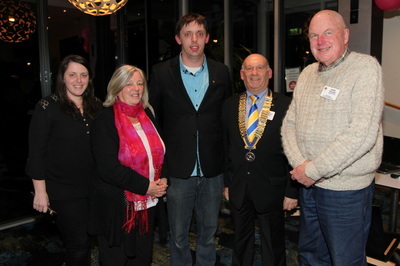 Also in attendance was the Mayor of Moonee Valley, John Sipek and several Moonee Valley City councillors. 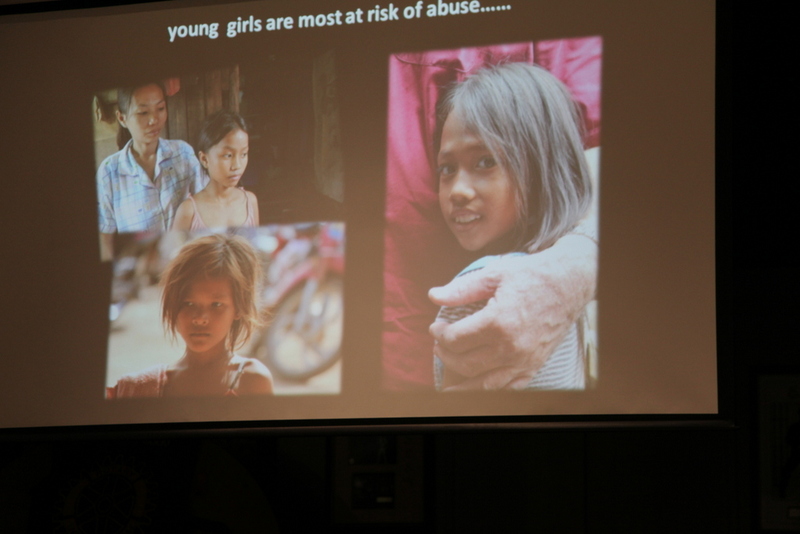 On Monday 20th November we had the great pleasure of a visit and presentation by Aviv Palti, founder of Cambodia Rural School Trust and two students who both volunteer for and are supported by the NGO. 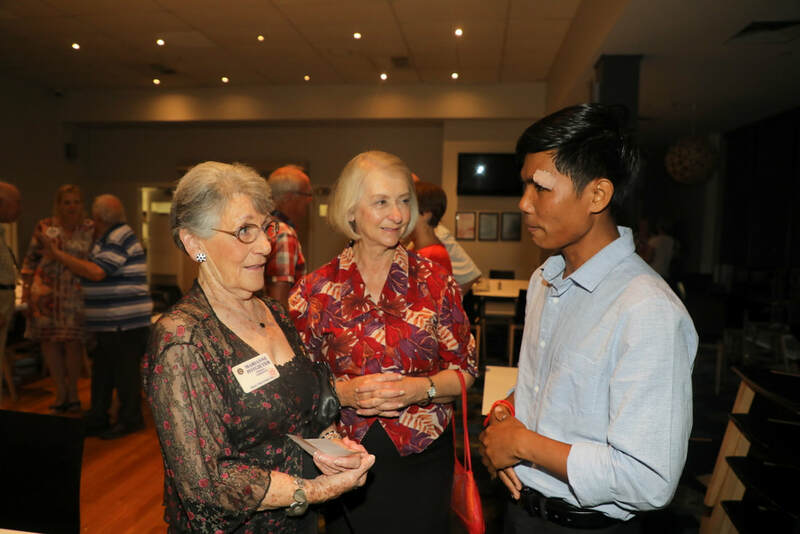 Sompeas and Vuen told of their lives as children in rural Cambodia and of their personal journeys, improving their futures through education. Introducing them, was Kerry Osborn who volunteered with CRST earlier this year as a Business Mentor and who helped build a simple house for a single mother with four children. She now sponsors a Cambodian student to attend University. 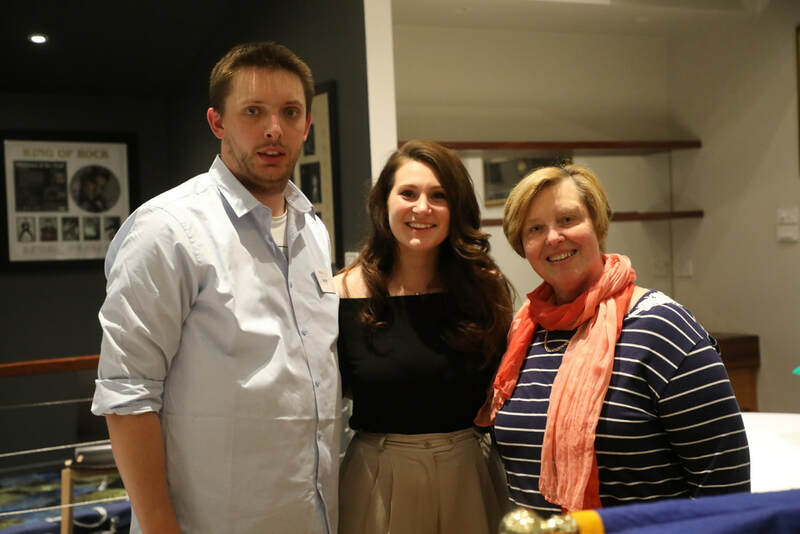 $1000 covers educational and living costs of a student for one year. 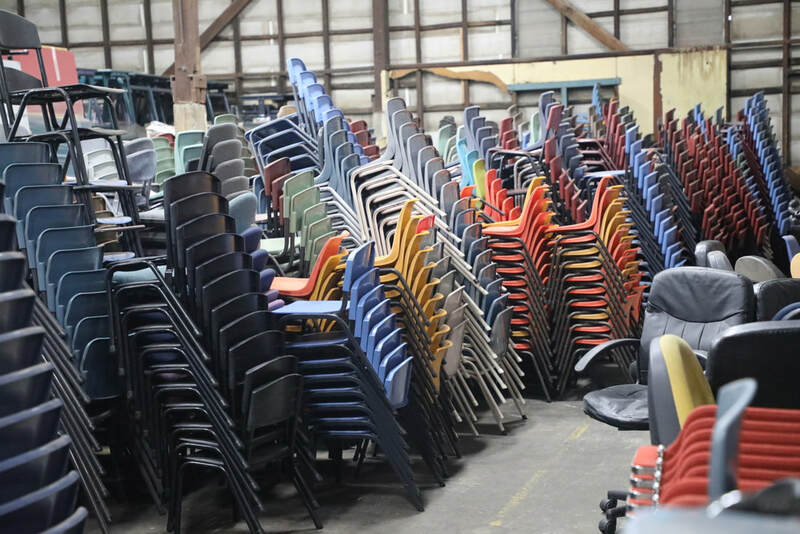 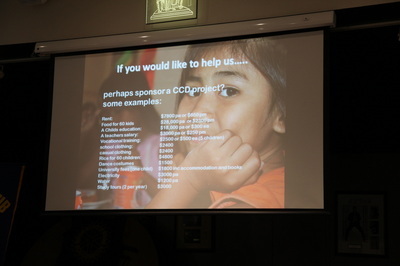 Donations may be made on the CRST website. We have been very busy. 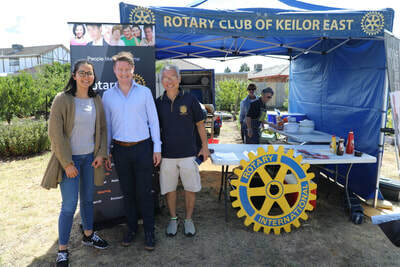 We have been supporting the Care 4 Cambodians cause, commemorating Remembrance Day at the Keilor East Cenotaph, cooking a BBQ outside Woolworths and inducting a new Club Member, all in the space of four days. 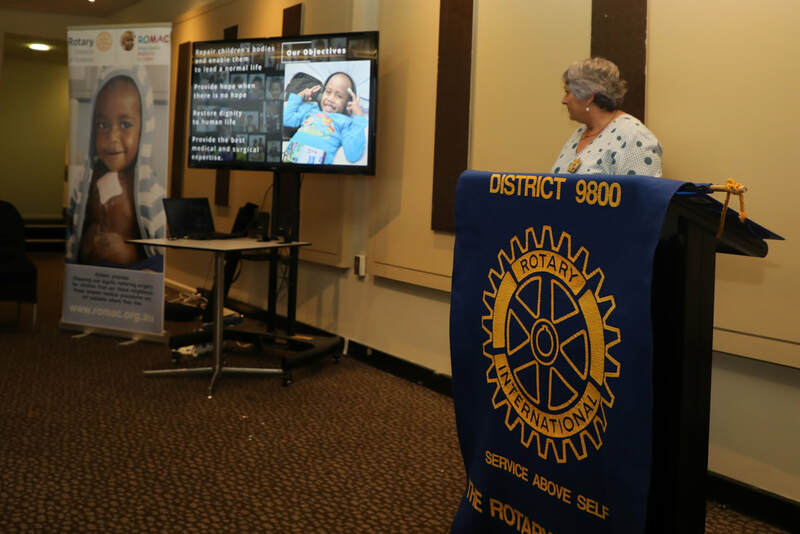 The slideshow below tells it all. 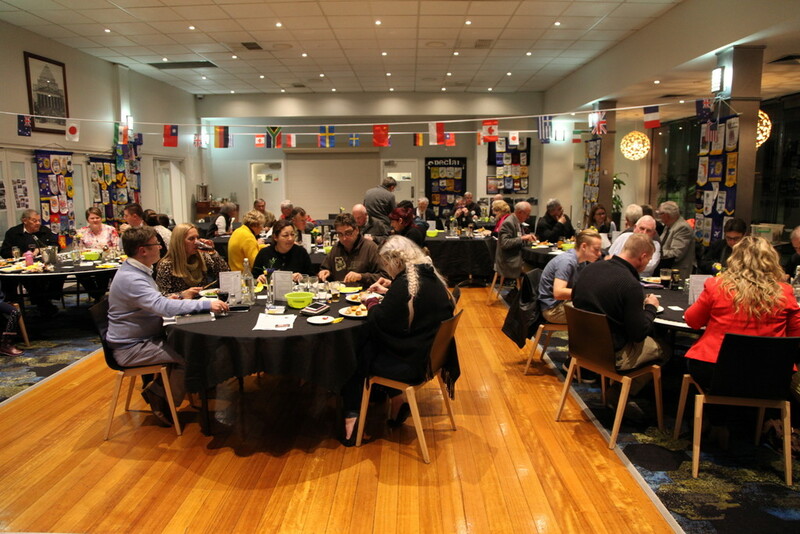 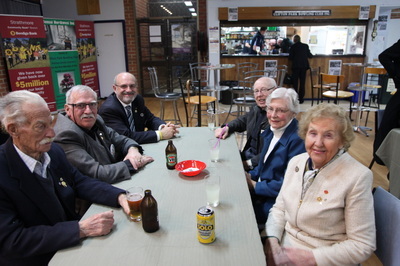 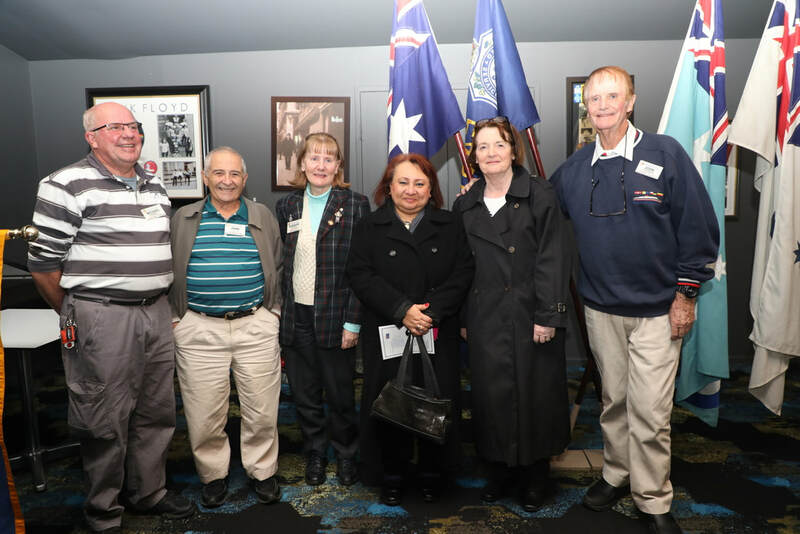 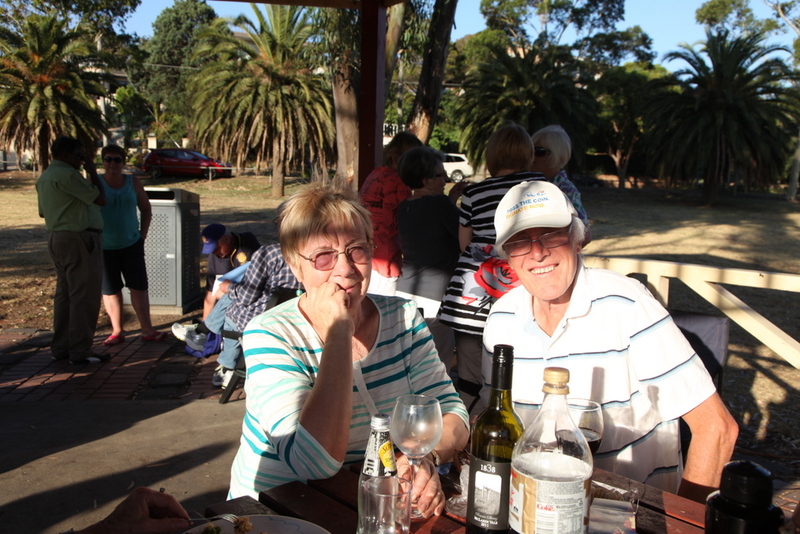 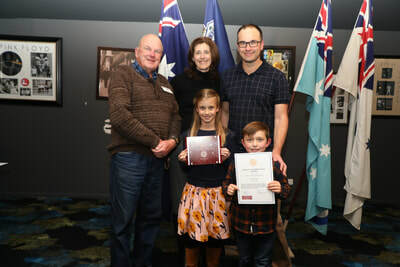 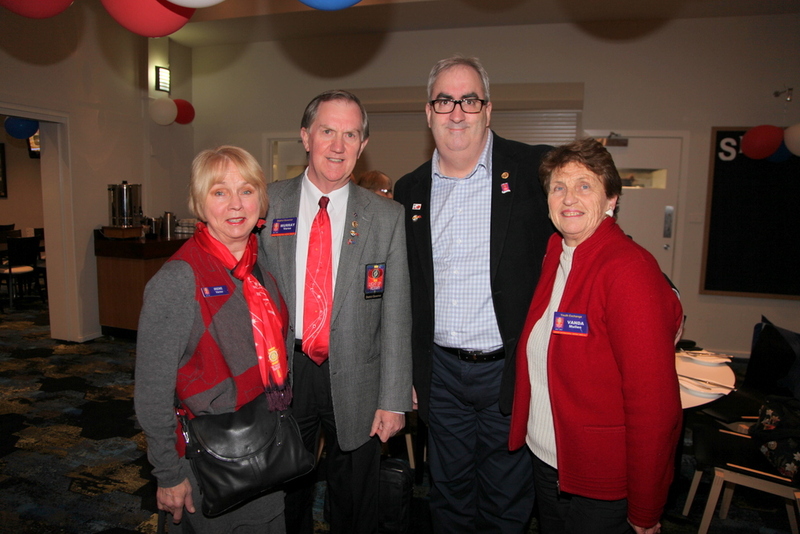 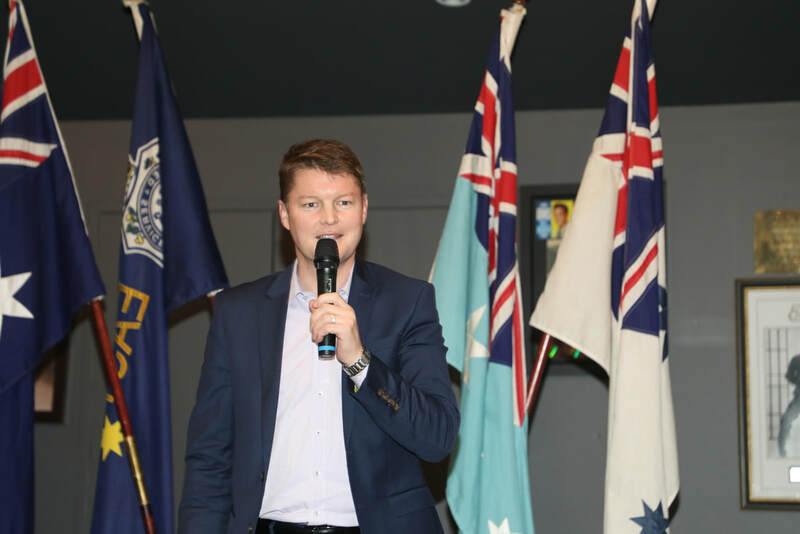 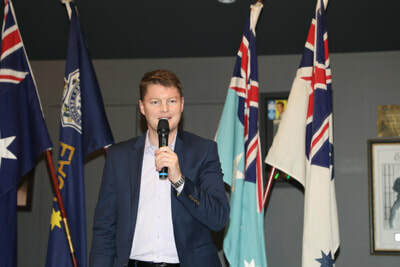 We had a great night celebrating Cup Eve on November 6th with our family and friends at Keilor East RSL. 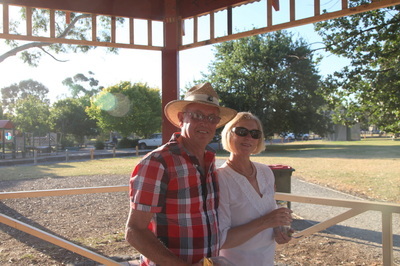 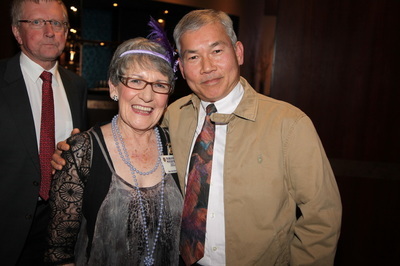 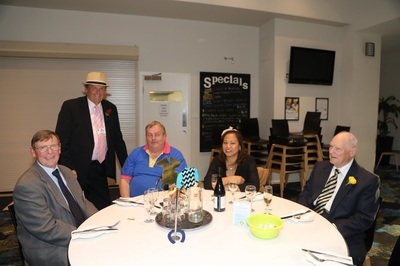 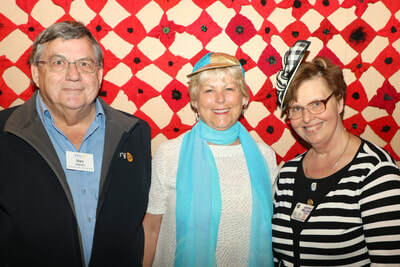 Many thanks go to Rotarian Annie Webb who organized the evening which had a black and white Ascot Races theme. Delicious food, champagne, Racing Trivia, a raffle, Cup Sweep etc. 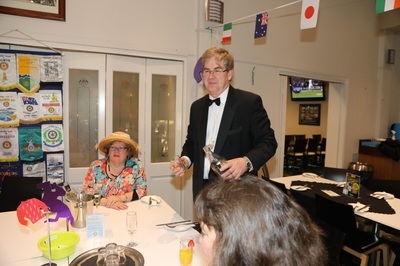 helped create a great atmosphere, making It a memorable evening for all. 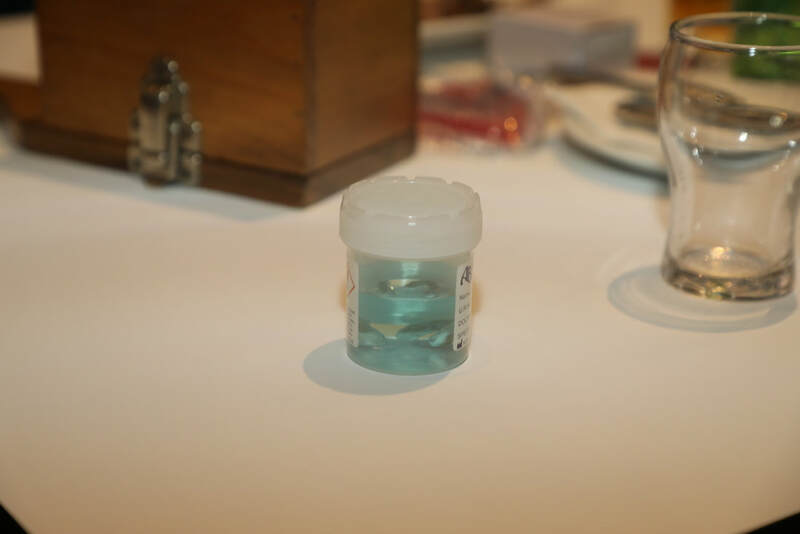 On Monday 30th October our President, Dr Ginny Billson, spoke about "What Pathologists do with our Bits". 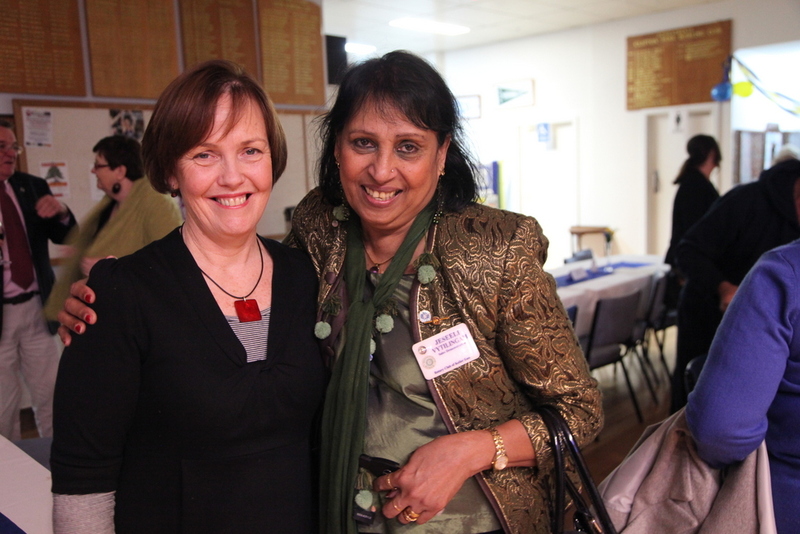 Ginny is a pathologist at the Royal Women's Hospital. She told us about the different branches of Pathology and gave us an insight into how slides are prepared to examine under the microscope. Tissue samples are preserved, sliced, waxed, dyed and laid onto glass slides. 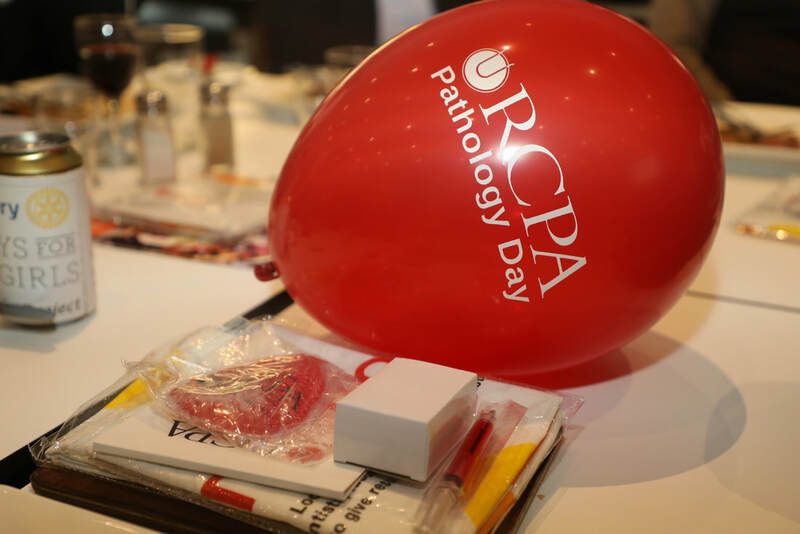 The Royal College of Pathologists of Australasia has an excellent website with links to YouTube videos of these procedures. 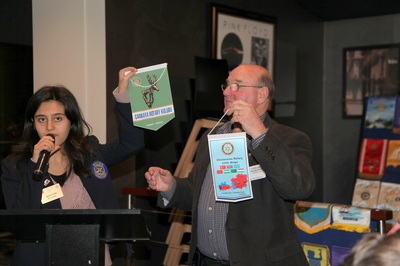 Ginny presented members with some promotional materials from RCPA. 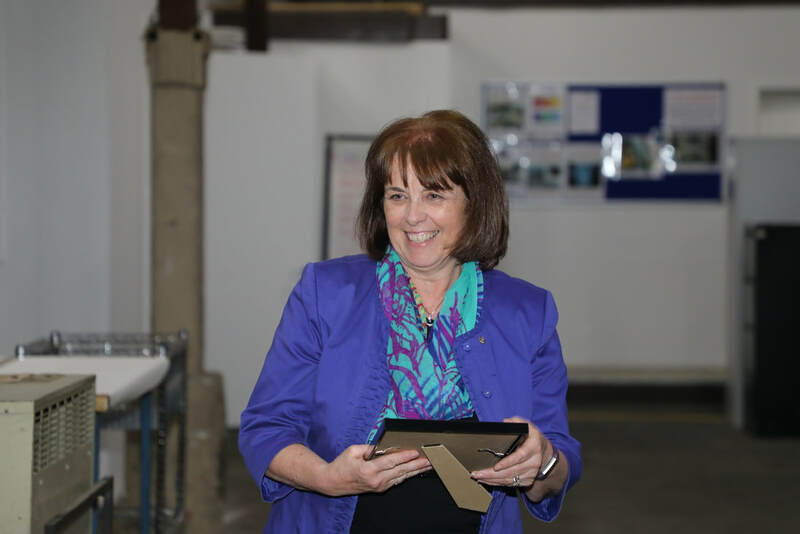 We thank Ginny for giving us a great insight to the intricacy of her work and that of Pathologists in general. 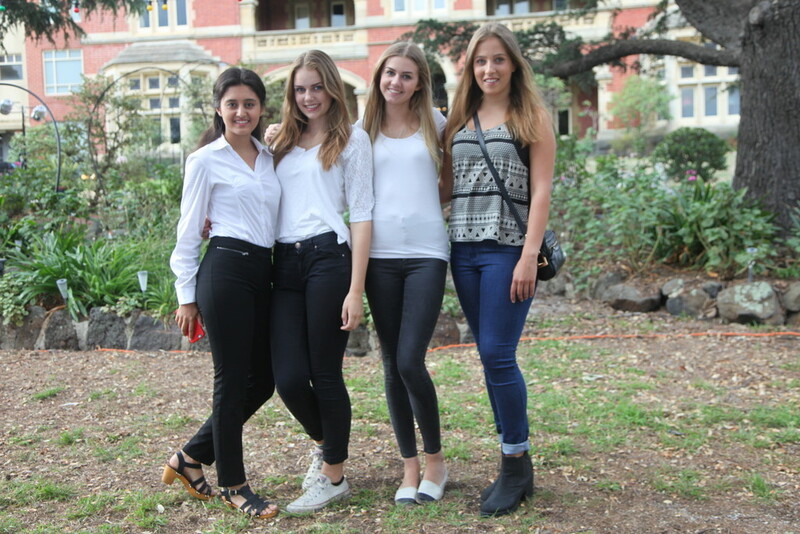 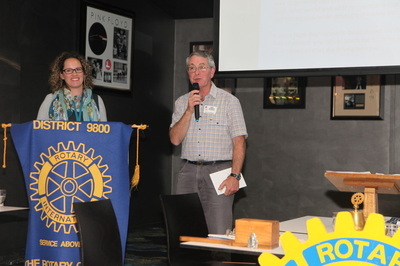 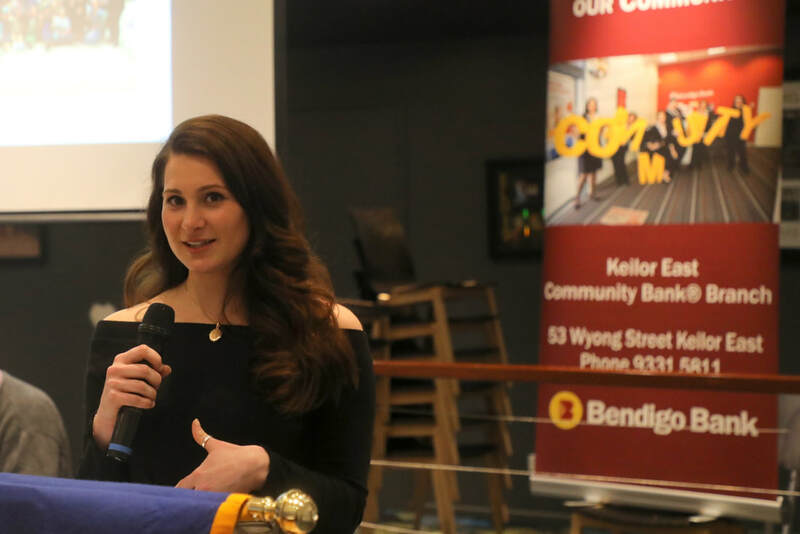 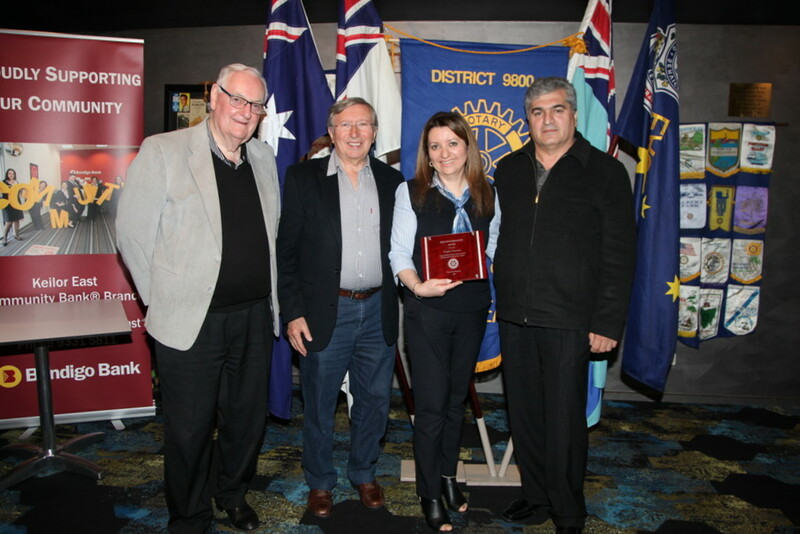 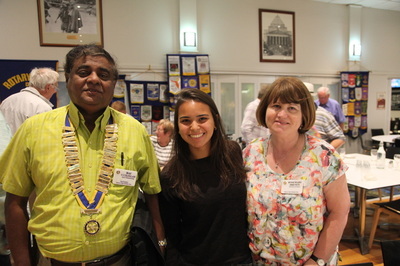 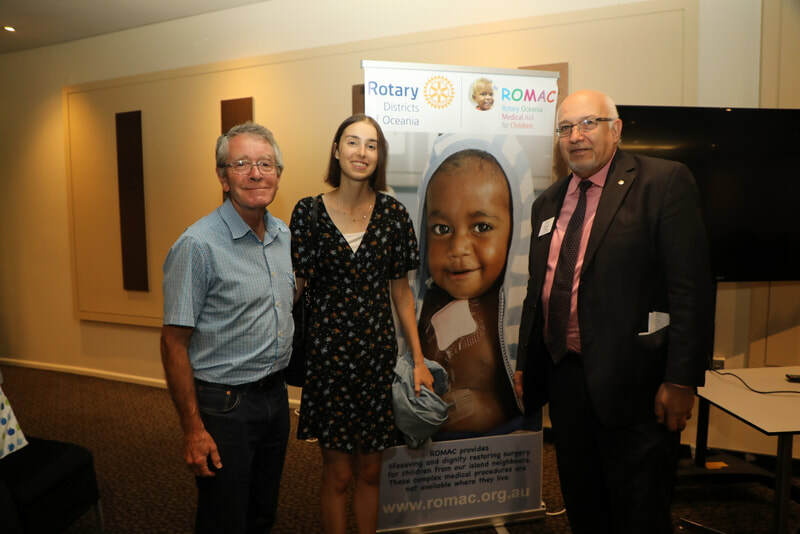 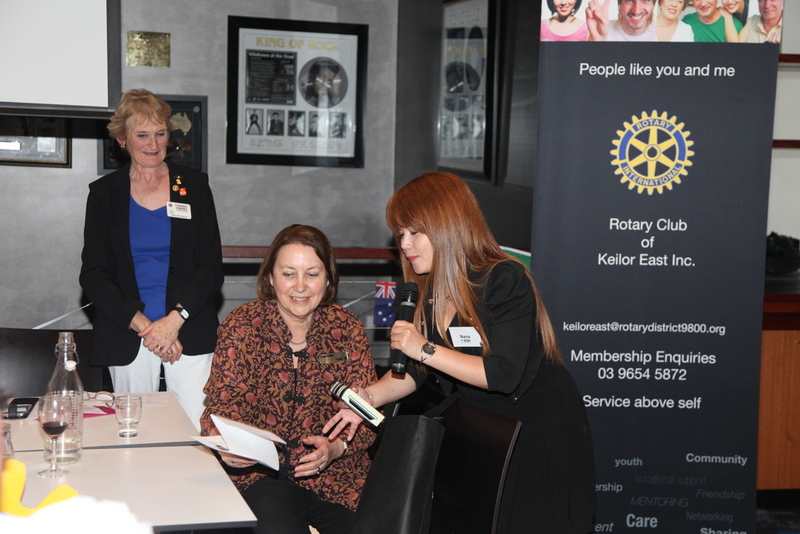 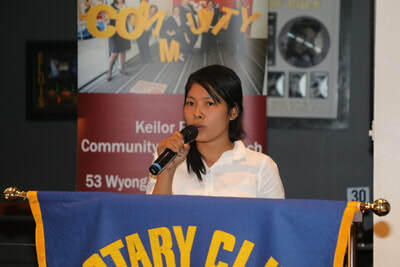 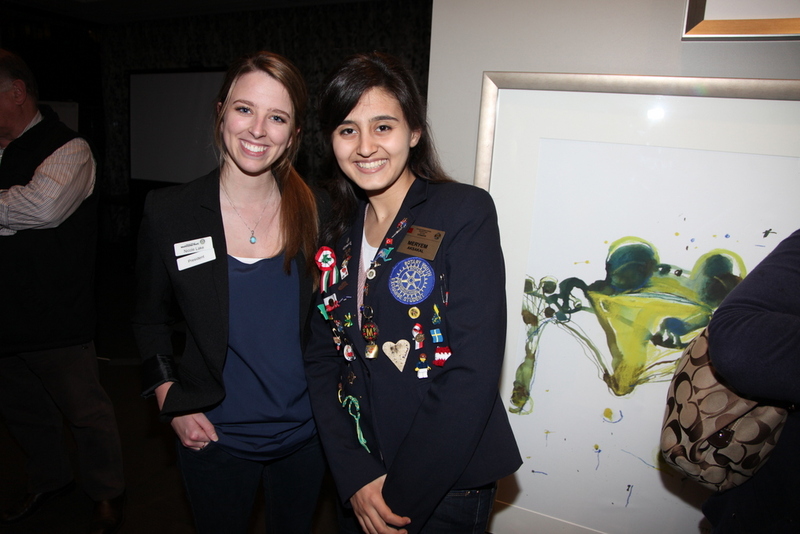 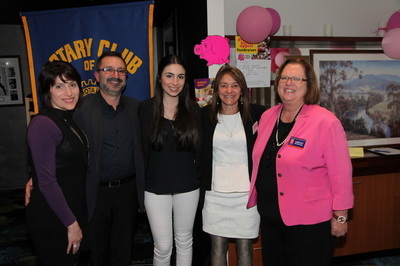 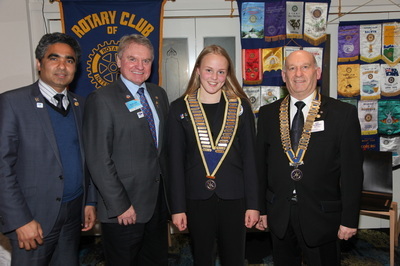 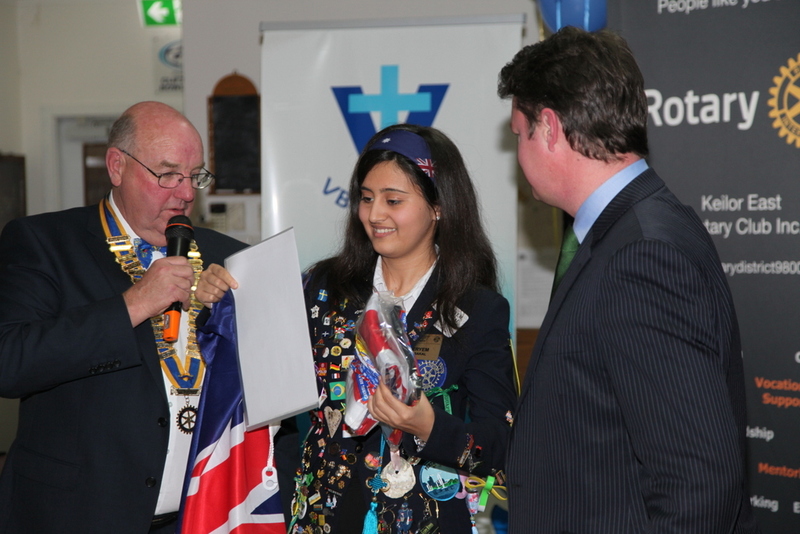 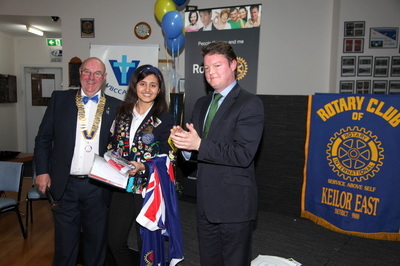 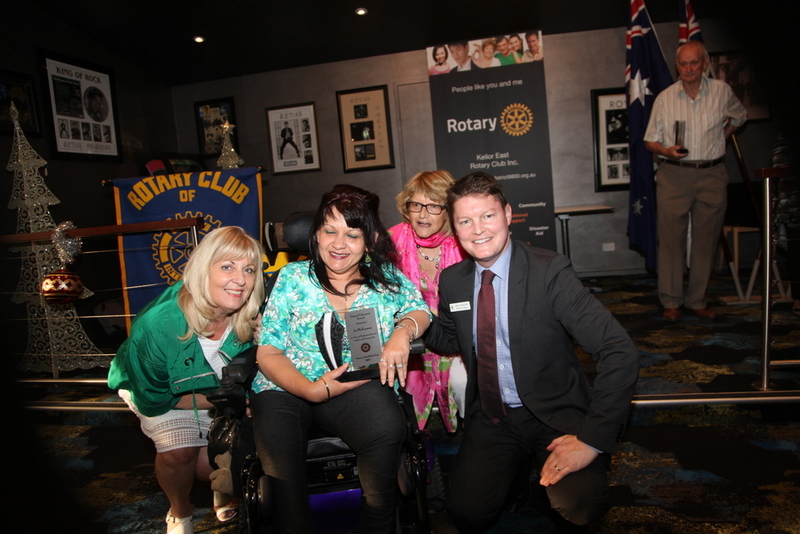 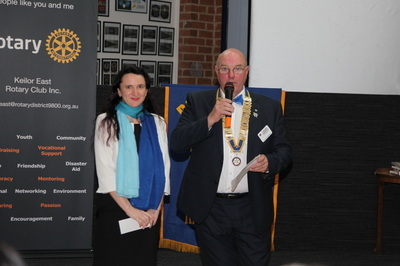 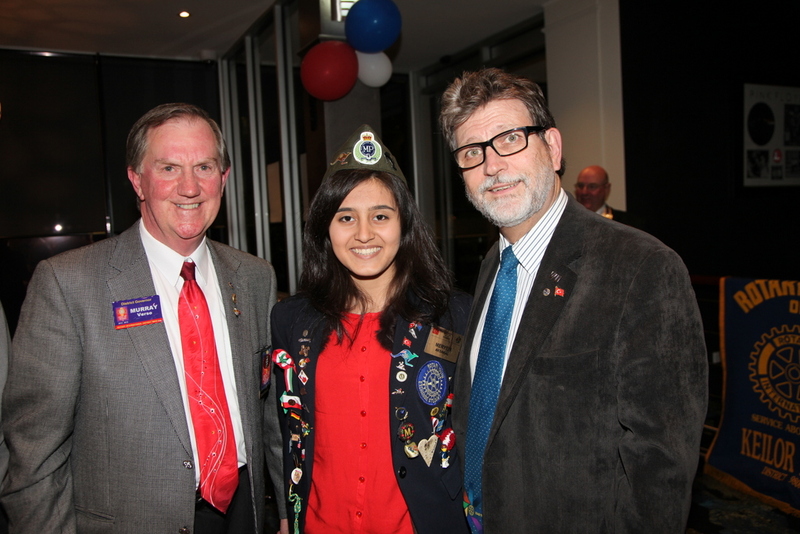 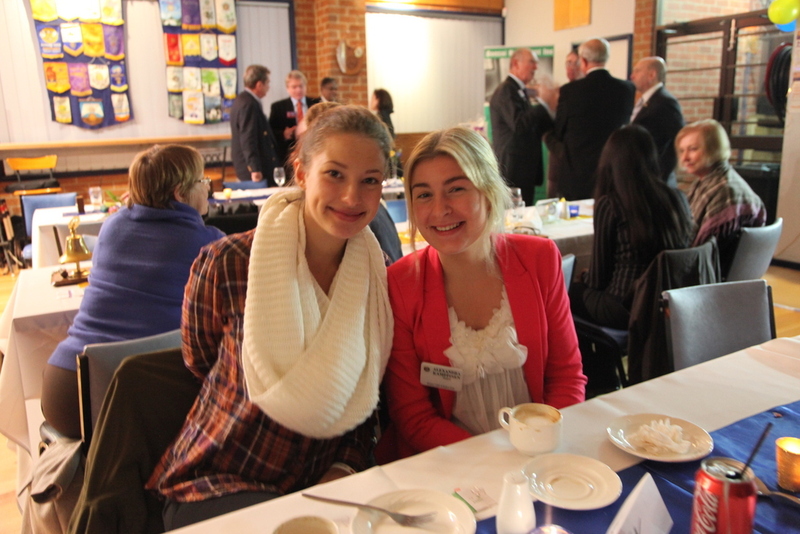 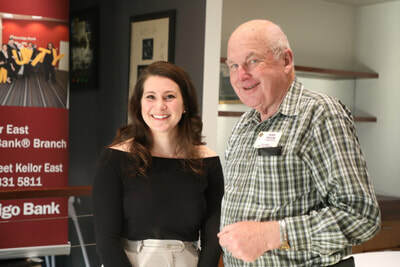 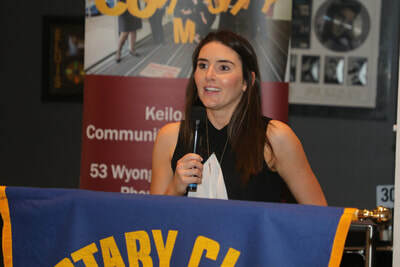 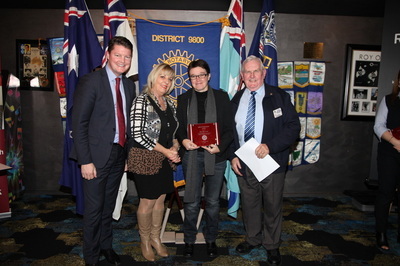 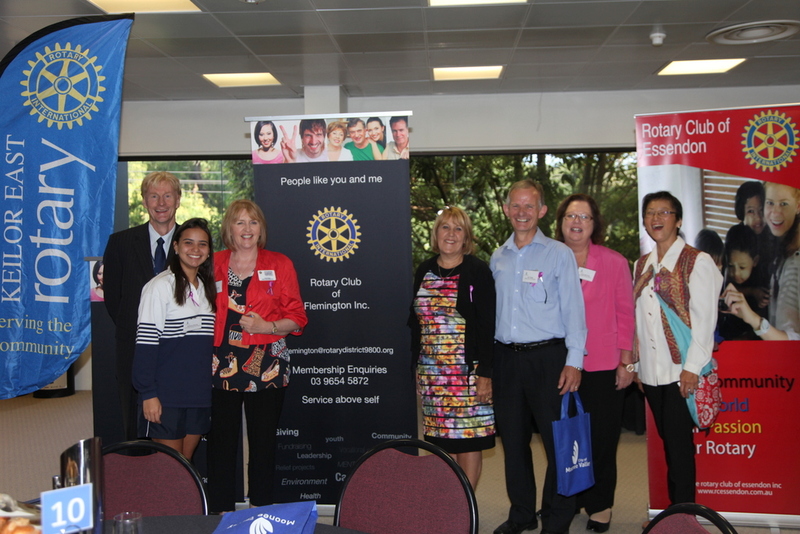 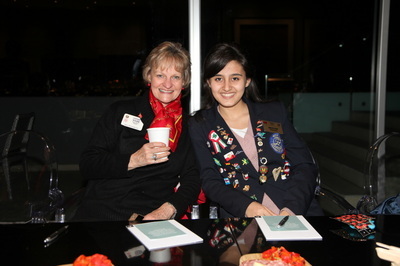 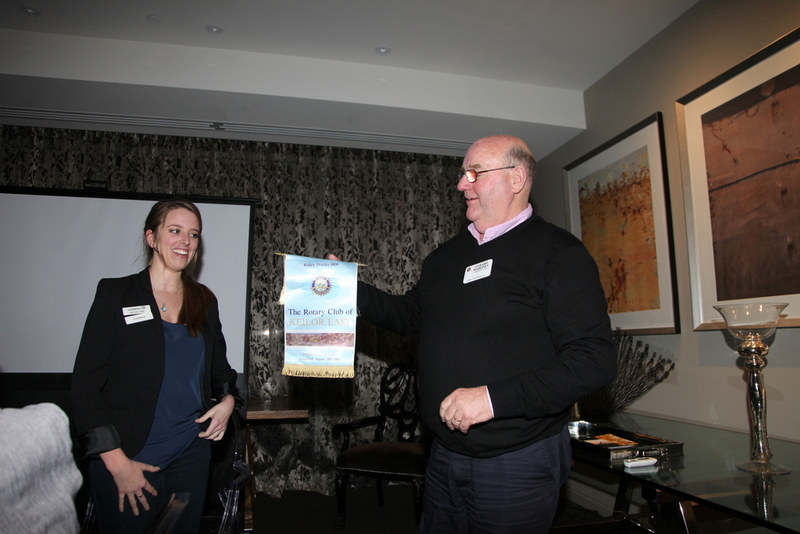 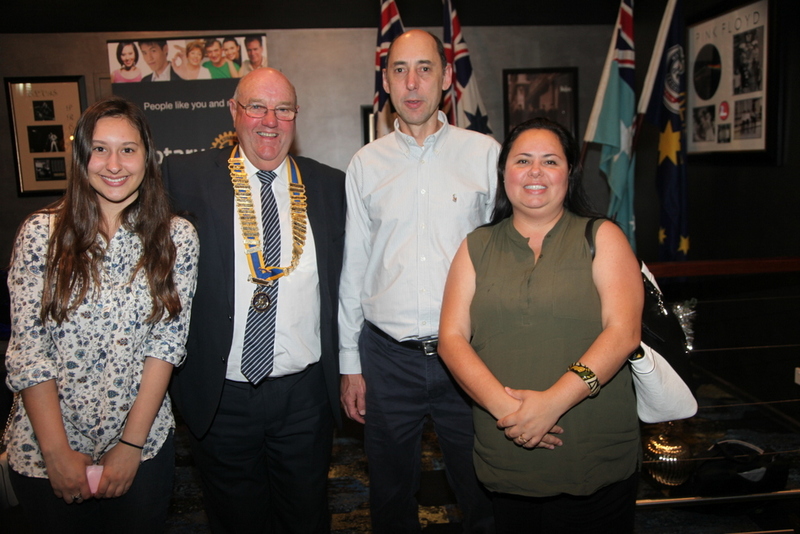 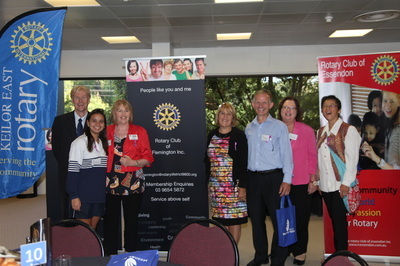 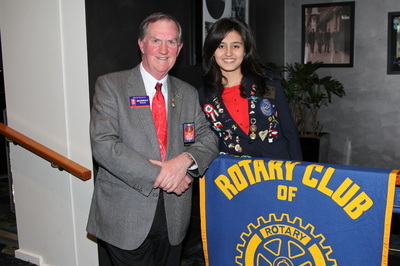 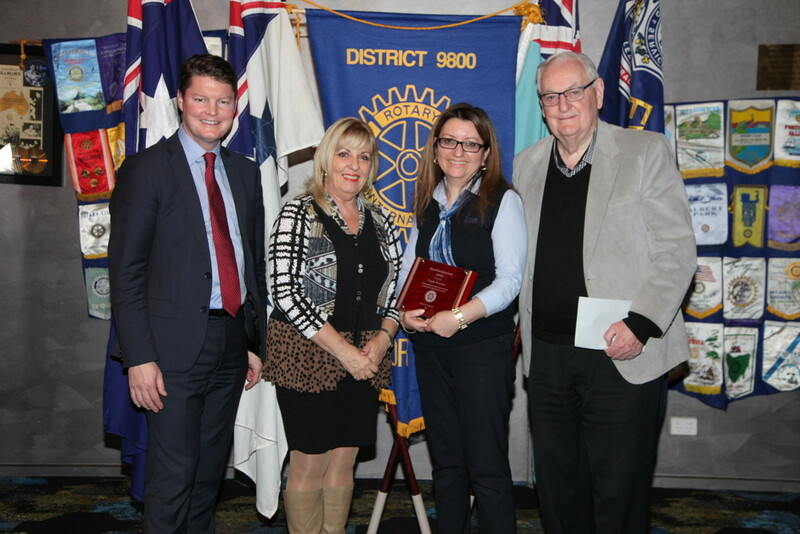 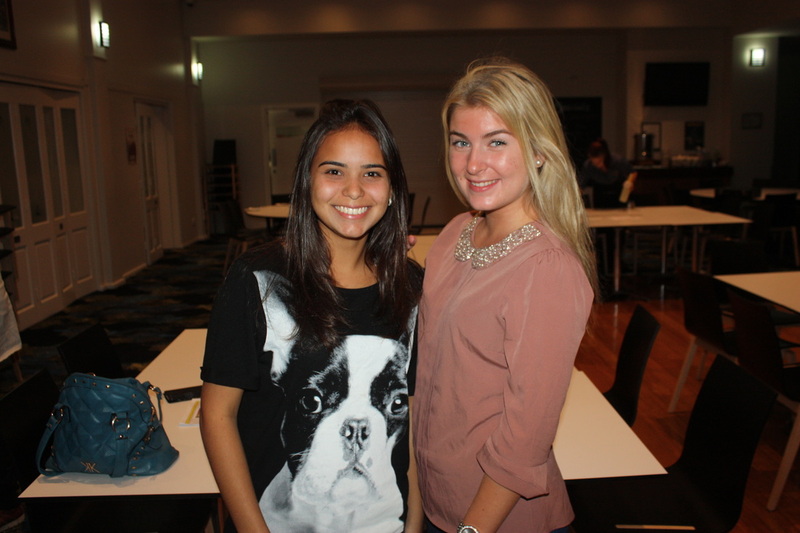 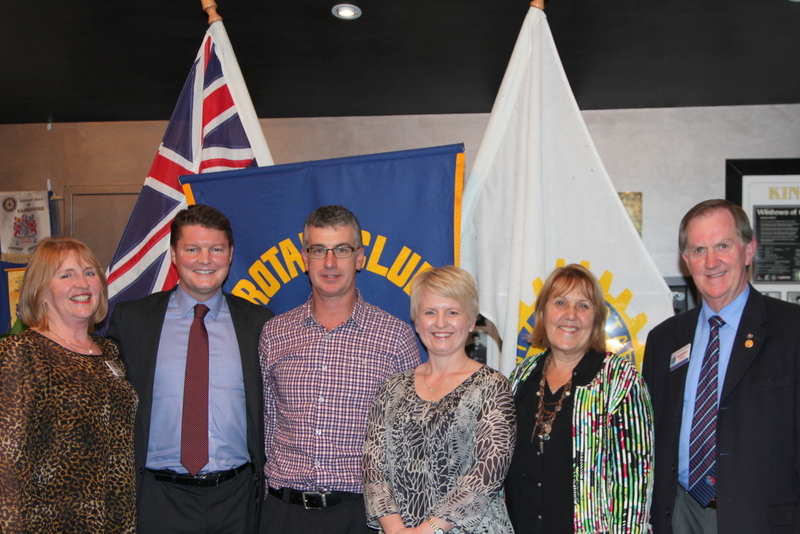 Caitlyn Rustem, a Marketing student from Victoria University, was our Guest Speaker at Rotary on Monday 23rd October. Caitlyn came back to tell us about her RYLA (Rotary Youth Leadership Award) experience last November and to thank us for giving her the opportunity of a lifetime. 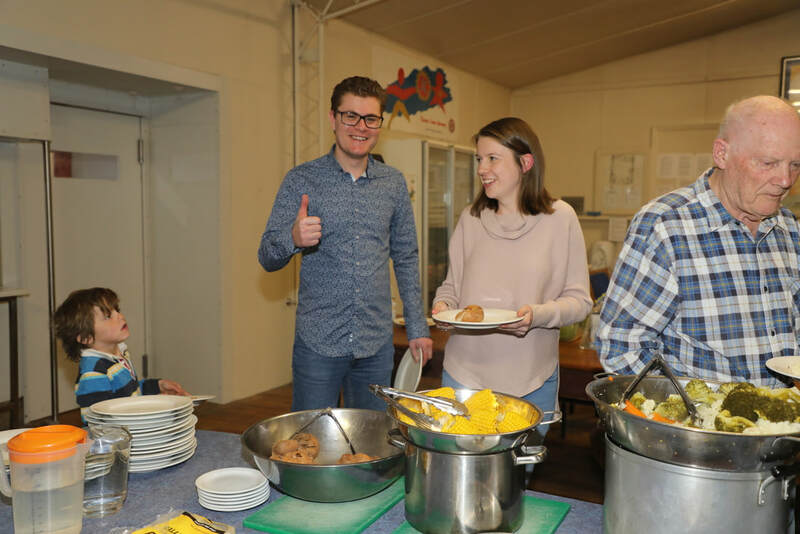 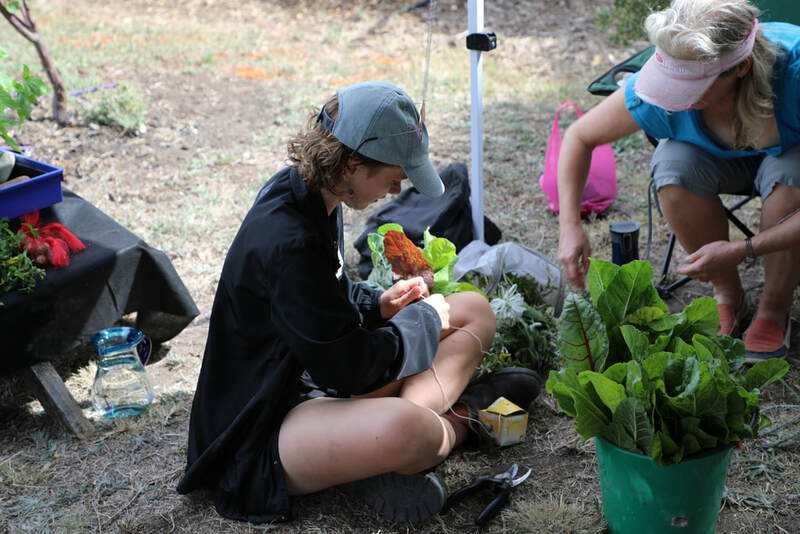 The week-long residential camp at Mt Evelyn provides self awareness, self confidence, goal setting and leadership building for 18-25 year olds. 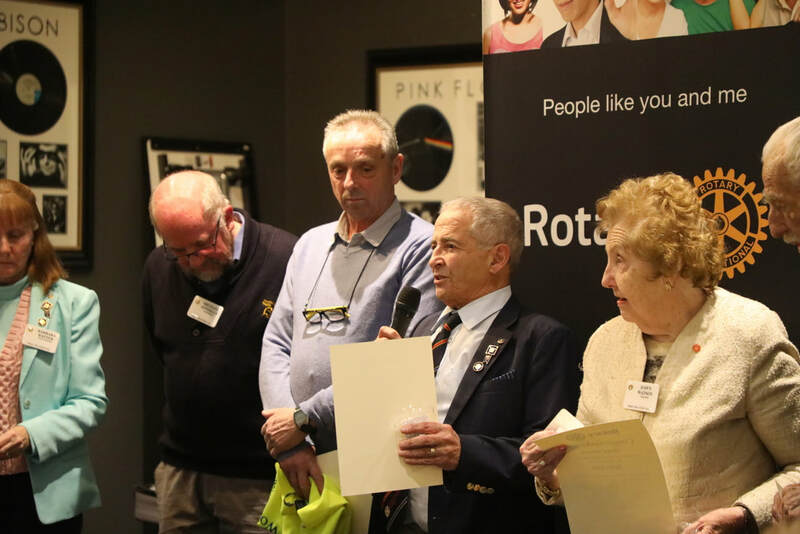 We already have a candidate for 2017 but we will be looking for more participants in future years. 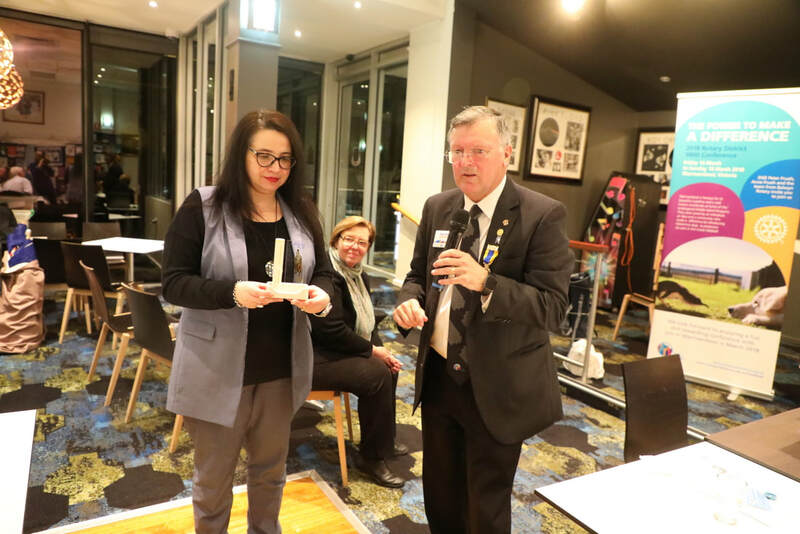 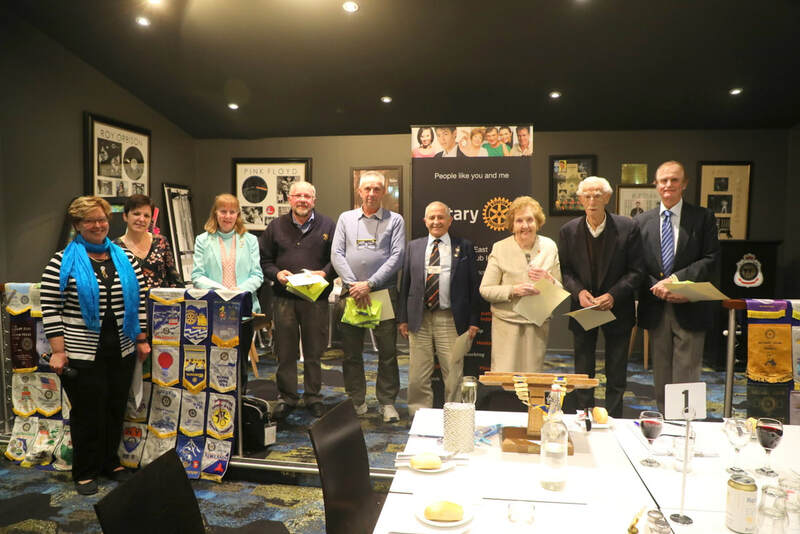 On Monday 18th September 2017 two new Members were inducted to Keilor East Rotary. 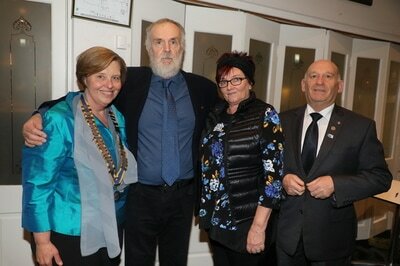 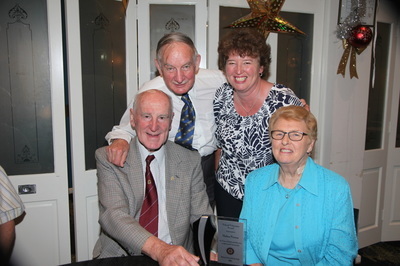 We warmly welcome Jo Sculli and Barbara McKeon and wish them both a long and happy association with our Rotary family. 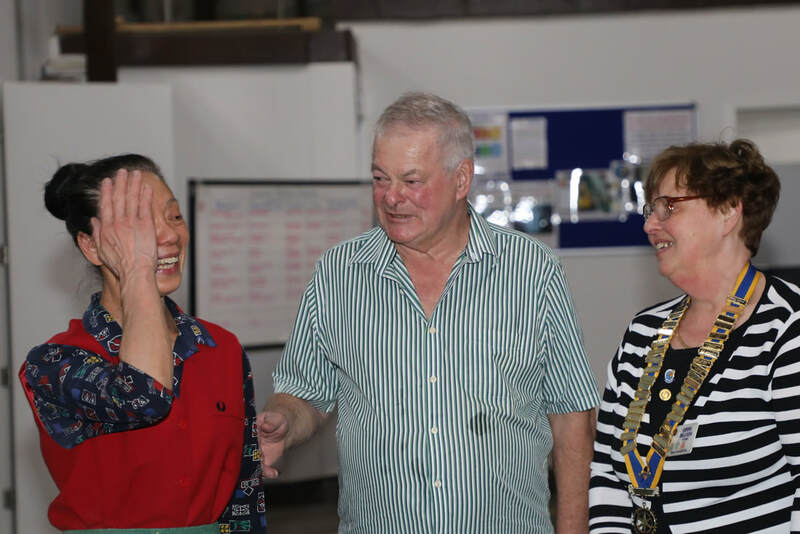 On Monday 7th August District Governor Peter Frueh and his wife Anne made their official visit to our Club. 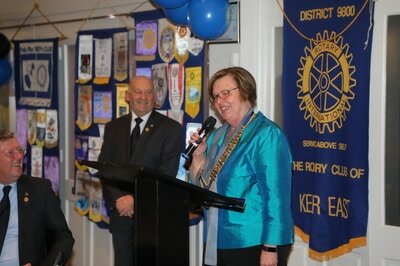 President Ginny Billson was the Chairperson for the evening. 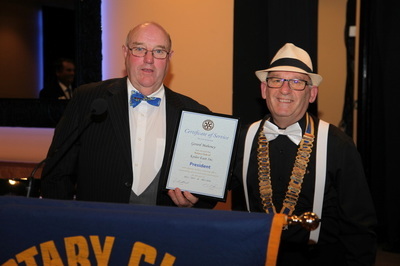 DG Peter spoke to our Club member, Daryl Cornish who joined us via Skype from Abu Dhabi in the UAE. 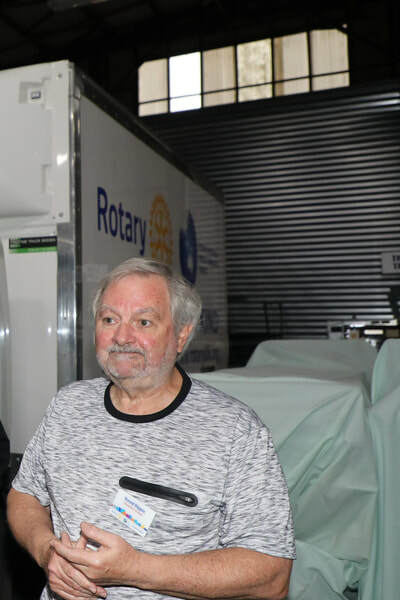 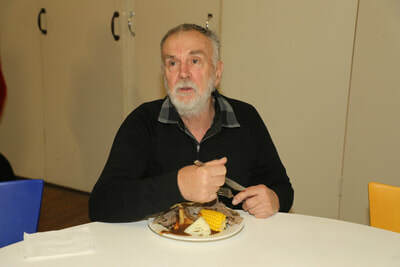 After the meal ( not chicken) Peter told us of his experiences as a new Rotarian, his friend's drive to collect linen destined for landfill and of his Membership goals for our Clubs. 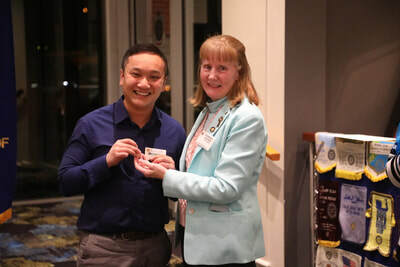 He presented Foundation Director Tina Ballos with a new device designed for Rotarians to conveniently save $100 in two dollar coins for a yearly Foundation contribution. 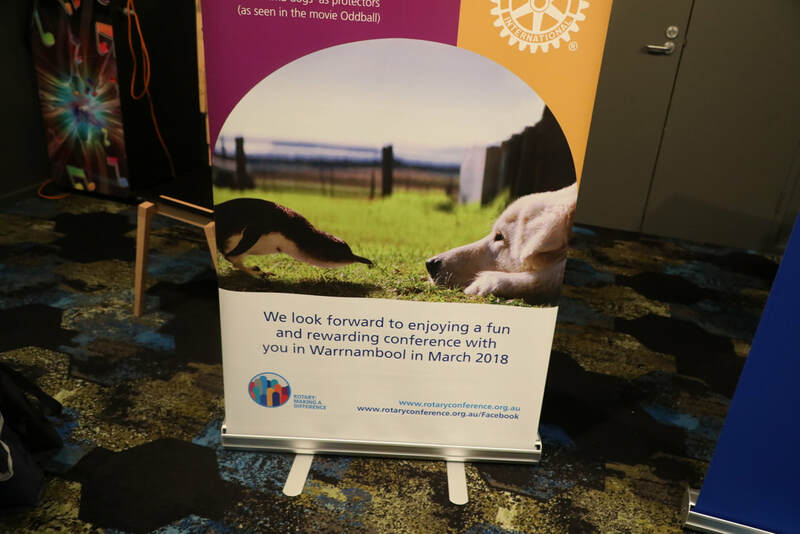 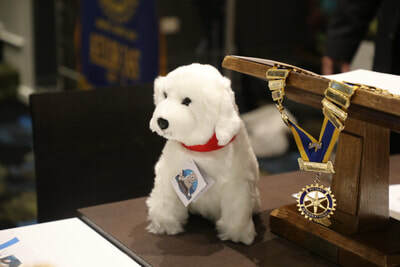 Peter also brought Oddball with him and told us of the District 9800 Conference at Warrnambool next year. 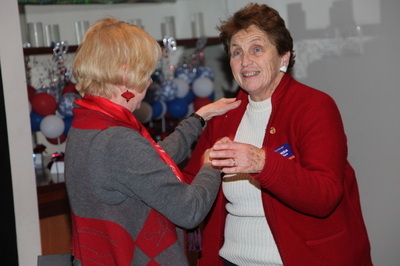 Anne presented Ginny with a native tree to plant. 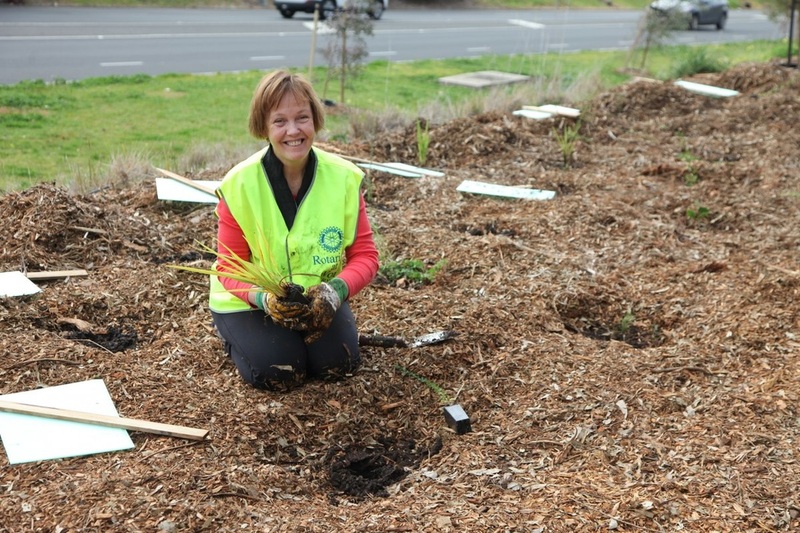 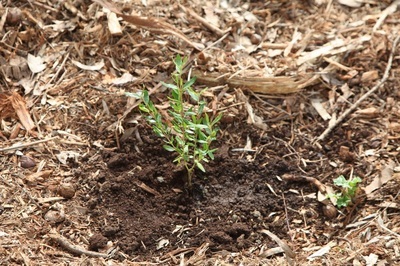 Her aim is to encourage District Clubs to do some tree planting during this Rotary year. 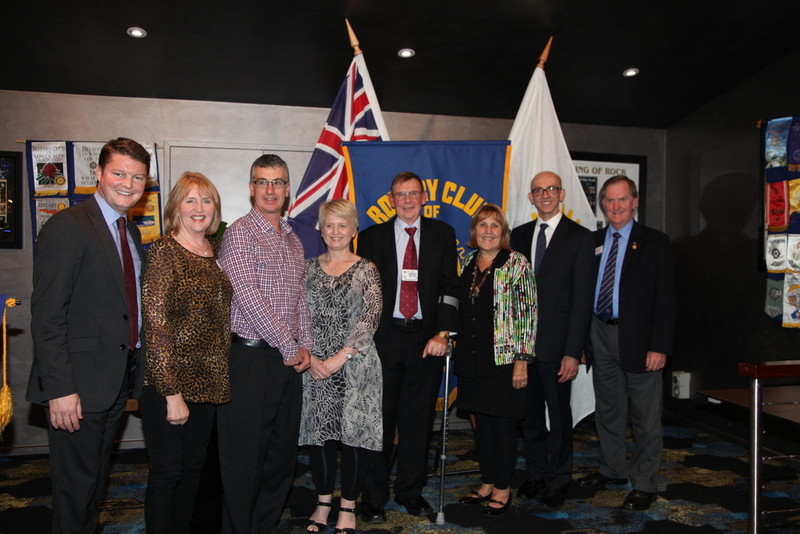 We thoroughly enjoyed Peter and Anne's visit and congratulate them upon their commitment to Rotary and "Making a Difference". 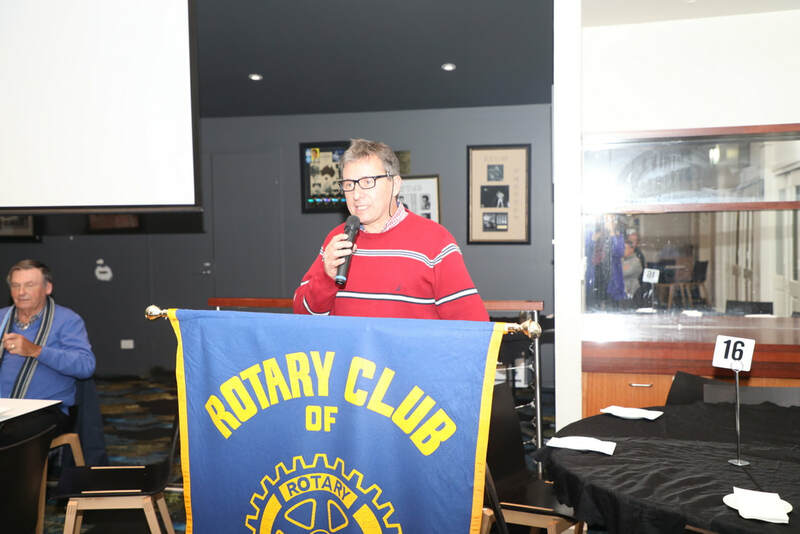 What has been happening at our Club? 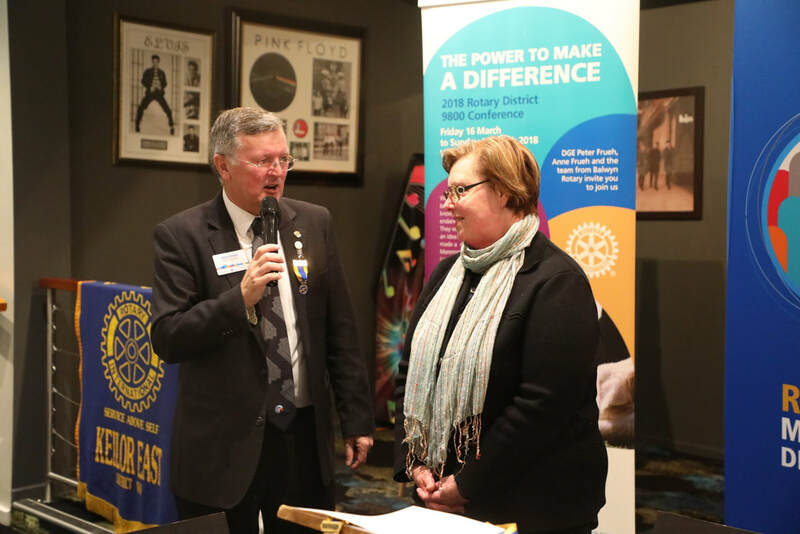 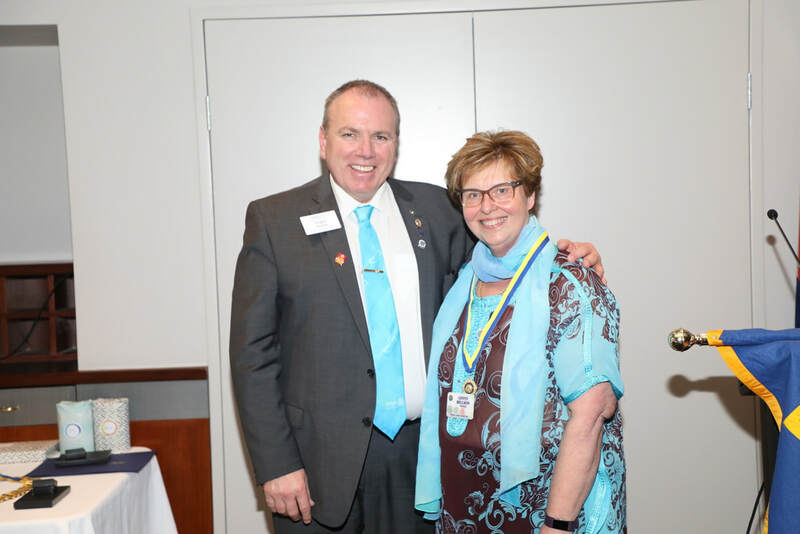 We are celebrating the start of a new Rotary year, 2017-2018, with a new Club President, Dr. Ginny Billson. 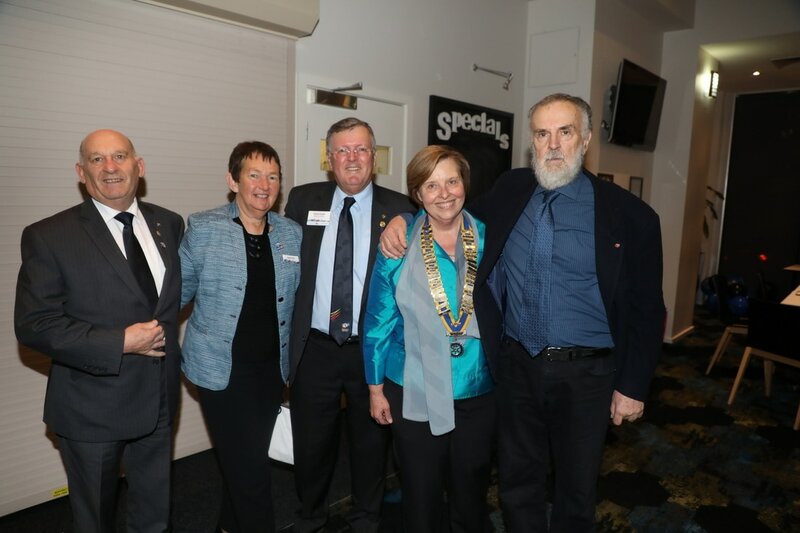 The President Changeover Night was held on Monday 26th June 2017 at the Keilor East RSL. 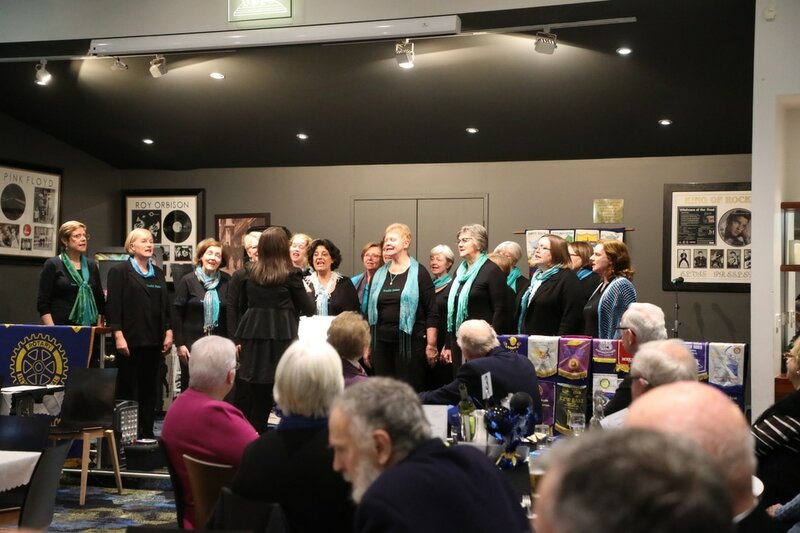 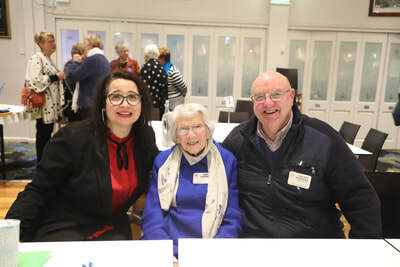 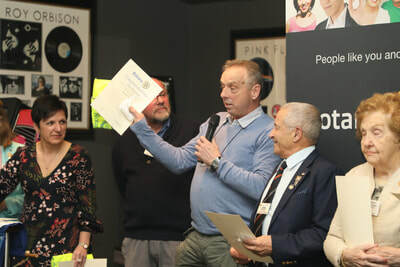 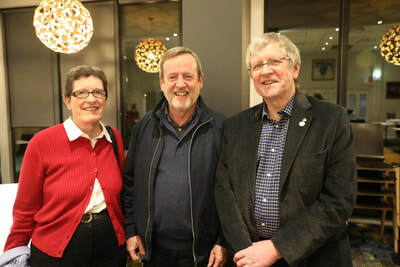 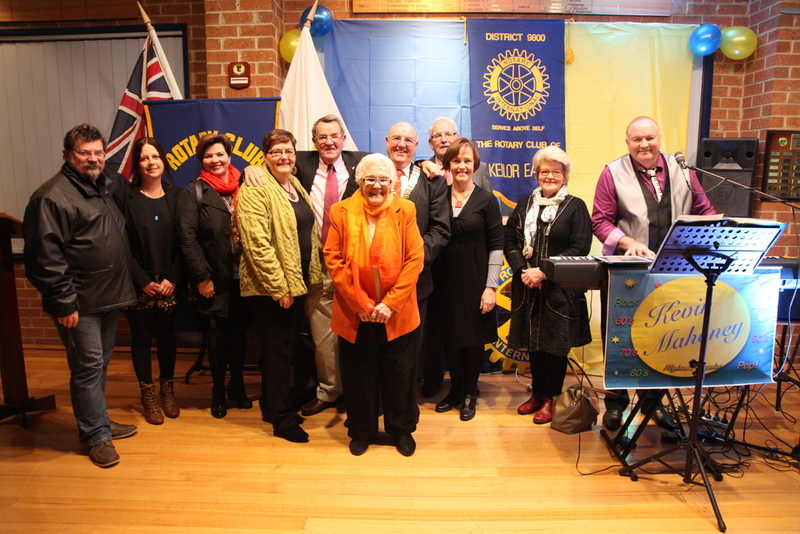 It was attended by our newly inducted District Governor, Peter Frueh and his wife Anne, Club Members and Partners, Ginny's friends and members of musical trio, "Leap of Faith". Entertainment was also provided by the choir, of which Ginny is a member, "Souffle Sisters". Past President Joe Albioli passed the Presidential chains, Club Charter and Trestle Bridge painting to Ginny who then spoke of her three main goals before presenting her new Club Board. Congratulations and very best wishes to all for another great year at Keilor East Rotary. 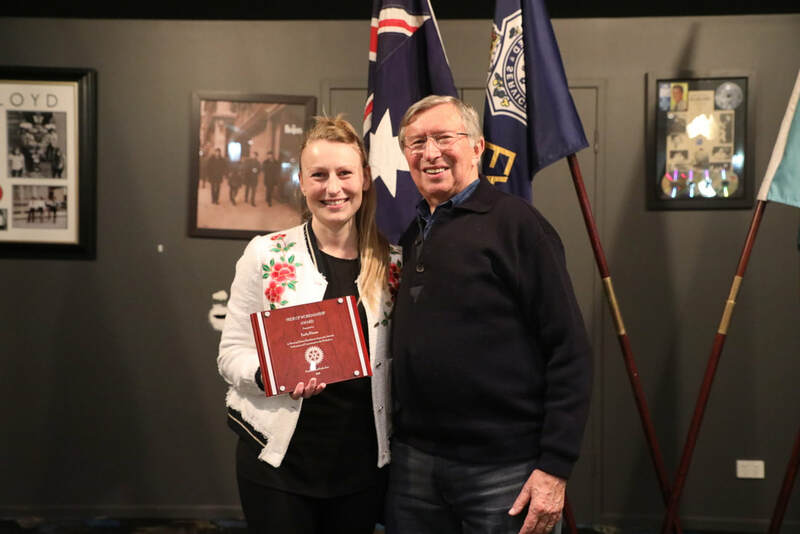 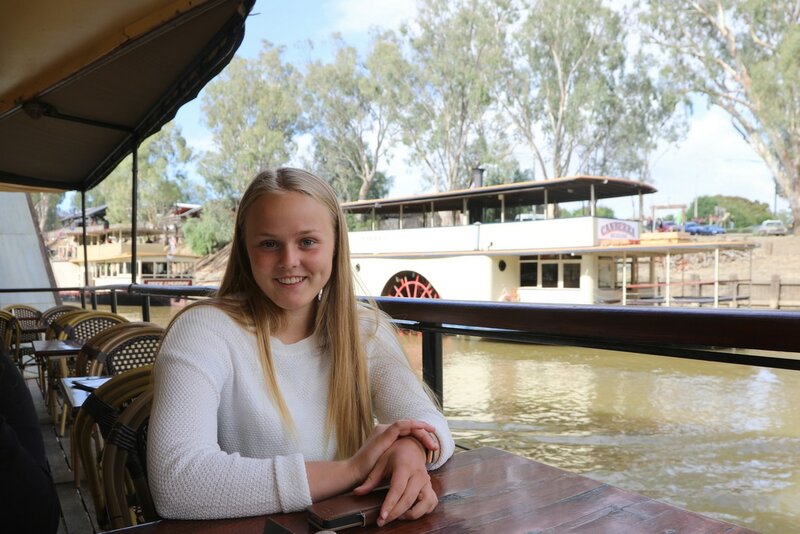 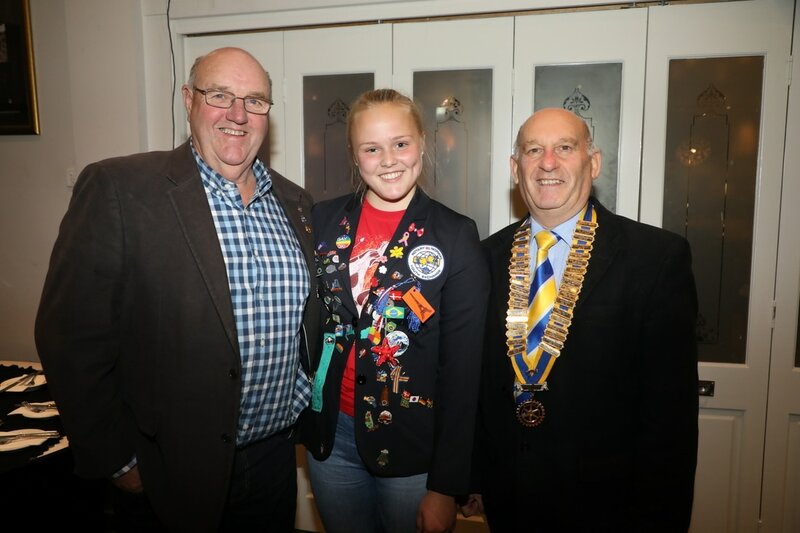 A year rolls by quickly and it is time for our lovely Norwegian Rotary Youth Exchange Student, Elise Marie Pettersen, to return home.On Monday June 5th Elise gave us a presentation about her year in Australia. 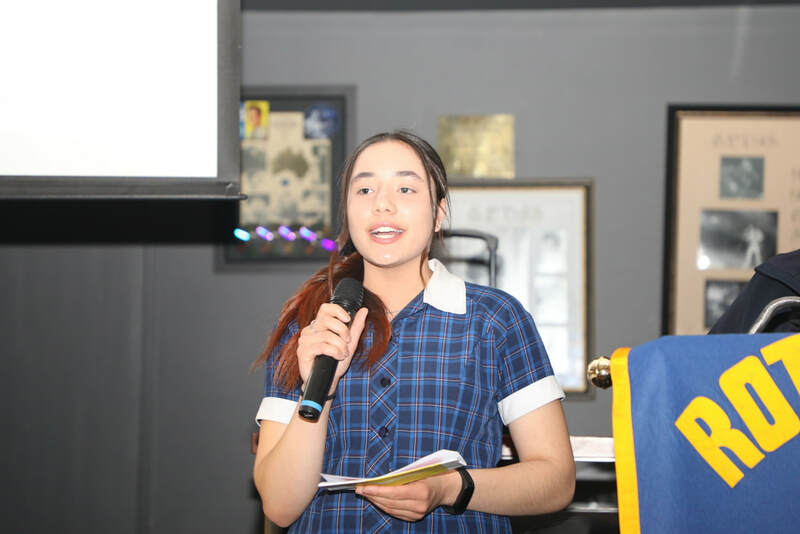 It was very clear that she had grown in confidence during the year and she seemed comfortable with public speaking and answering our questions. 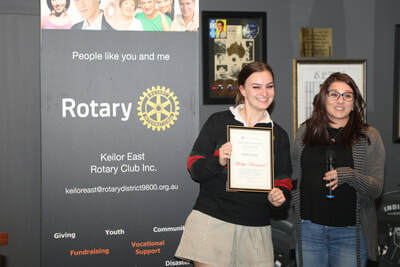 We congratulate her on the effort she has made in overcoming shyness and in her dedication to her studies, enabling her to continue her senior years at school without repeating a year as is often necessary. 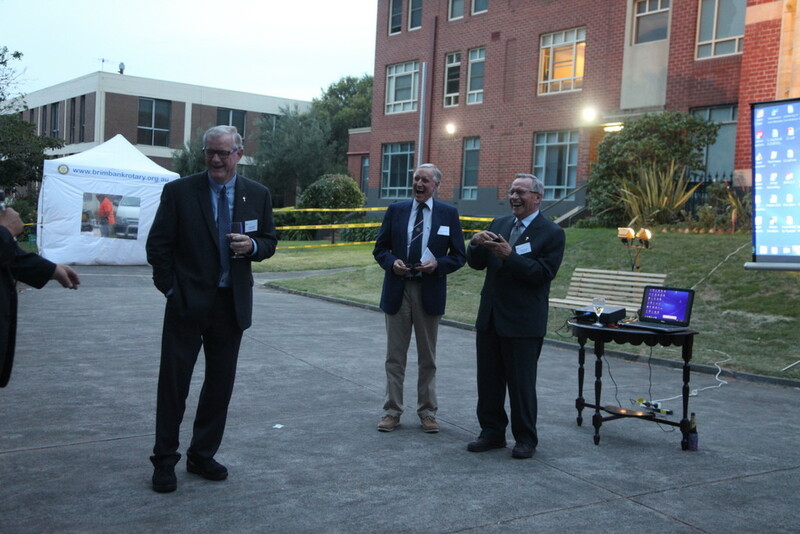 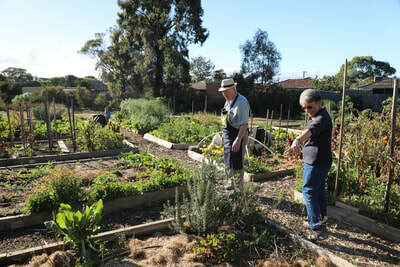 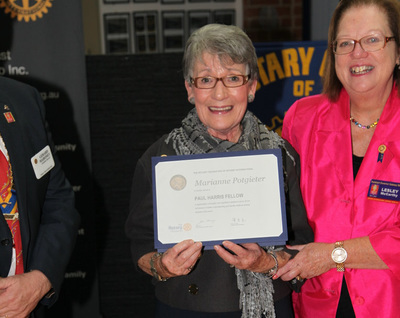 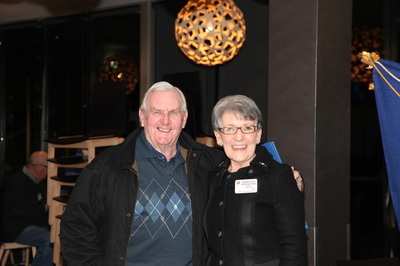 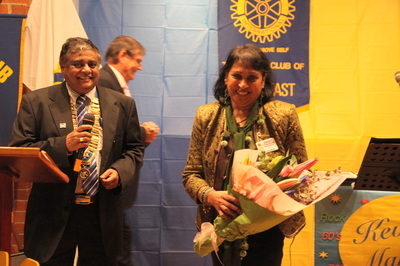 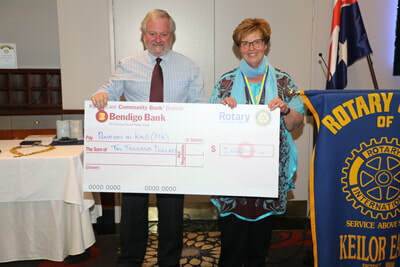 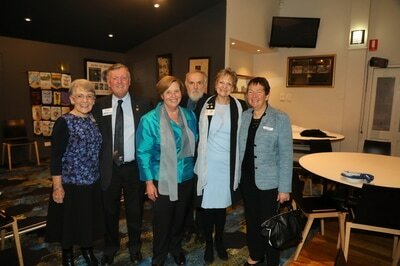 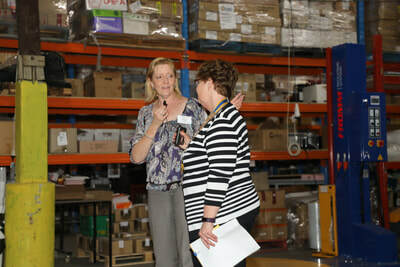 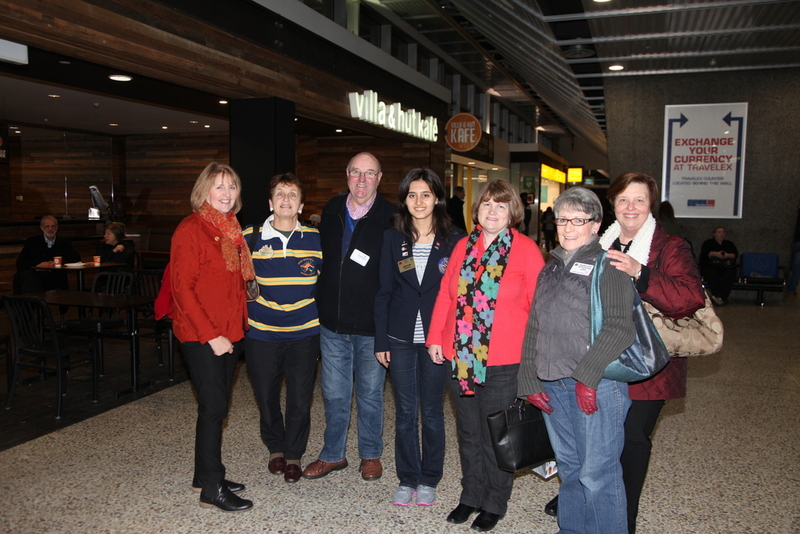 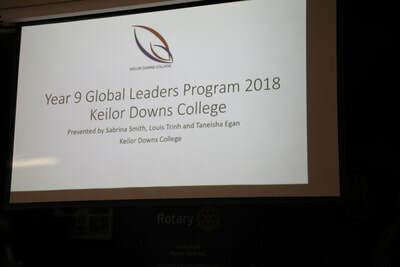 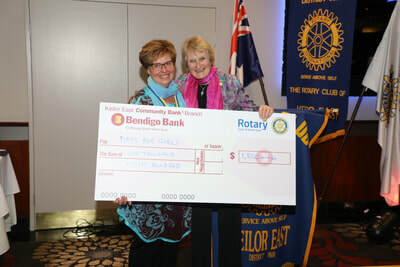 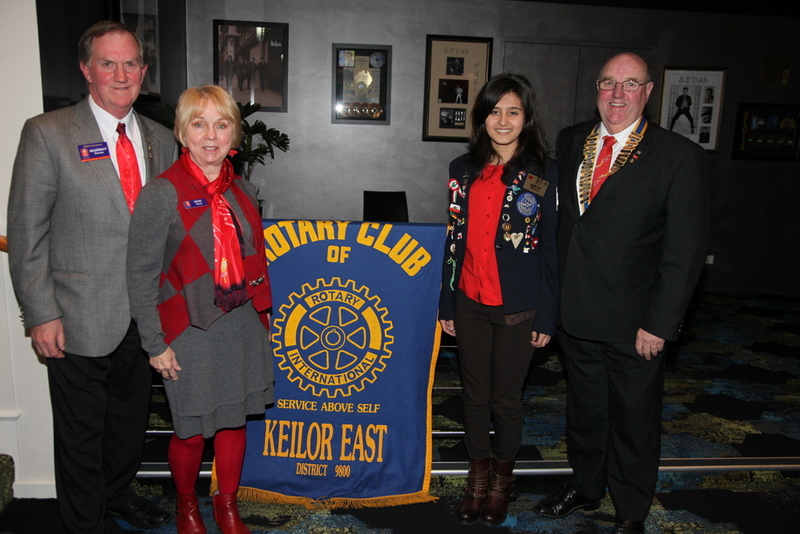 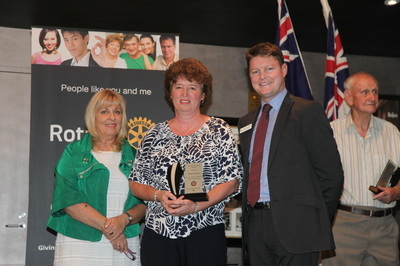 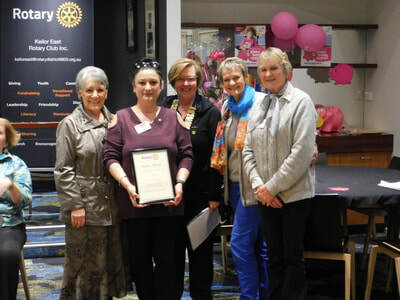 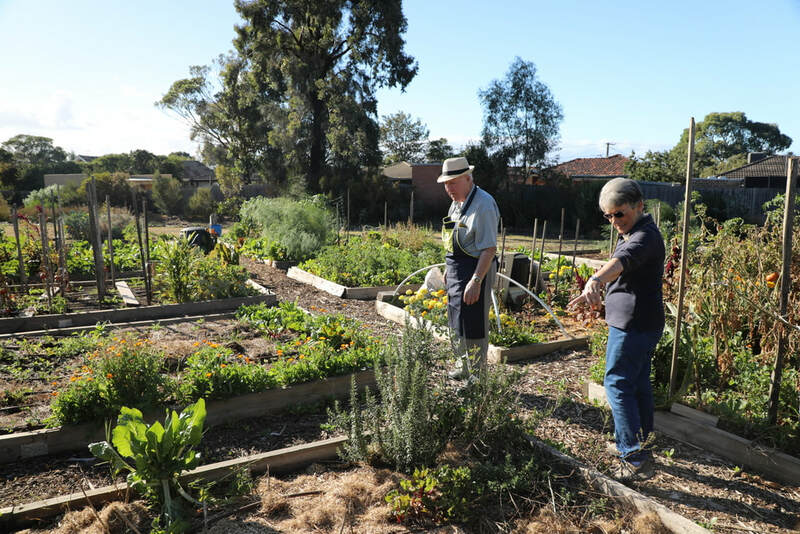 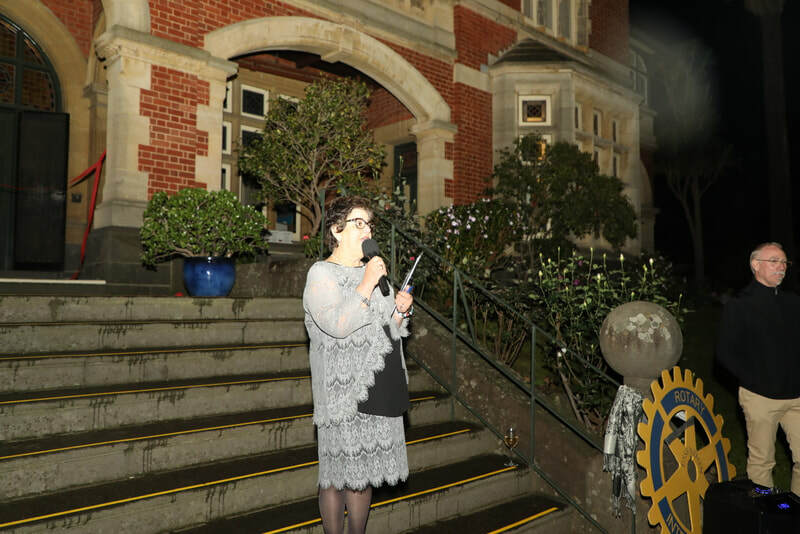 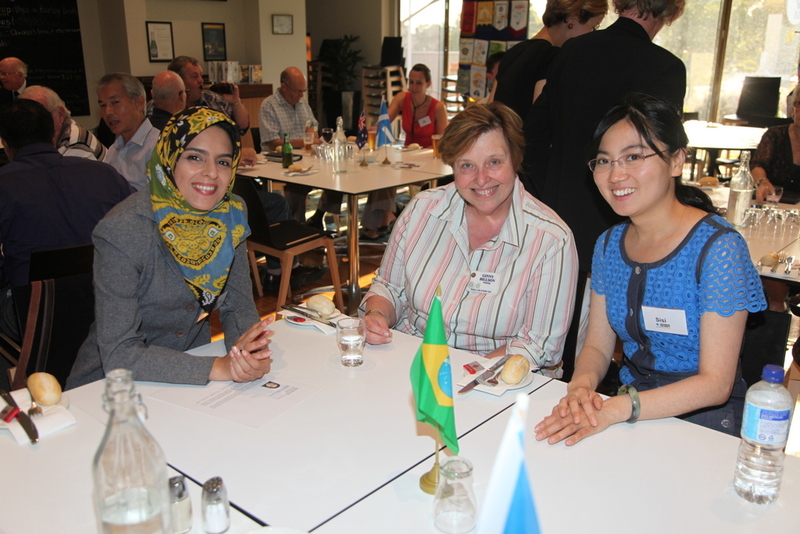 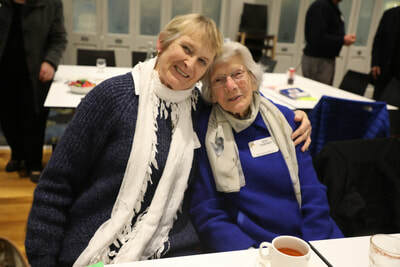 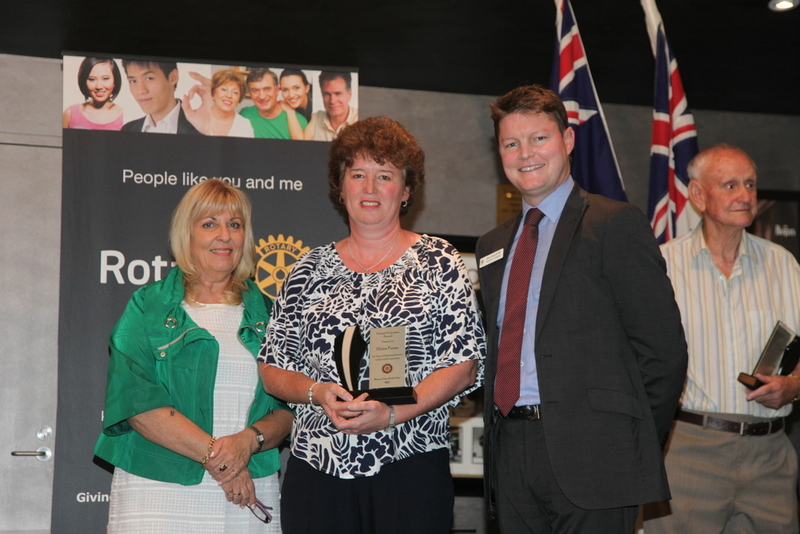 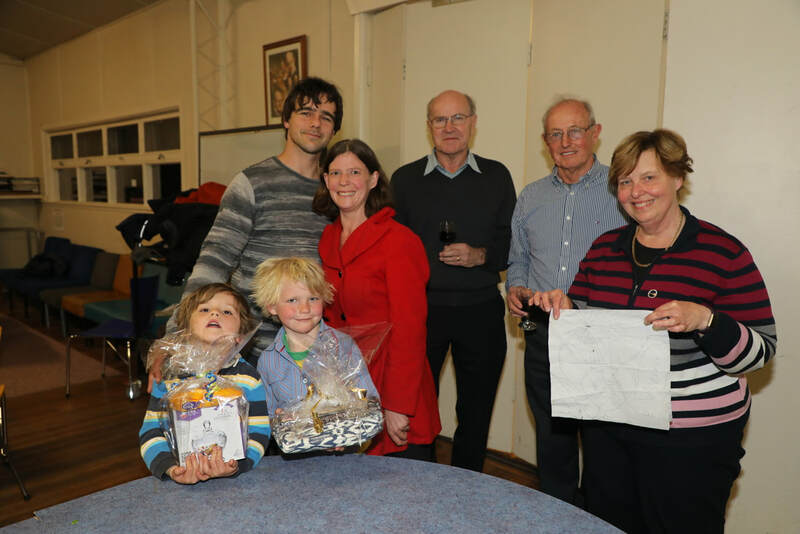 We have enjoyed hosting her, in conjunction with the Rotary Club of Keilor. 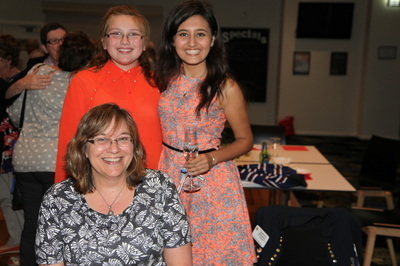 We will miss her beautiful smile and her friendly, helpful and organized nature. 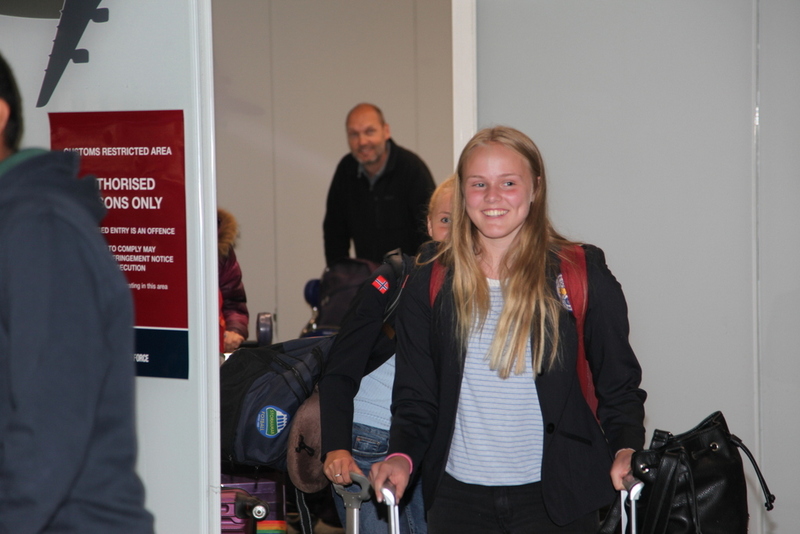 We wish her all the very best for her homecoming and her next two years at school in Norway.We hope that she will come back and visit us in the future. 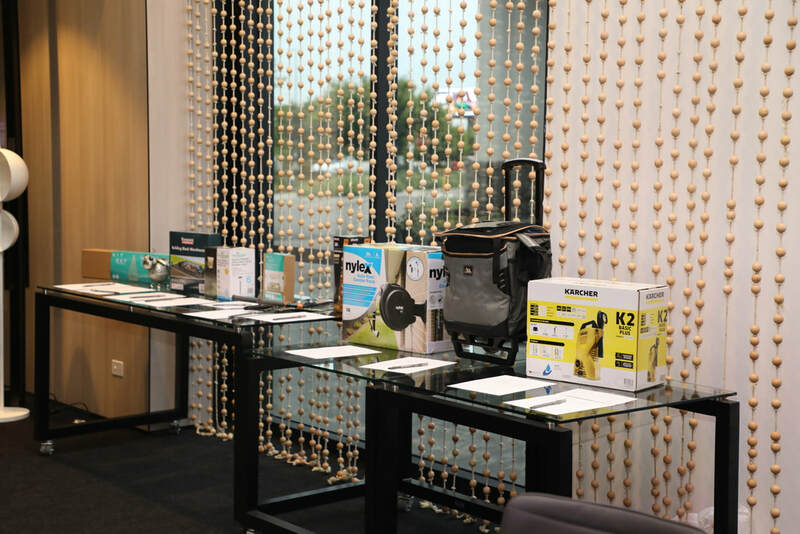 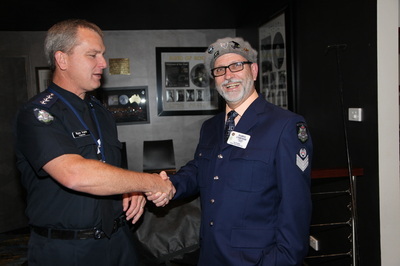 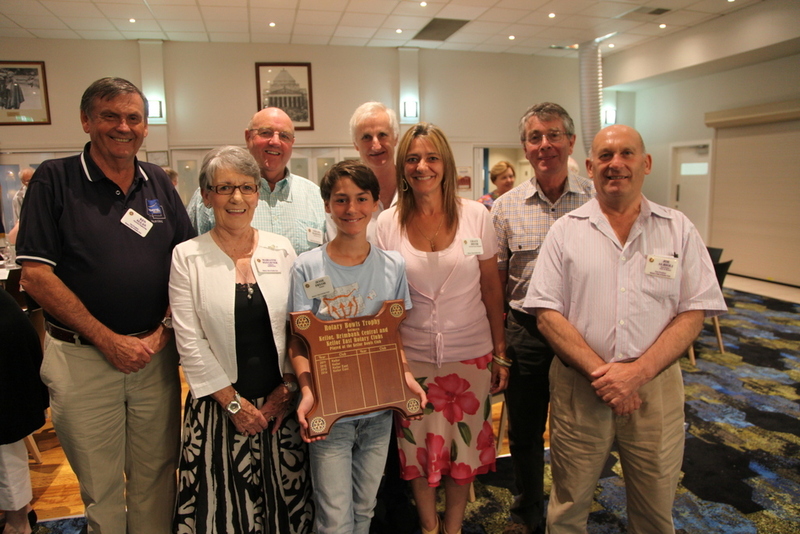 On Monday May 22nd our Club held its annual "Pride of Workmanship" recognition awards. 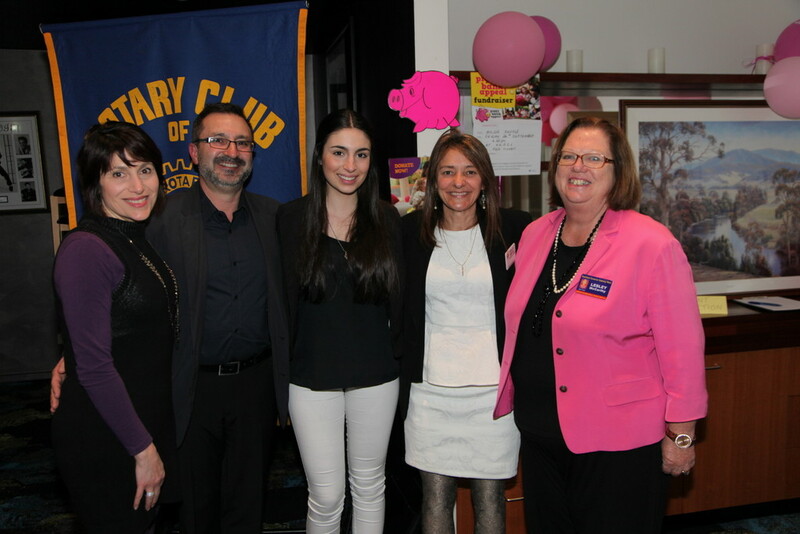 Jeremy Dean and Aysu Demir were nominated by Nancy Crupi of YPA Real Estate and Bruce Cameron OAM nominated Ian Shaw of Duhig Ford. 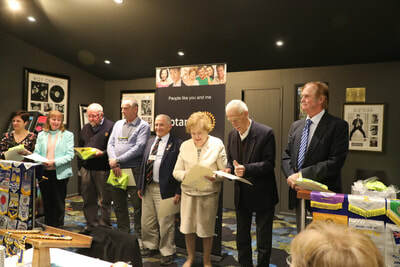 The trophies were presented by Mr Ben Carroll, MP for Niddrie.The evening also featured the presentation of Paul Harris recognitions for Past President Bob McMartin and Past Secretary Annie Webb. 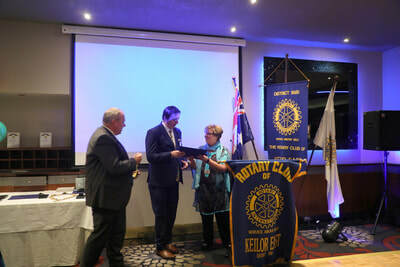 The Paul Harris pins, medallions and certificates were also presented by Ben Carroll who is an Honorary Member of our Club. We congratulate all awardees and wish them every success in their careers and in Rotary service. 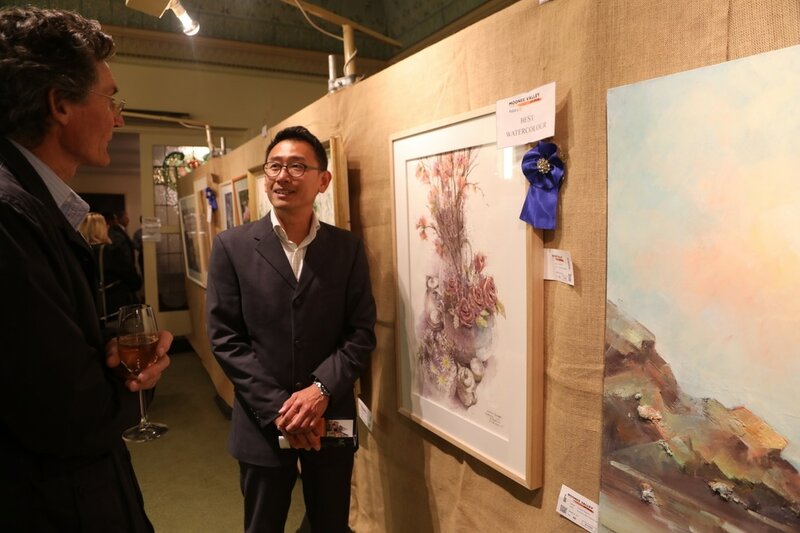 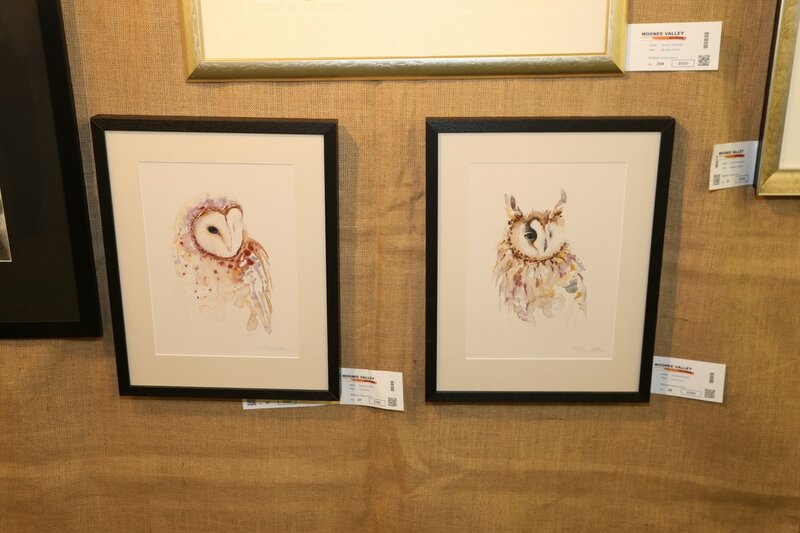 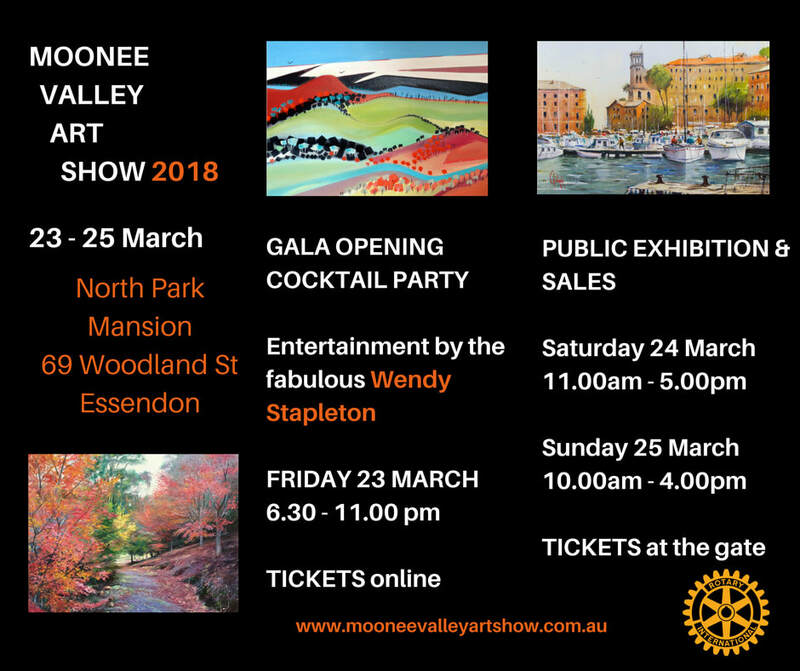 On April 24th, 25th and 26th 2017 we held the Moonee Valley Art Show in conjunction with the Rotary Club of Essendon. This was our third such event and this year's was a great success. We were pleased with great weather, entertainment, craft stalls and magnificent artworks. 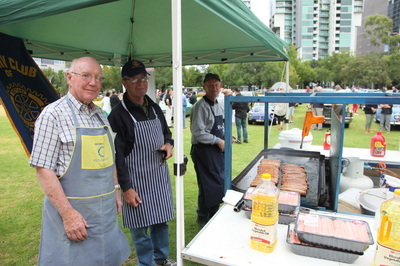 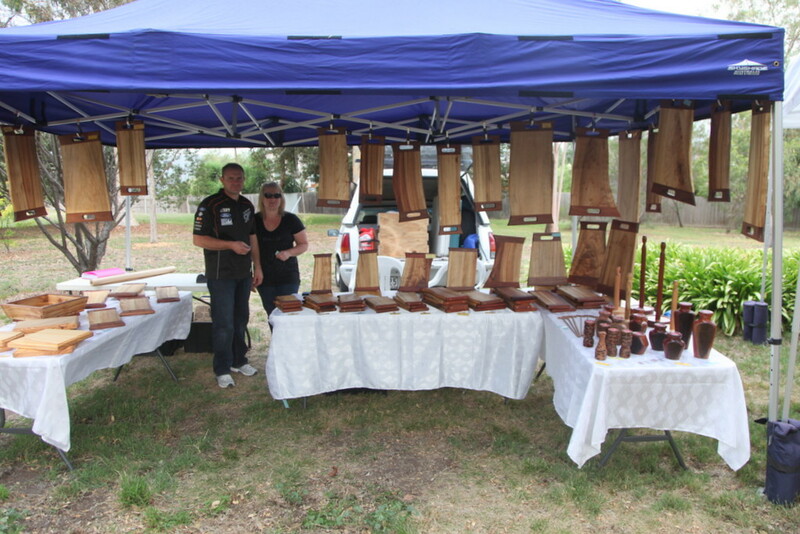 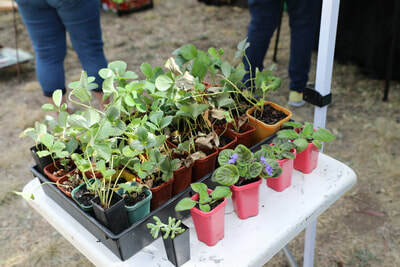 Below is a selection of photos from the weekend which is held annually. 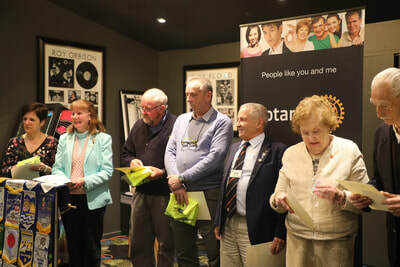 We congratulate our generous sponsors, the wonderful committee of organizers, the many volunteers and the members of the public who supported us. 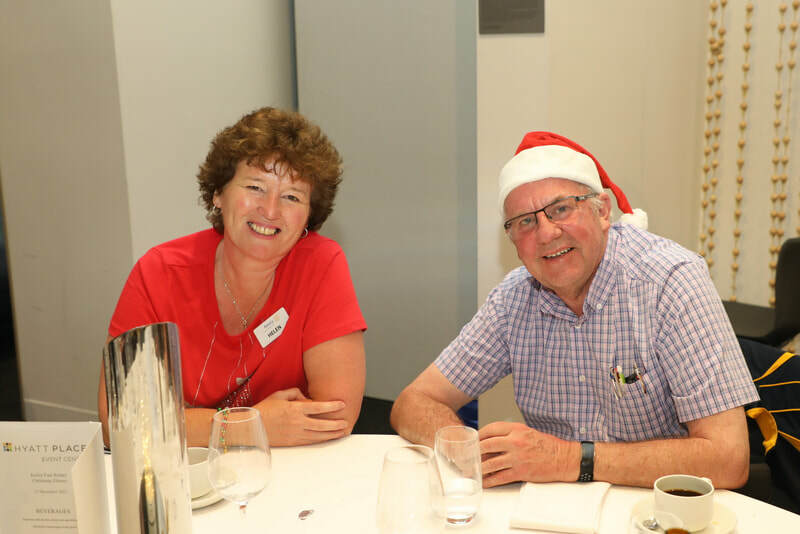 We hope to see you all again in 2018. 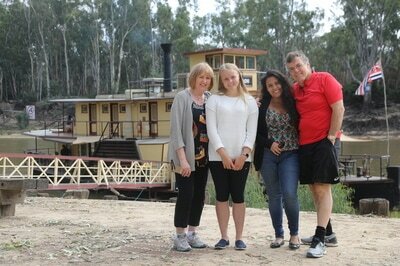 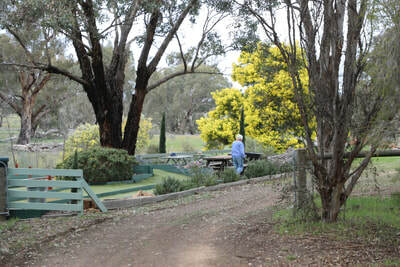 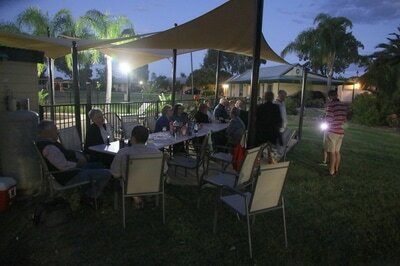 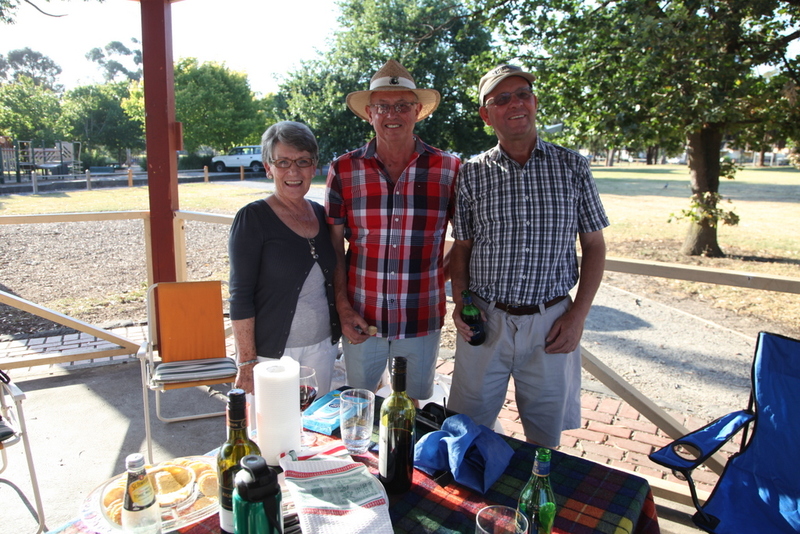 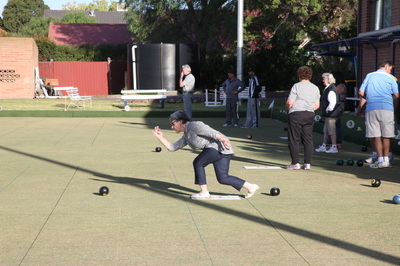 We spent the weekend of 17th, 18th and 19th February on our Annual Club Fellowship Weekend at Moama, NSW. 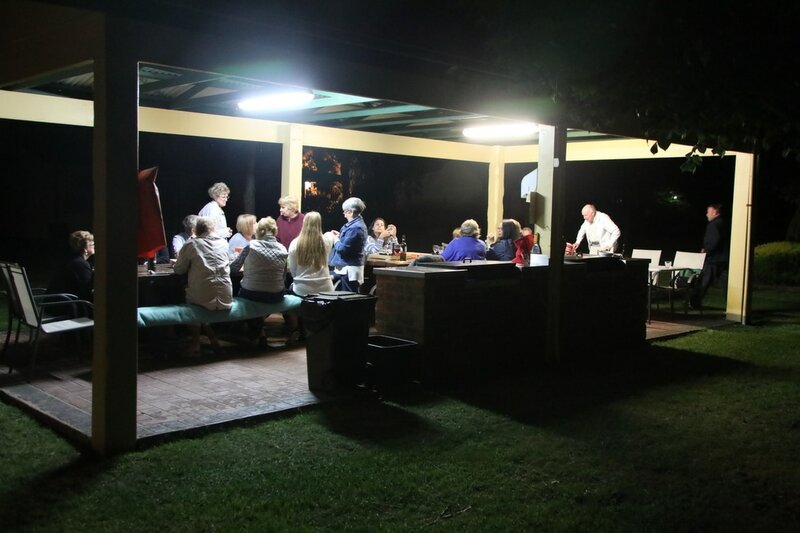 We stayed at the Murray River Resort in Perricoota Road.The weather was great and a fantastic weekend was had by everyone who attended. 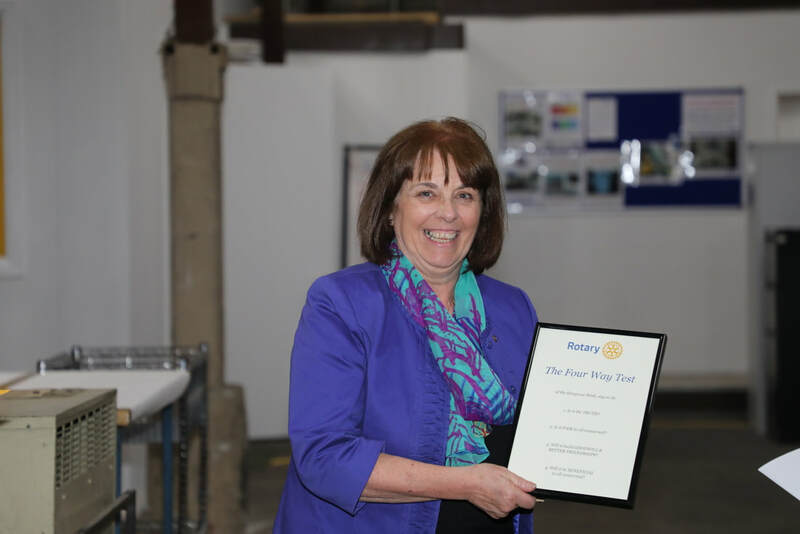 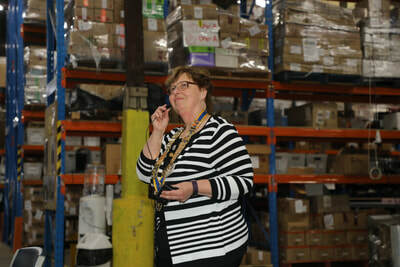 Our thanks go to Rotarian Marianne Potgieter for her wonderful organizational skills. 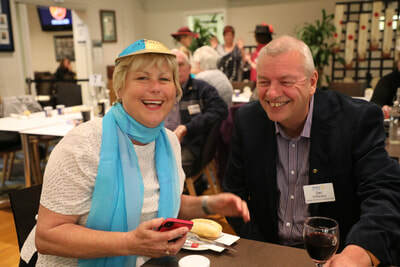 On Monday October 24th we held a very enjoyable Race Night. 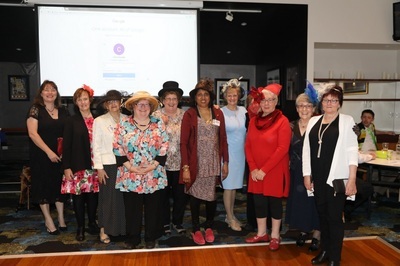 In preparation for the upcoming Melbourne Cup Carnival we held a "Calcutta" race, tried on real racing silks and caps and competed in "Fashions on the Field". 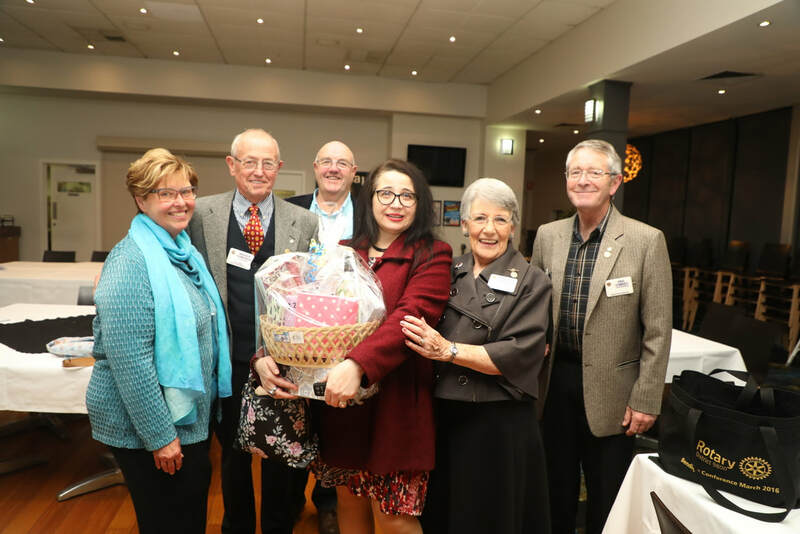 We thank our Fellowship Director, Annie Webb, her team, President Joe Albioli, Past President Gerard Mahoney, Mark Tognan, our generous prize donors, Members, partners and guests for helping make the night such a success. 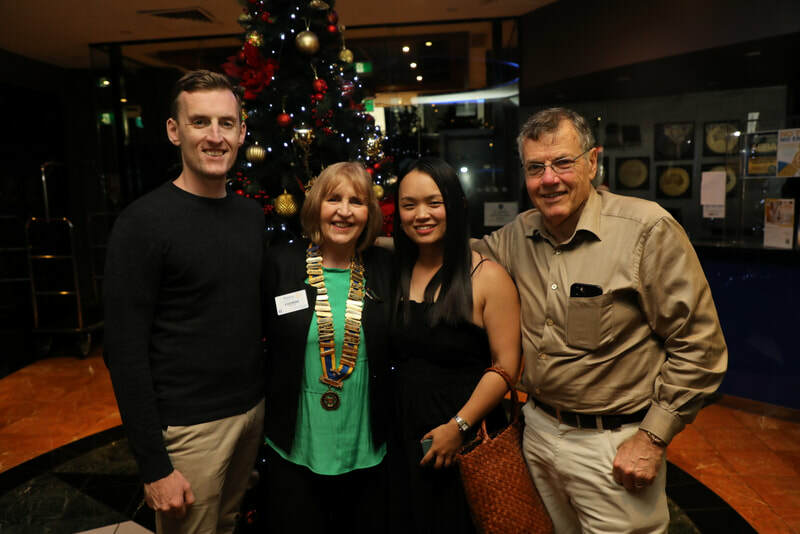 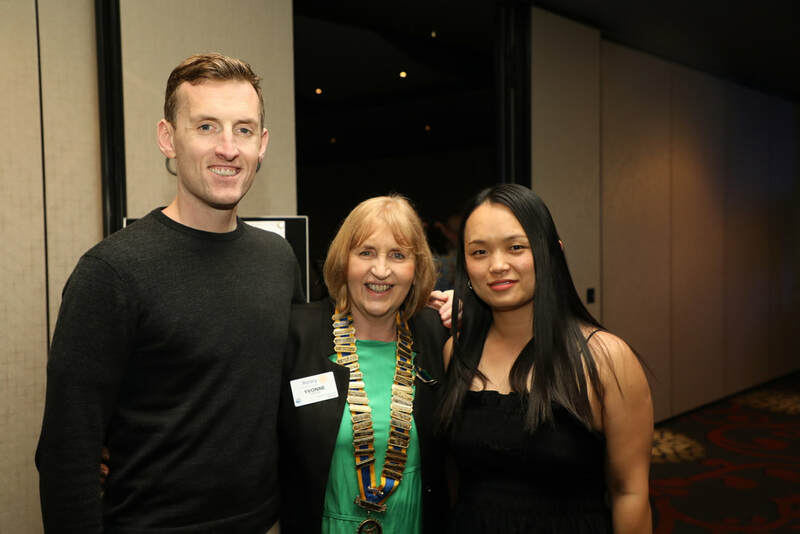 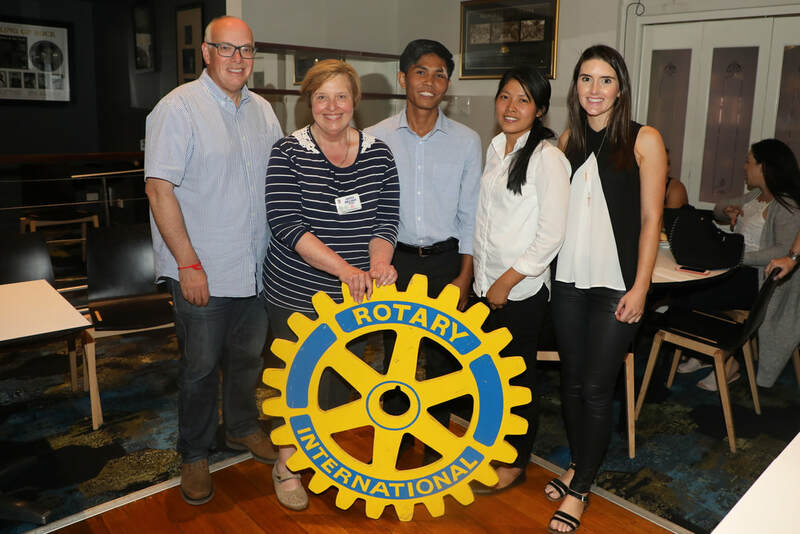 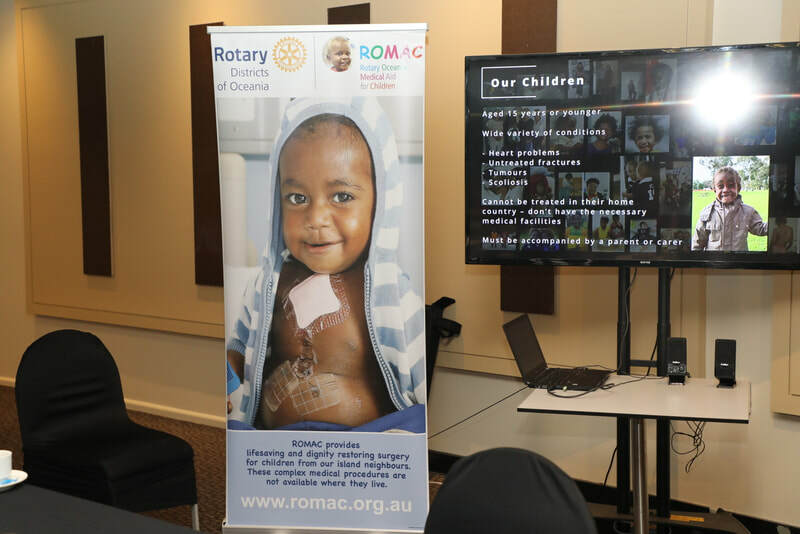 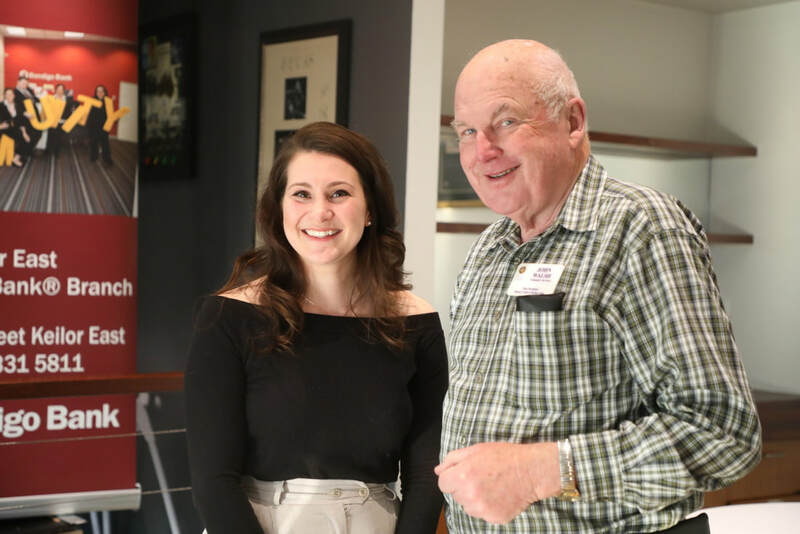 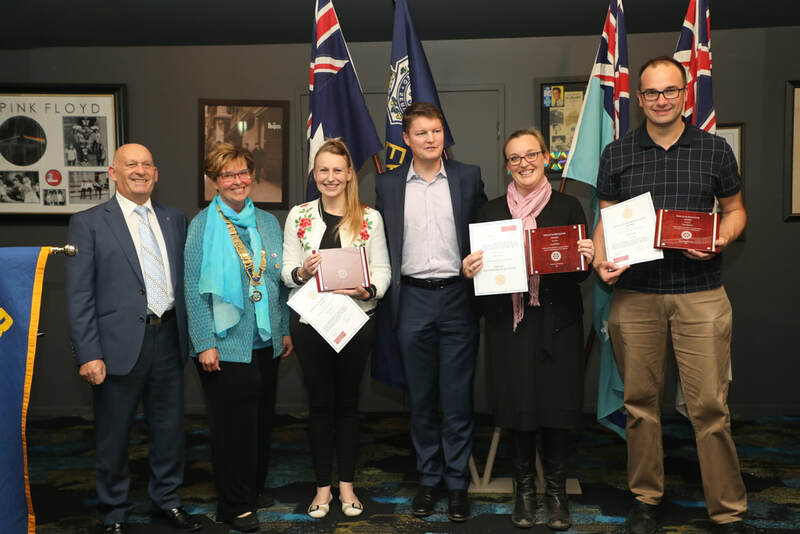 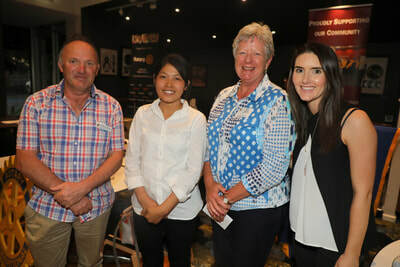 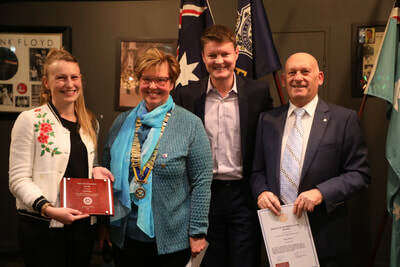 Over several years we have been pleased to welcome members of the Tullamarine Rotaract Club ( now Gateway Rotaract) to our Club meetings and special events. 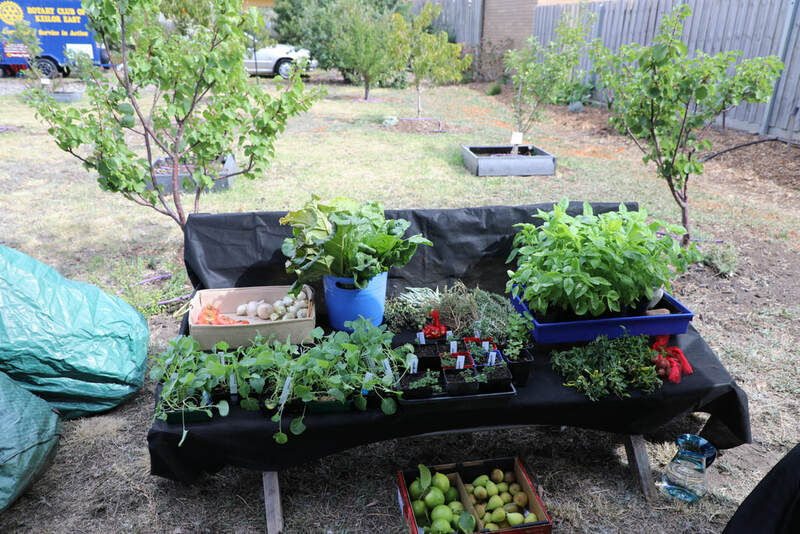 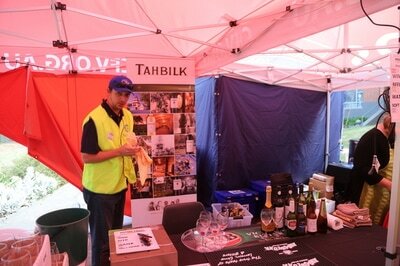 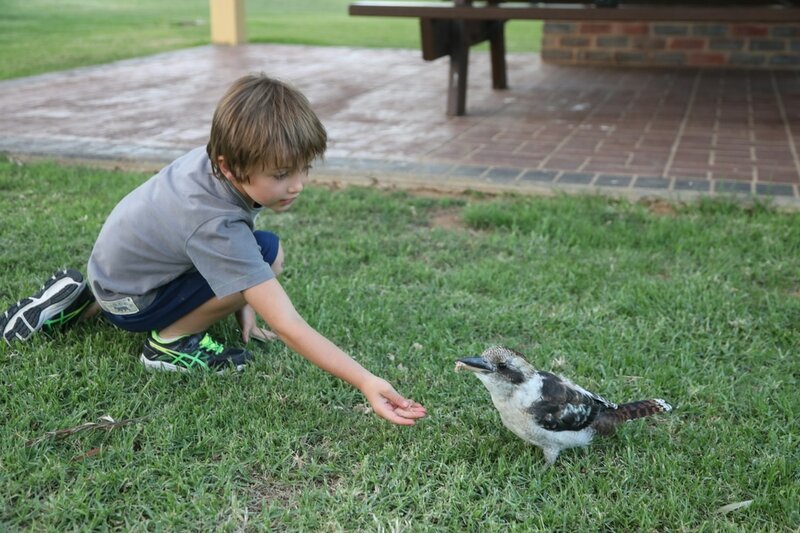 They have also helped us with Bunnings BBQs, working bees and fundraising nights. 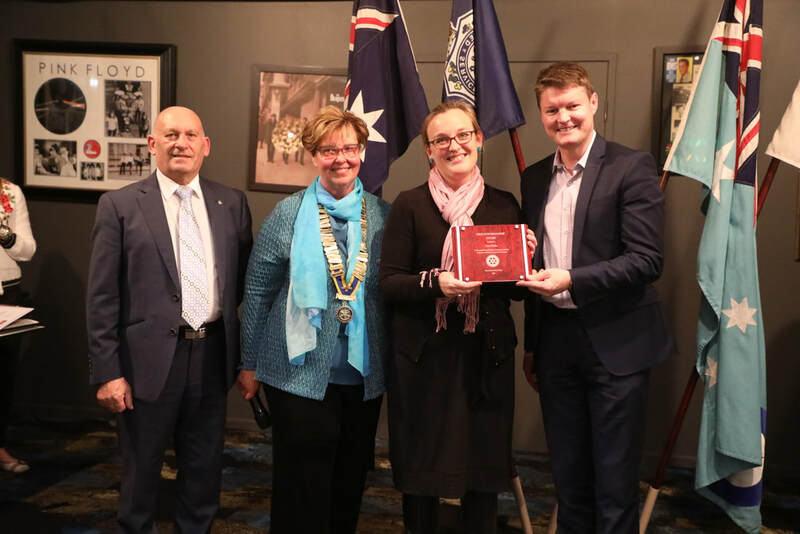 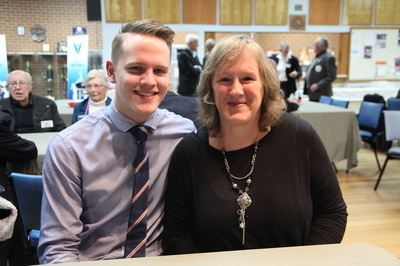 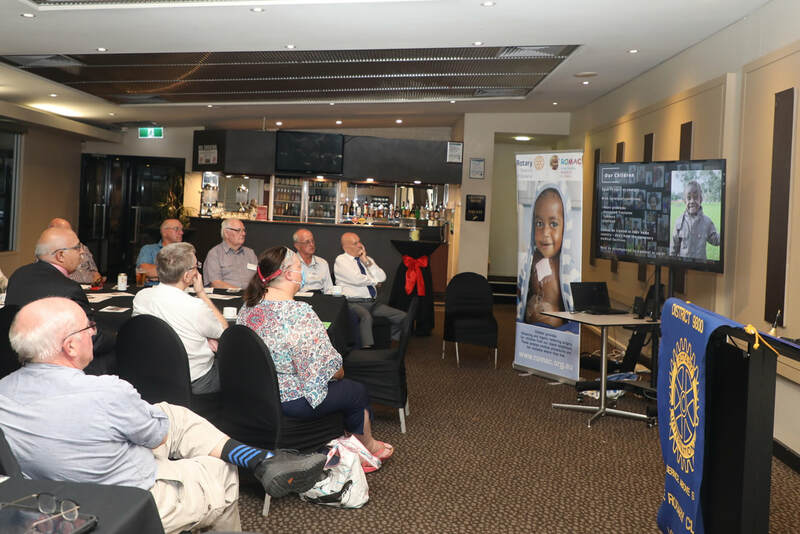 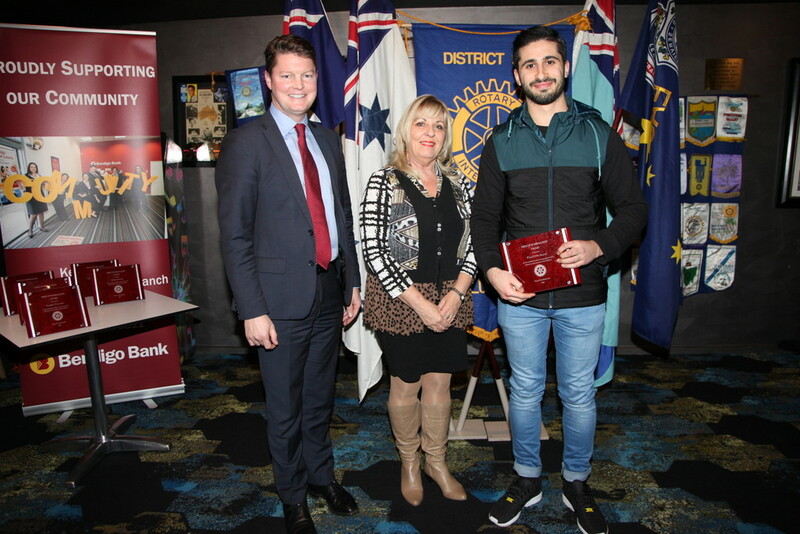 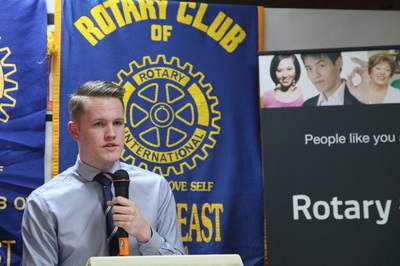 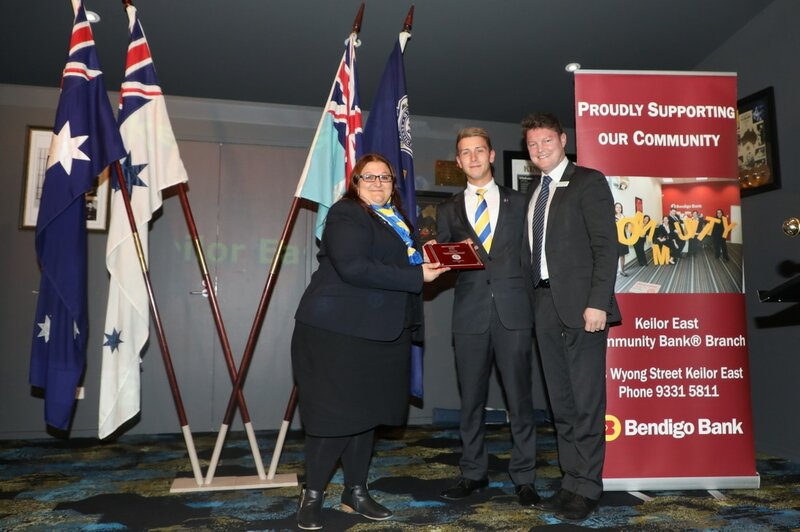 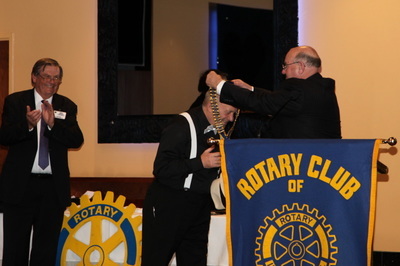 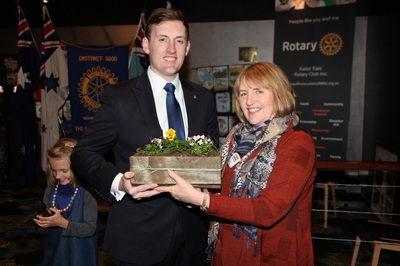 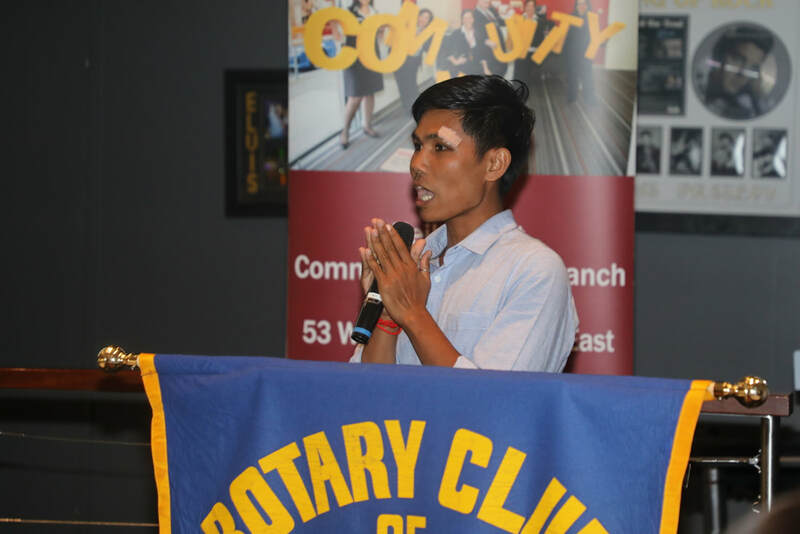 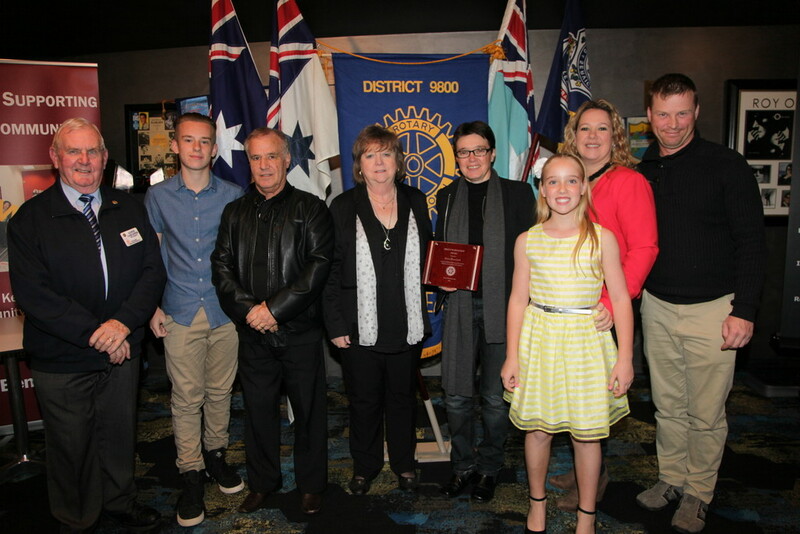 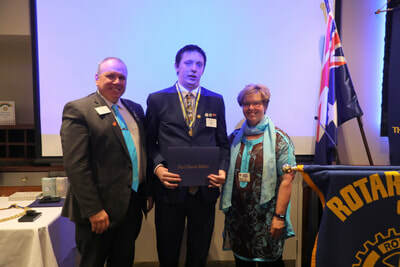 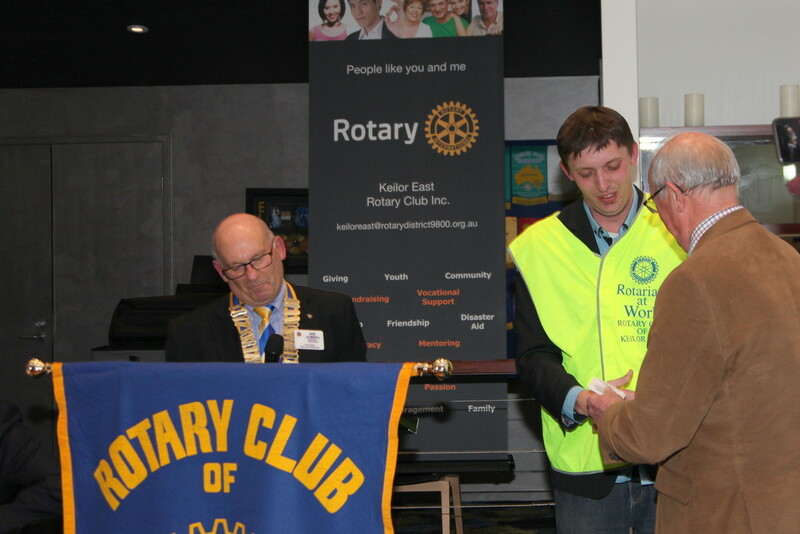 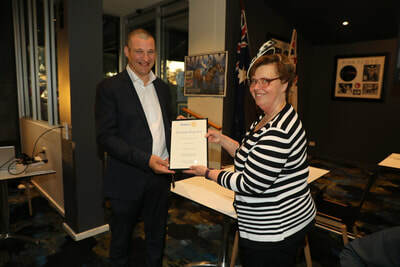 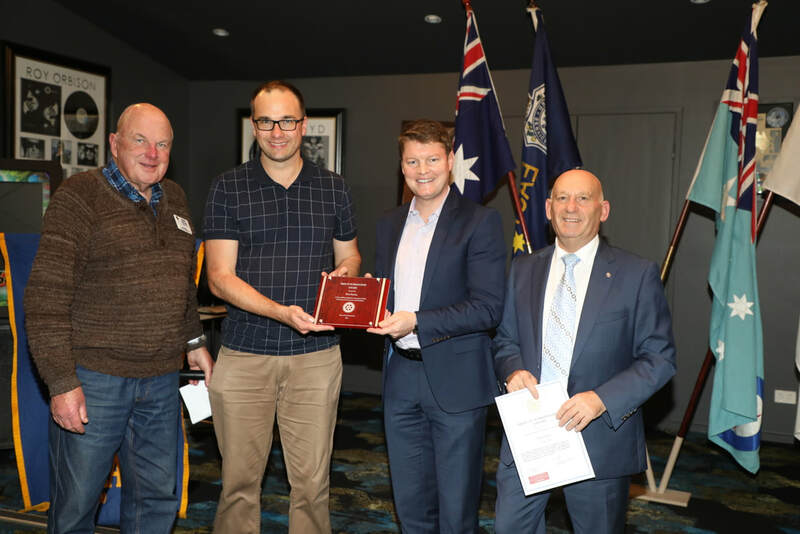 In particular we welcomed Mark Tongan who we are now thrilled to have recently inducted as the youngest member of the Rotary Club of Keilor East. 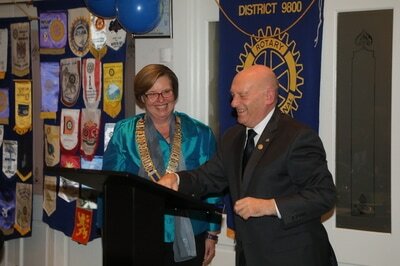 Our Congratulations go to Mark along with our very best wishes for his Rotary journey. 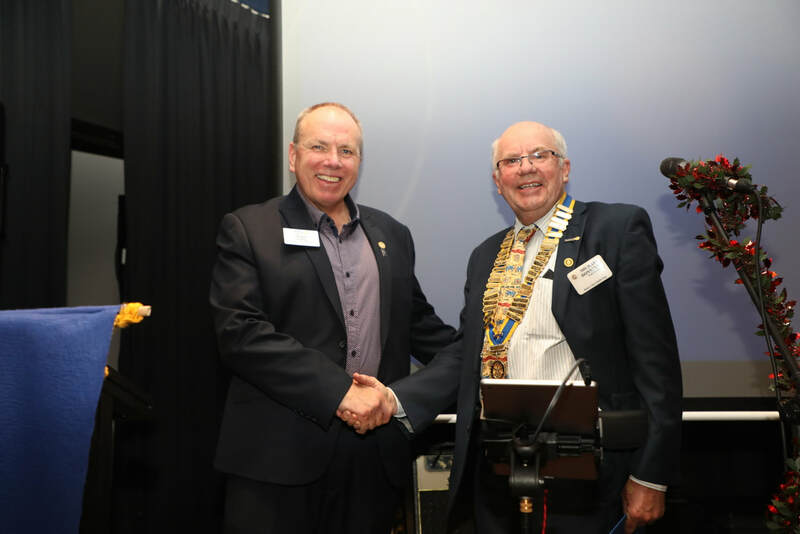 When District Governor Neville John made his official visit to our Club on August 10th he set out his hopes for the year ahead. He told us of how he joined Rotary and how he soon realized that it could provide a way which could allow an individual with a great idea to have it quickly spread worldwide and make a huge difference to millions of people. Neville also presented one of our Pride of Workmanship awards to Damian Thomas of Yarra Community Housing and two Paul Harris Fellow awards to Past Presidents Gerard Mahoney and Phil O'Brien. 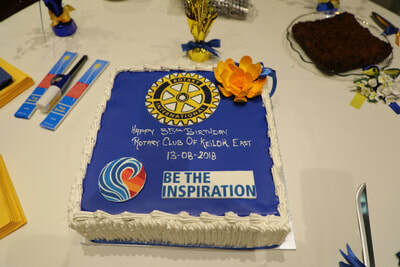 In addition the evening was held on our Club's 33rd Birthday so we celebrated with a slice of the delicious anniversary cake. 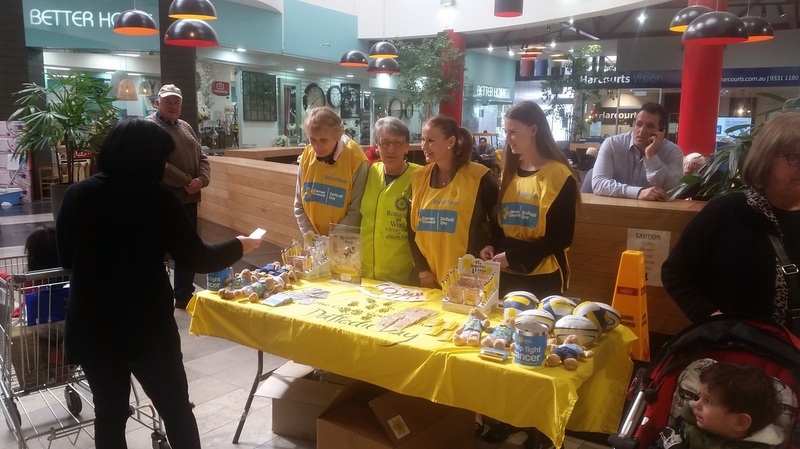 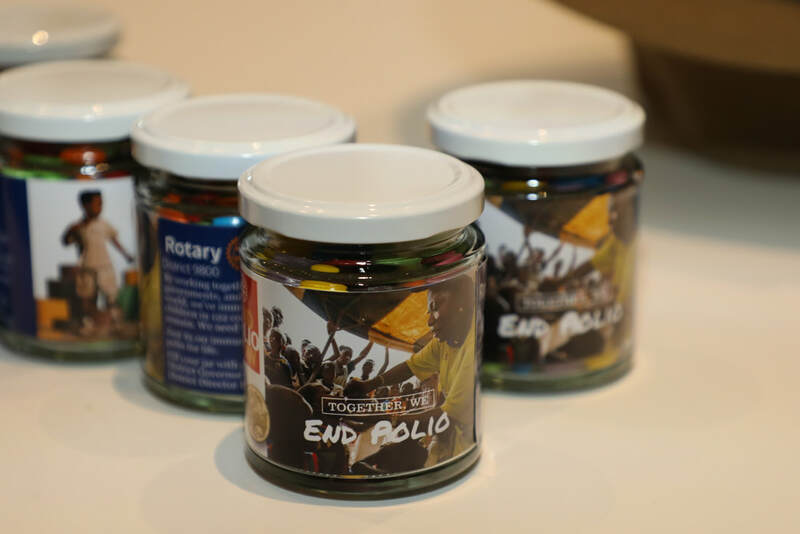 On Friday 26th August several Club Members sold Daffodil Day products at Milleara Mall. PPJohn Walsh, PAG Cherrie Osborn and Rotarian Marianne Potgieter are pictured with young volunteers from the local area. 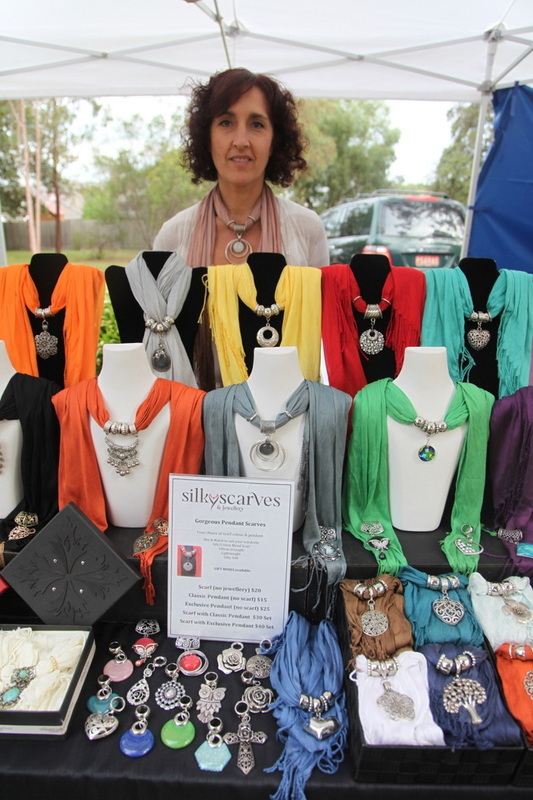 They sold out of many of the products and over $1700 was raised for the Cancer Council. 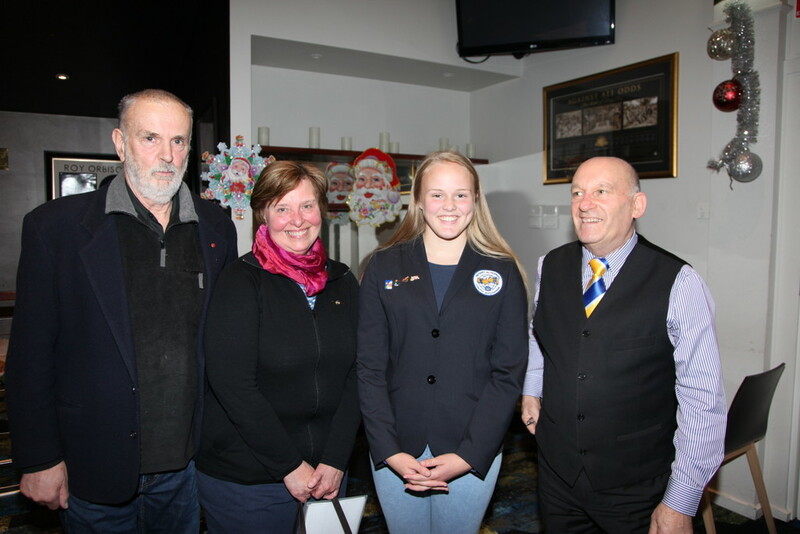 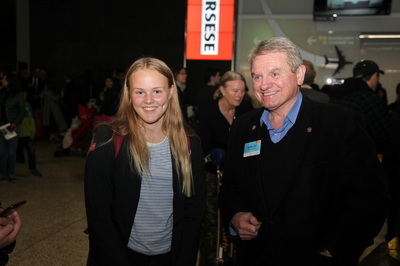 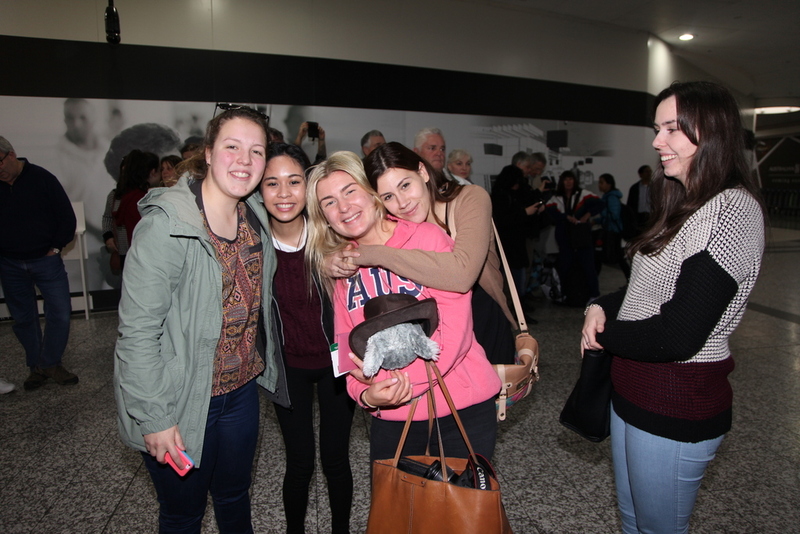 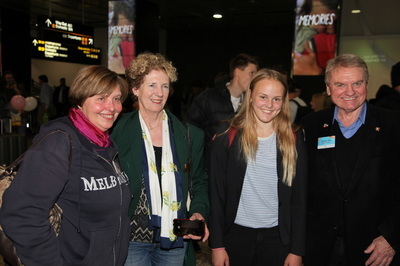 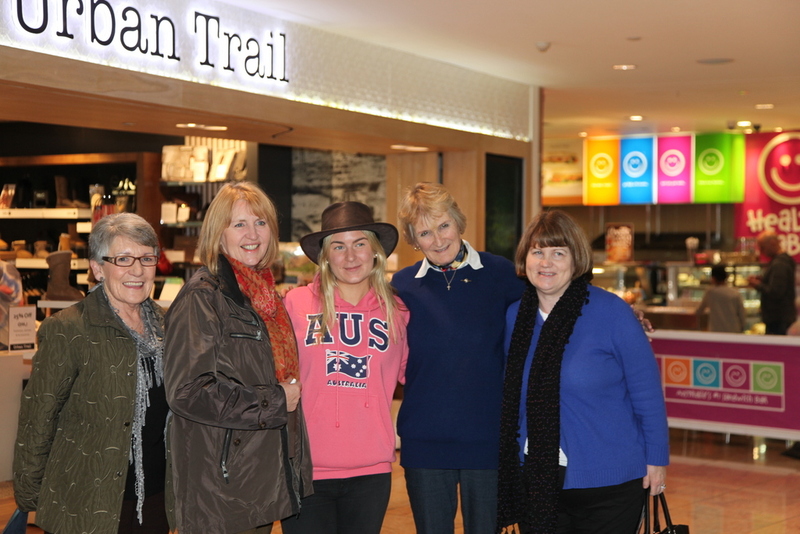 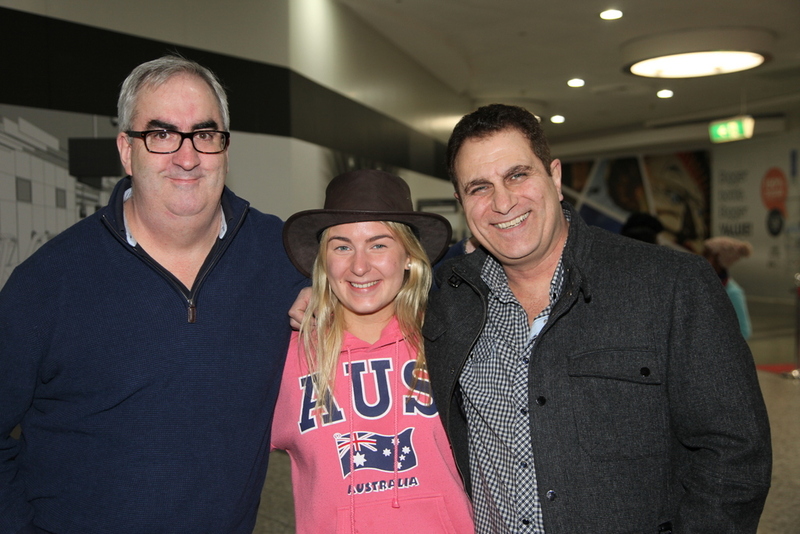 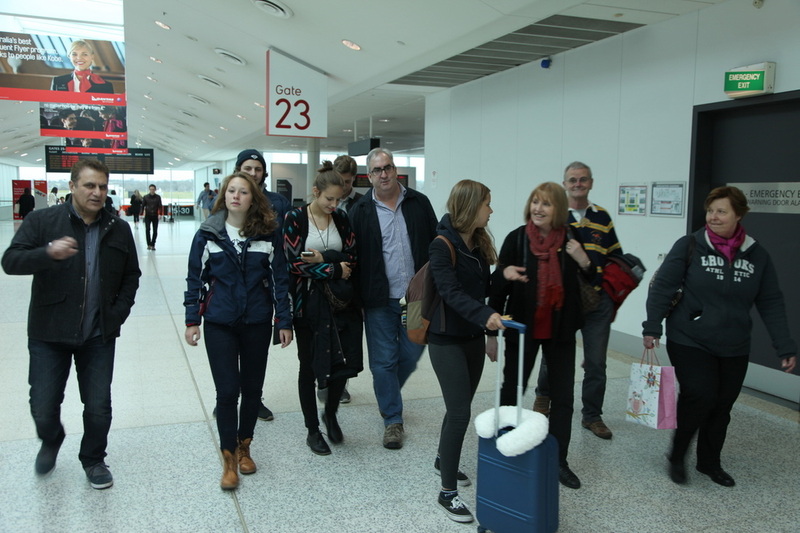 On Friday 22nd July our Club Members went to Melbourne Airport to welcome Rotary Youth Exchange student Elise Marie Pettersen from Arnes, Norway. Also there to welcome Elise was District 9800 Governor Neville John and Norway Coordinator Maria Silber (Footscray RC).We wish Elise all the very best for a wonderful Exchange year in Australia and good luck as she starts Year 10 at Rosehill Secondary College, Essendon. 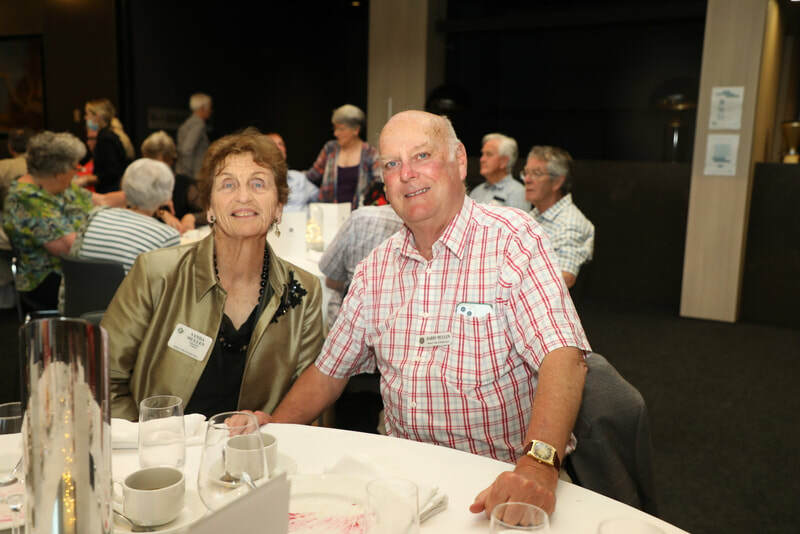 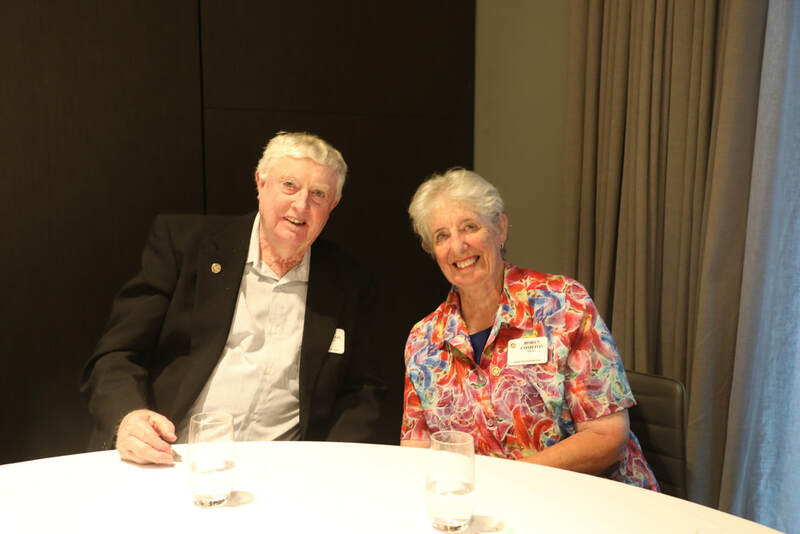 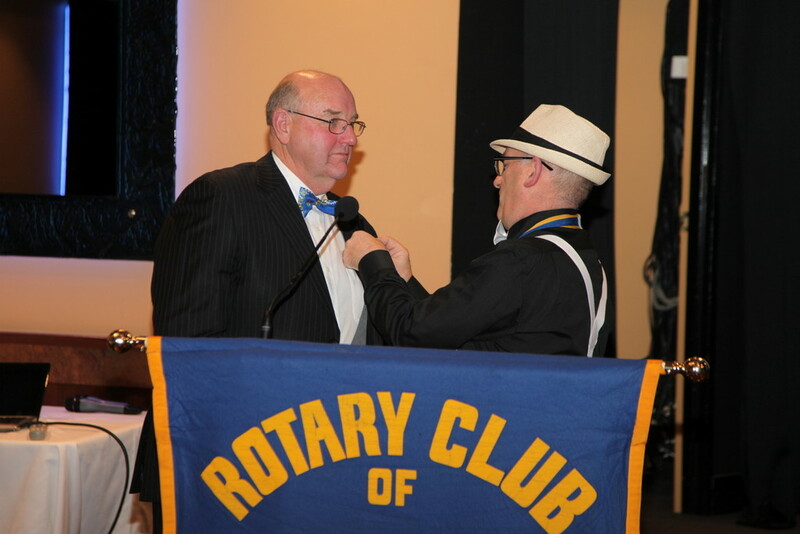 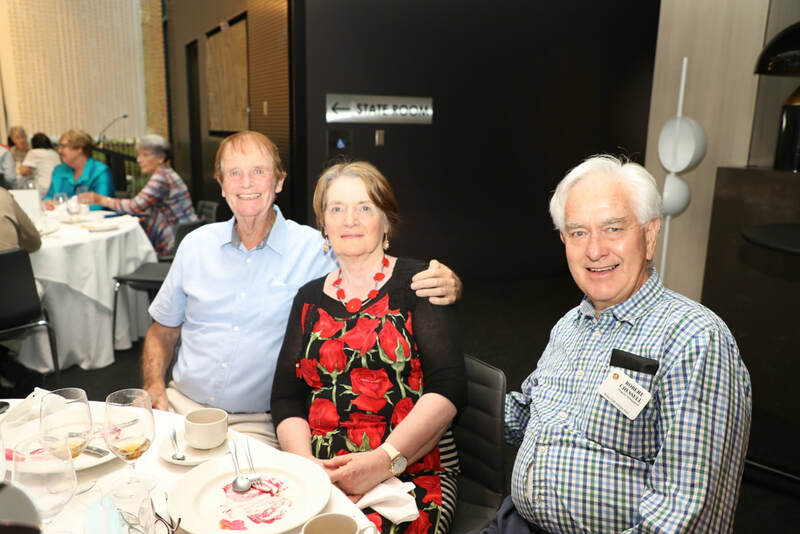 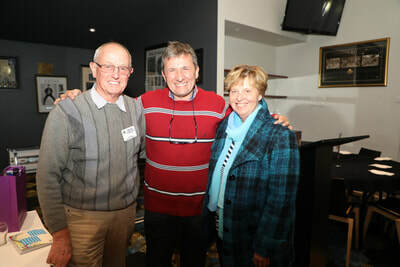 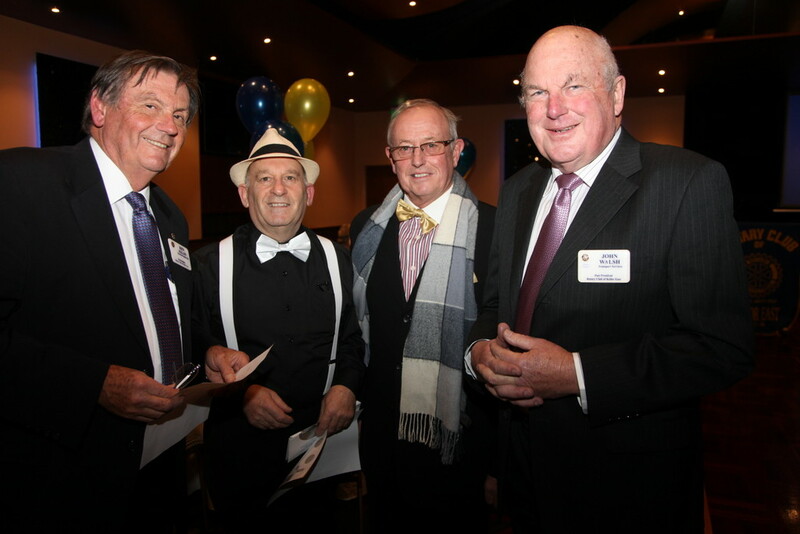 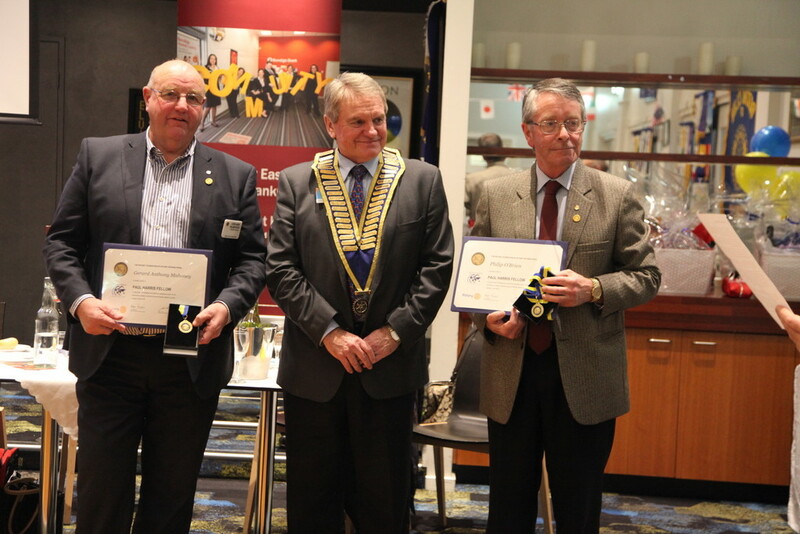 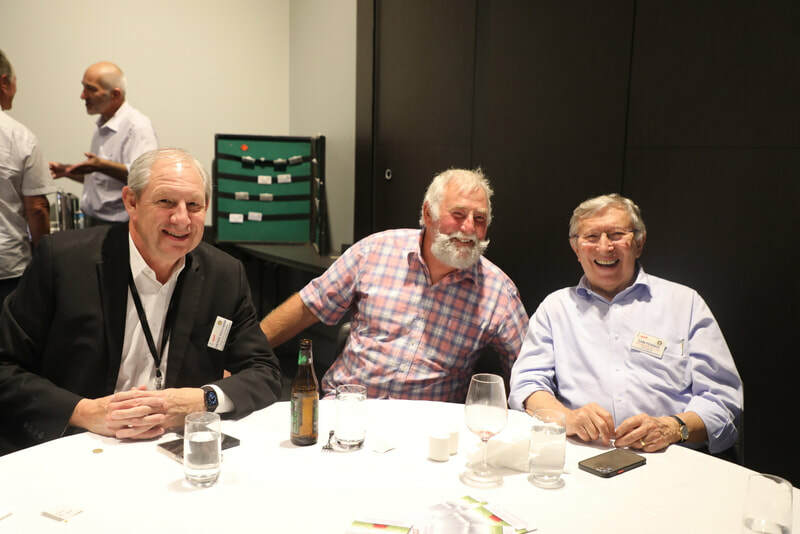 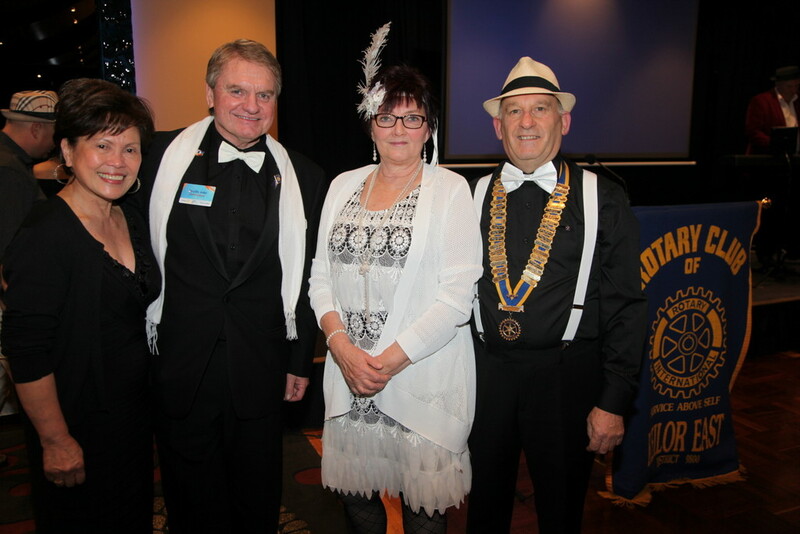 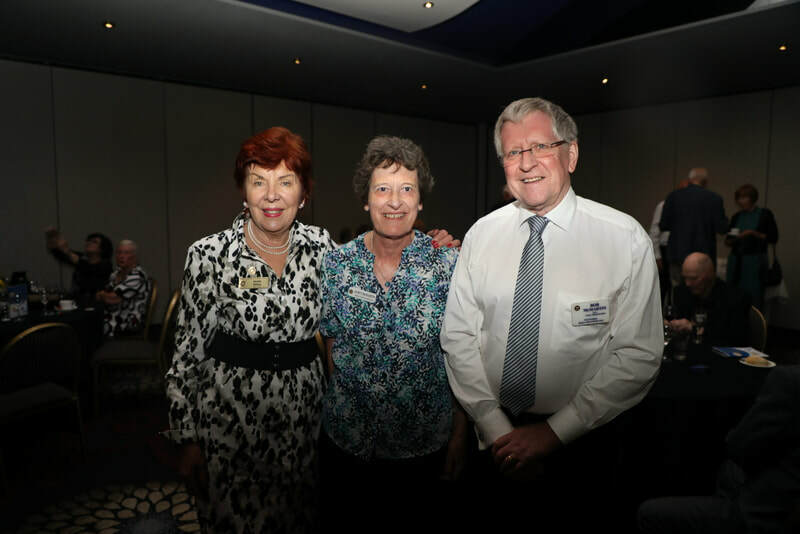 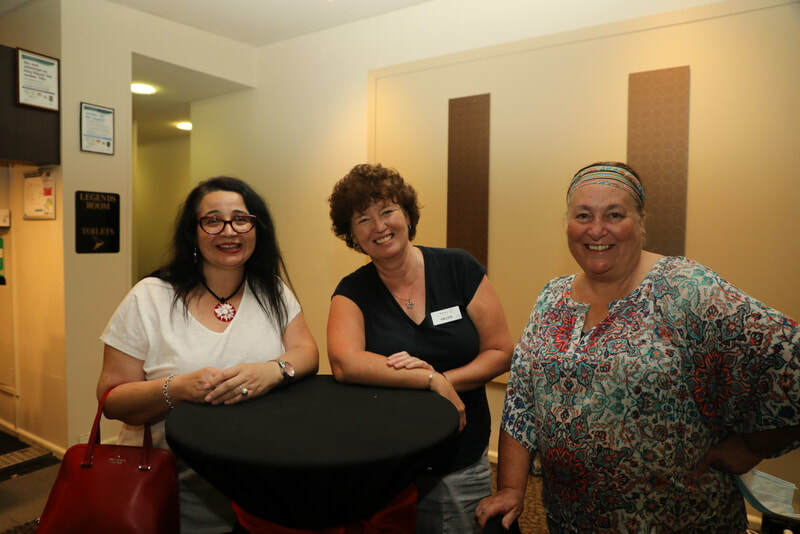 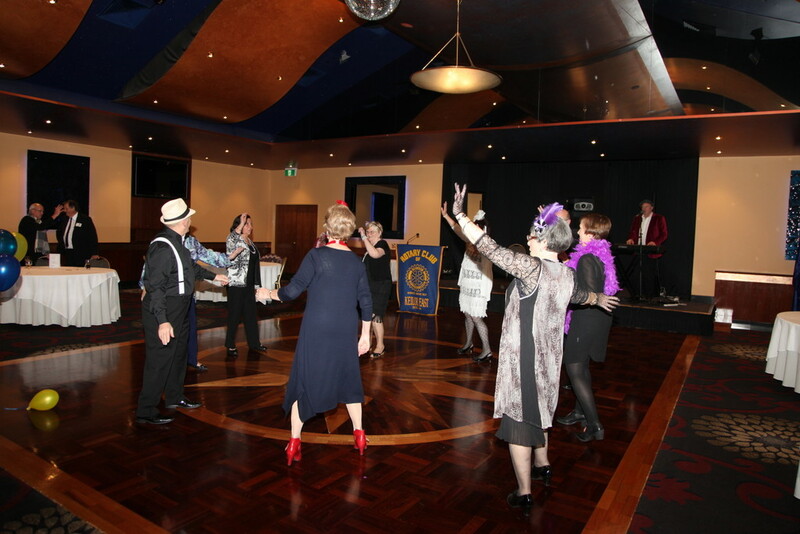 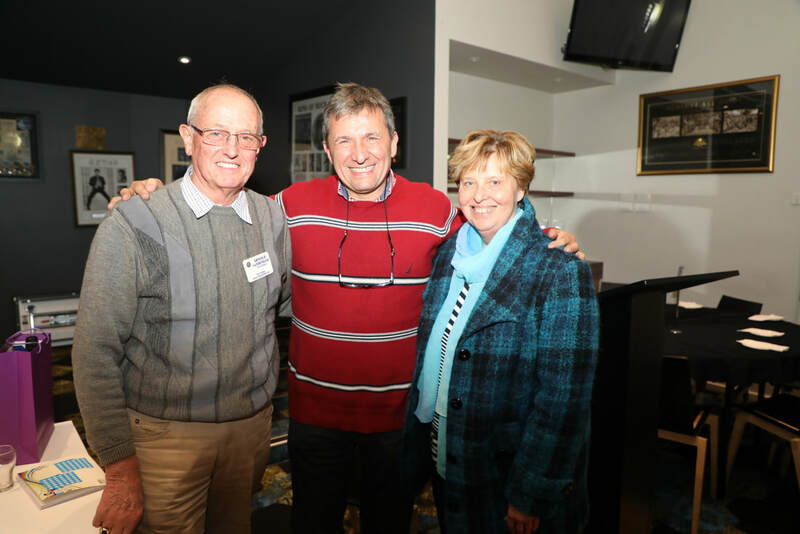 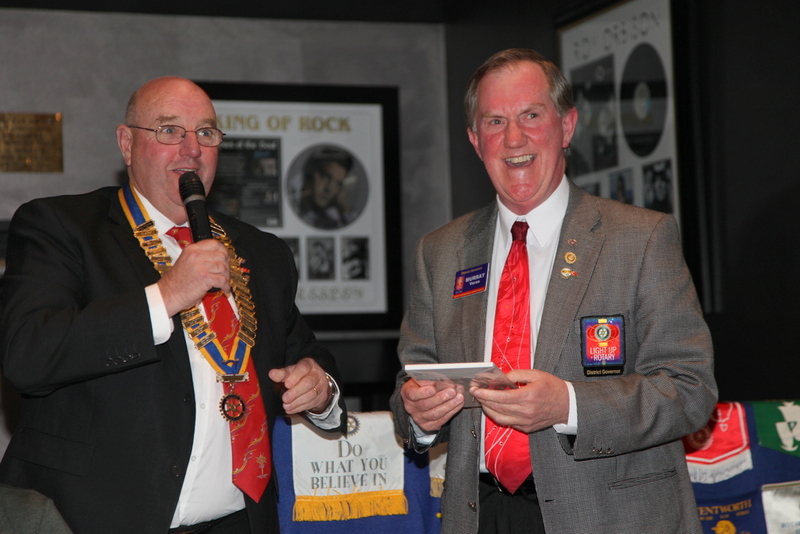 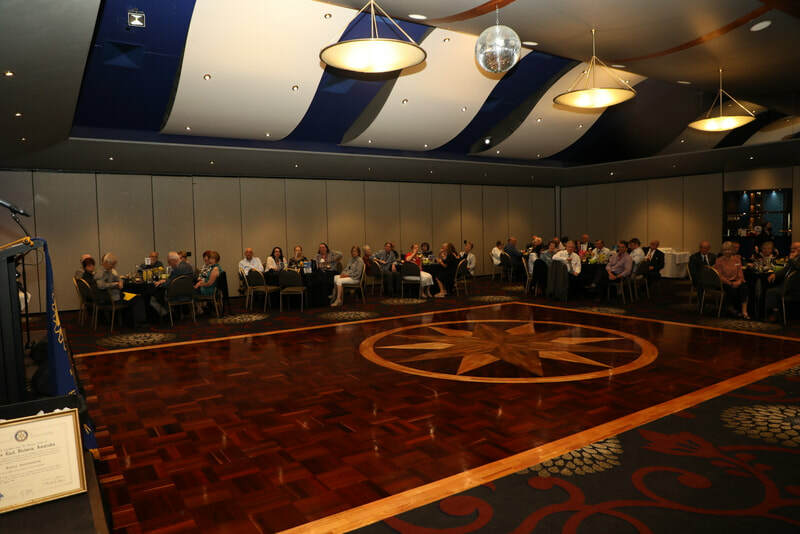 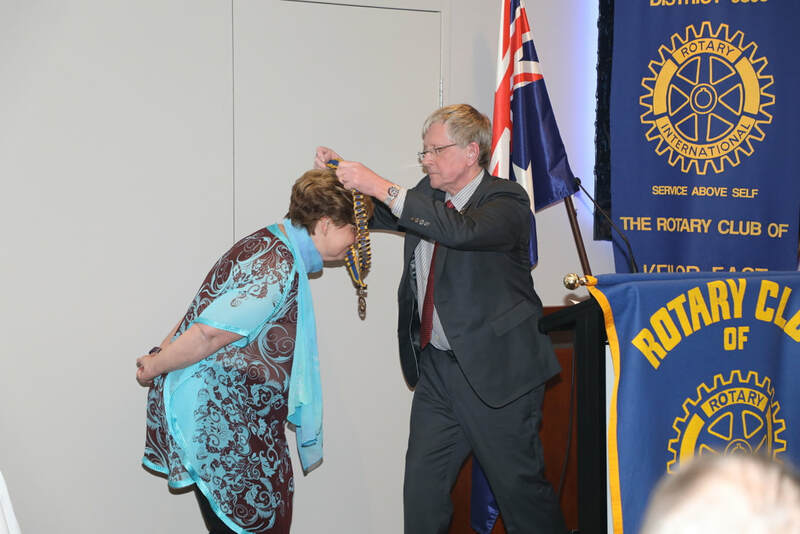 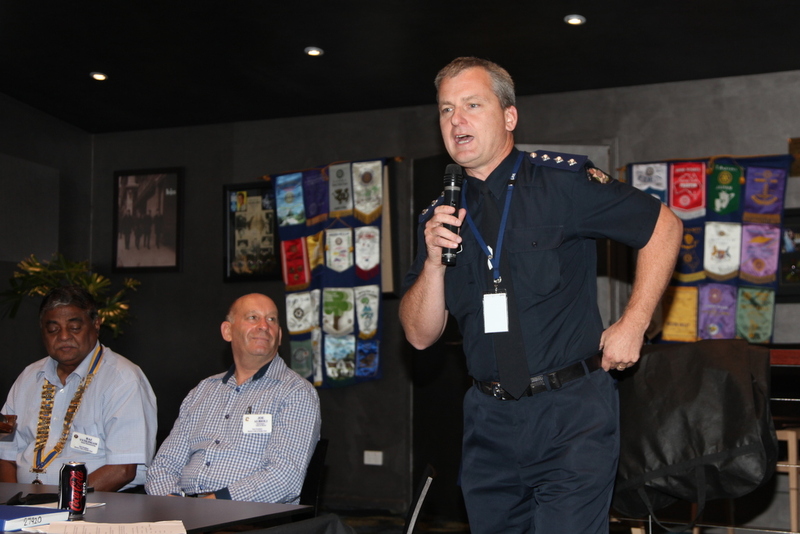 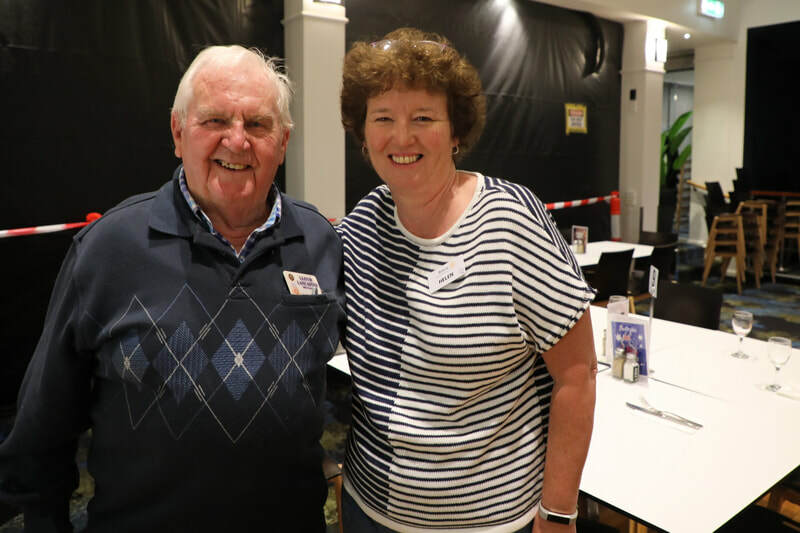 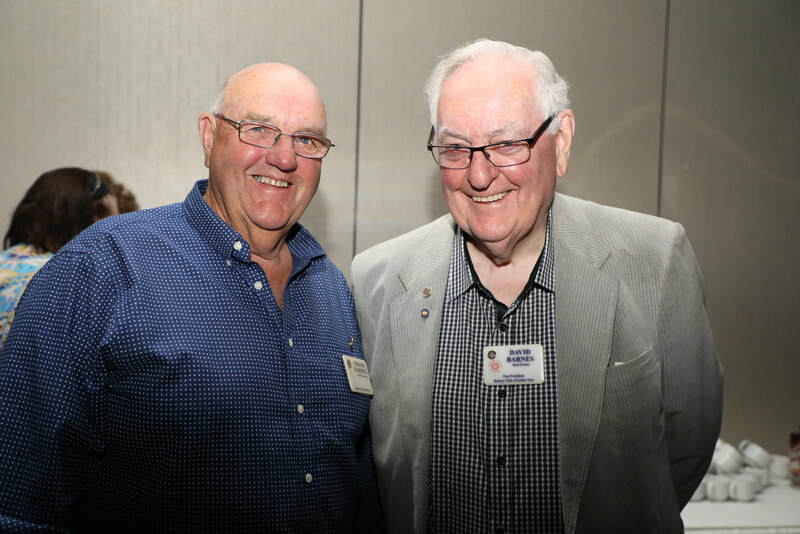 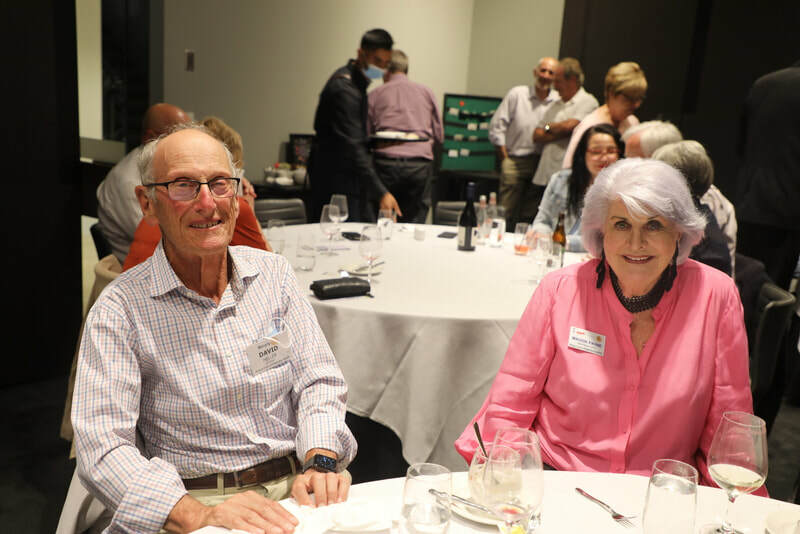 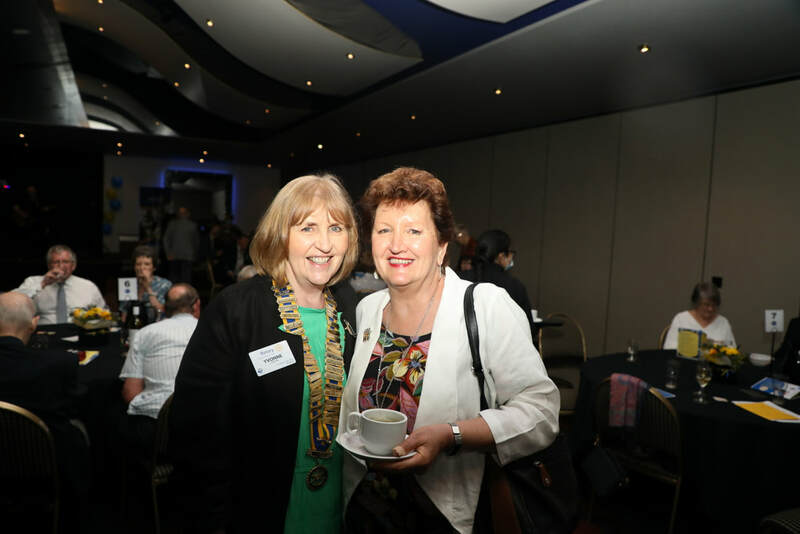 ​On Monday 27th June 2016 our Club held its President's Changeover at the Starlight Room at Taylors Lakes Hotel. 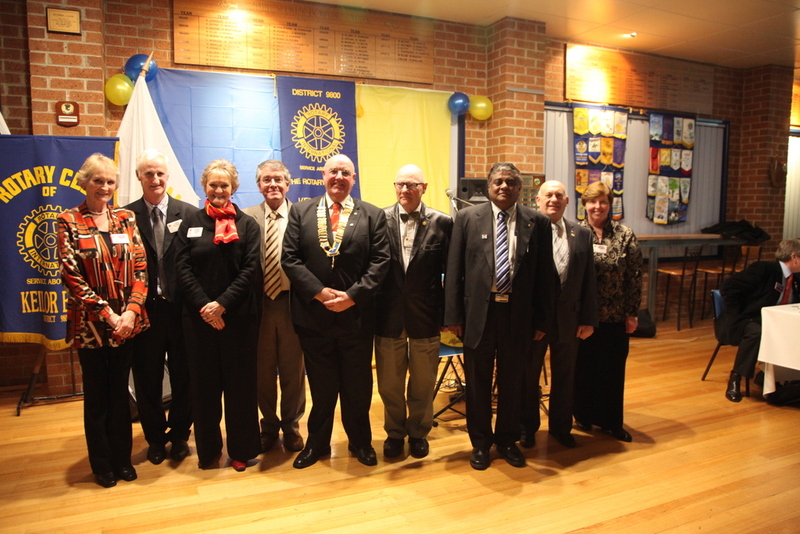 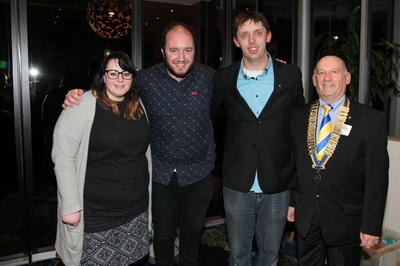 Special guests included our new District Governor Neville John and his wife Rebecca and Ben Carroll MP for Niddrie. 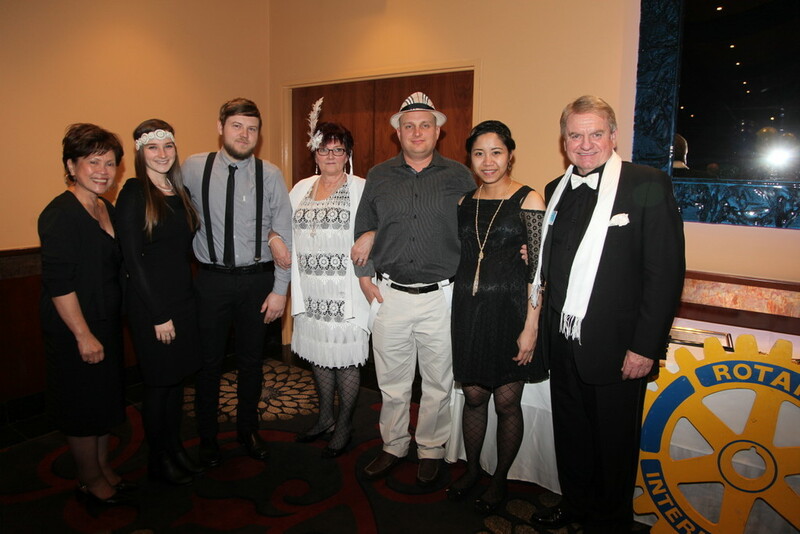 Guests dressed in a Roaring Twenties theme. 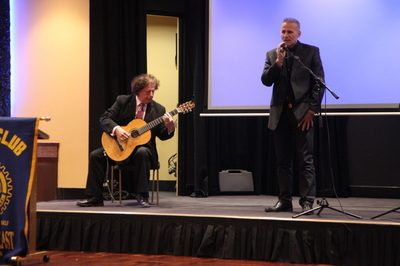 Entertainment for the evening was provided by Tony Manchi with Rafeal Basso on backing guitar and Keyboard Kevin who is the talented brother of outgoing President, Gerard Mahoney. 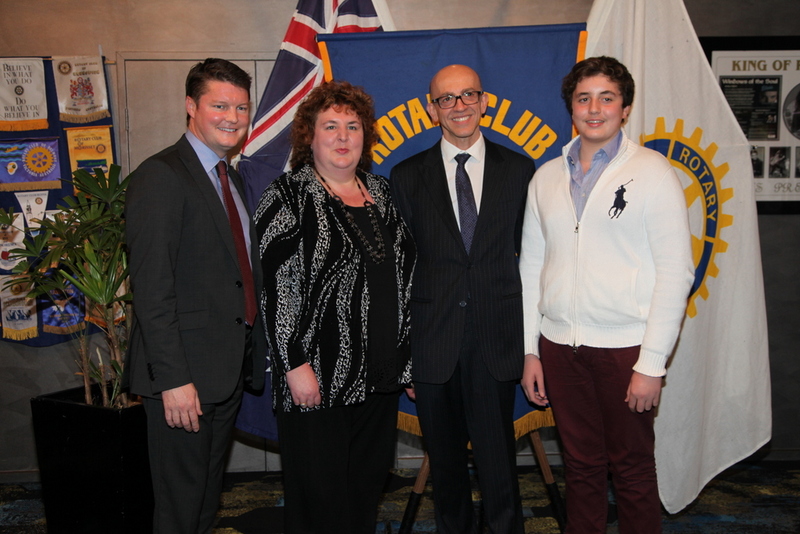 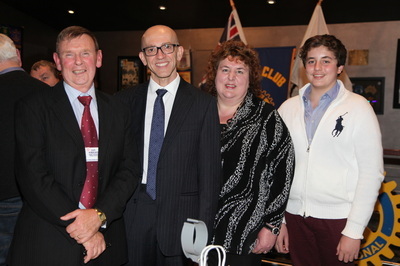 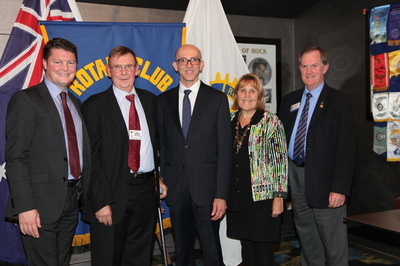 Gerard inducted new President Joe Albioli who was accompanied by his lovely wife Liz and his extended family. 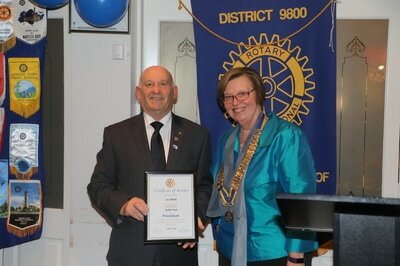 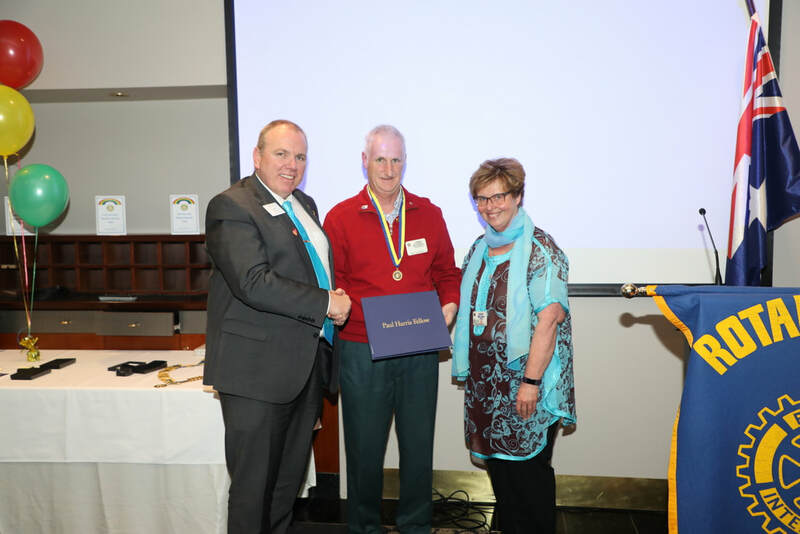 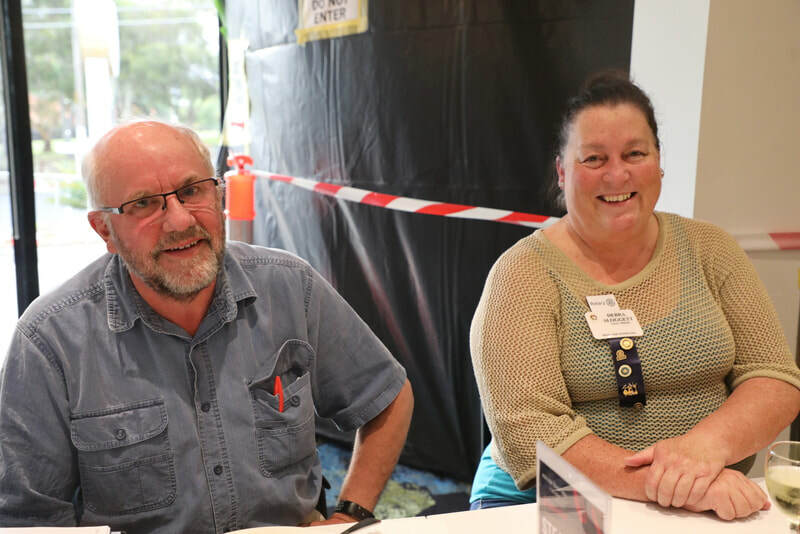 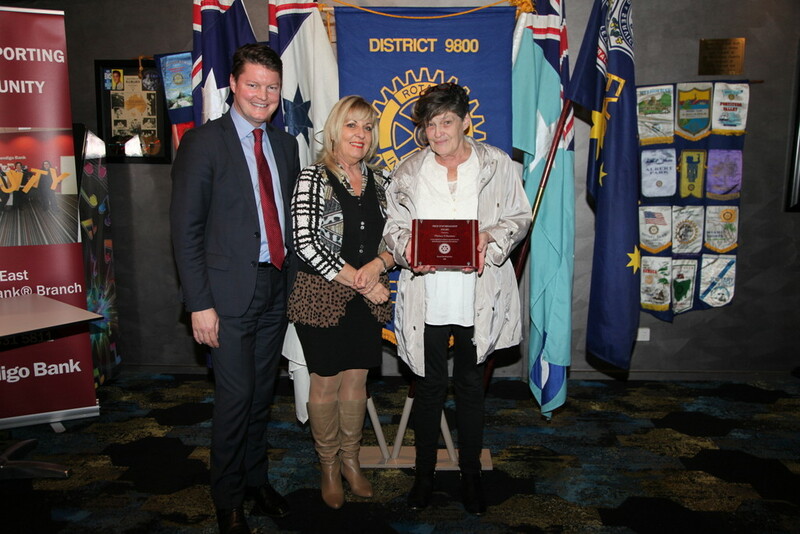 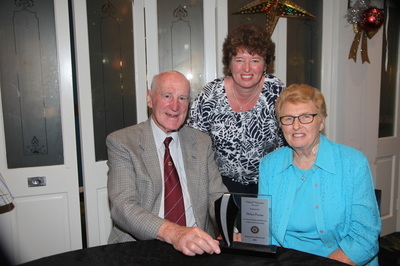 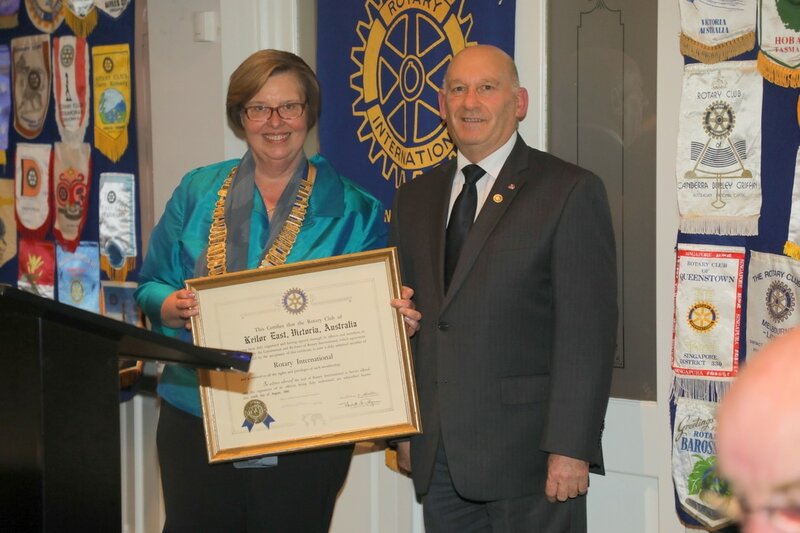 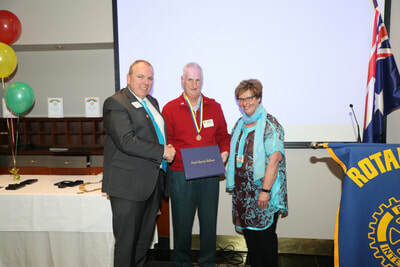 We congratulate Gerard upon his District 9800 Citation and our Club upon the District Award it received which were presented by outgoing Assistant Governor, Leslie McCarthy. 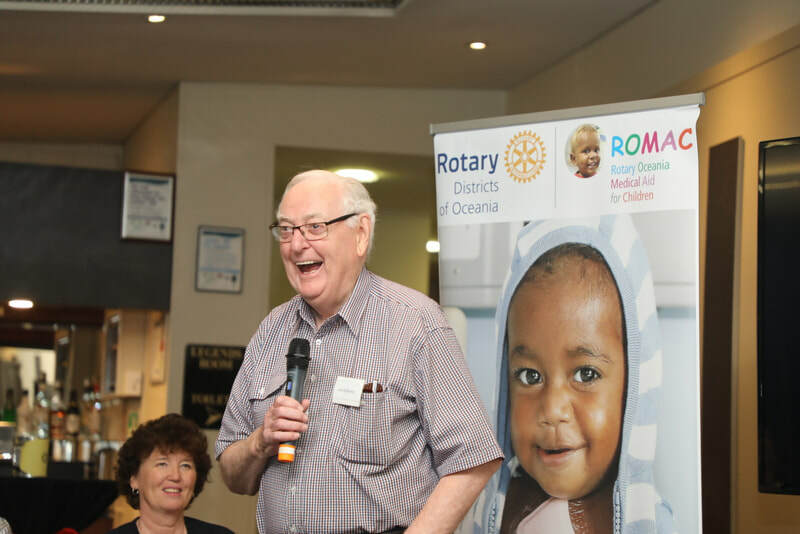 We wish President Joe all the very best for a successful and fun filled year ahead as we undertake this year's theme "Rotary Serving Humanity". 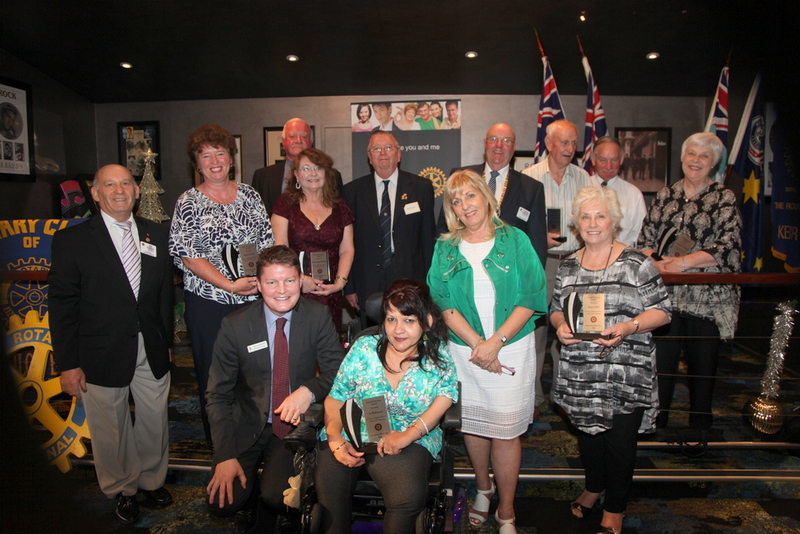 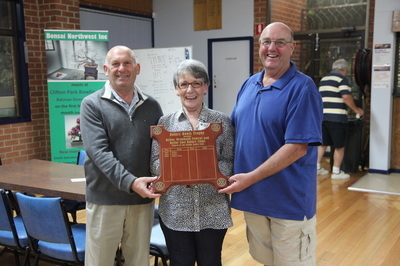 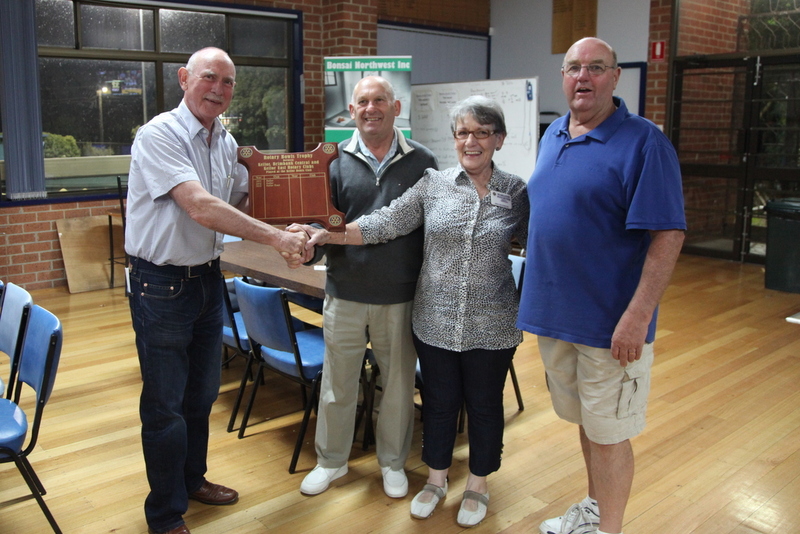 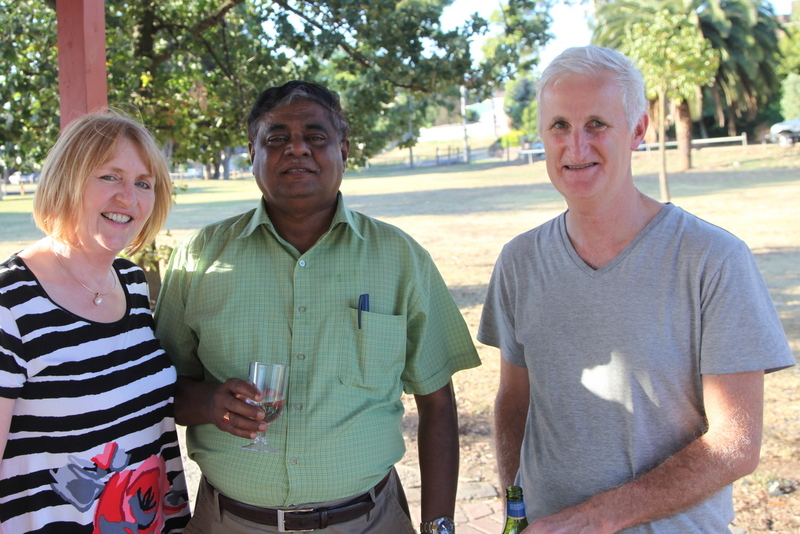 On Monday 23rd May our Club held its annual vocational Pride of Workmanship Awards night. 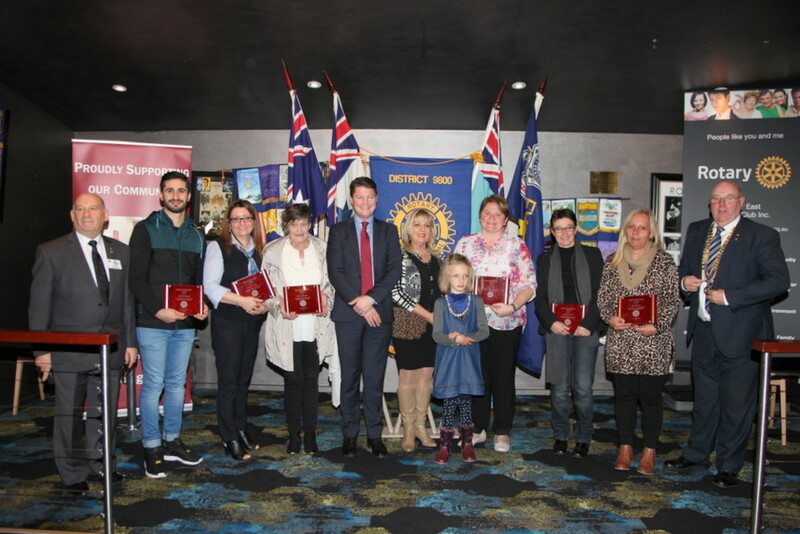 Over the past few months Club members nominated members of the local community who had gone "above and beyond" in their workplace, giving excellent customer or client service. 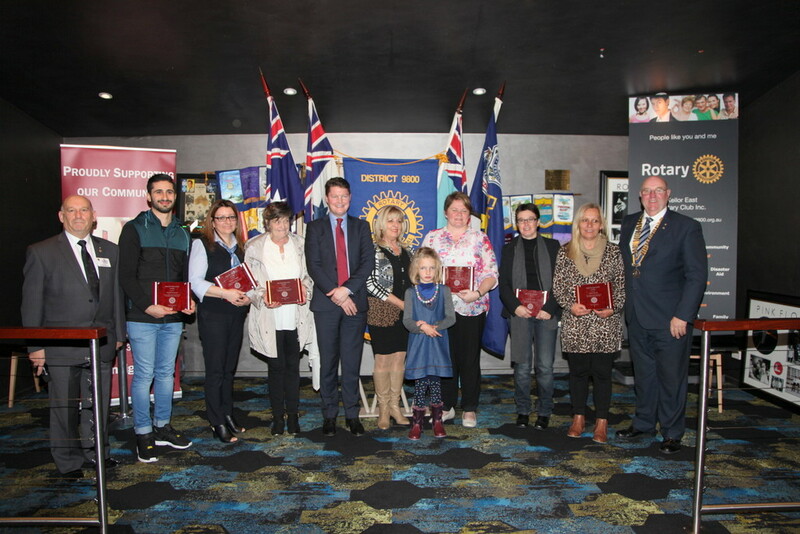 Winners of these prestigious awards were Paul Michael of Little Sister Cafe in the Centreway, Keilor East, Debi Birch of Yarra Community Housing, Footscray, Helen Lester also of Yarra Community Housing, Layla Younan of Pennisi Real Estate, Essendon, Kim Busuttil of The Dog's Bath in the Centreway, Keilor East and Caroline Kiefer of the Neonatal Unit at Sunshine Hospital. 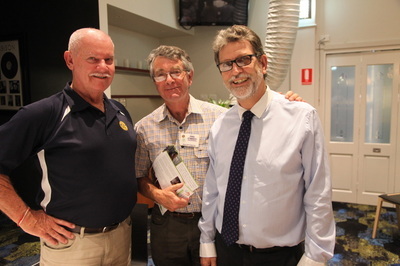 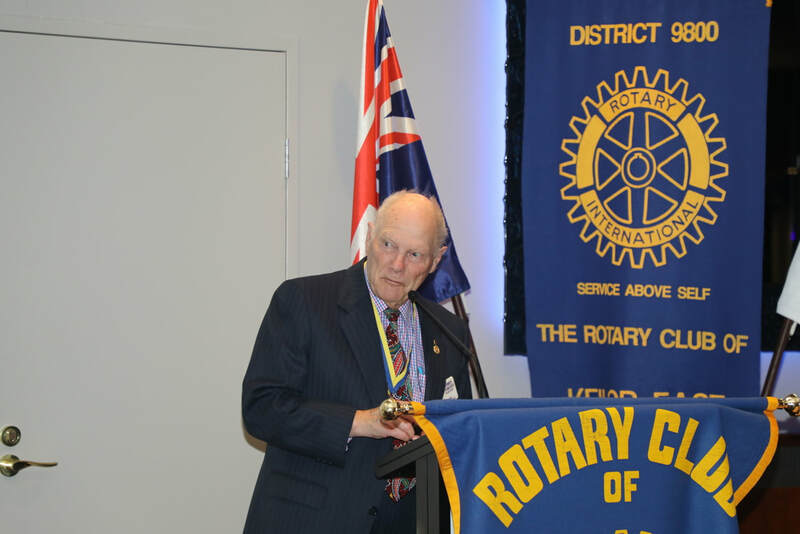 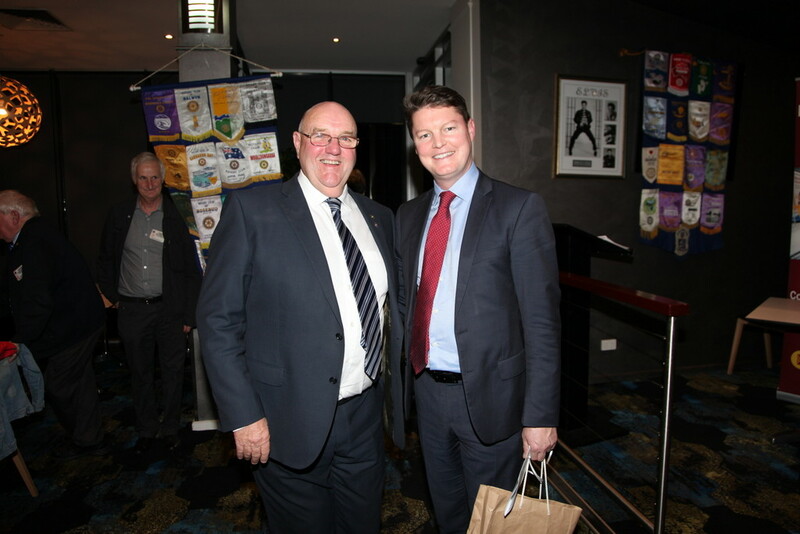 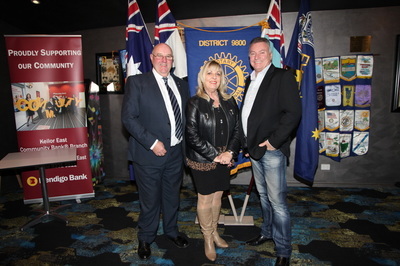 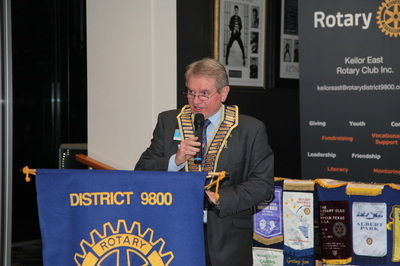 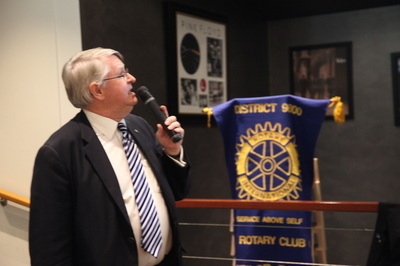 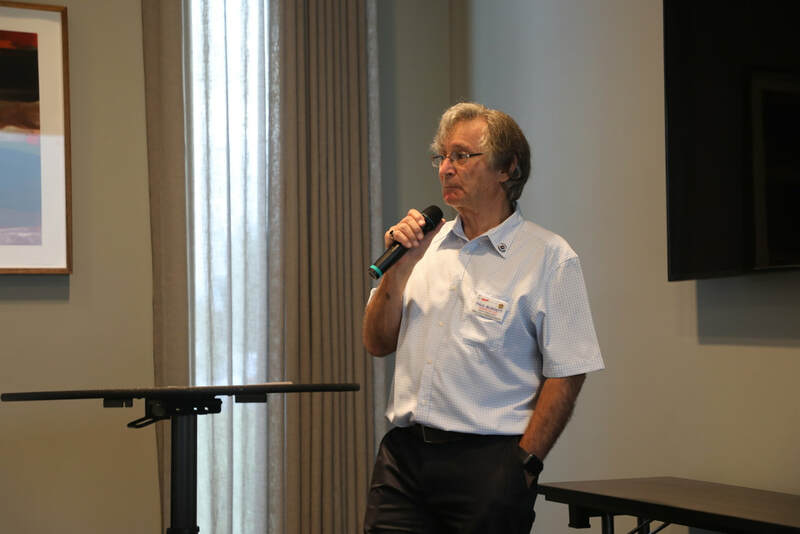 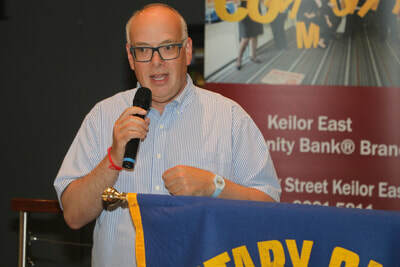 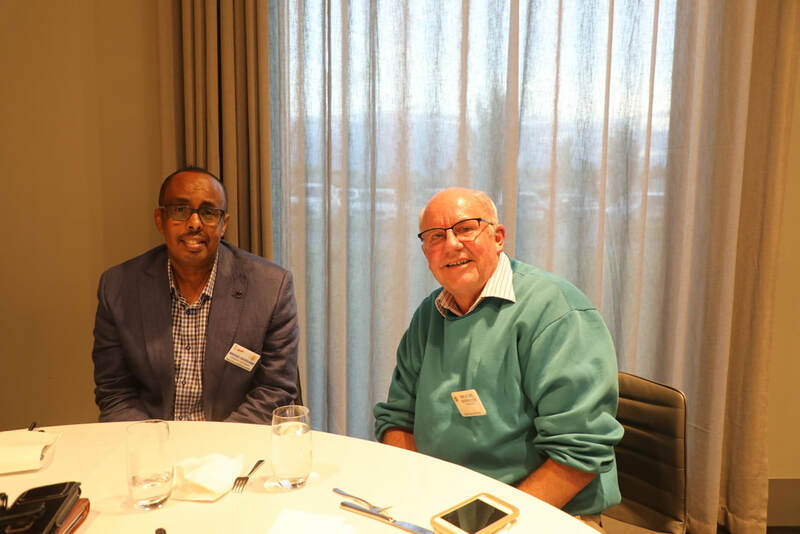 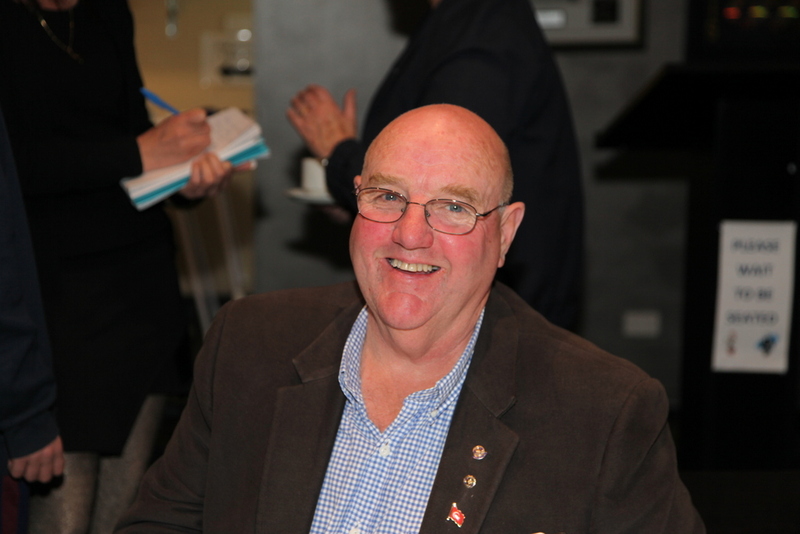 Guest speaker was Rotarian John Osborn who is the former Chief Operating Officer of the Australian Chamber of Commerce and Industries Association. 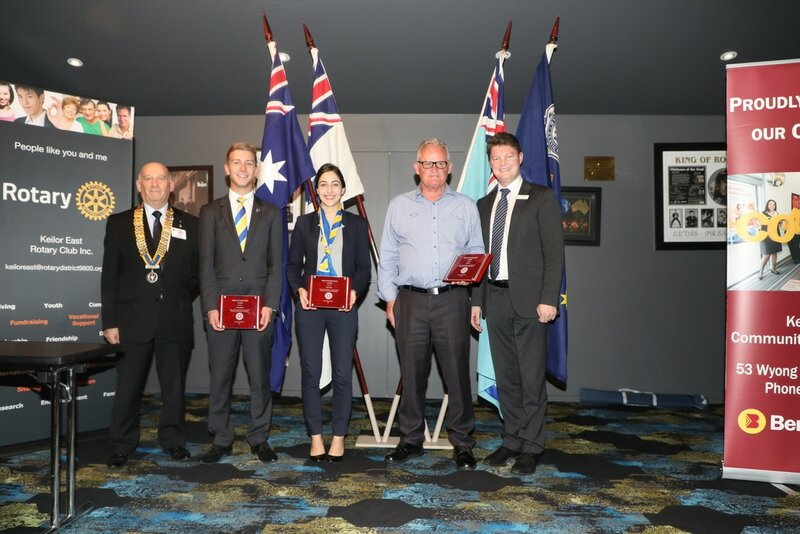 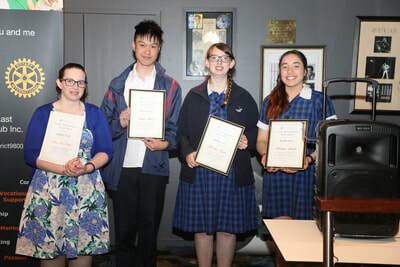 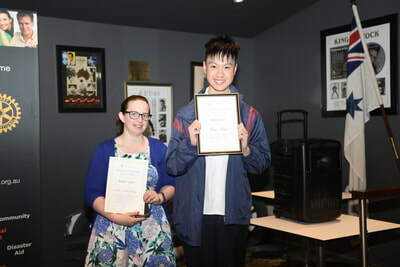 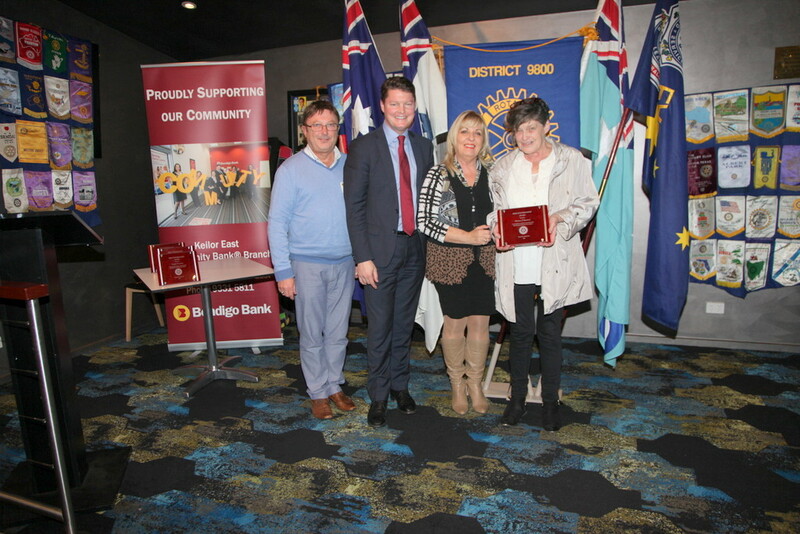 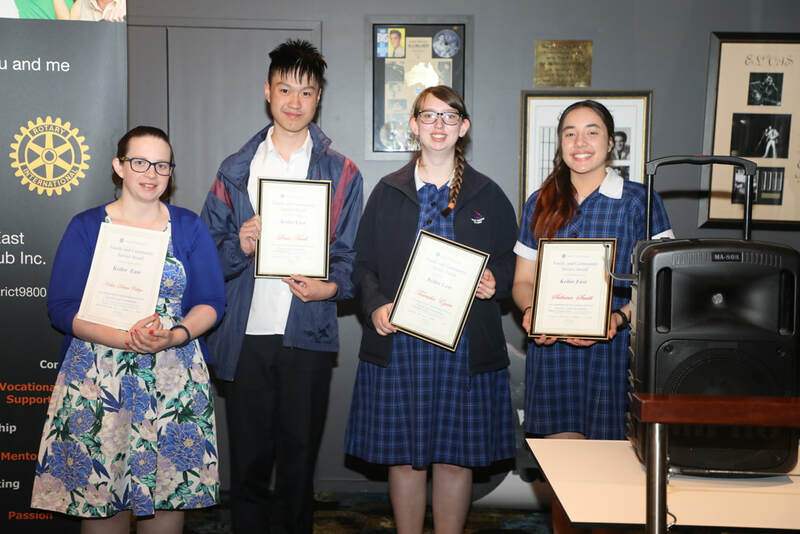 Awards were presented jointly by Mr Ben Carroll, MP for Niddrie and the Mayor of the City of Moonee Valley, Councillor Andrea Surace. We greatly appreciate their wonderful support and thank them for agreeing to make the presentations again this year. Our warmest congratulations go to the Awardees and we thank their family members for coming along and making the night such a success. 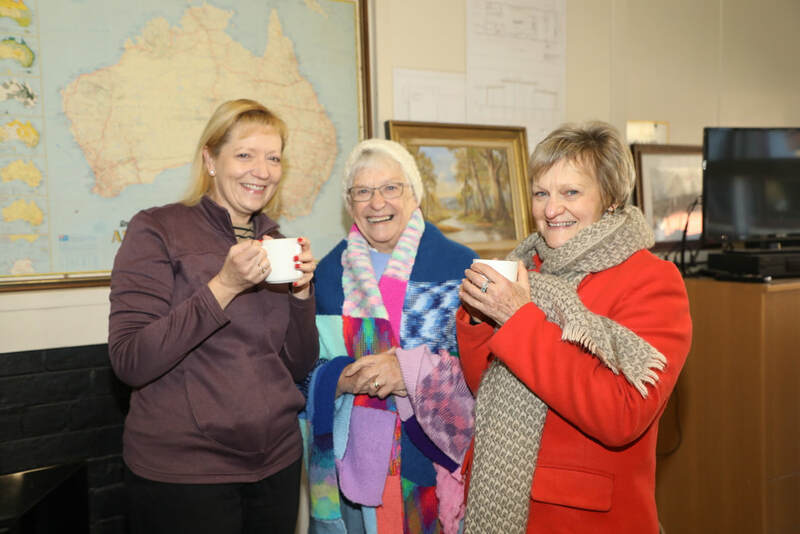 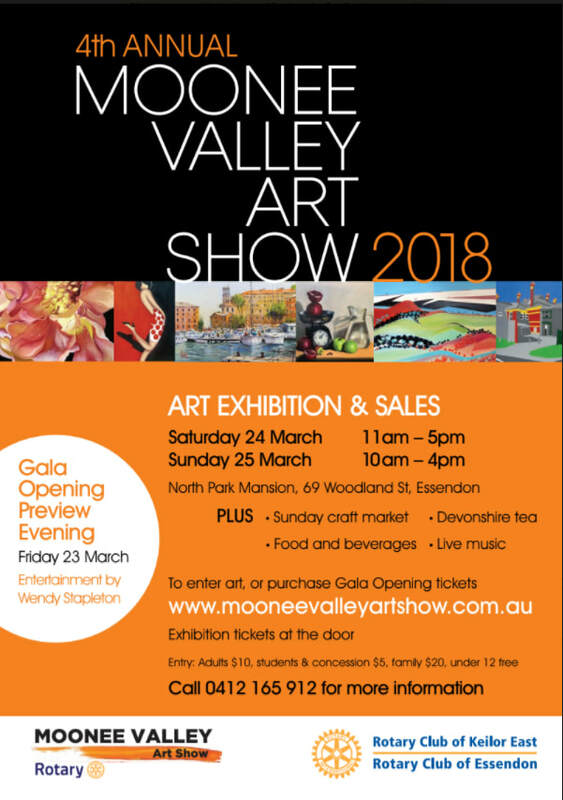 The Rotary Clubs of Keilor East and Essendon are holding the Moonee Valley Art Show again this year. 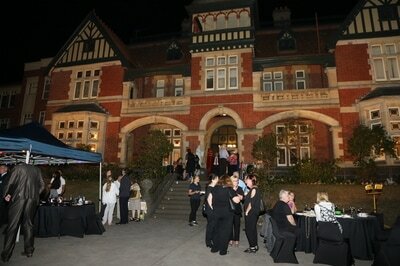 The venue, North Park Mansion in Woodland Street Essendon, is stunning. 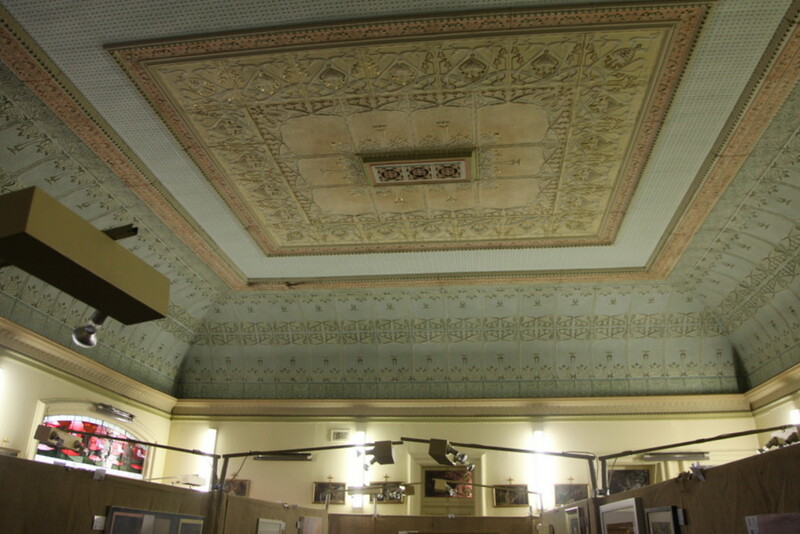 The building is not usually open to the public so it is well worth a visit in itself. 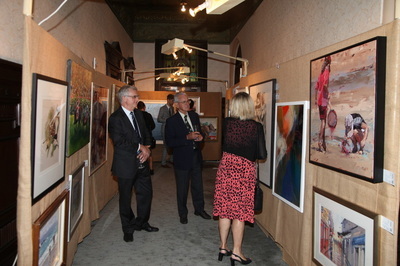 The Gala opening last night was a great success. There will be food and craft stalls, entertainment, face painting etc. 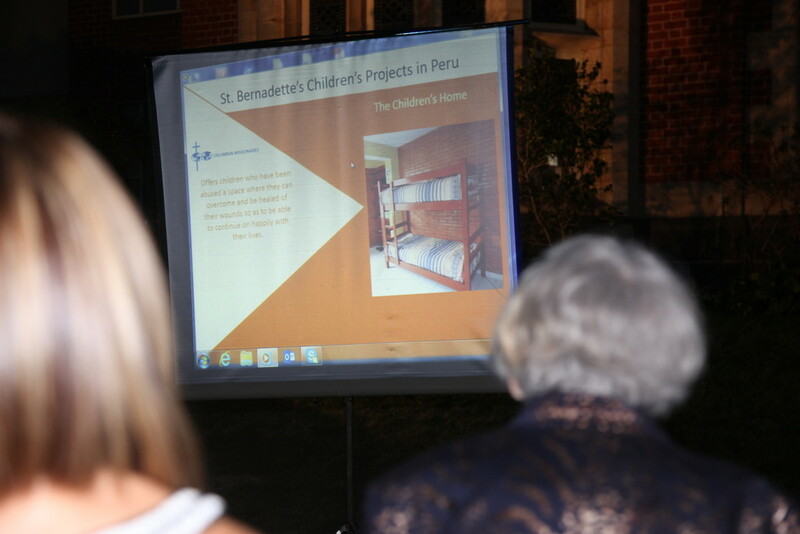 Funds raised will help educate underprivileged children in Lima, Peru. 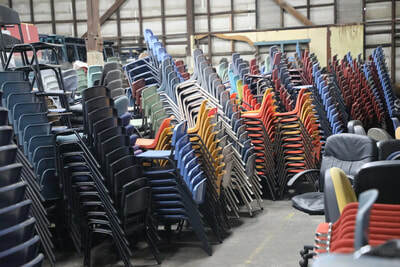 Please spread the word. 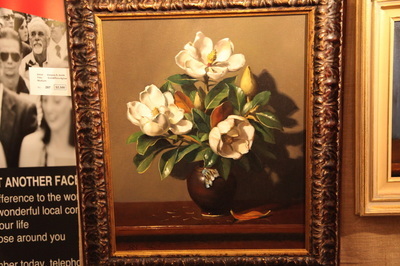 You can see more details of our Art Show at www.mooneevalleyartshow.com.au. Francis Bof, John Holloway, Jo McKenna, John and Sandi O’Sullivan, Helen Penna and Ken Taylor. 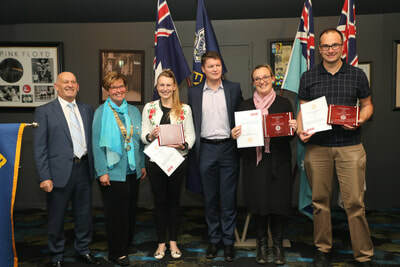 We offer all awardees our sincere congratulations and thank them for their wonderful contributions to the lives of others. 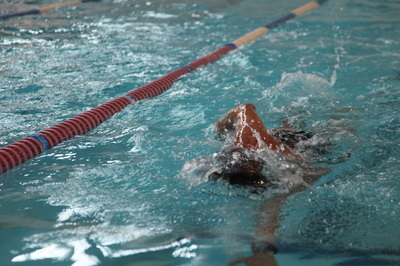 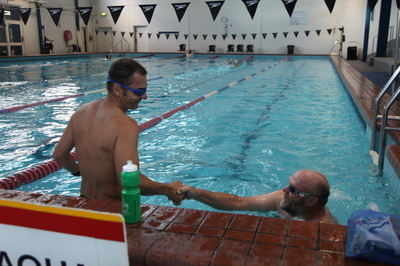 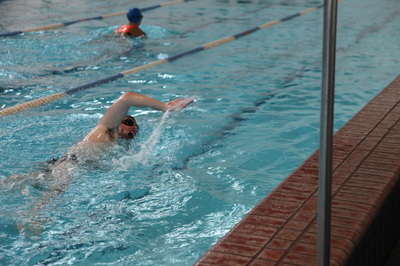 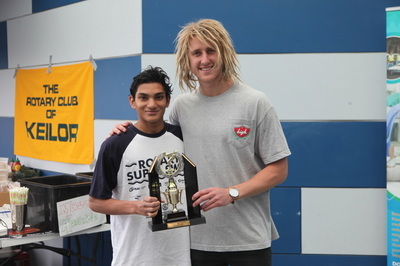 ​On Sunday November 29th our Club took part in a Swimathon to raise funds to help find a cure for Melanoma. 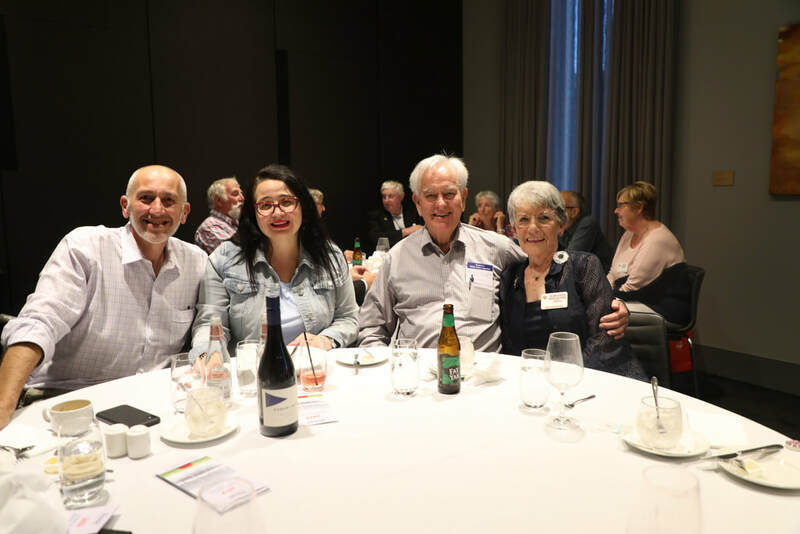 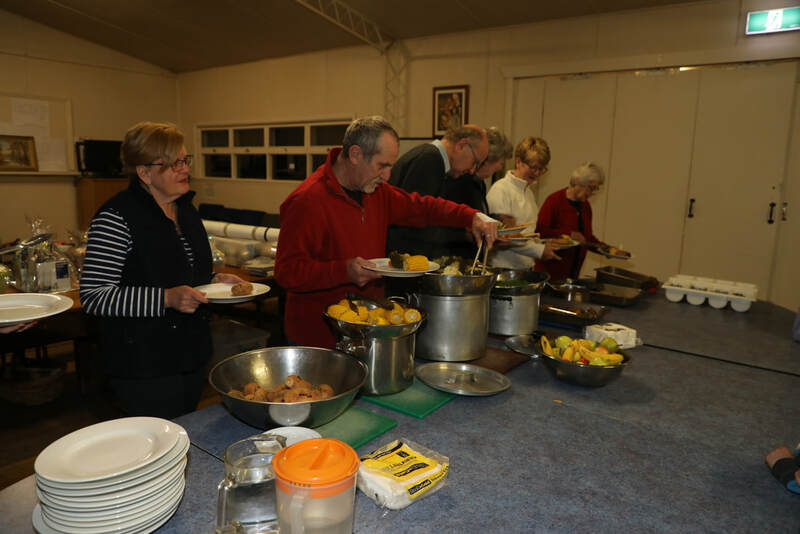 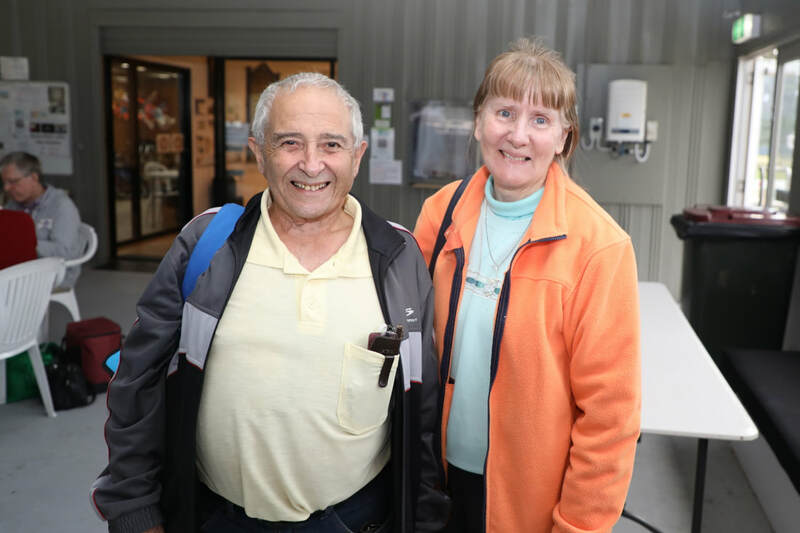 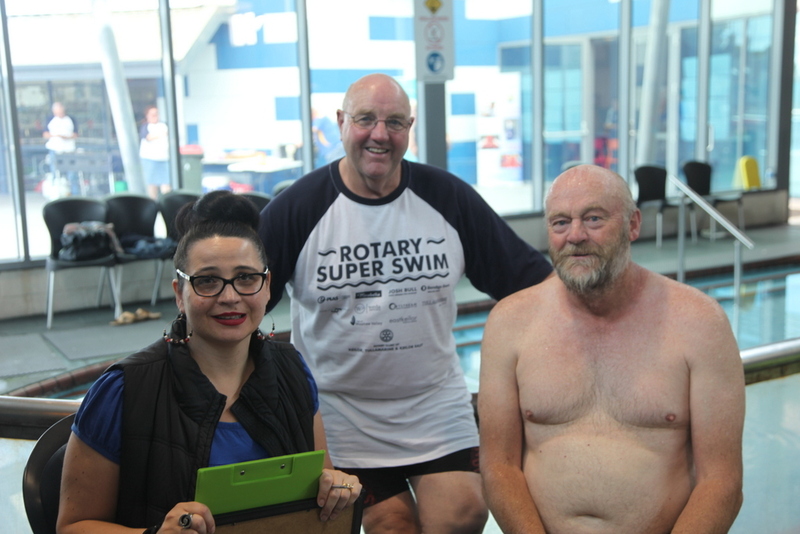 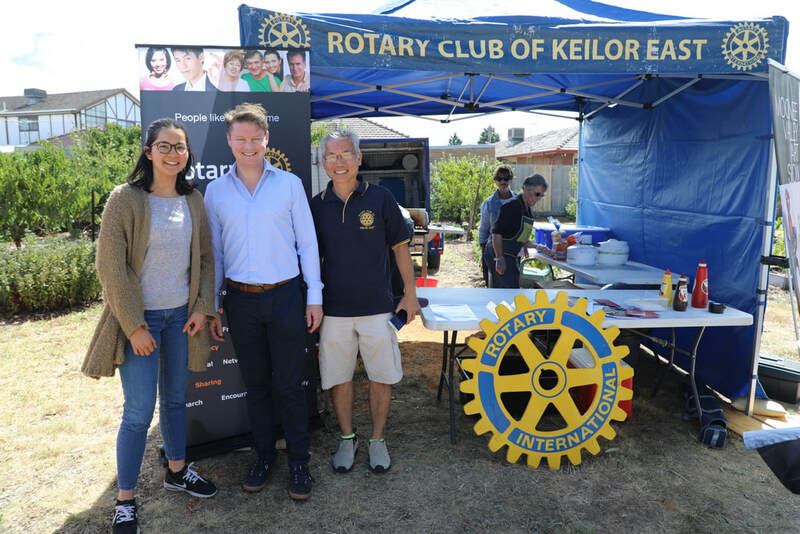 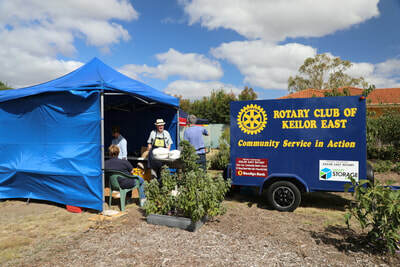 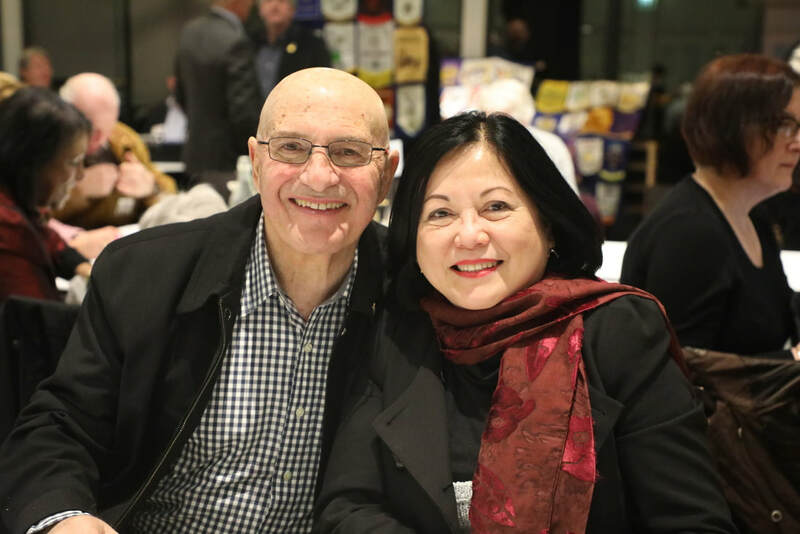 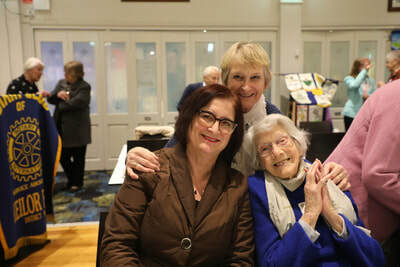 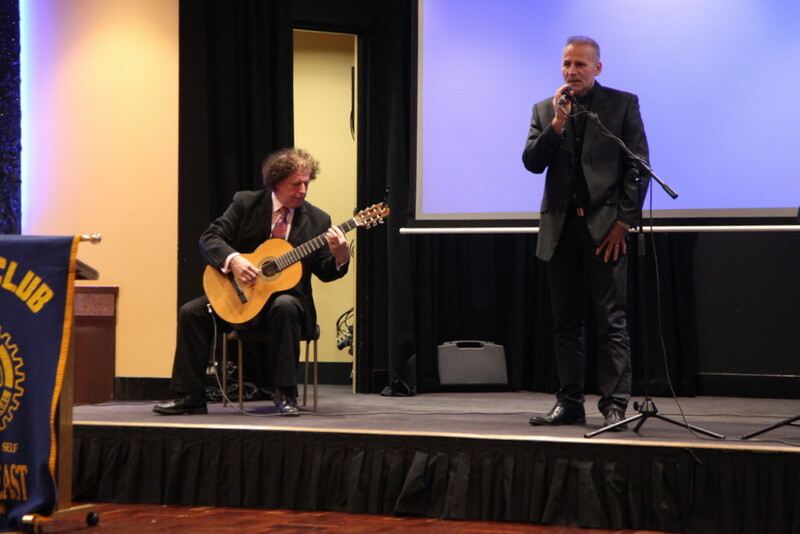 Held at the East Keilor Leisure Centre, this event was held in conjunction with the Rotary Clubs of Tullamarine and Keilor. 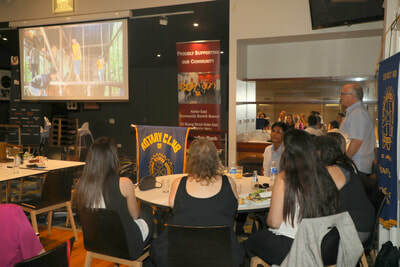 This week we joined the Rotary Club of Brimbank Central to hear Ian Crawford speak about his career in the TV series production business. Ian is the nephew of the late Hector Crawford. 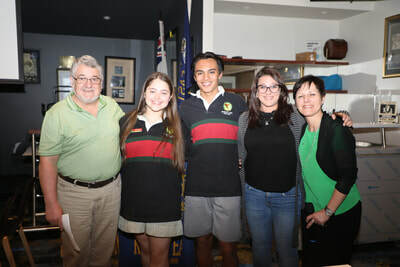 We also heard from 17 year old Year 12 student Luke Corson who has been chosen as a delegate to take part in a United Nations Youth Australia Young Diplomats tour. He is seeking sponsorship to assist with the costs involved. 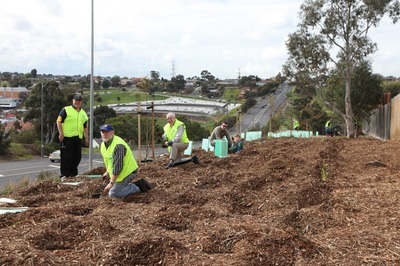 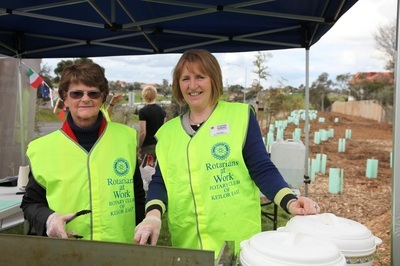 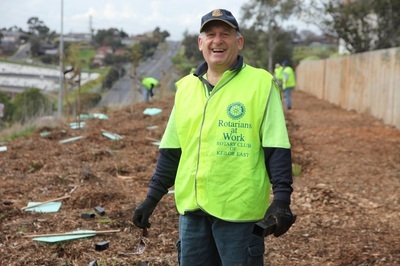 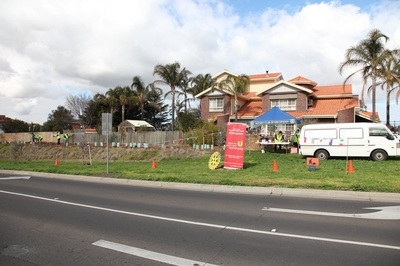 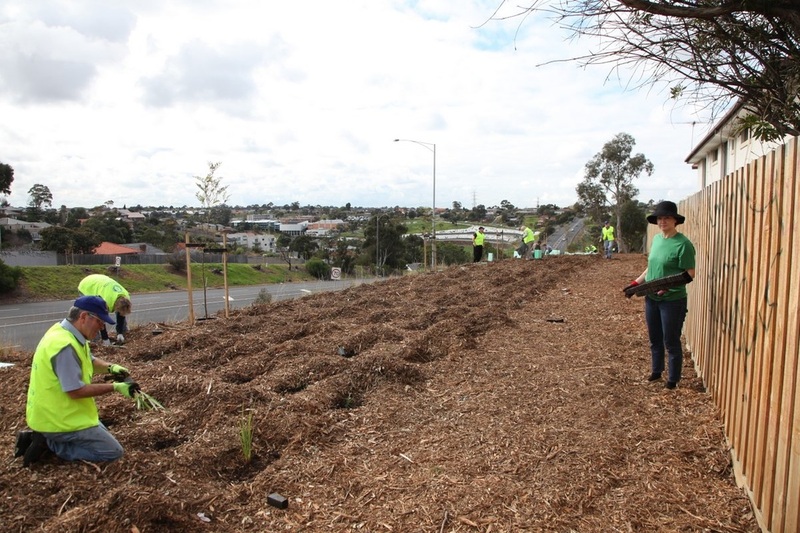 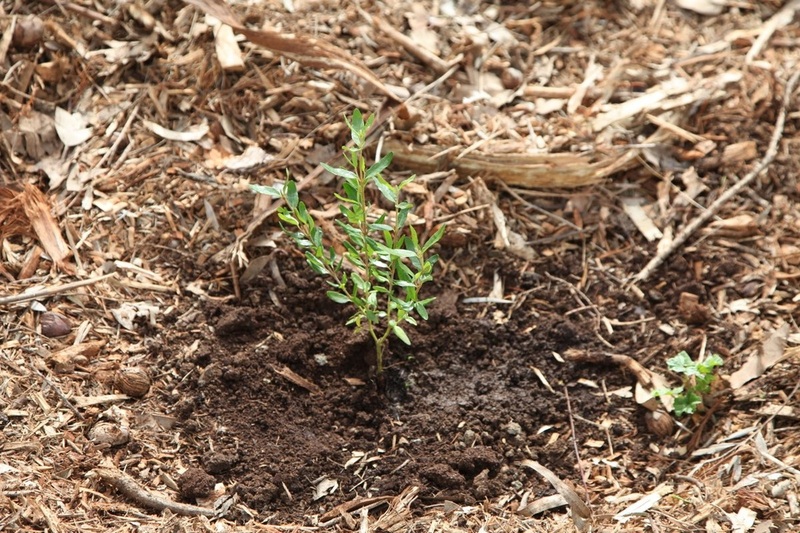 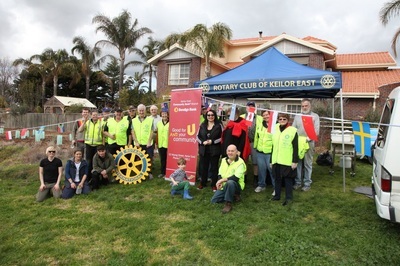 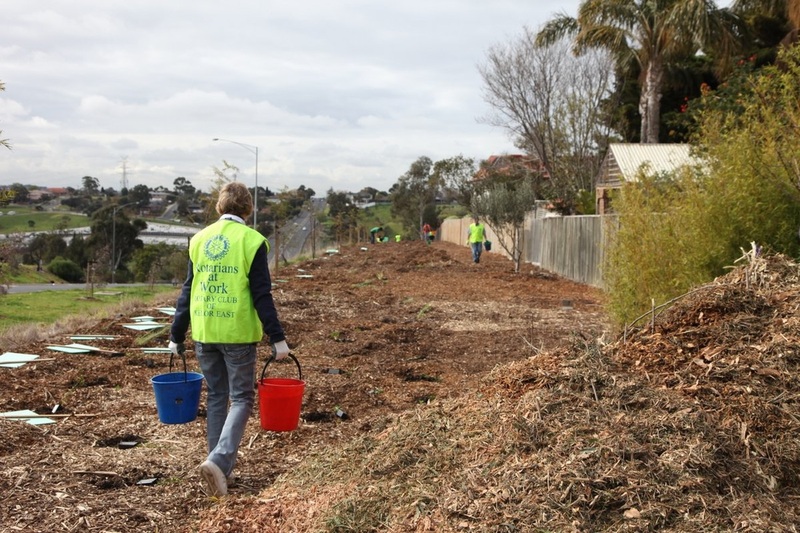 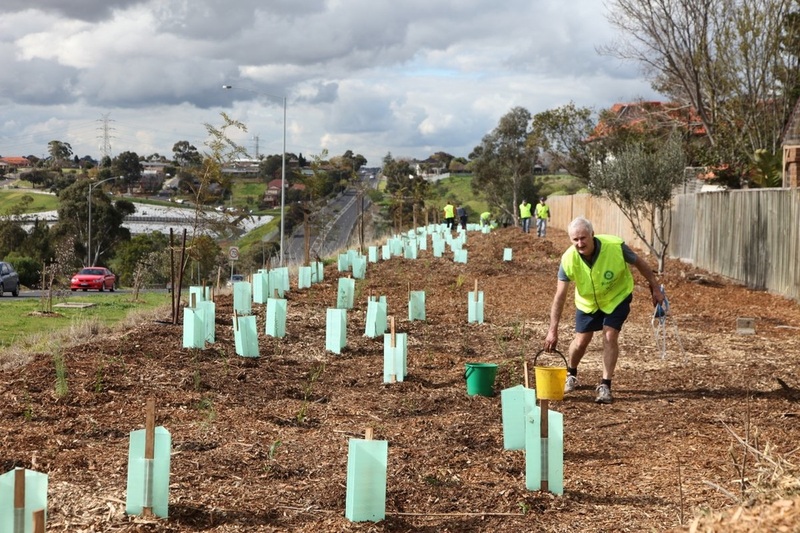 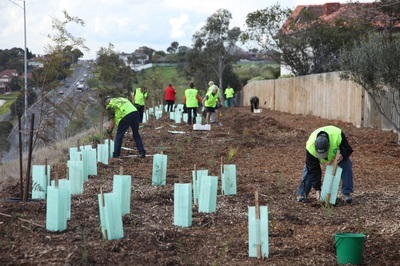 On Saturday 15th August our Club held a Tree Planting Day in conjunction with the Parks and Gardens division of the City of Moonee Valley.The special effort was part of the Rotarians@ Work campaign. 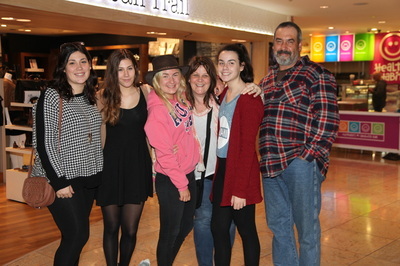 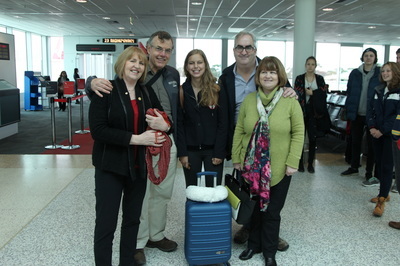 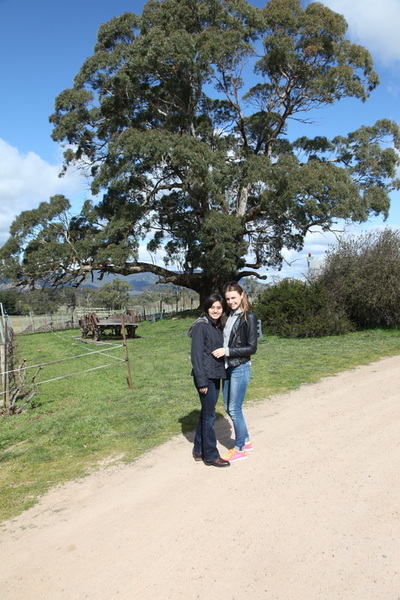 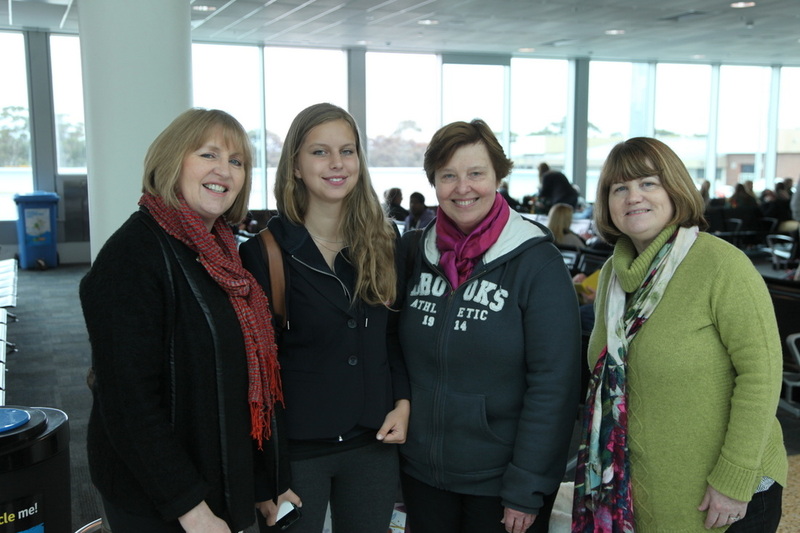 Our Rotary Youth Exchange student, Helena Palli from Austria, arrived on Saturday 1st August. We warmly welcome her to our Club. 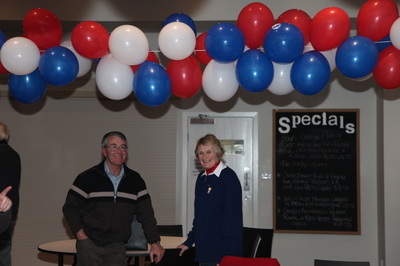 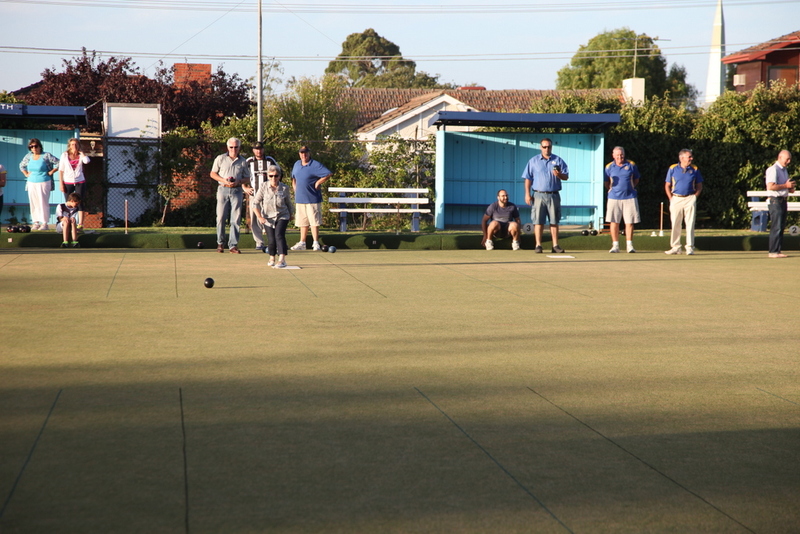 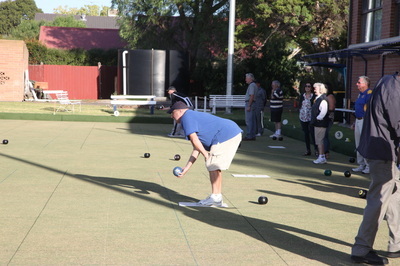 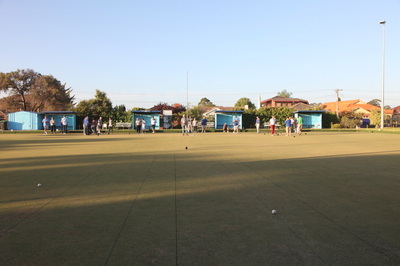 We held our Club Changeover at the Clifton Park Bowling Club in Aberfeldie on Monday 29th June. 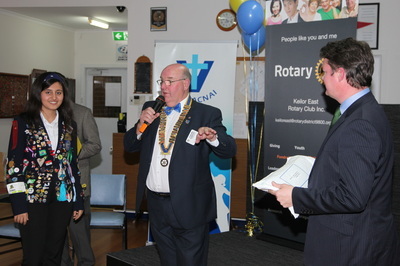 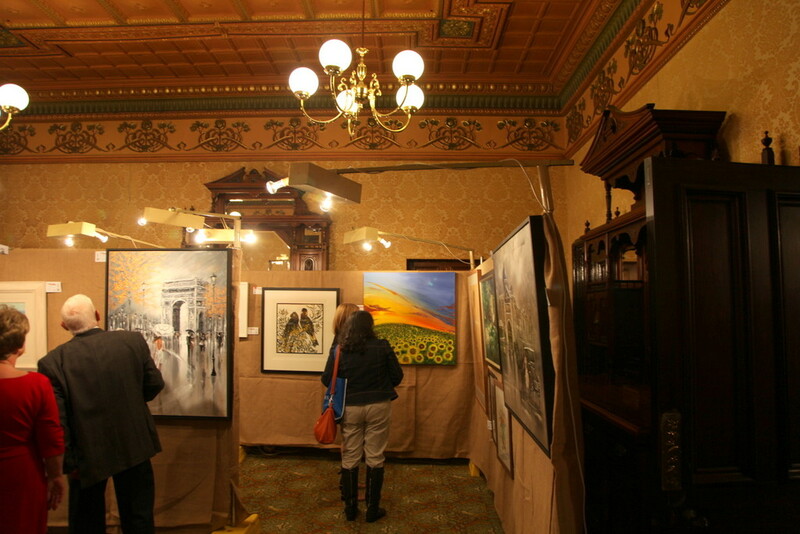 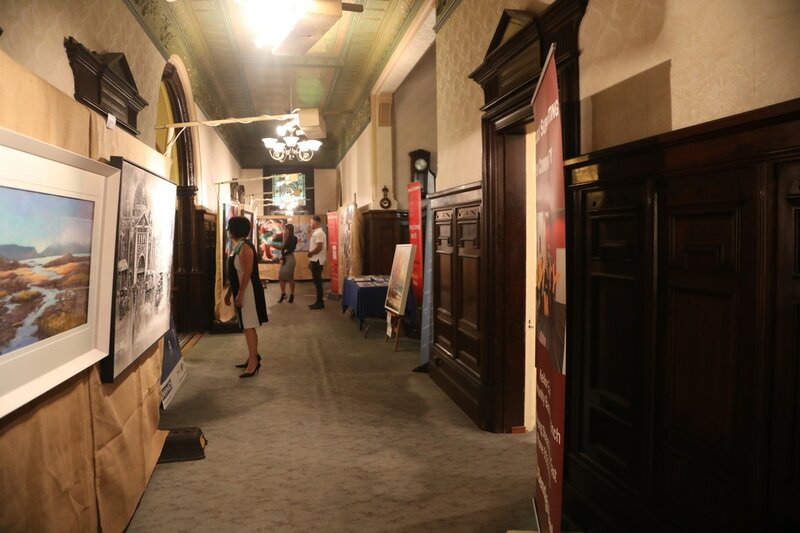 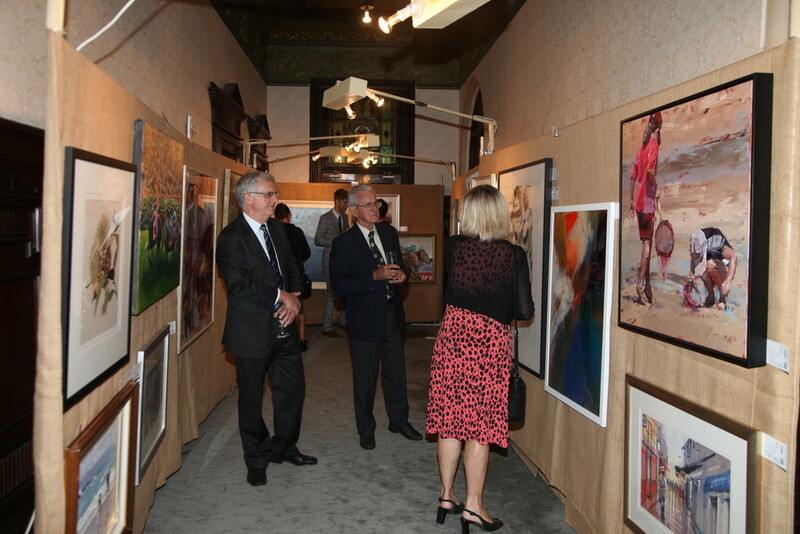 From Friday 27th Feb until Sunday 1st March we held our first Art Show on conjunction with the Rotary Club of Essendon. It was a great success and we hope to run it again in 2016. 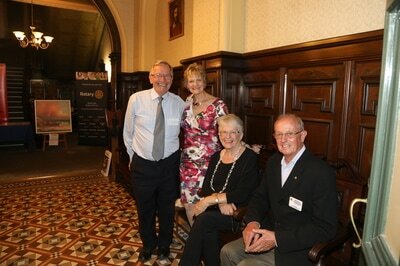 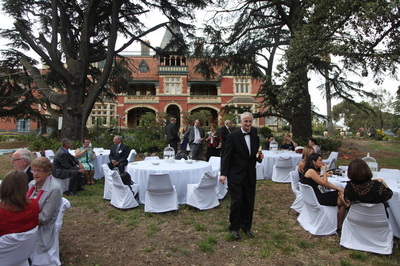 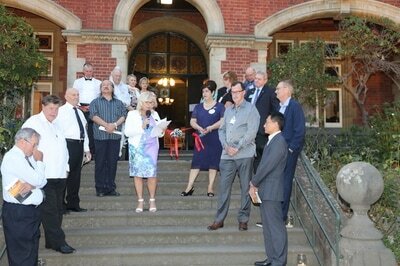 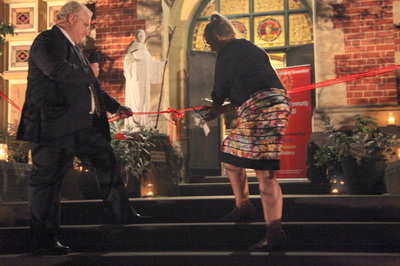 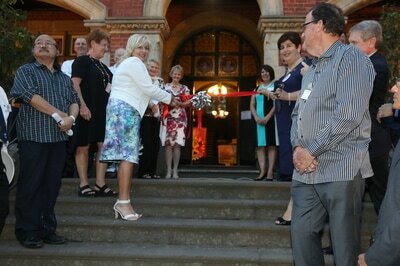 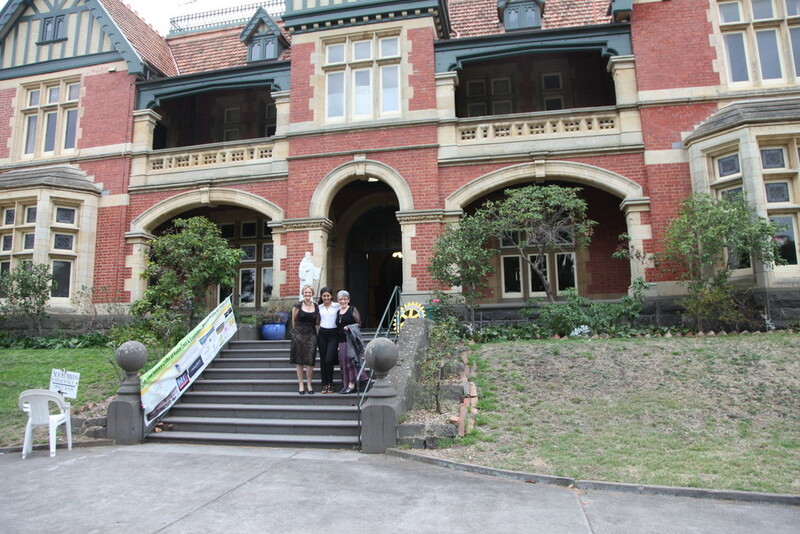 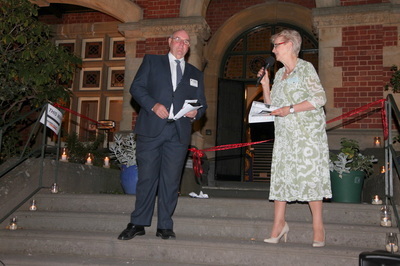 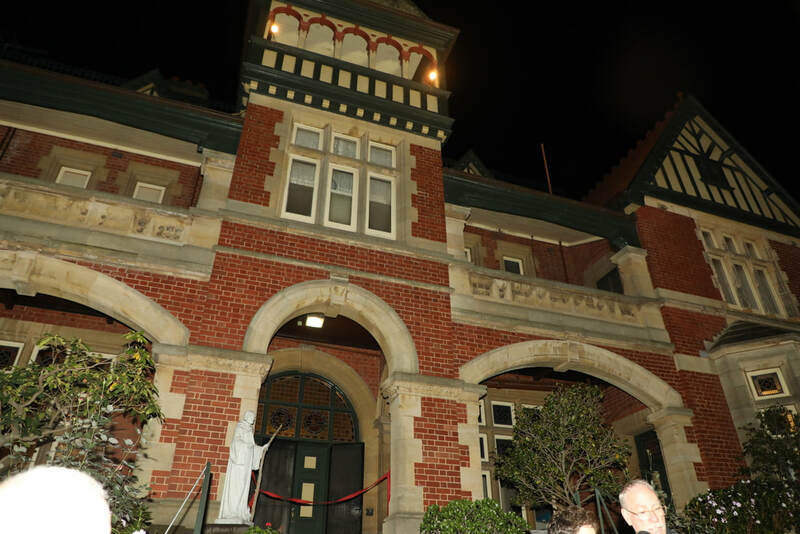 The stunning venue was the St.Columbans Mission at North Park Mansion in Woodlands Street, Essendon. 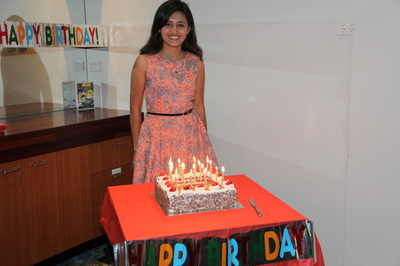 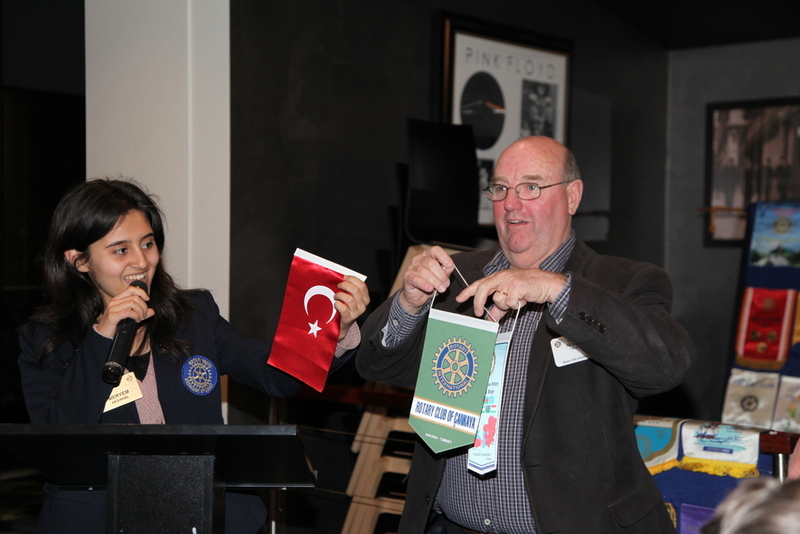 This Monday, February 2nd, we celebrated the 17th Birthday of our Rotary Youth Exchange Student, Meryem Aksakal of Ankara, Turkey. 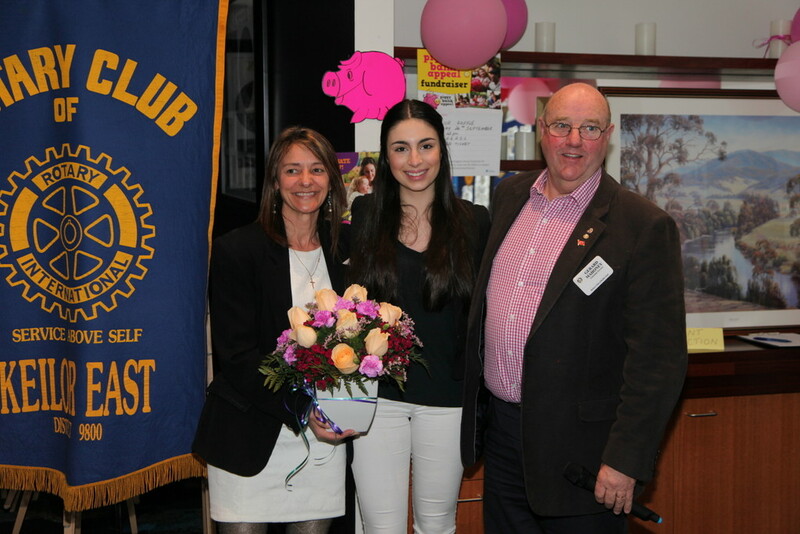 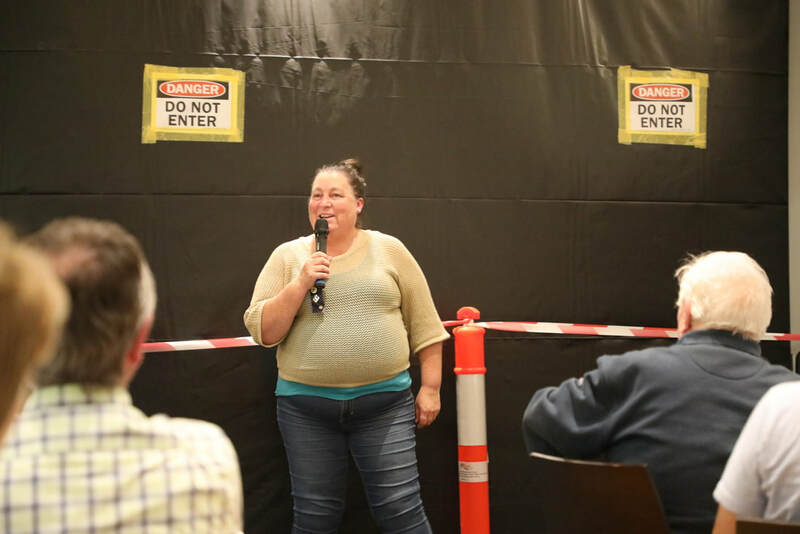 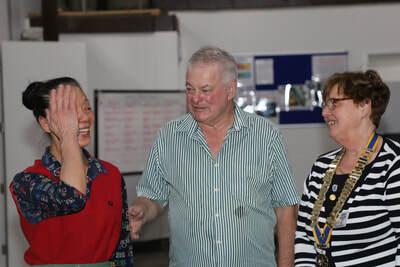 Meryem, who is currently being hosted by our President, Gerard Mahoney, and his wife Lynn, thanked Club Members for hosing her and for the welcome she has received in Australia. 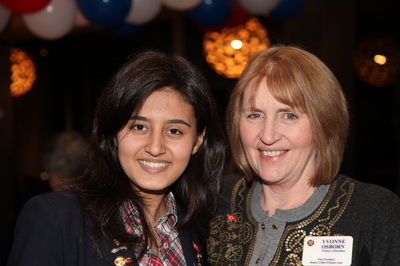 Our Happy Birthday greetings go to Meryem and our very best wishes go to her for the remainder of her stay in Australia. 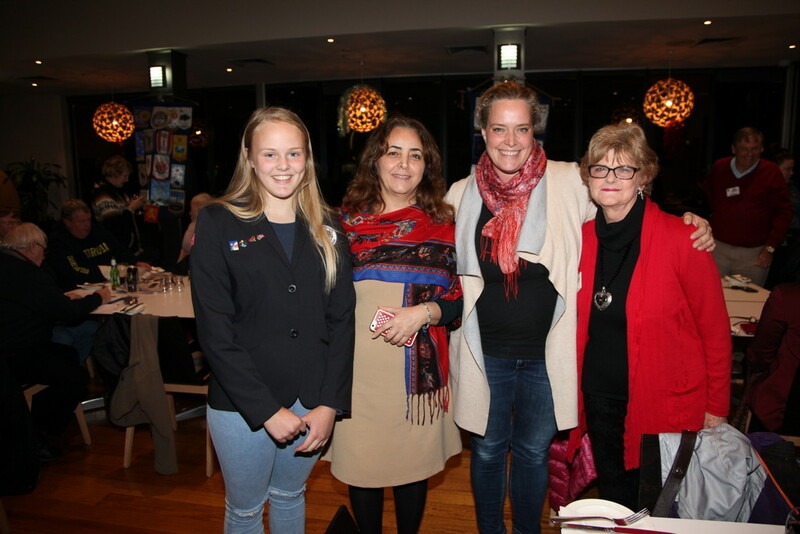 Meryem was pleased that Andrea Mansell and her daughter Olivia, Mother and sister of our outgoing Youth Exchange Student, Brendan, were able to join us for the evening. 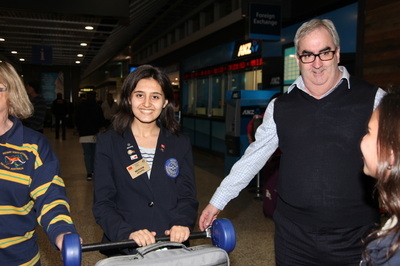 They reported that Brendan has settled in well in Ankara and is currently on Orientation Camp. We wish him well for his 12 month Youth Exchange. 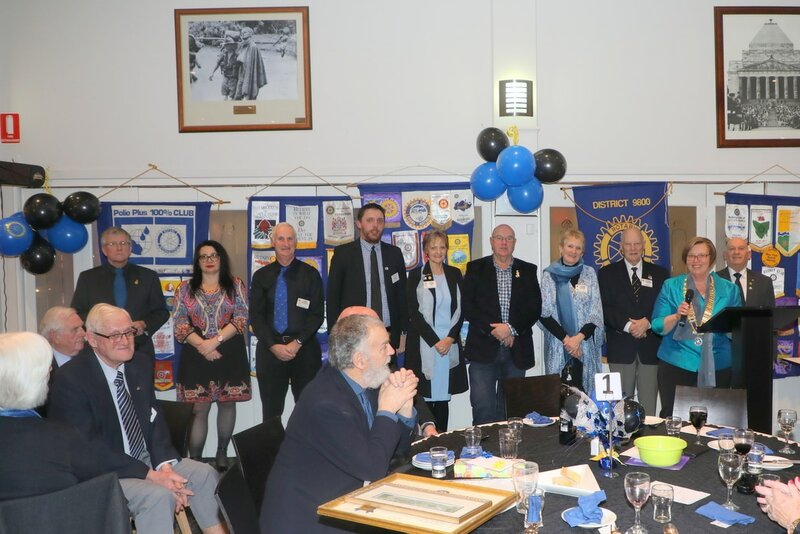 So much has been happening at our Club lately it is hard to know where to begin. 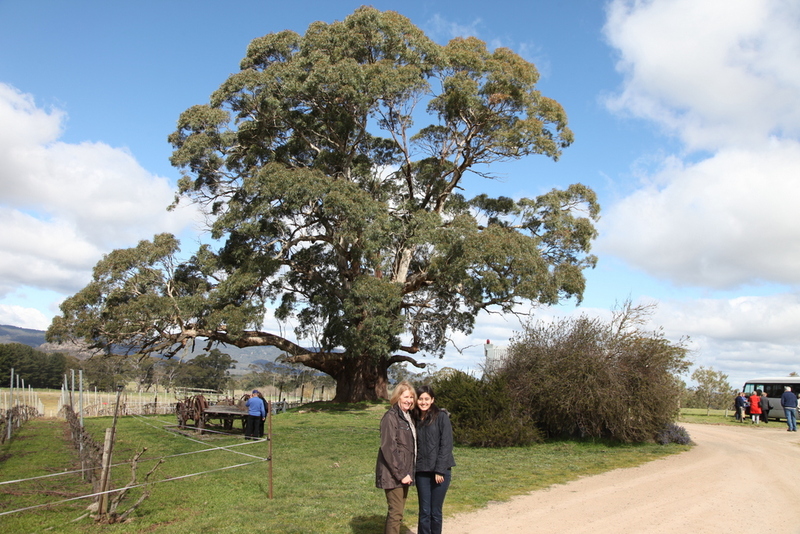 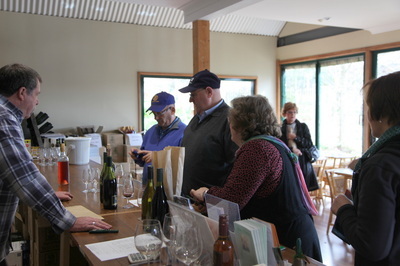 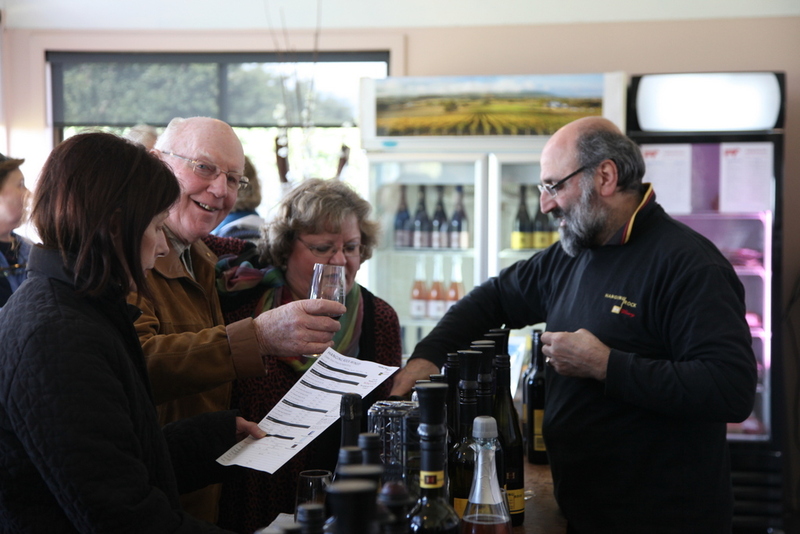 We celebrated our Club's 31st Birthday with a Winery Tour of wineries at Romsey, Hanging Rock and Gisborne Peak. 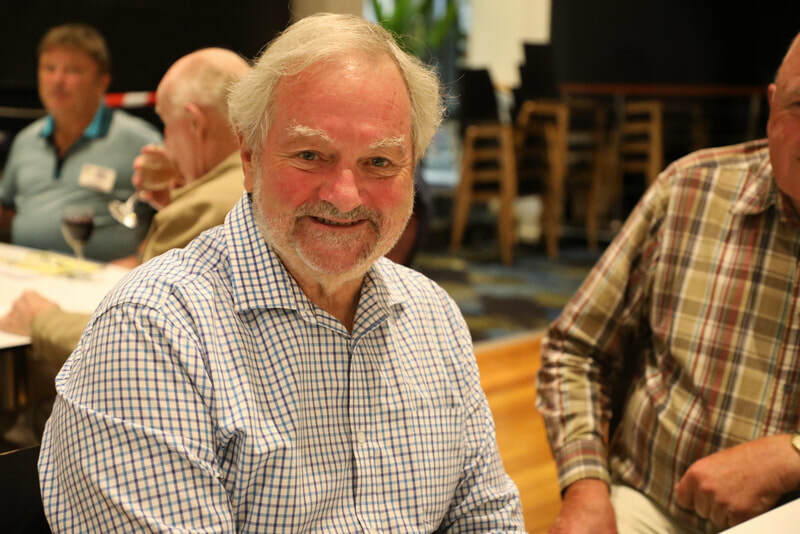 Past President John Bergbauer drove the bus and, between wineries, we enjoyed a Birthday lunch at the Woodend Hotel on Sunday 24th August. 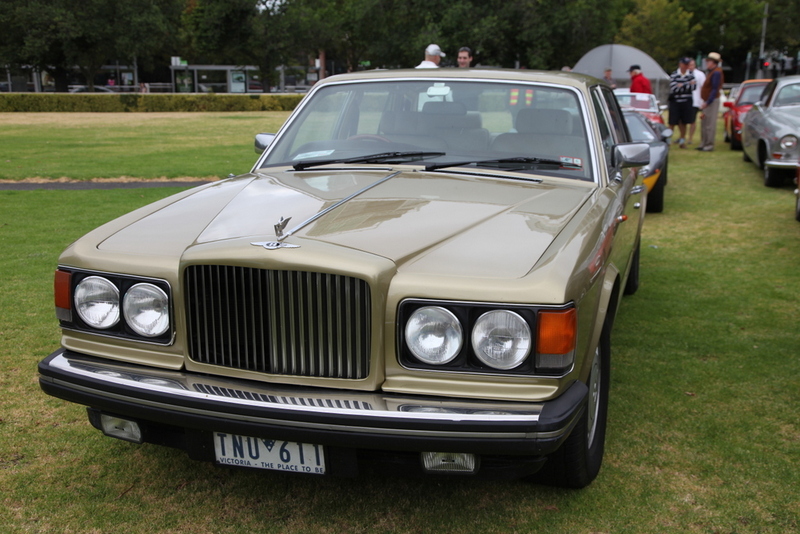 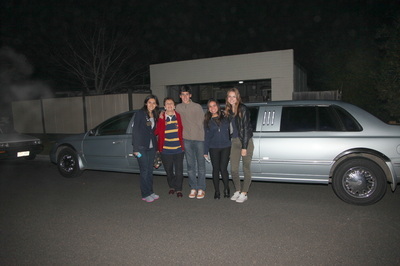 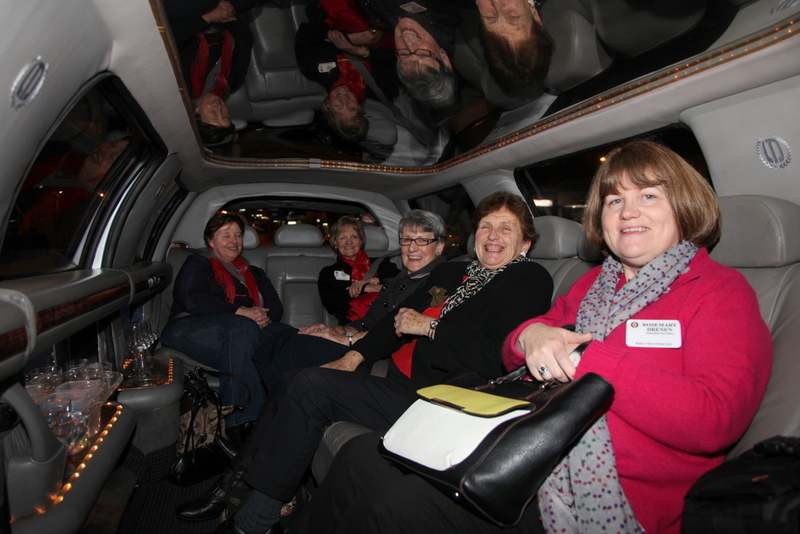 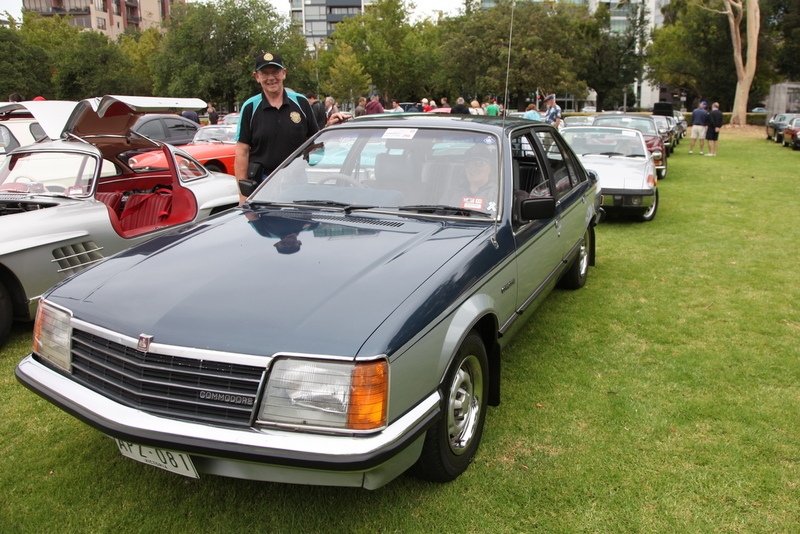 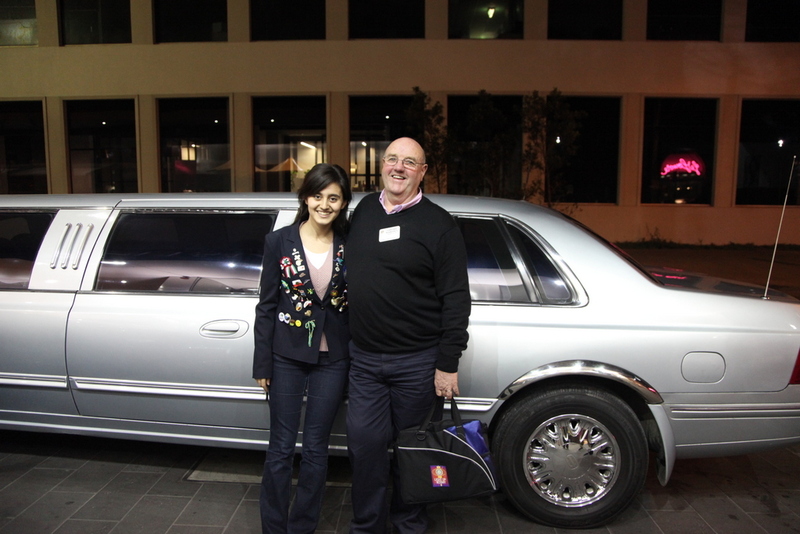 On 26th August some Club Members were driven to the Rotary Club of Melbourne Park's Meeting in South Yarra in President Gerard's limousine. 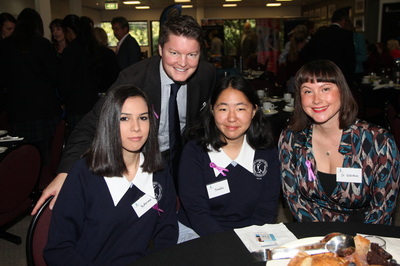 The sobering topic was Youth Suicide Awareness. Our Club Meetings have featured excellent Guest Speakers and we are kept updated on her Australian experiences by our delightful Rotary Youth Exchange student, Meryem Aksakal from Ankara, Turkey. 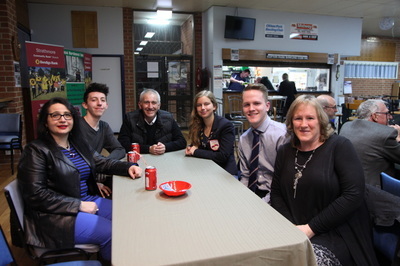 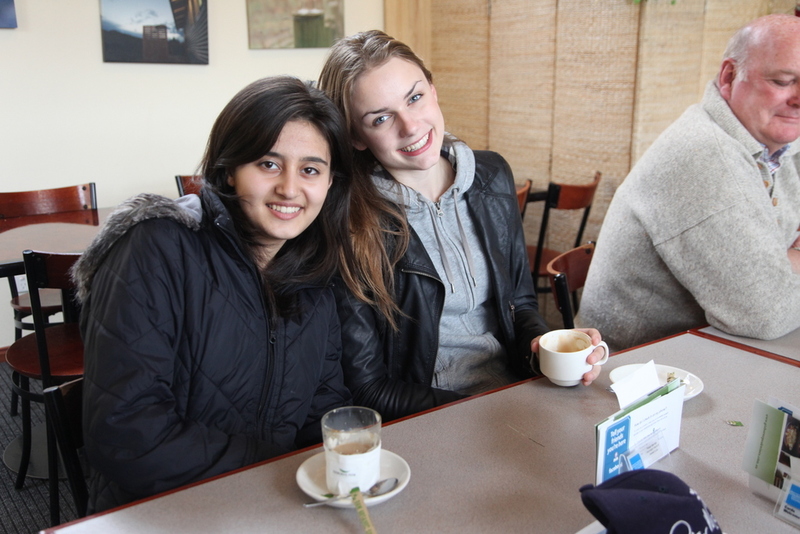 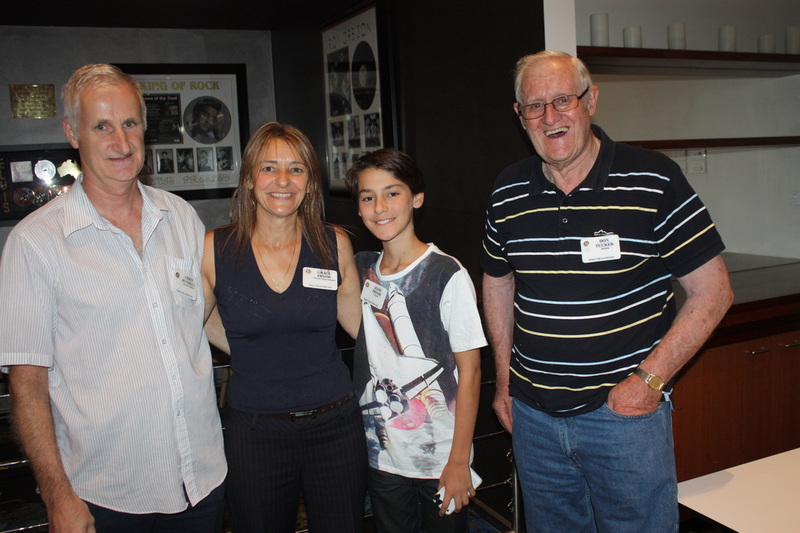 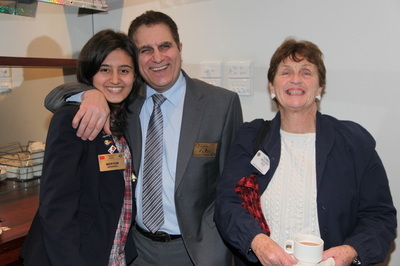 Our NYSF (National Youth Science Forum) student from Penleigh-Essendon Grammar School visited our Club with her parents. She wanted to thank Youth Director Grace Pryor and our Club for sponsoring her to attend the NYSF camp in Canberra next January. 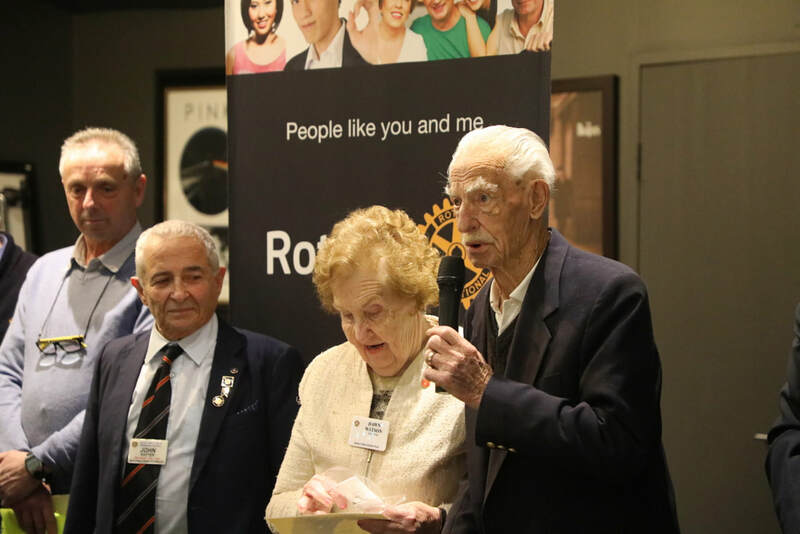 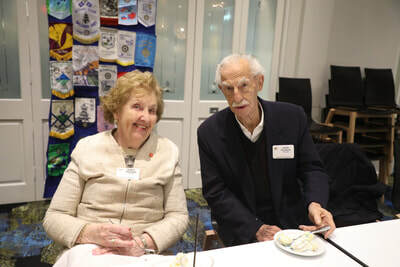 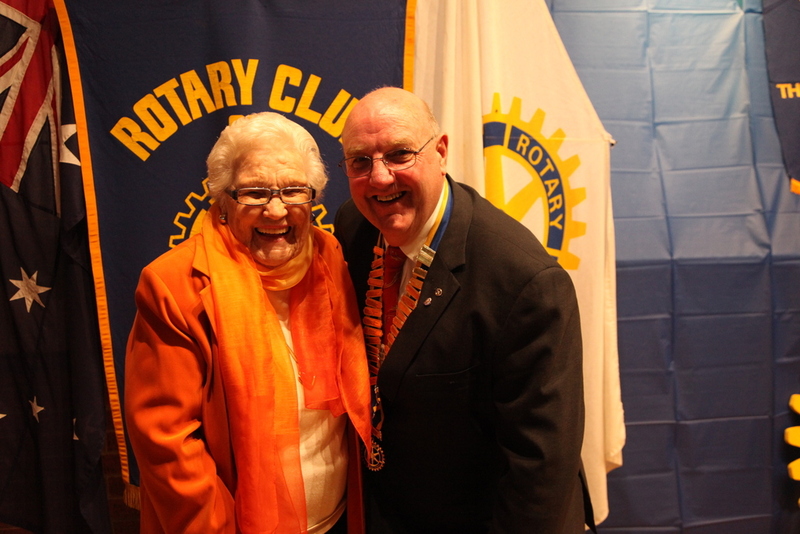 On Monday 11th August 2014 the District Governor of Rotary District 9800, Murray Verso, and his wife Irene made their Official Visit to our Club. 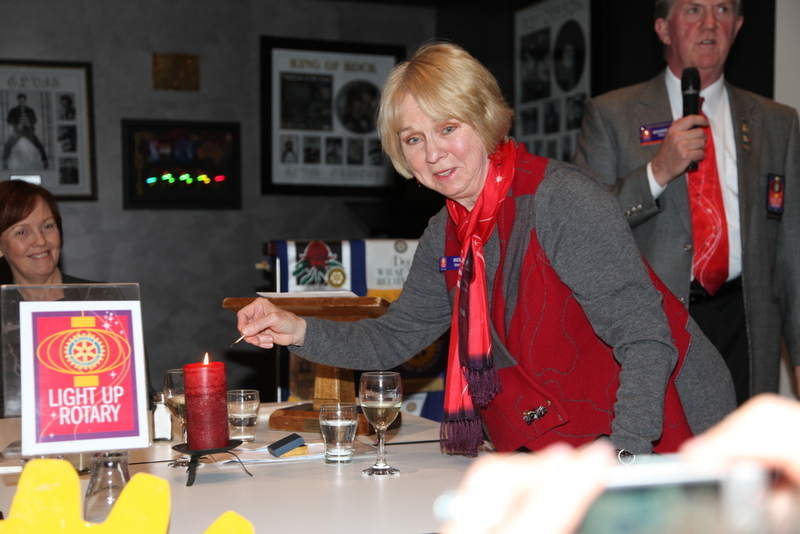 In the spirit of the theme for this Rotary Year, Light Up Rotary, Irene lit a red candle. Murray addressed the Club about what it meant to him be a Rotarian and how we should spread the word and encourage others to join our great service organization. 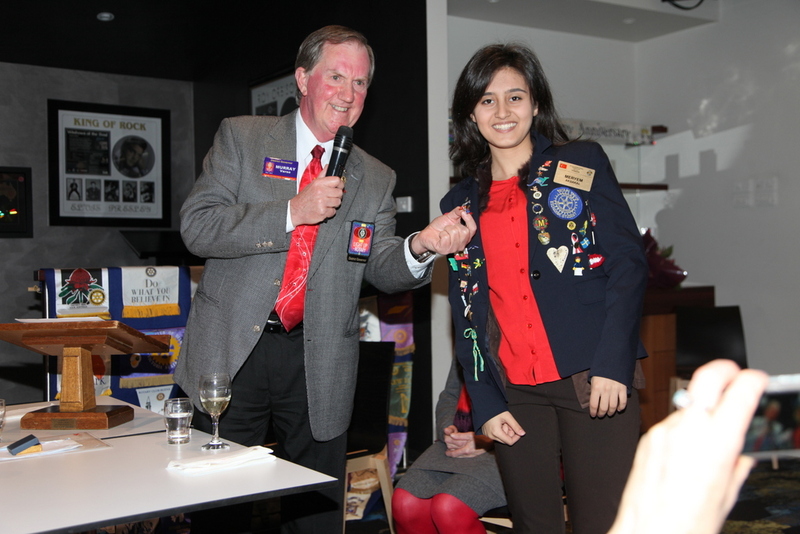 Murray presented our Turkish Youth Exchange Student, Meryem Aksakal with a Turkish/ Australian Rotary Friendship pin for her Exchange blazer. Irene presented a Paul Harris with Sapphire pin to Vanda Mullen for her great work in the Youth and training areas of District 9800. 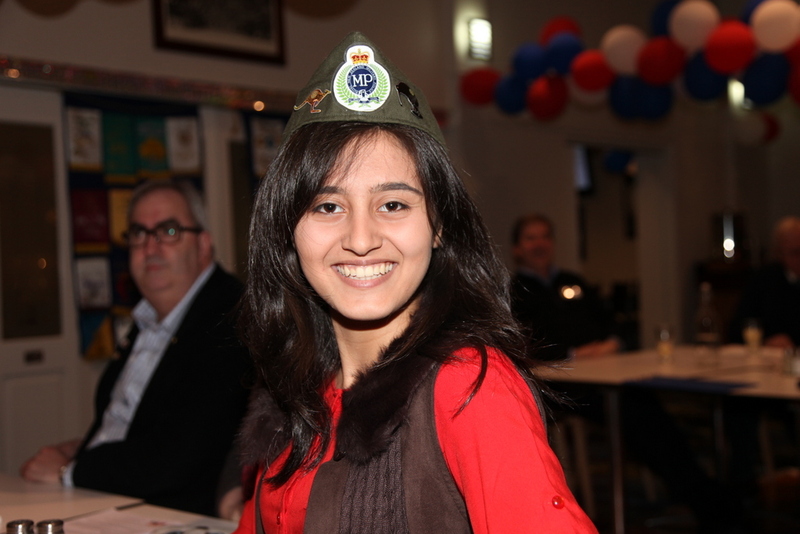 Meryem assisted with the Sergeant's session, wearing Sergeant Daryl Cornish's hat. 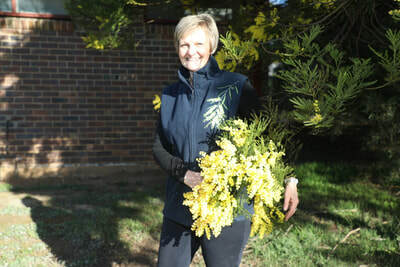 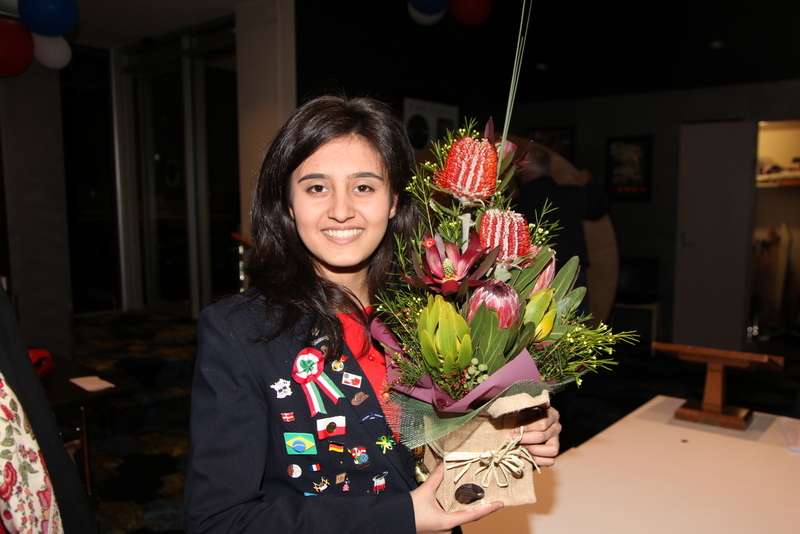 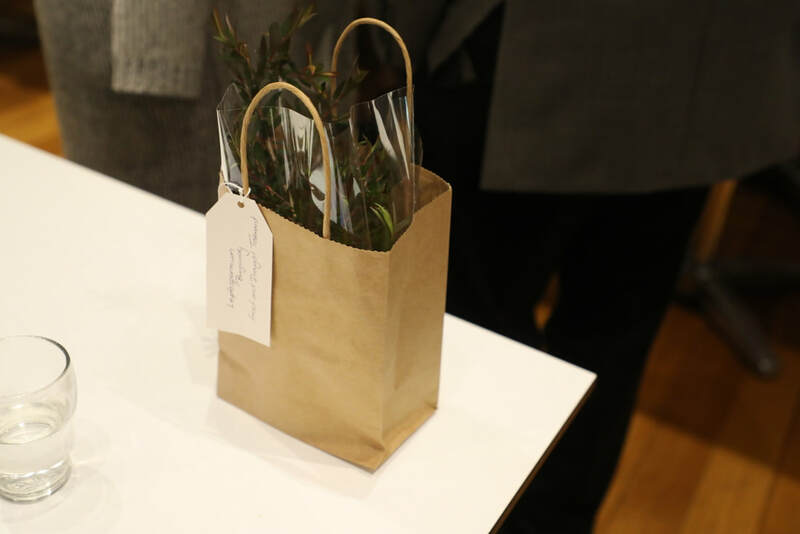 Australian native flowers were presented to Meryem and a bouquet to our First Lady, Lynn Mahoney. Our Youth Exchange Student Meryem Aksakal from Ankara, Turkey, presented banners from her Rotary Club and her Rotary District to President Gerard Mahoney. 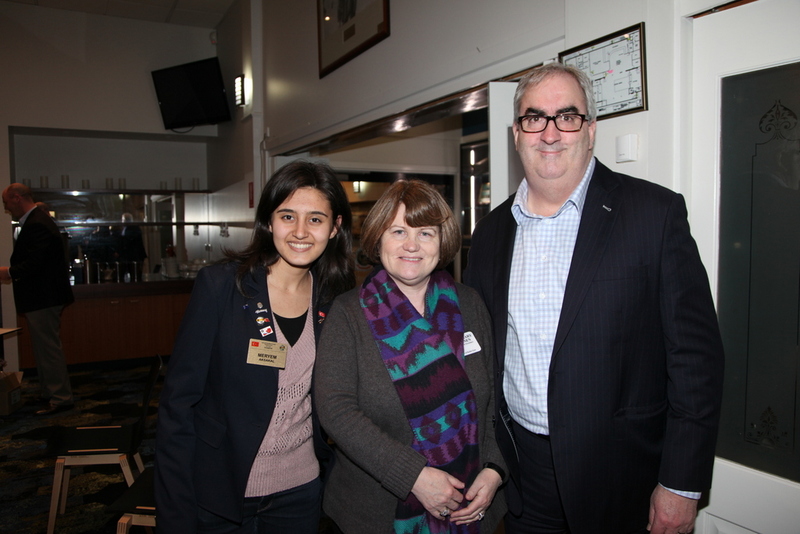 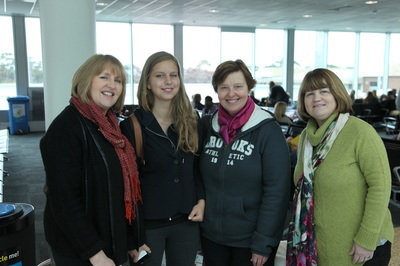 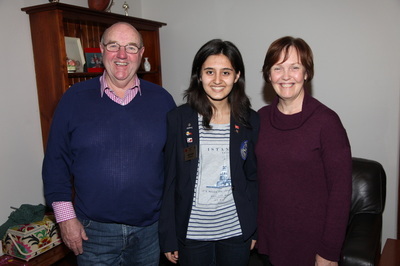 Meryem is pictured below with Youth Exchange Chairperson, Vanda Mullen and President Gerard. She is also pictured with her first host family, Chris and Rosemary Drenen. 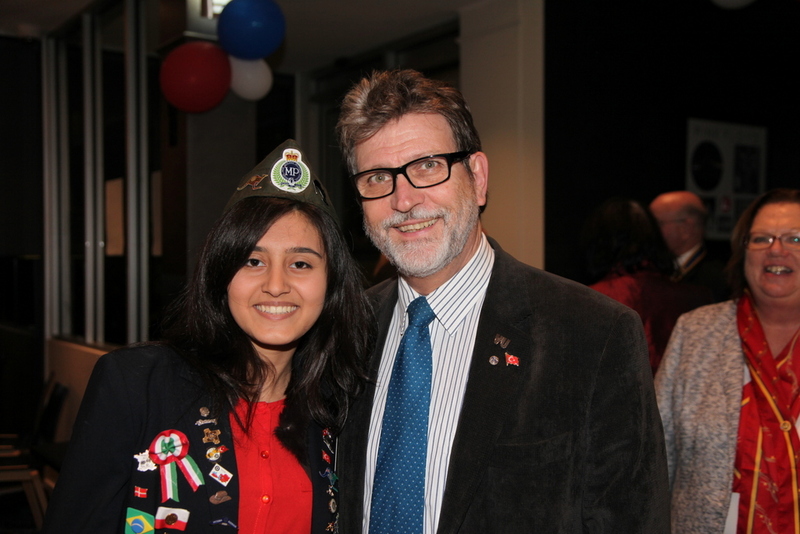 We are proud to welcome our new Rotary Youth Exchange Student, Meryem Aksakal, from Ankara, Turkey. She arrived at Melbourne Airport on the evening of July 22nd, 32 hours after leaving home. 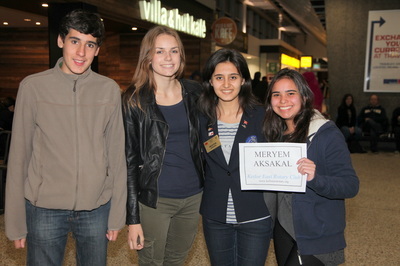 Club Members, District 9800 Youth Exchange Committee Members and fellow Youth Exchange students from Spain, Brazil and Sweden were there to meet Meryem. 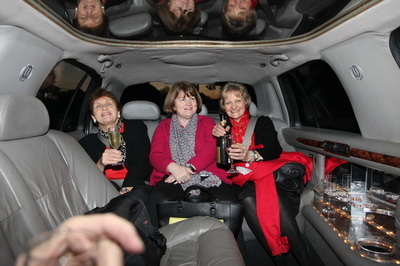 We travelled in President Gerard Mahoney's stretch limousine which was a real treat for young and old. 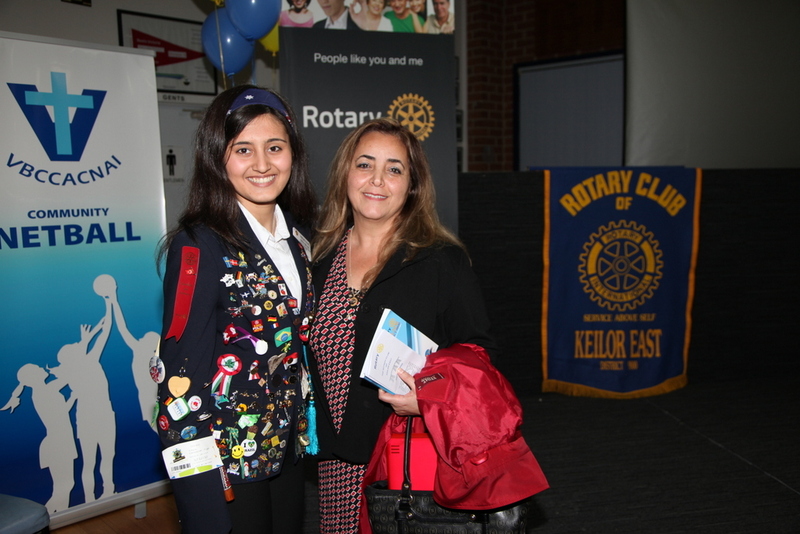 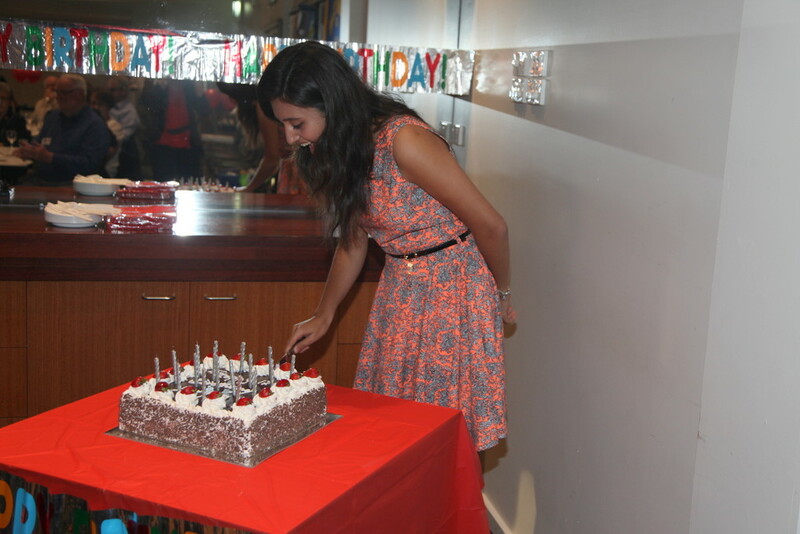 We extend our warmest wishes to Meryem for a wonderful year in Australia. 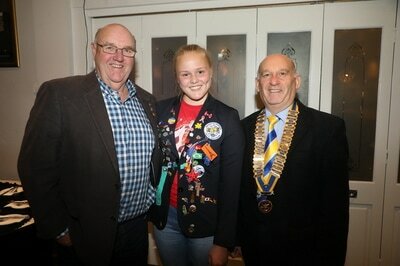 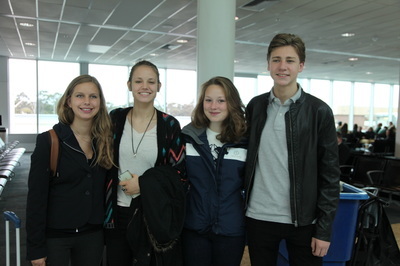 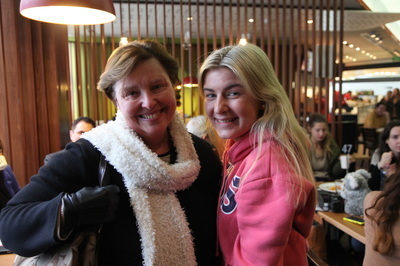 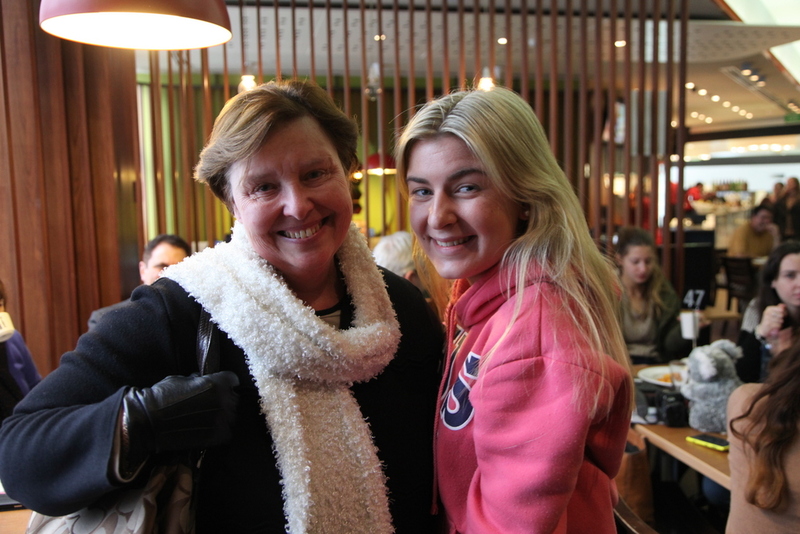 Our Rotary Youth Exchange Student, Alexandra Kamppinen went home to Finland after a year with our Club. 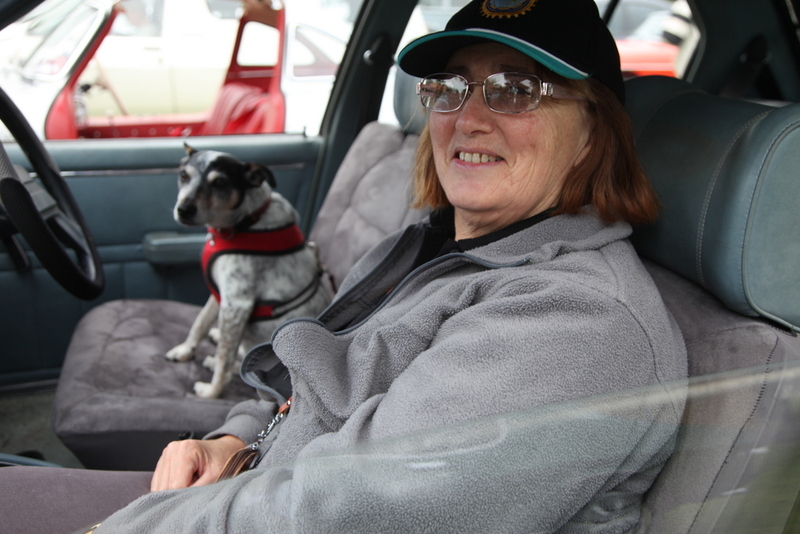 We said farewell to her on Saturday 12th July at Melbourne Airport. We wish her well for her Year 12 studies which begin in August and we hope she will return to for a visit in the future. 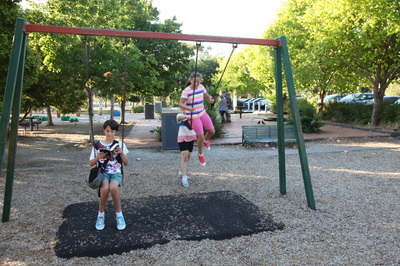 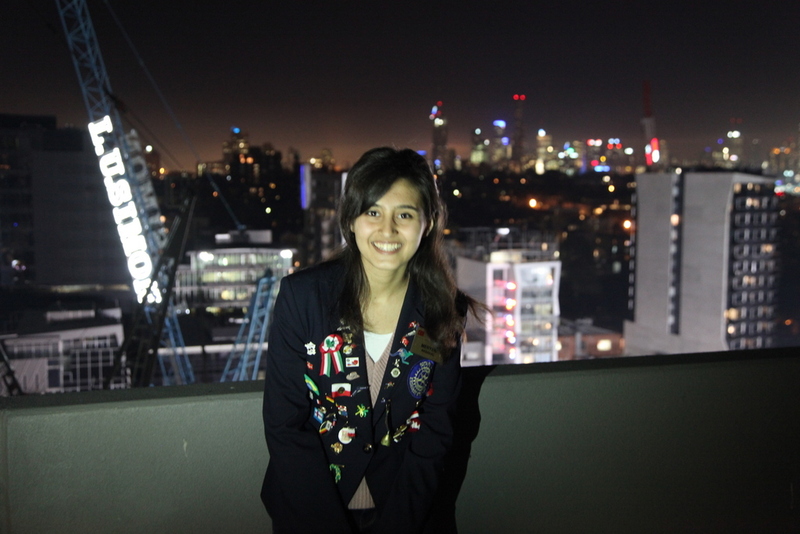 During her stay she stayed with three host families and attended Rosehill Secondary College in Essendon. 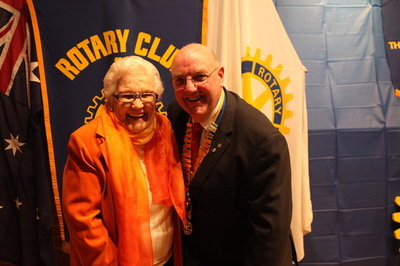 We will miss her smiling face at our Club Meetings. 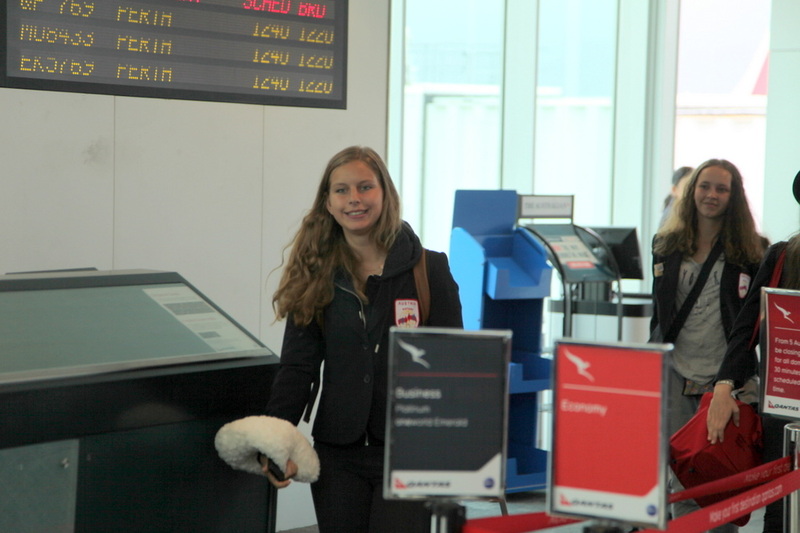 Au Revoir Alexandra. 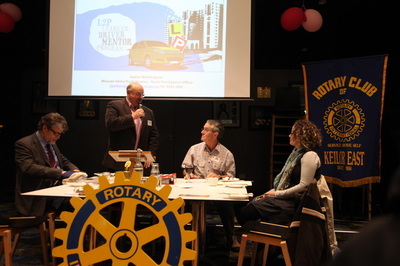 A new Rotary year has begun. 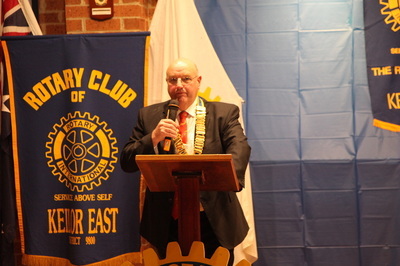 Our new Club President is Gerard Mahoney. 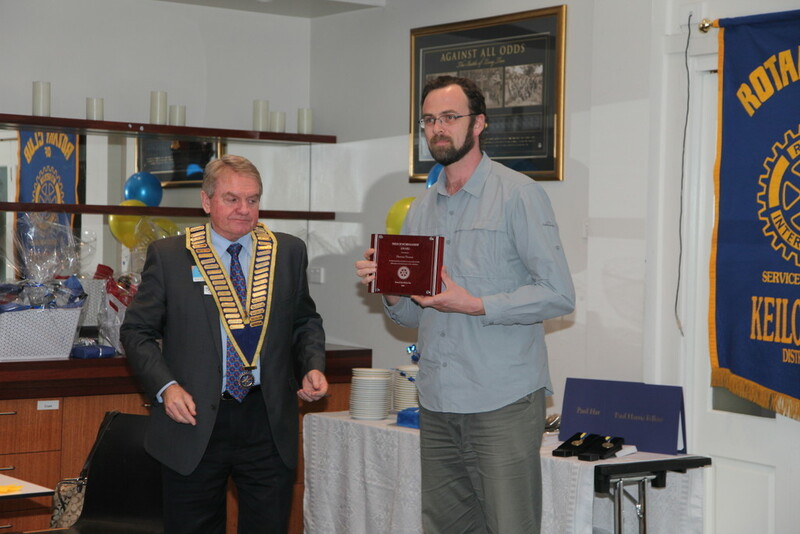 He was inducted on Monday 30th June 2014.The Changeover was held at the Clifton Park Bowling Club in Aberfeldie. 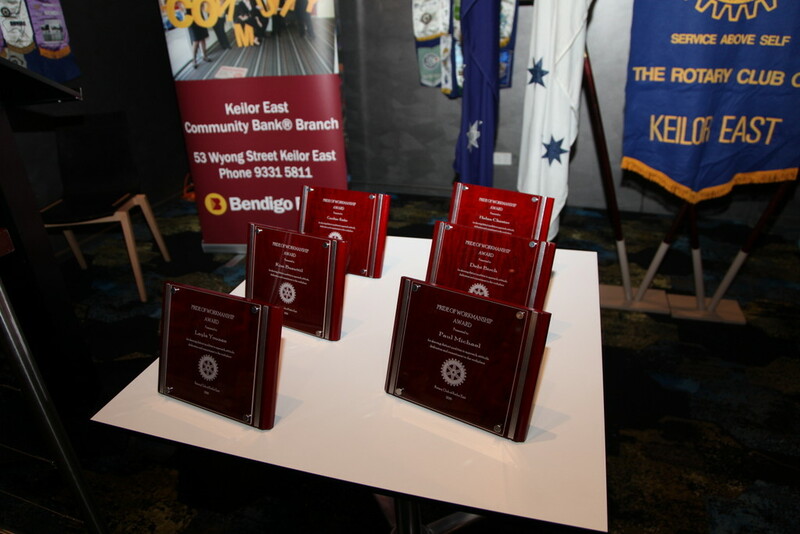 On Monday May 26th 2014 we held our annual Pride of Workmanship Awards. 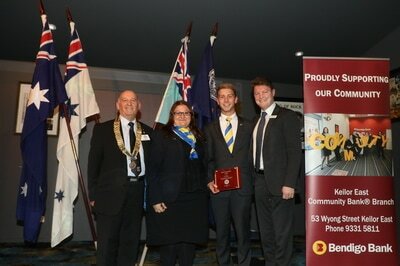 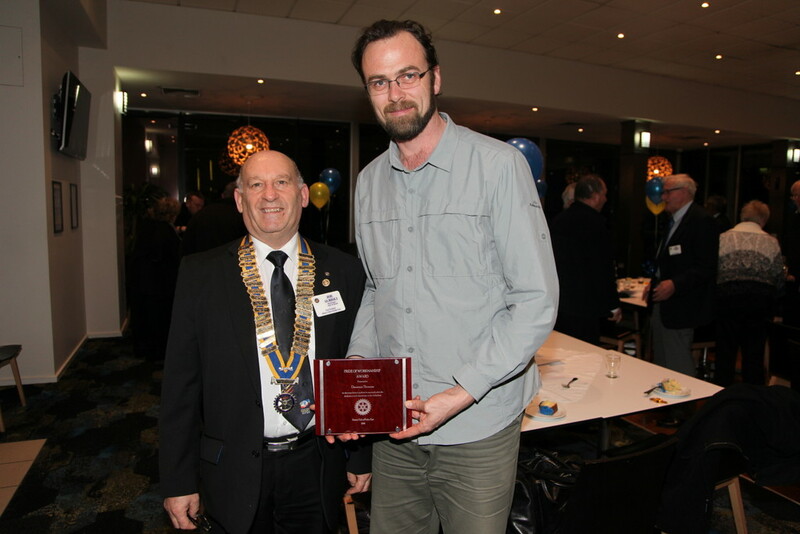 Keilor East Pharmacist Domenic Marchione ( centre top) who was nominated by Rotarian Ian Wright. Also nominated in this years awards were Danny Stavropolous and Billy Roubos of Milleara International Food and Deli of Keilor East. 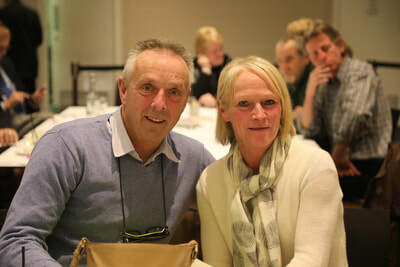 They were nominated by PP John Walsh for the high quality of service provided at their busy store but were unfortunately not able to be with us for the evening due to a Food Industry Conference interstate. They will be attending a Club Meeting at a later date to receive their trophies and certificates. 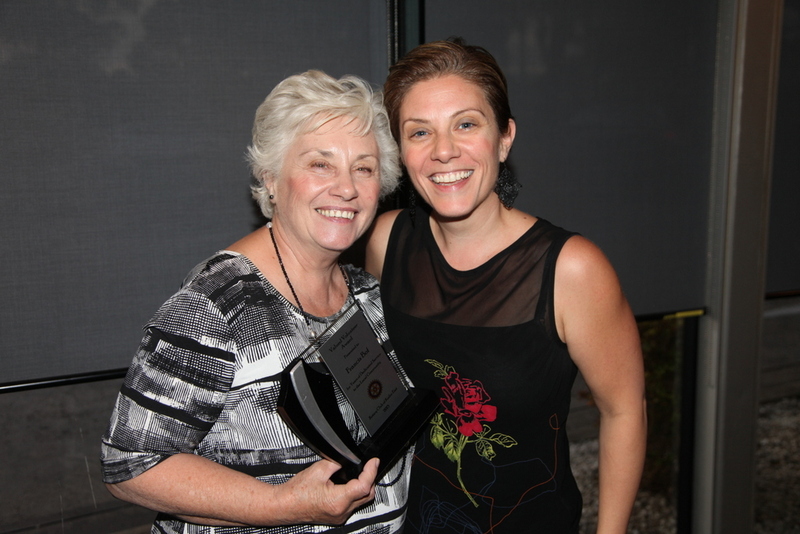 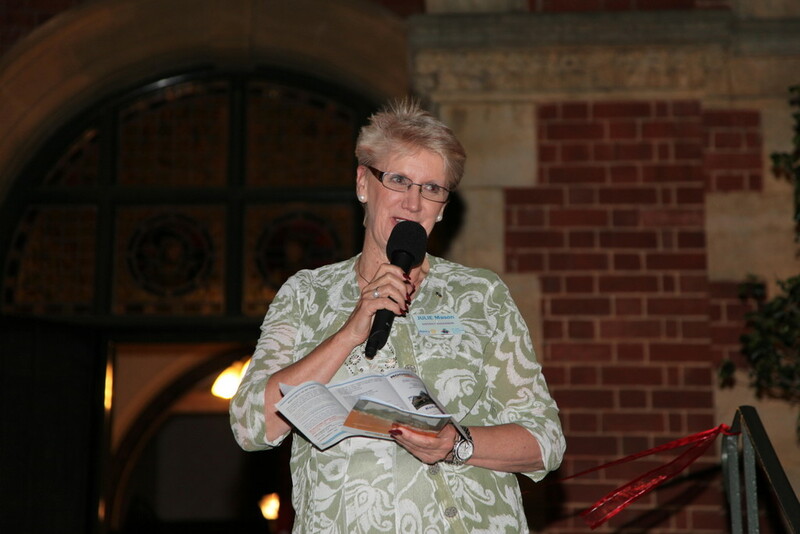 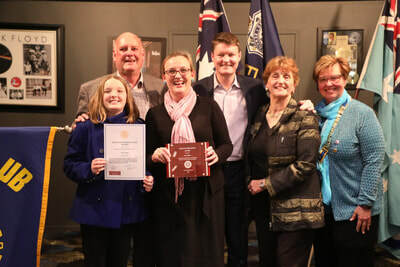 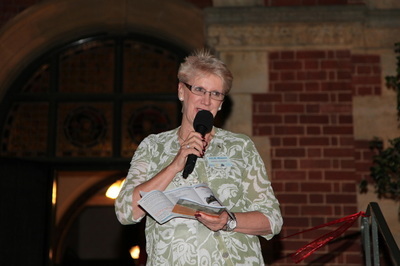 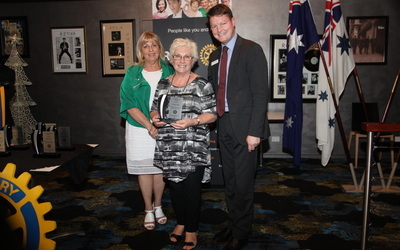 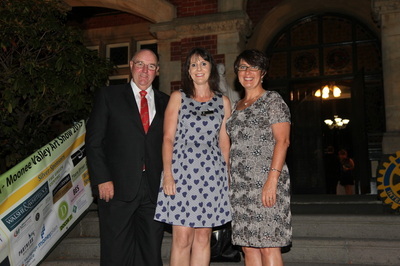 This year’s Awards were made by the Mayor of the City of Moonee Valley, Councillor Jan Chantry. We were also honoured by the presence and support of District Governor Elect Murray Verso who spoke of our Rotary founder, lawyer Paul Harris, and his idea of having an organization which initially focused on supporting member’s vocations. 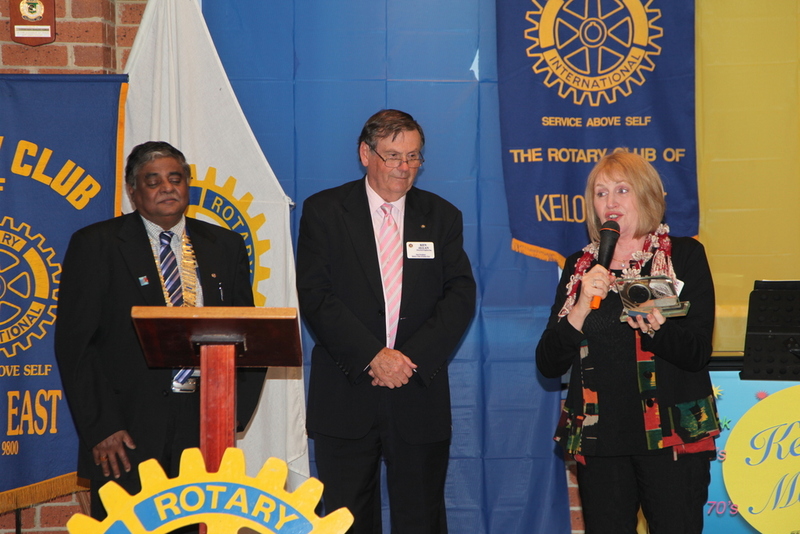 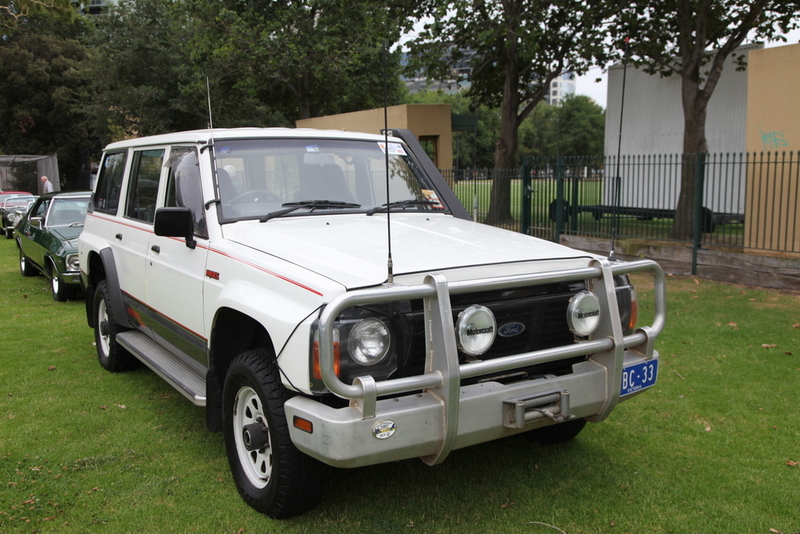 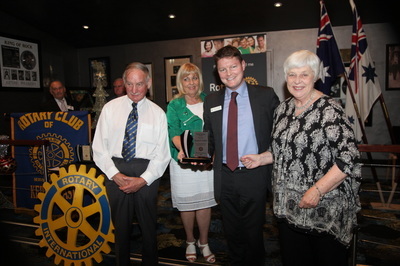 The Awards were introduced to Australia by the Rotary Club of Pennant Hills in New South Wales in 1975. The award programme seeks to promote the theme by honouring those people, irrespective of age, gender or vocation, who show a distinct quality in their approach, attitude and dedication to their vocation. We've welcomed lots of visitors and great guest speakers. 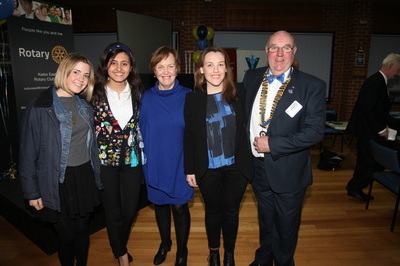 International Post Graduate students from Victoria University, AG Austen Burleigh, Police Inspector Ryan Irwin and Brimbank Central President Bert Mom were welcomed at our Meetings. 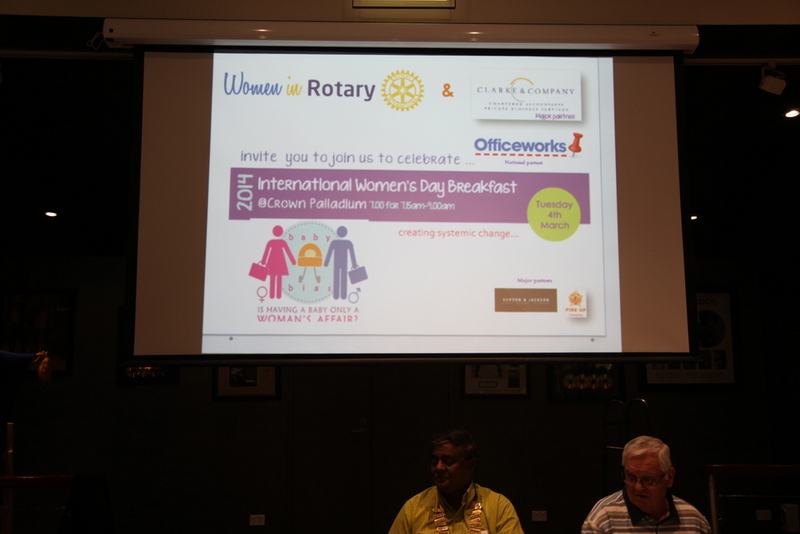 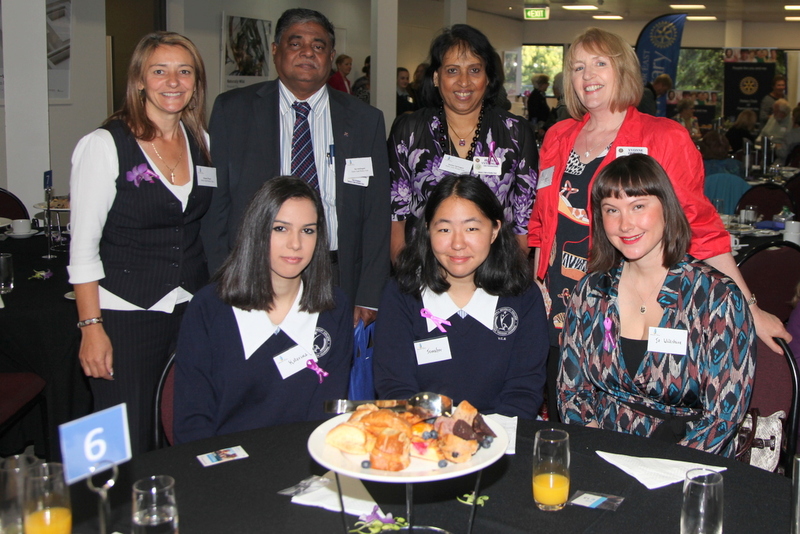 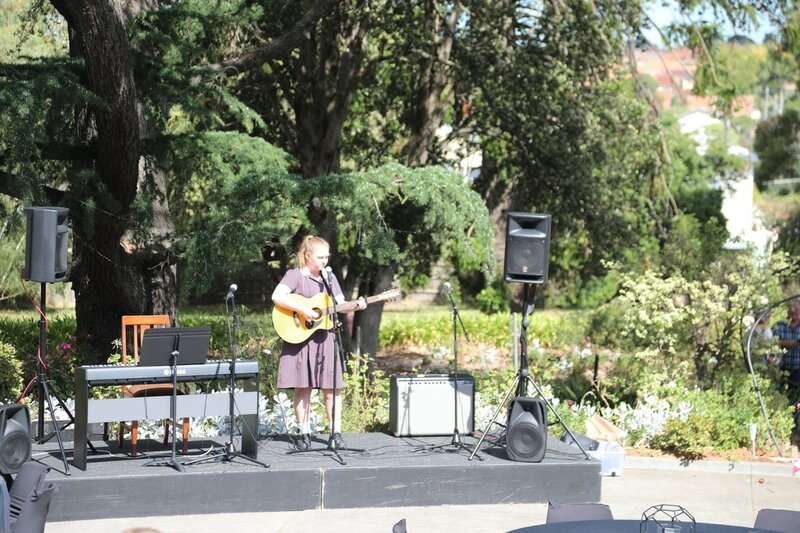 On Thursday March 6th we were represented at the Moonee Valley City Council's International Women's Day Breakfast. 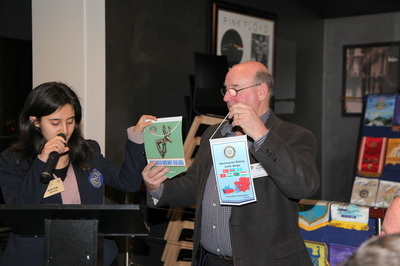 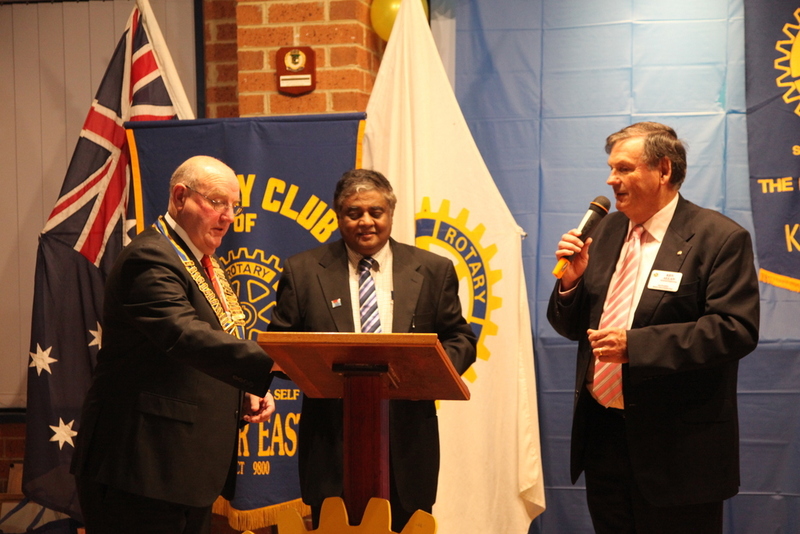 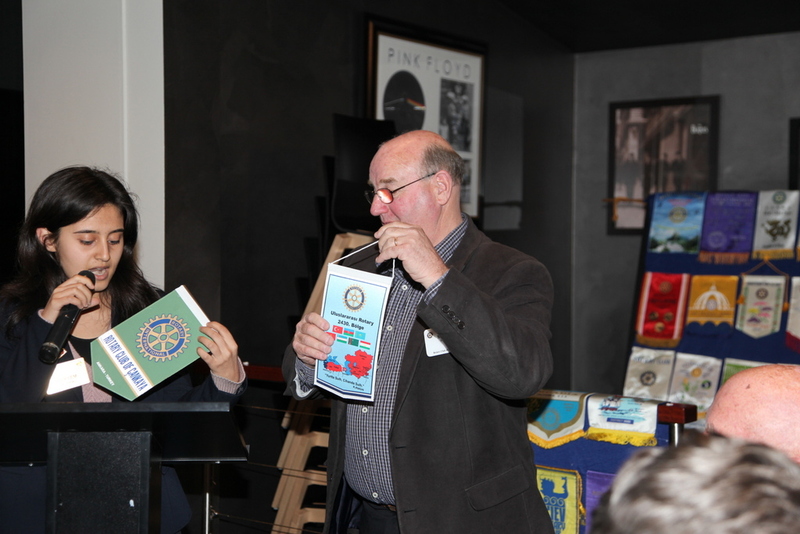 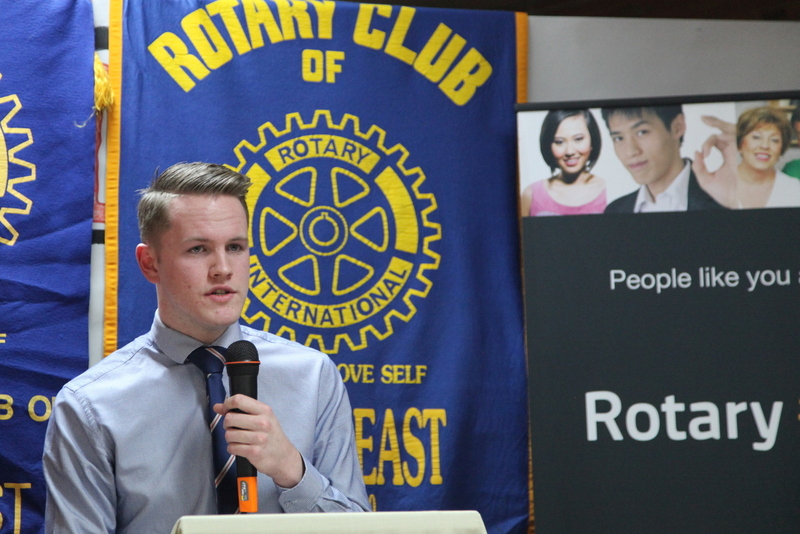 At our February 10th Meeting our Guest Speaker was the President of the Rotary Club of Phnom Penh, Peter Gray. 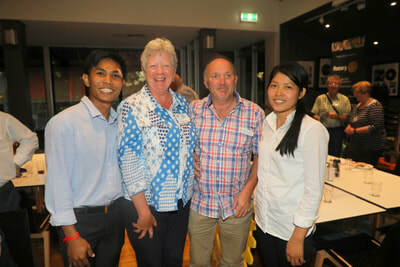 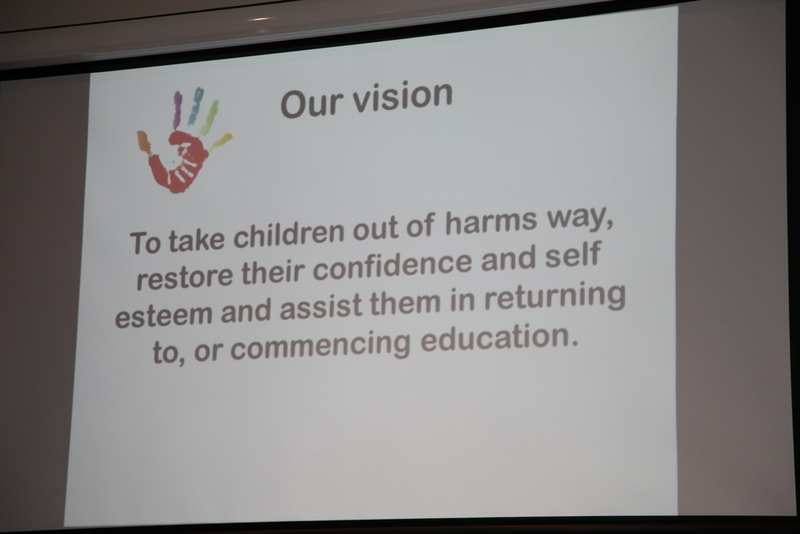 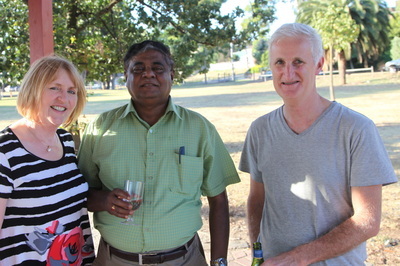 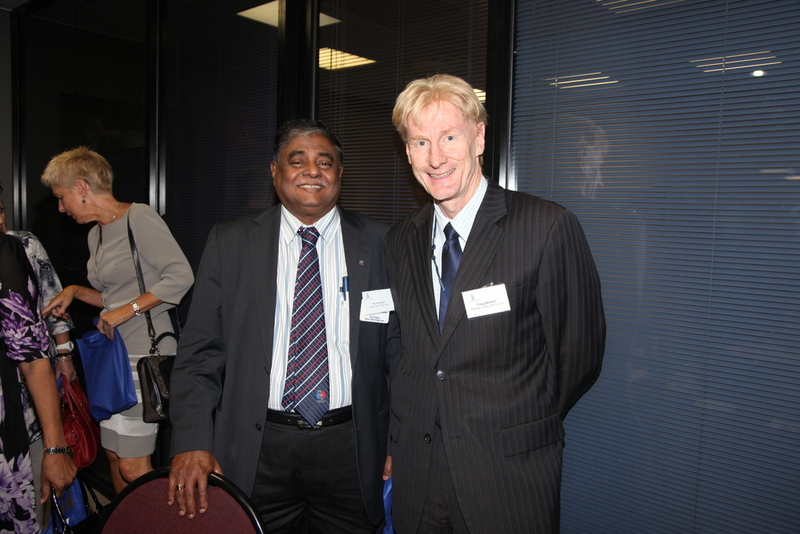 He told us of his work as President of the ACCT Australian Cambodia Children's Taskforce. 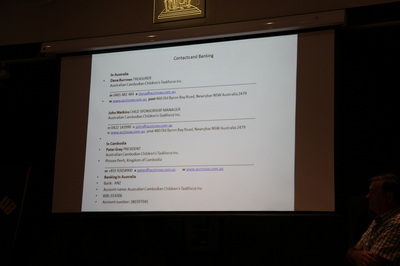 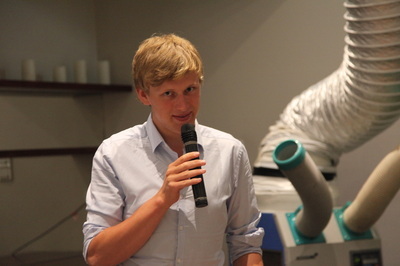 Peter's entire presentation may be accessed below the photo gallery. 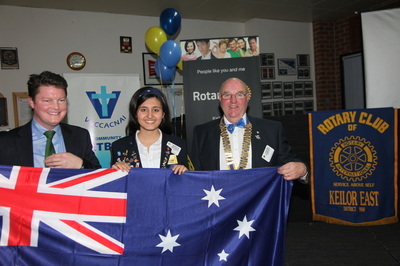 At our February 3rd Meeting we congratulated our Lawn Bowls teams, we met Rebecca Gouvea, a Rotary Youth Exchange student from Brazil and heard from three Guest speakers regarding the Women in Rotary's International Women's Day Breakfast at Crown Palladium onTuesday 4th March and the Oxfam 100km Trailwalk in May. On Wednesday 29th January we took part in the District 9800 Gateway Cluster Lawn Bowls Challenge as defending champions and we WON again. 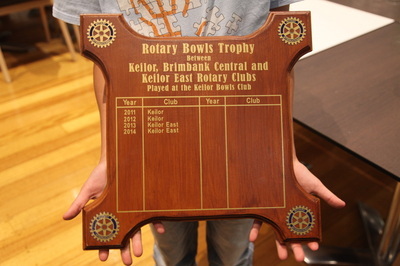 We are the Champions. 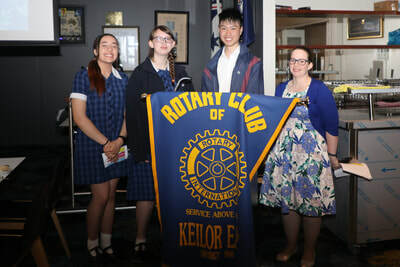 Congratulations to our talented winners, the runners up from Keilor Rotary Club and to all who participated making it a great event. What's been happening at our Club lately? 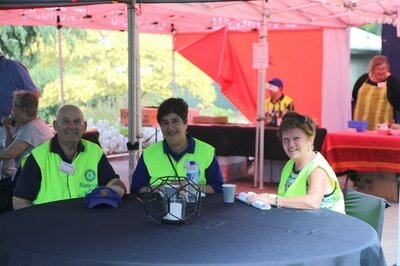 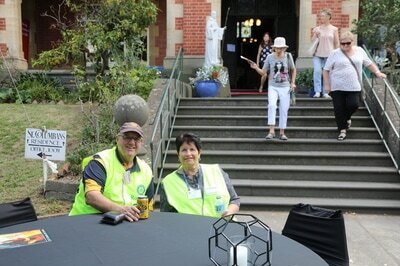 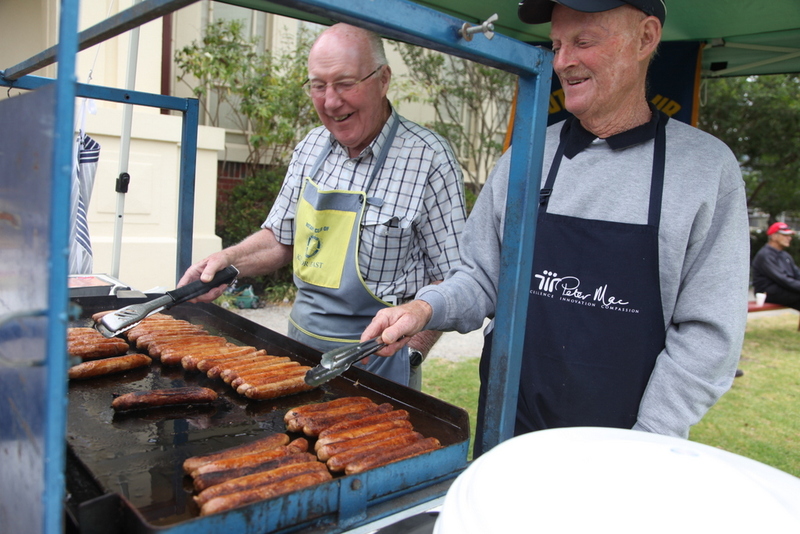 We cooked the BBQ Breakfast for the Peter Mac RACV Great Australian Rally on Sunday 19th January at the Victorian School for the Deaf. 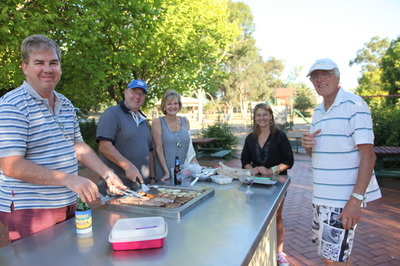 A BBQ beside the Maribyrnong.